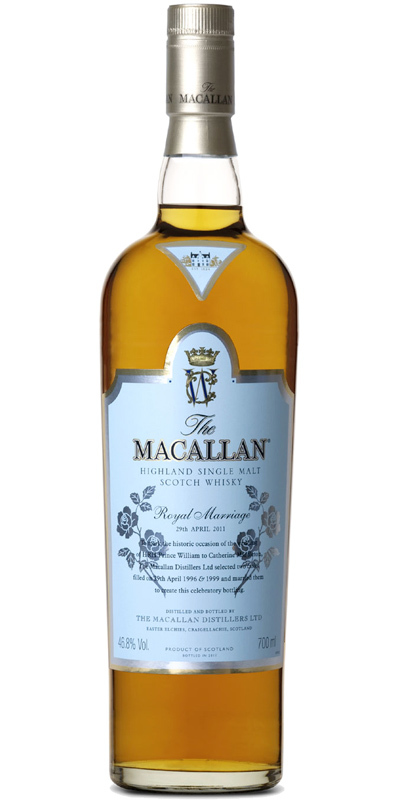 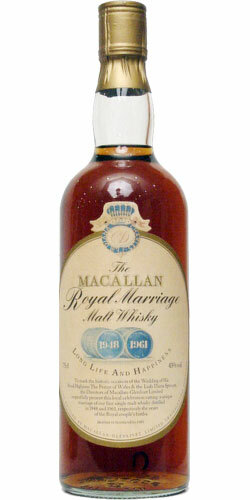 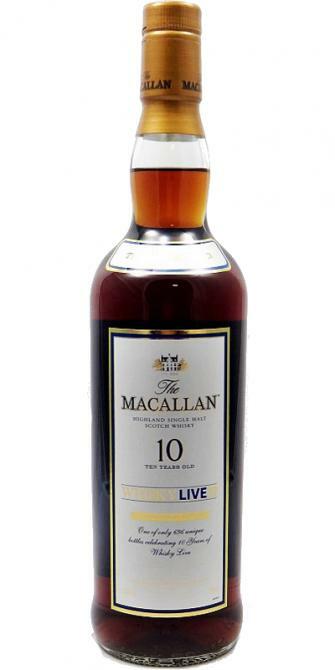 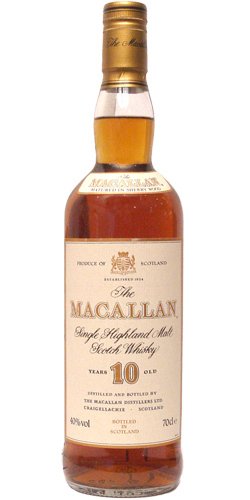 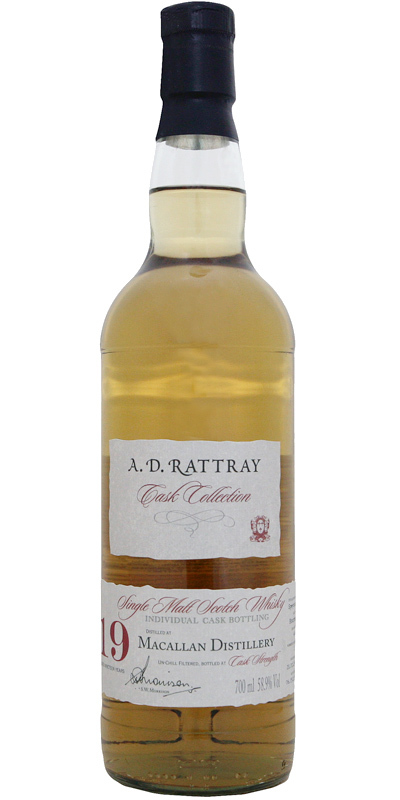 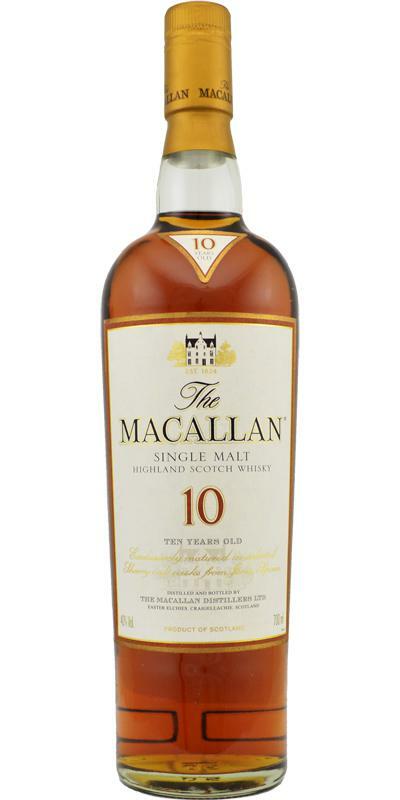 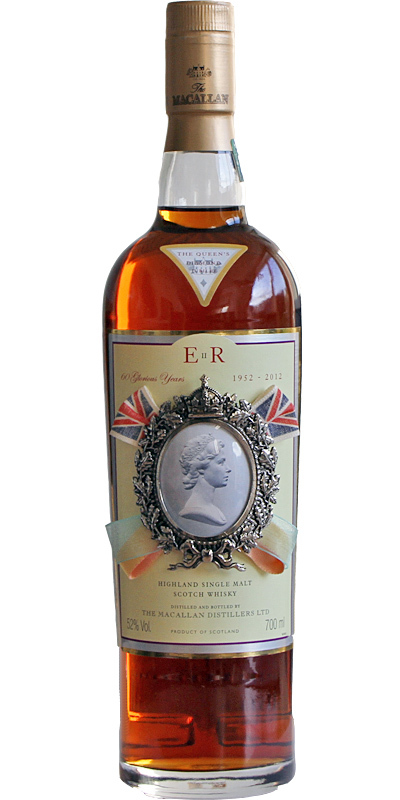 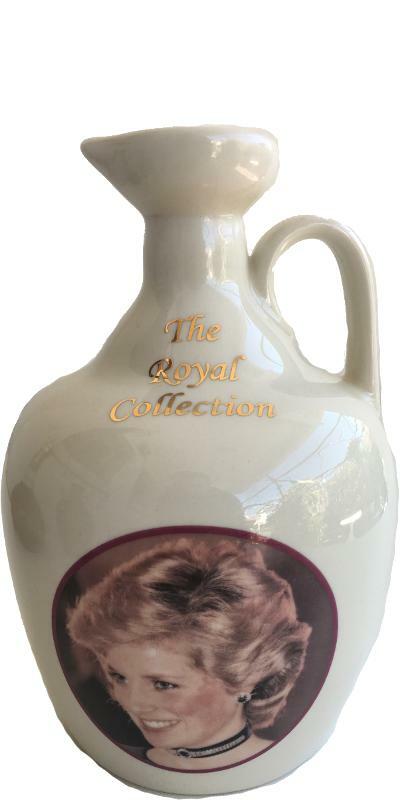 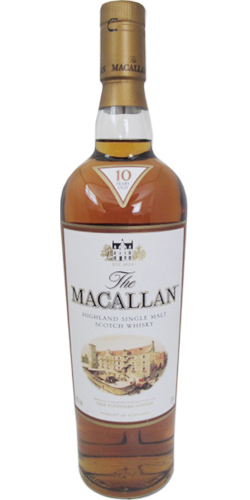 Macallan 10-year-old The Royal Collection 10 40.0 % Vol. 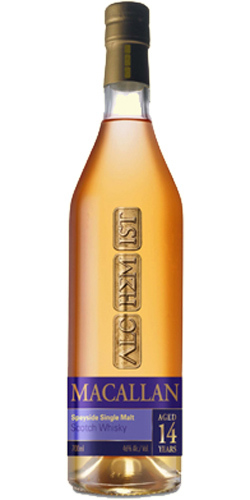 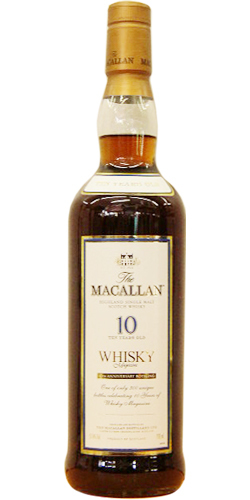 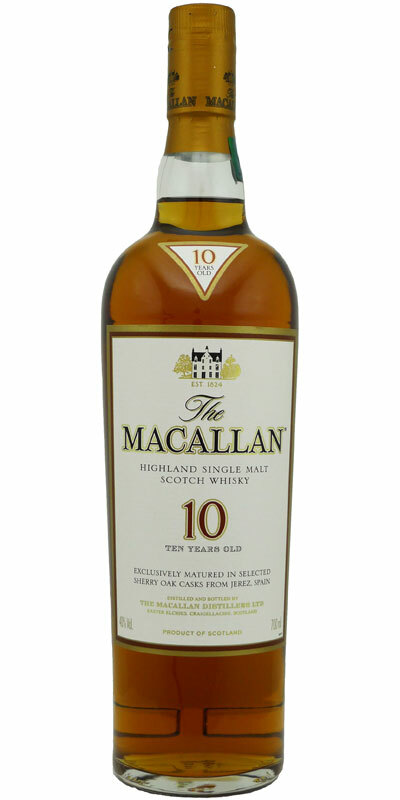 Macallan 10-year-old 100 Proof 10 57.0 % Vol. 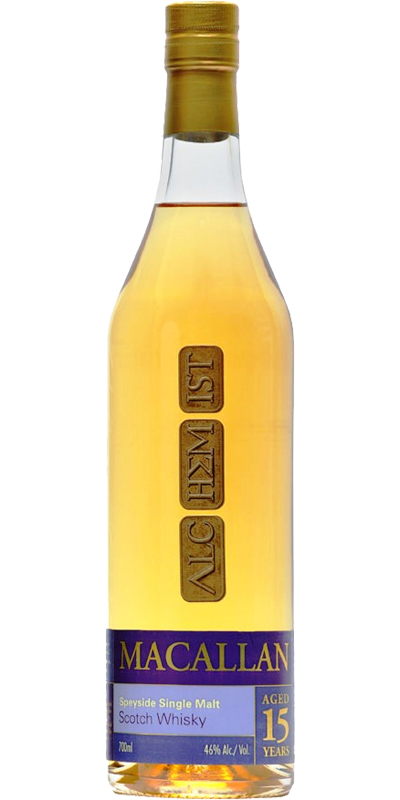 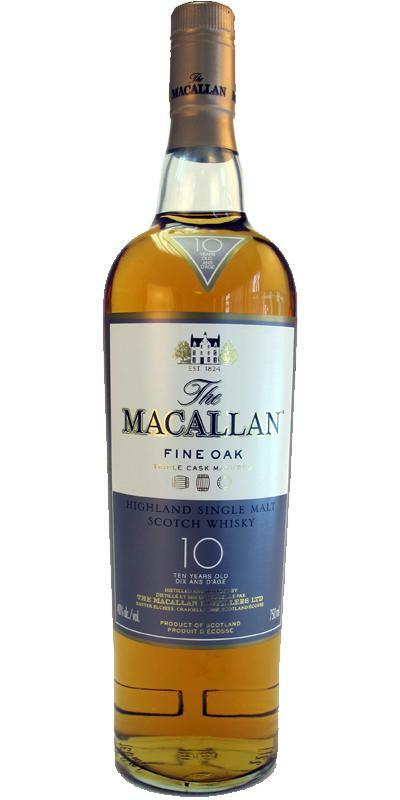 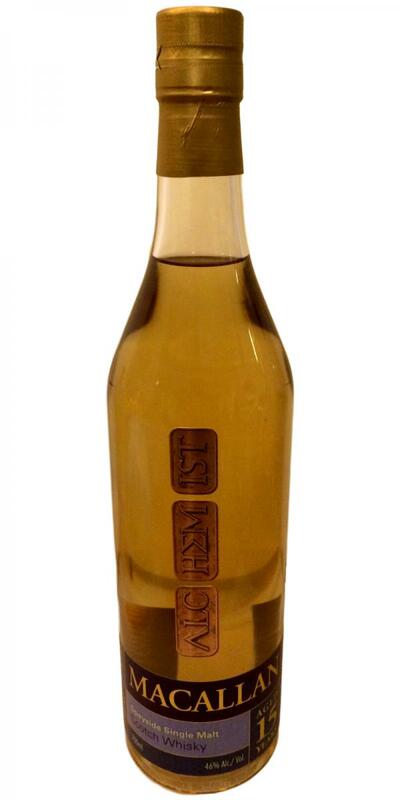 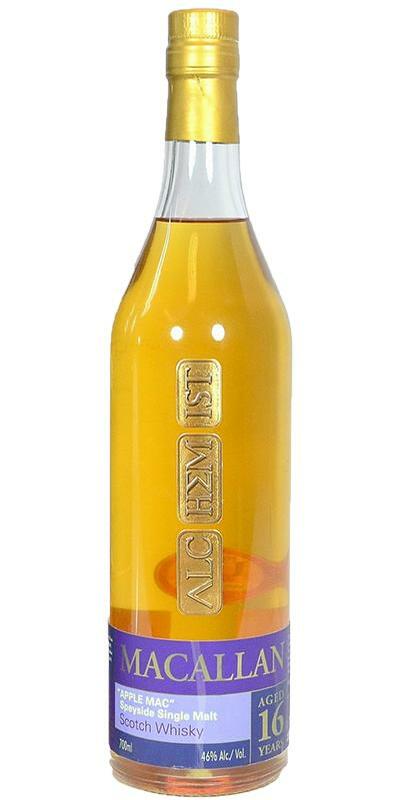 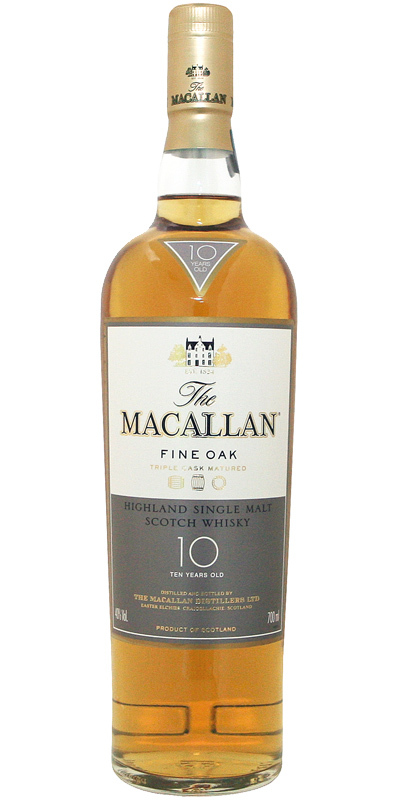 Macallan 10-year-old Single Highland Malt 10 40.0 % Vol. 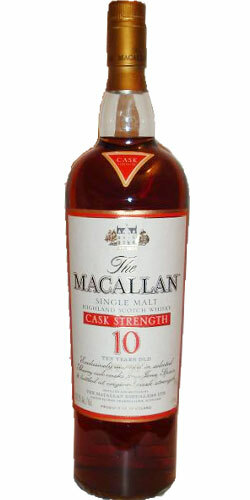 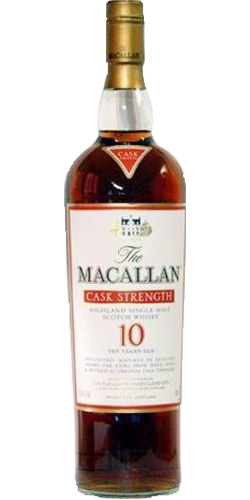 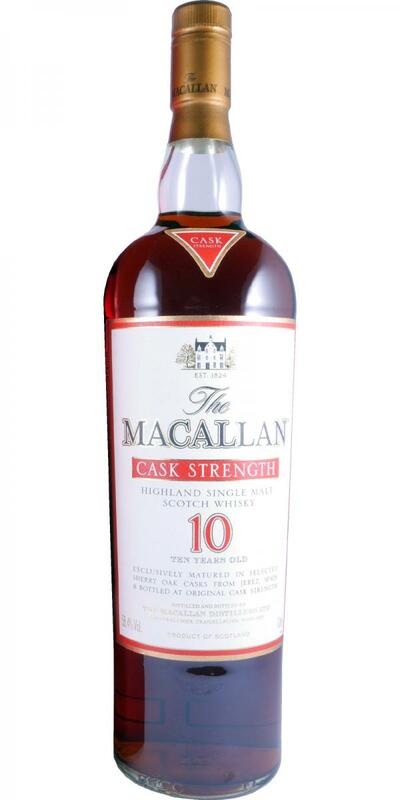 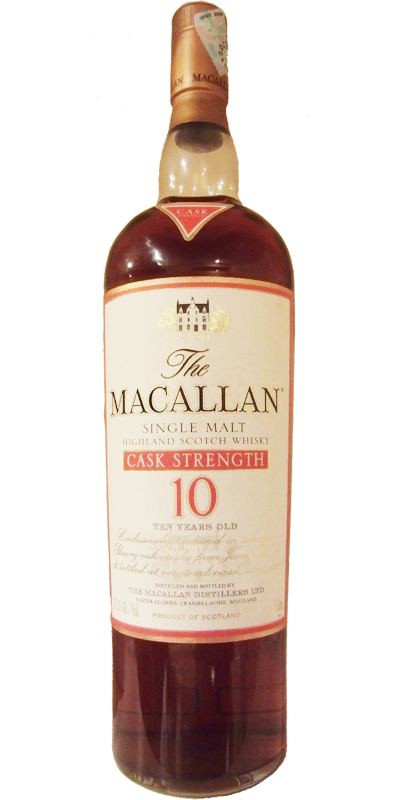 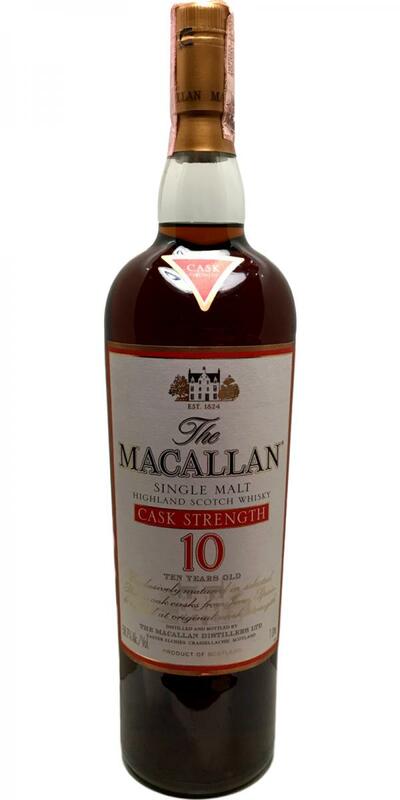 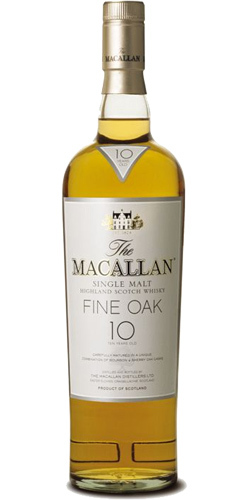 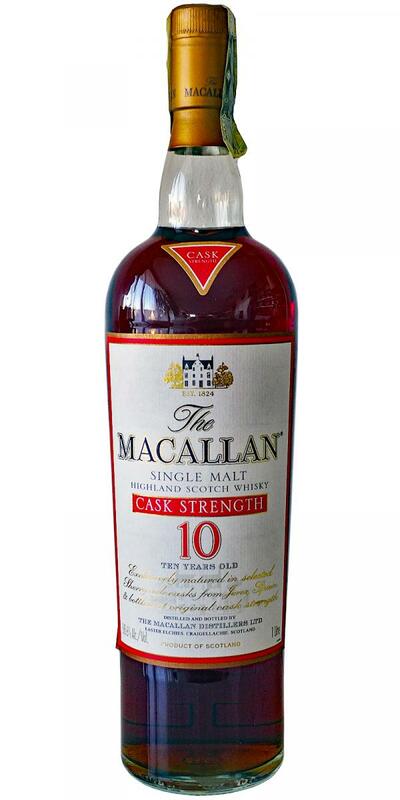 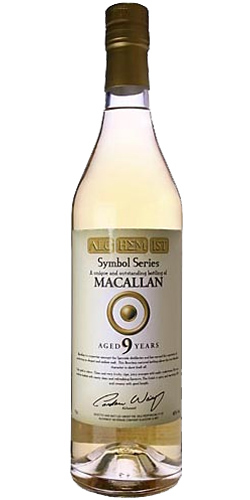 Macallan 10-year-old Cask Strength 10 58.6 % Vol. 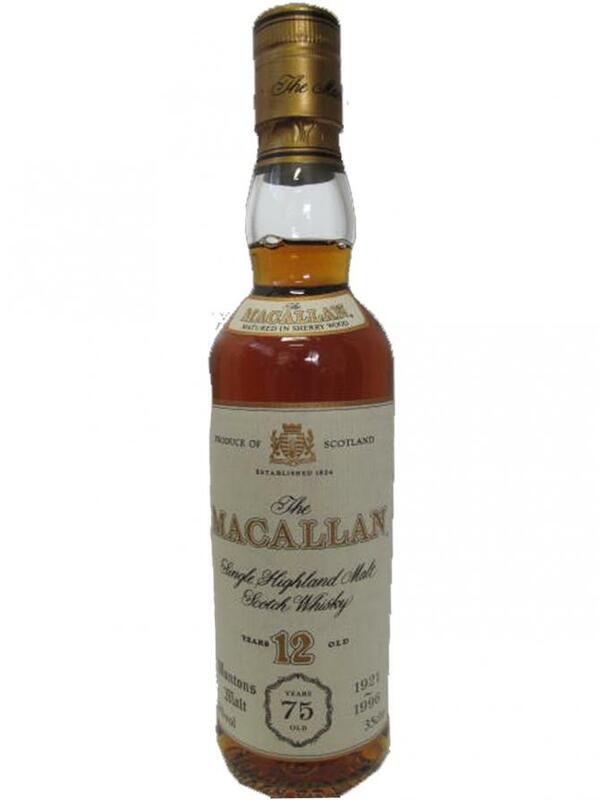 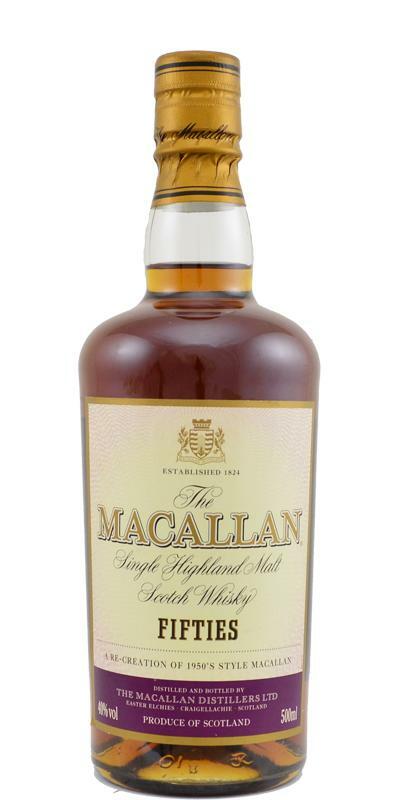 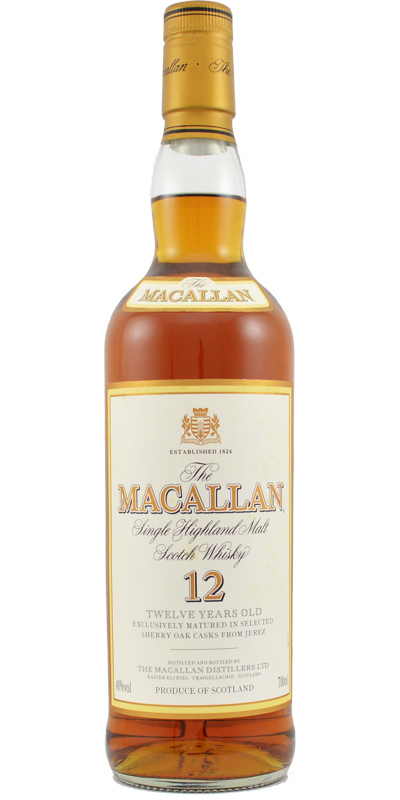 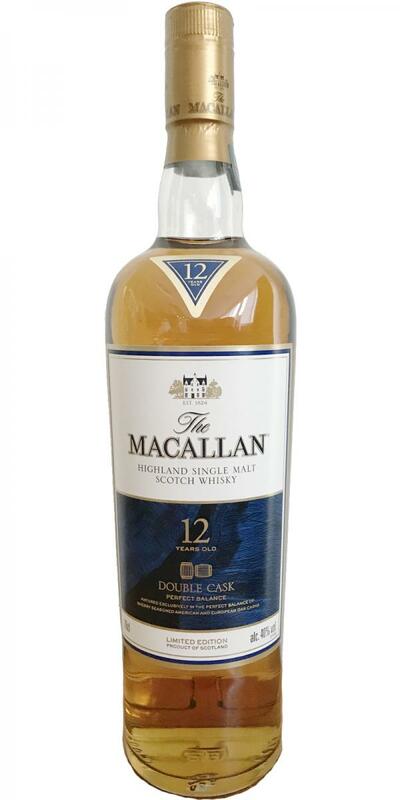 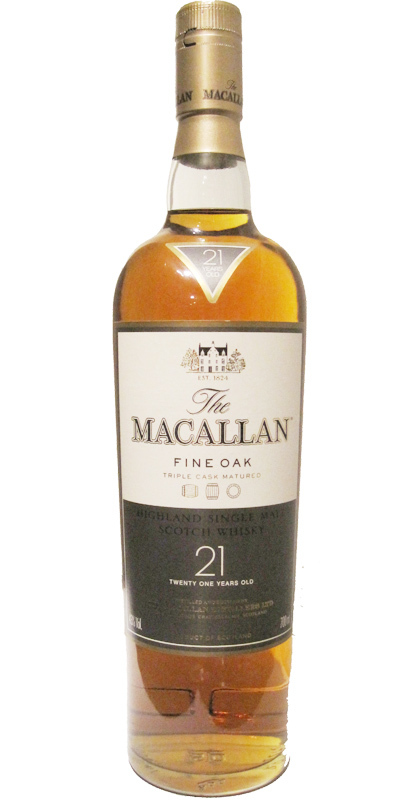 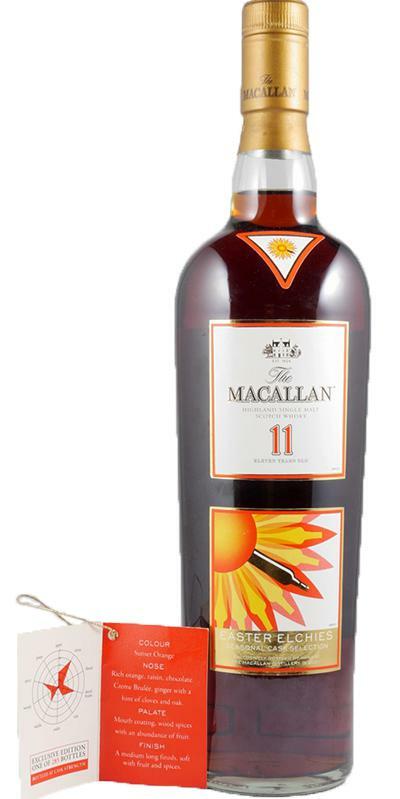 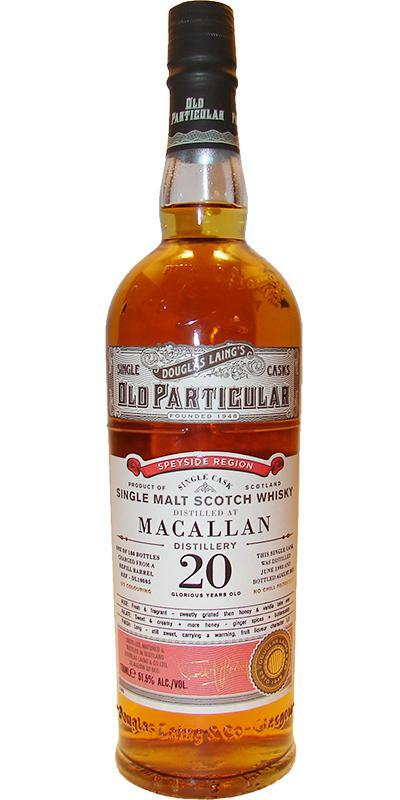 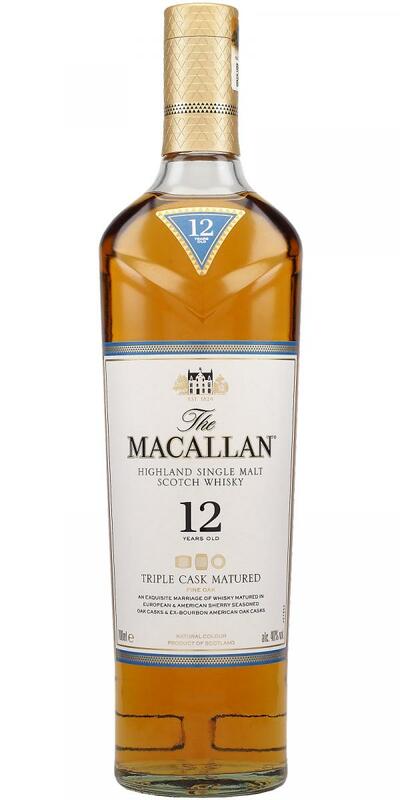 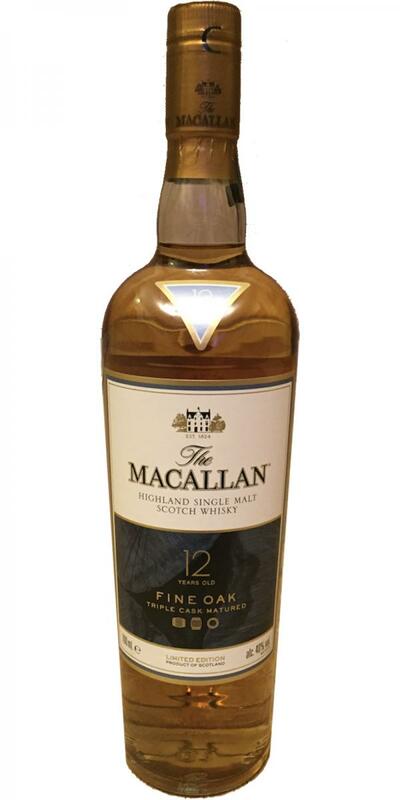 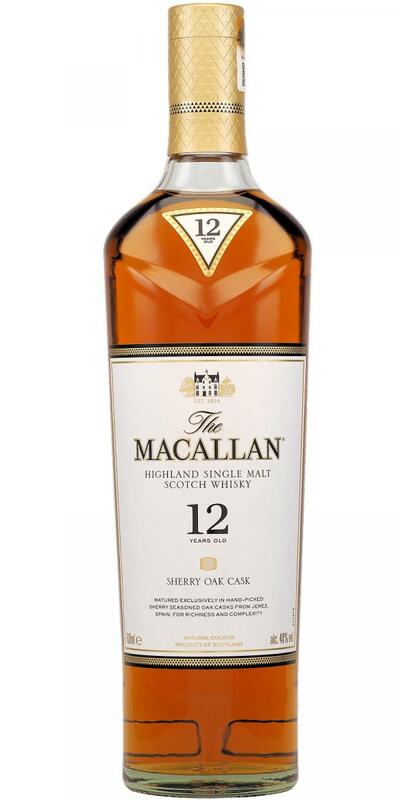 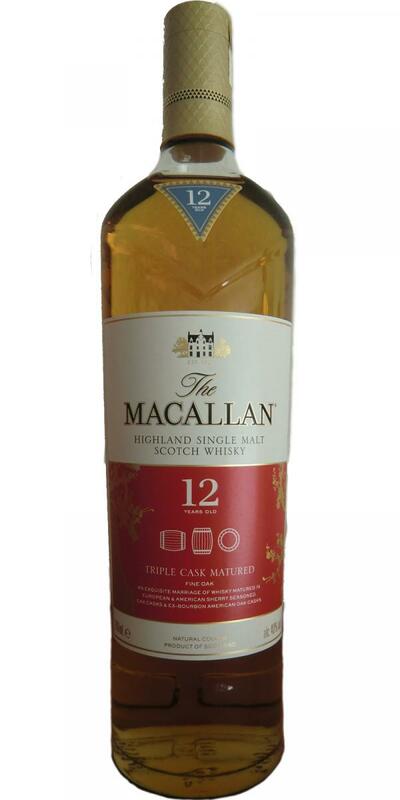 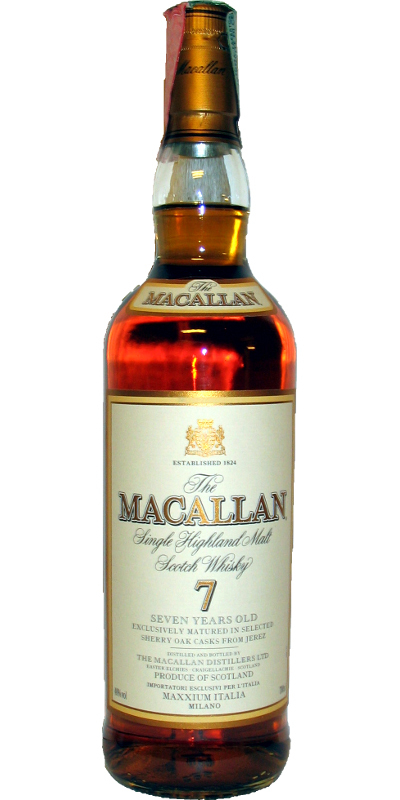 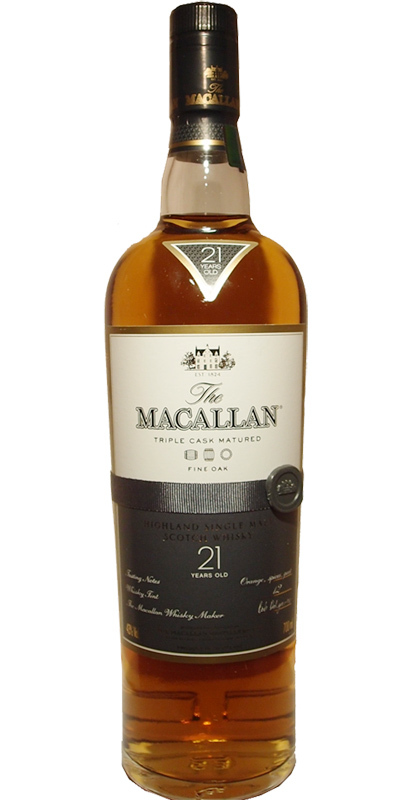 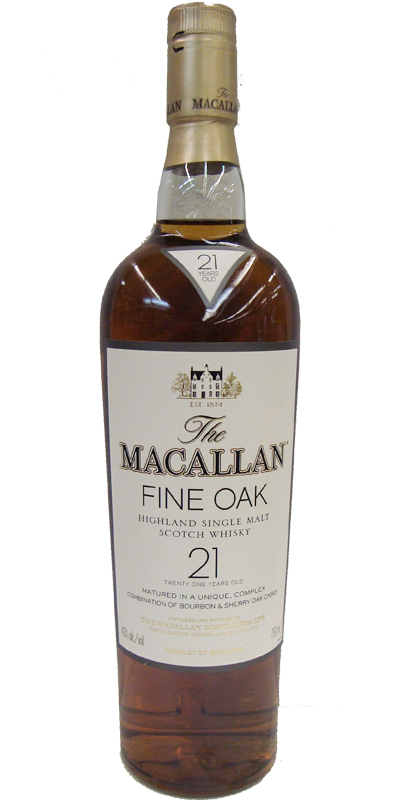 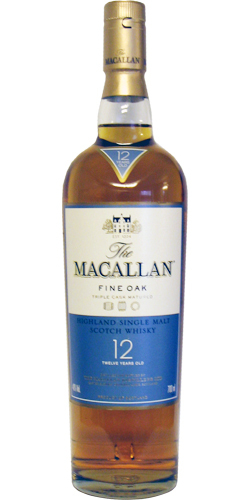 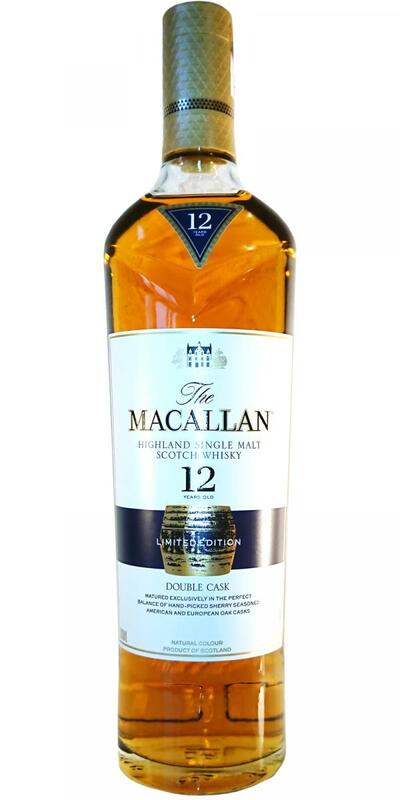 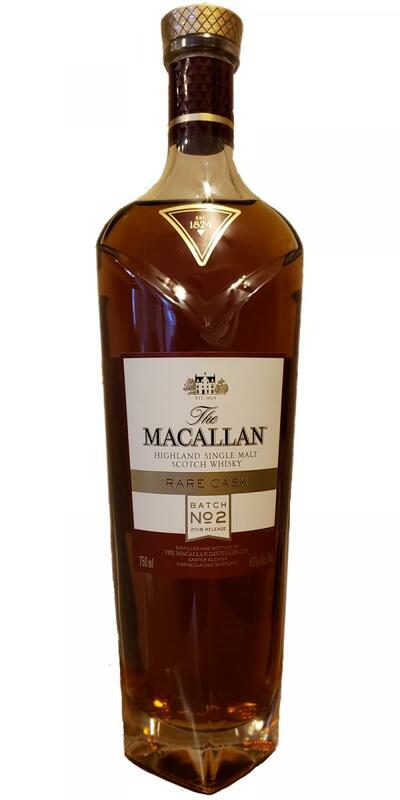 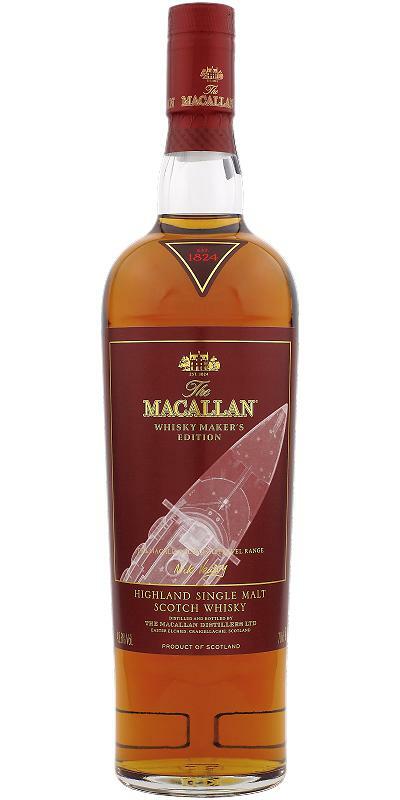 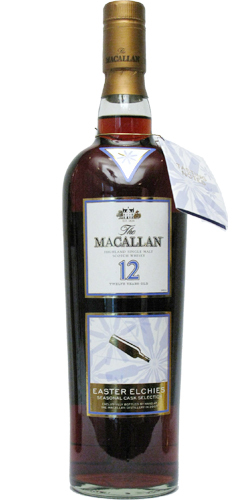 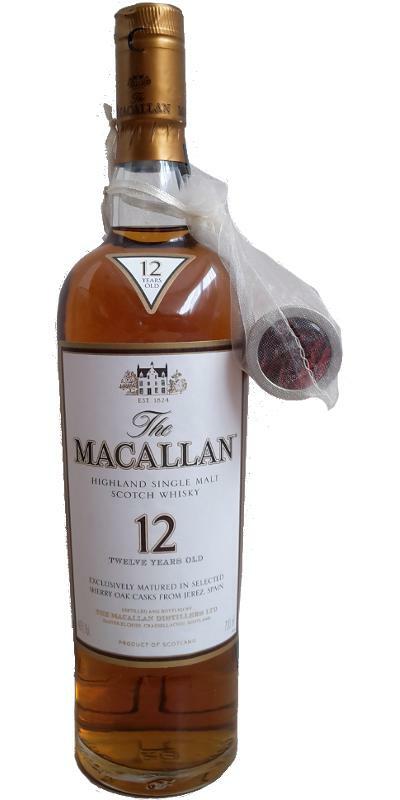 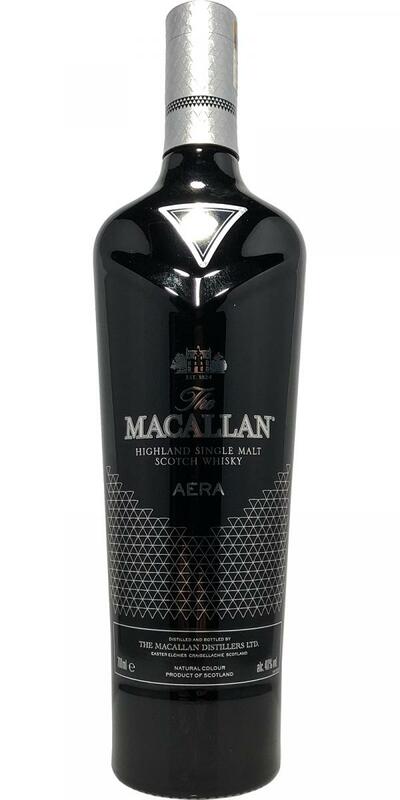 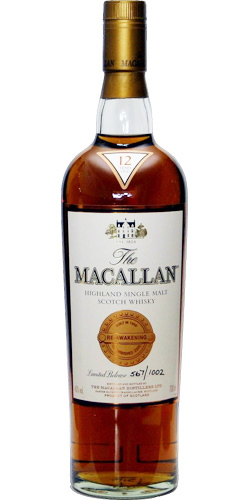 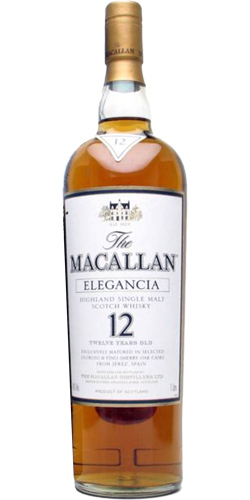 Macallan 12-year-old British Aerospace ATP Advanced turbo 12 43.0 % Vol. 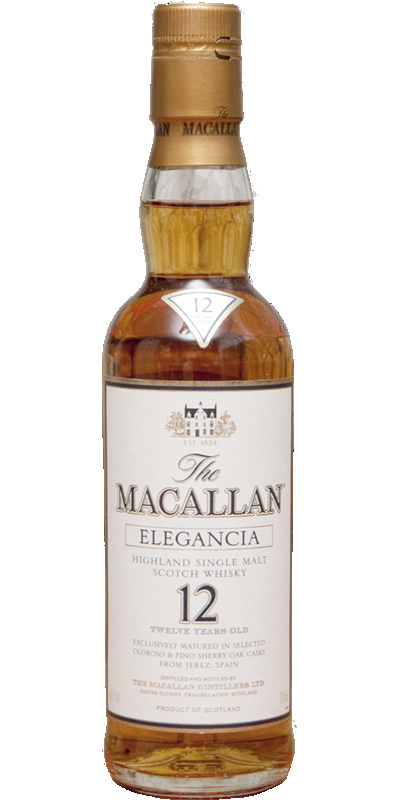 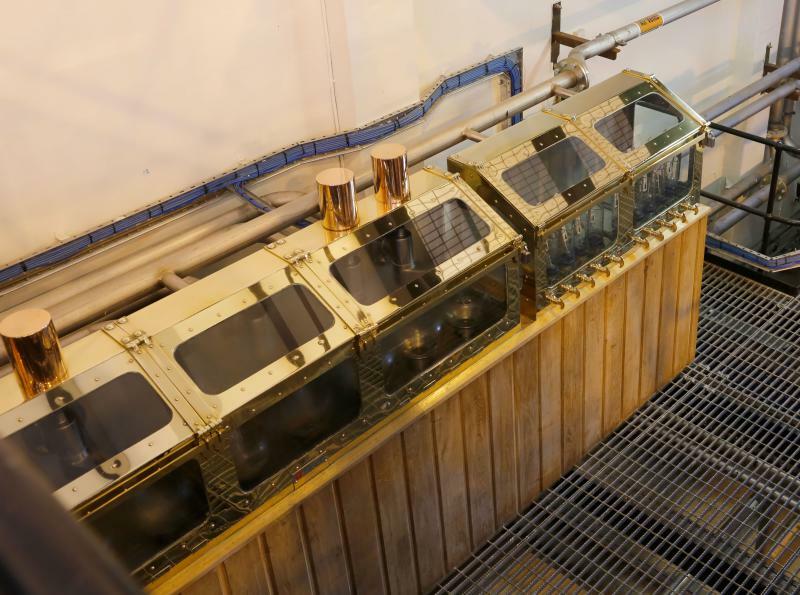 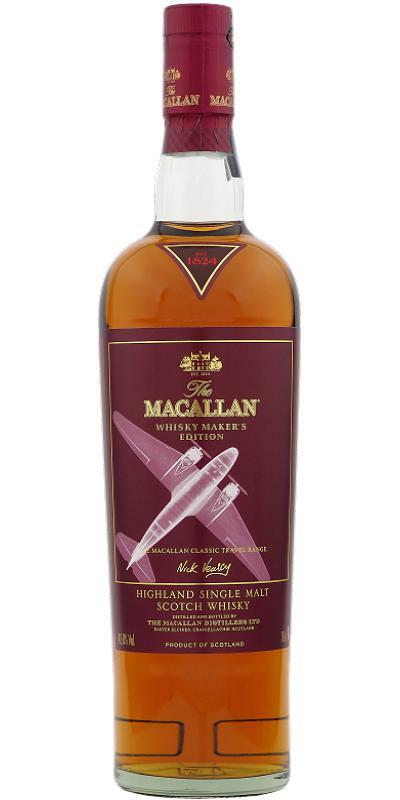 Macallan 12-year-old British Aerospace Bae Jetstream 12 43.0 % Vol. 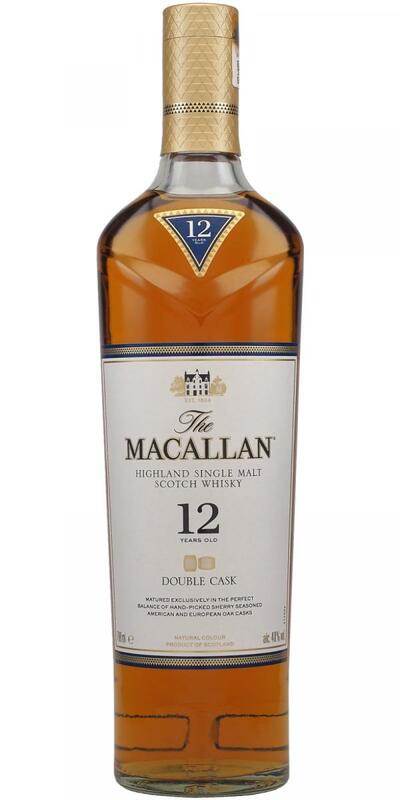 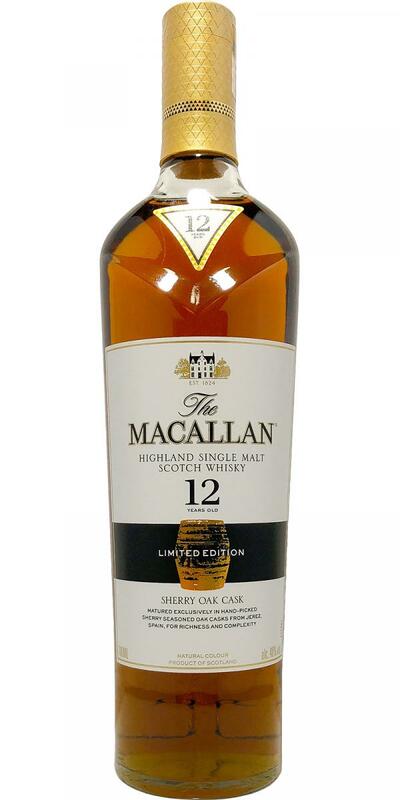 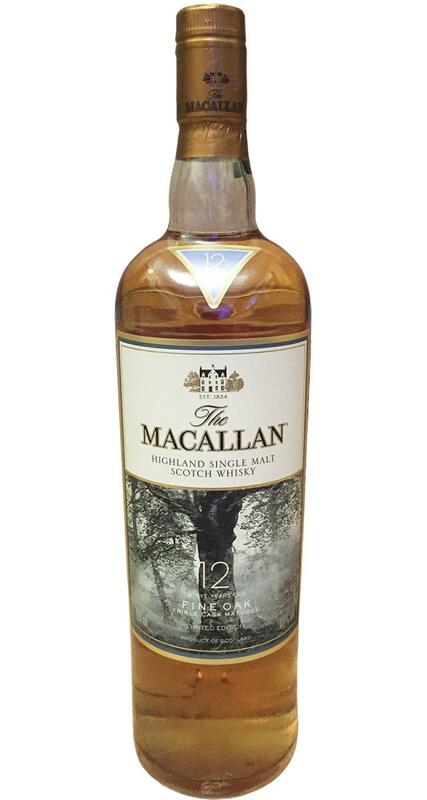 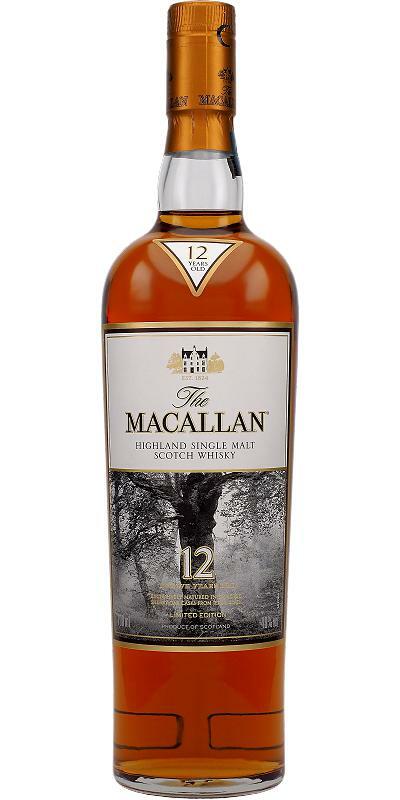 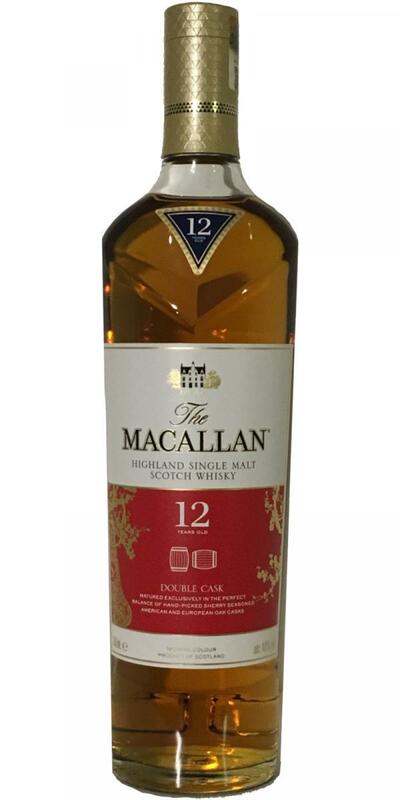 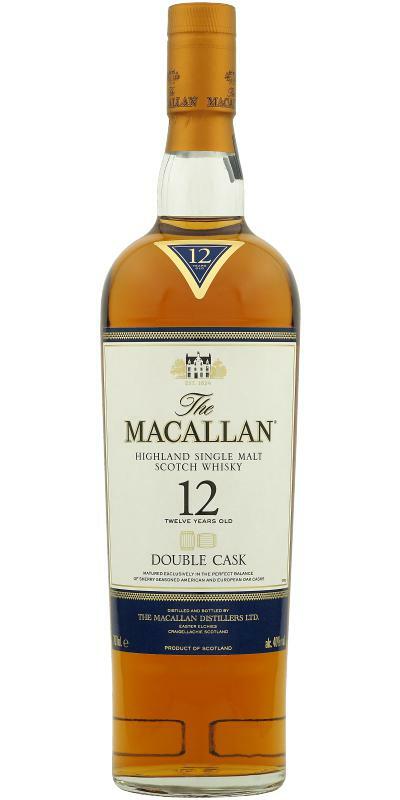 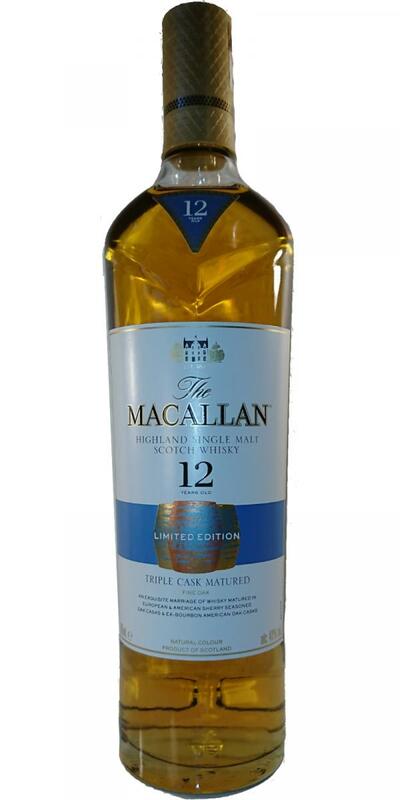 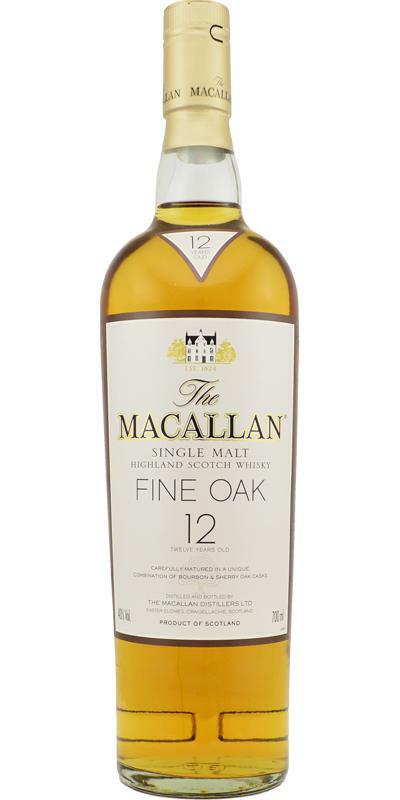 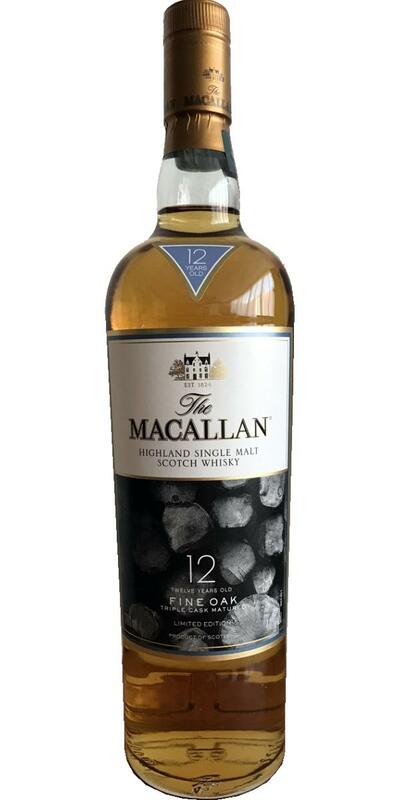 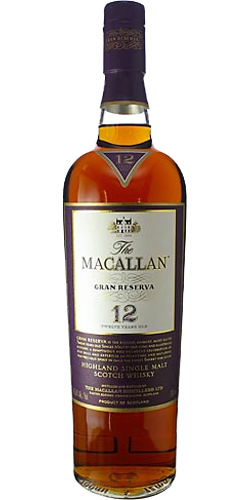 Macallan 12-year-old - Gift Set Sherry Oak 12 40.0 % Vol. 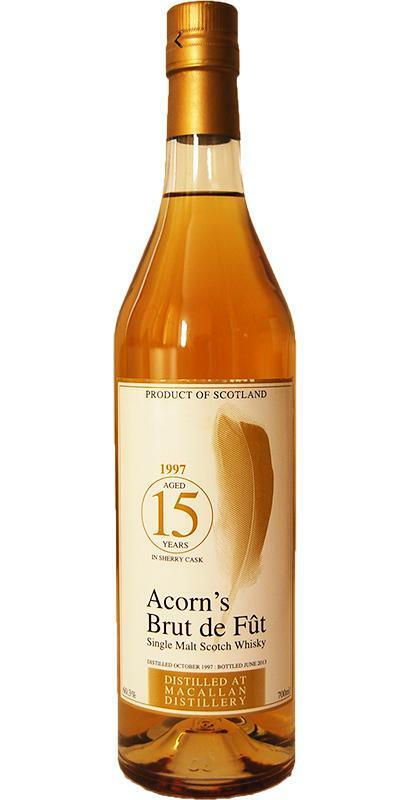 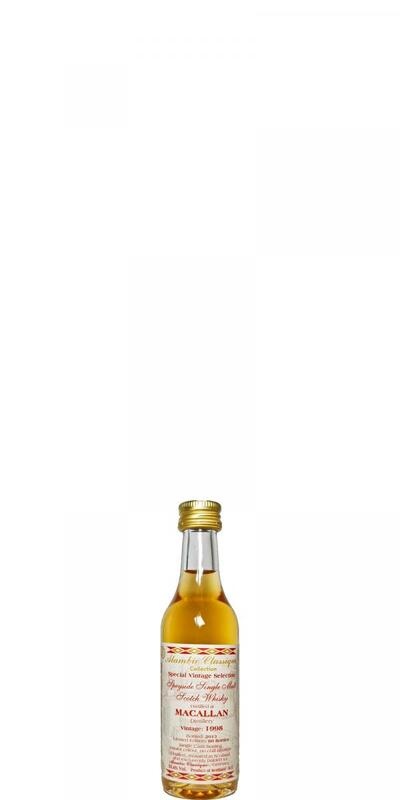 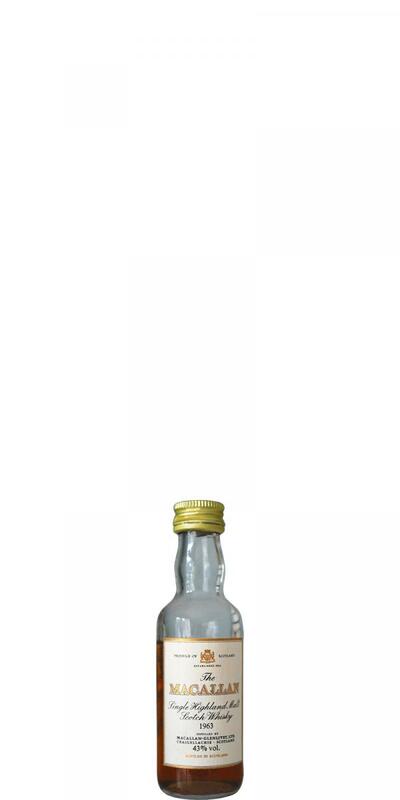 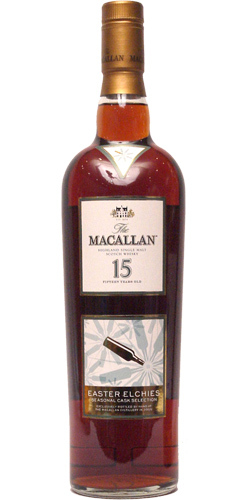 Macallan 15-year-old Miniature 15 43.0 % Vol. 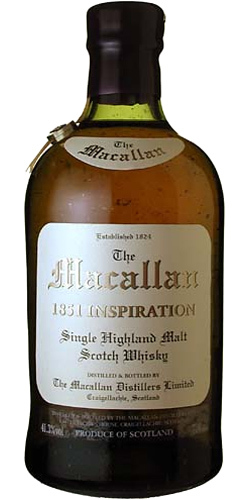 Macallan 16-year-old 16 43.0 % Vol. 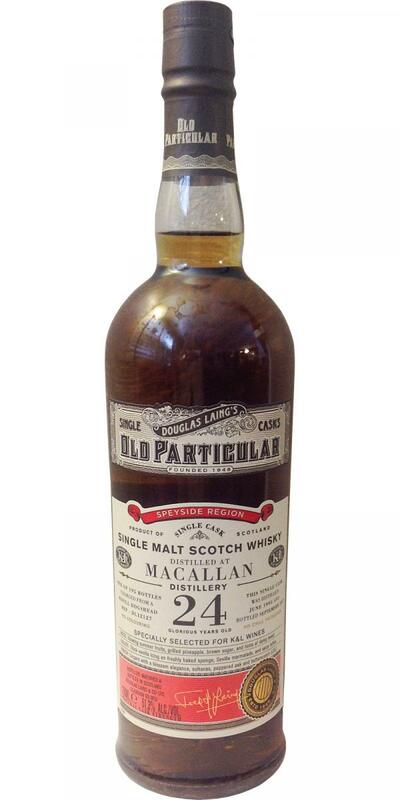 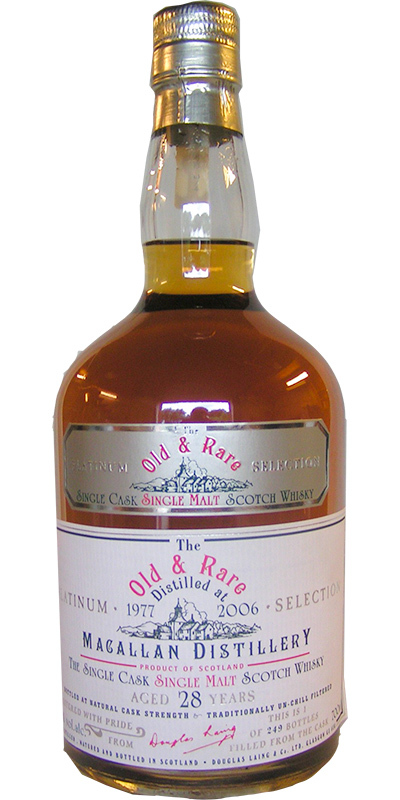 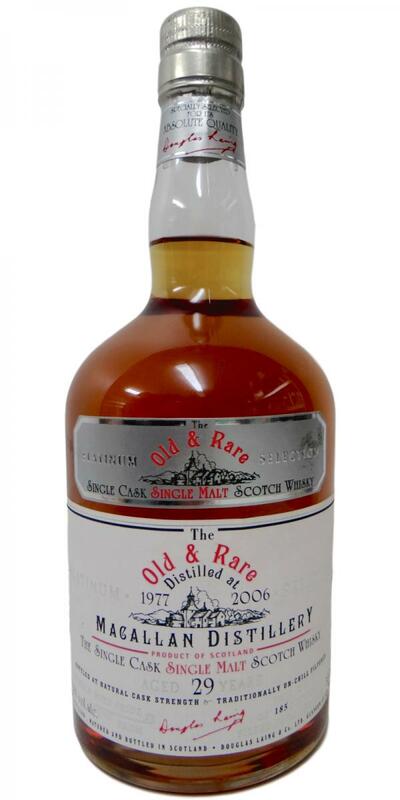 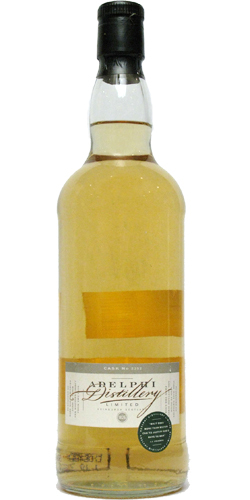 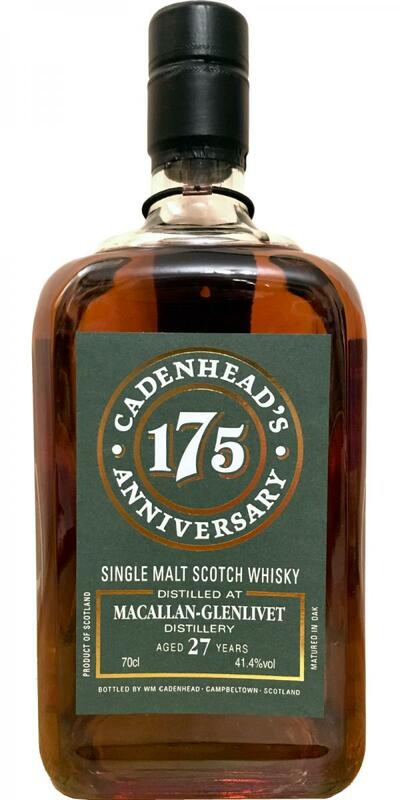 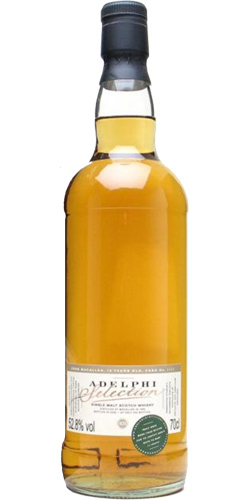 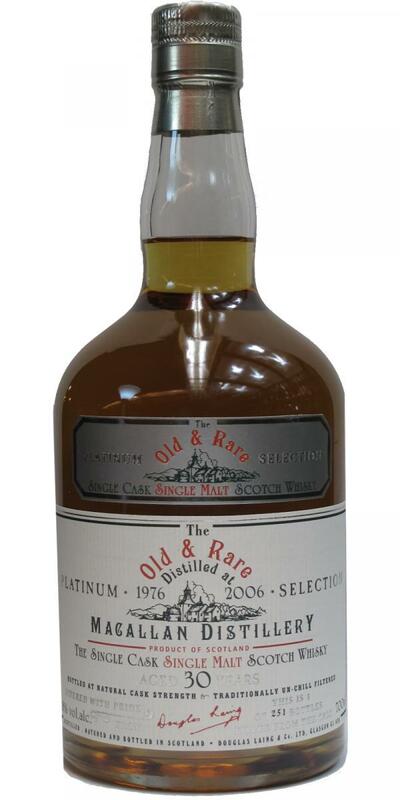 Macallan 17-year-old Pure Highland Malt 17 43.0 % Vol. 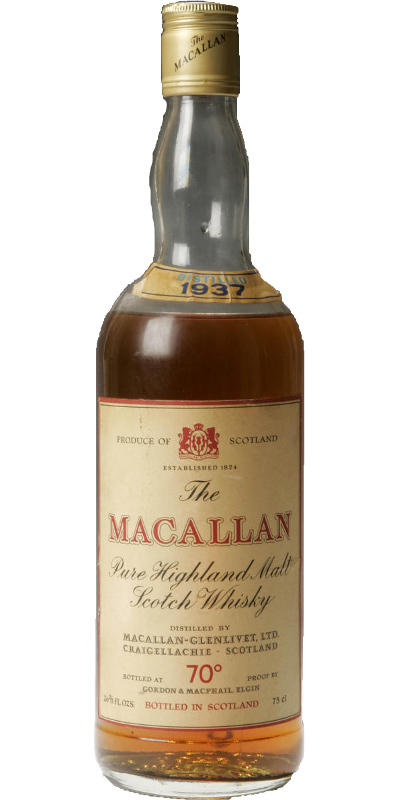 Macallan 1948 Fine & Rare 55.9 % Vol. 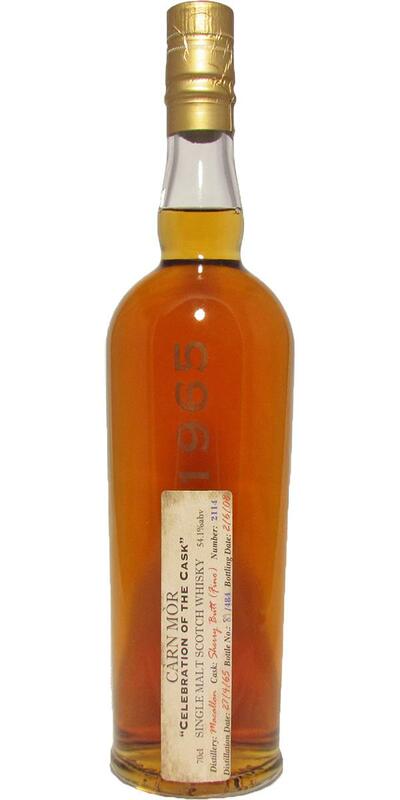 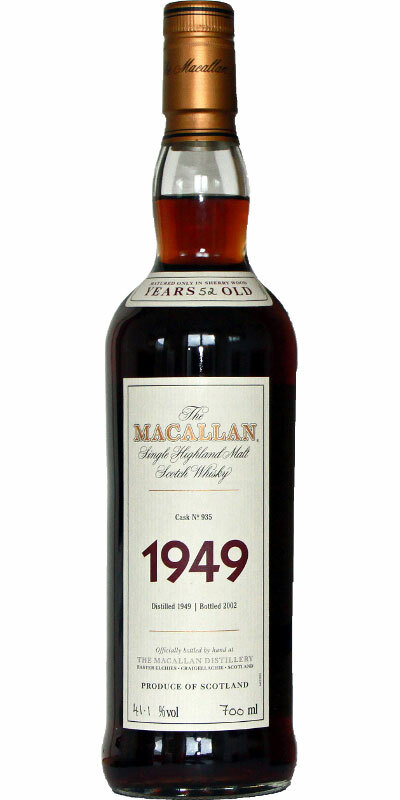 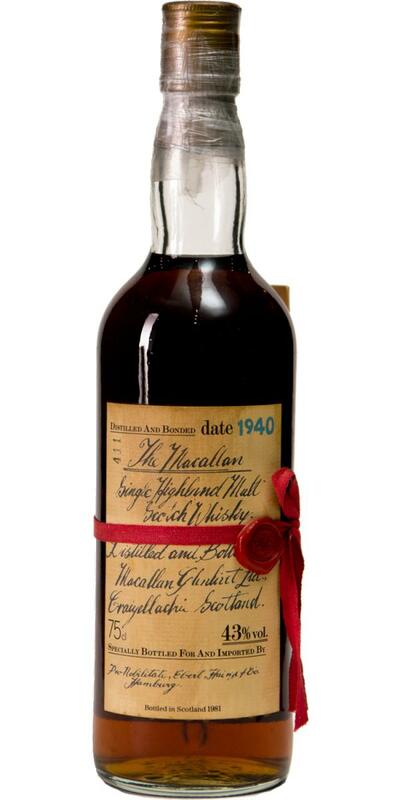 Macallan 1949 Fine & Rare 52 46.7 % Vol. 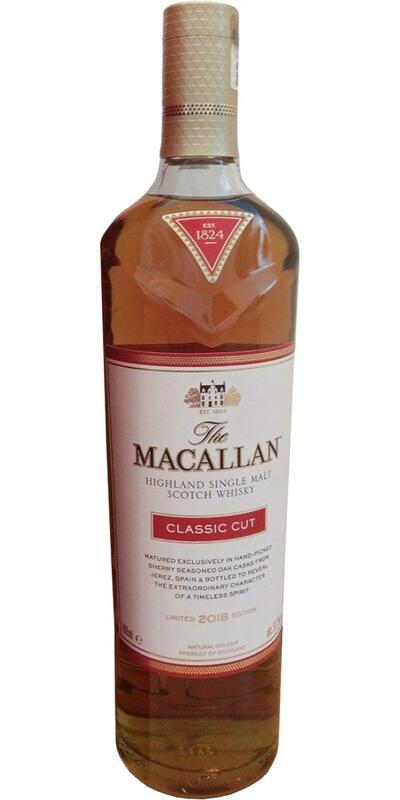 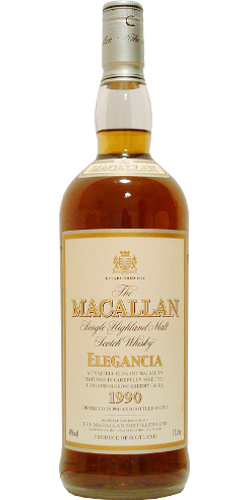 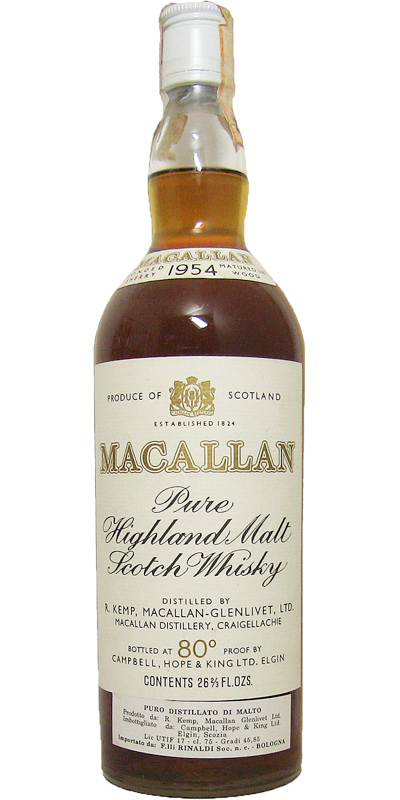 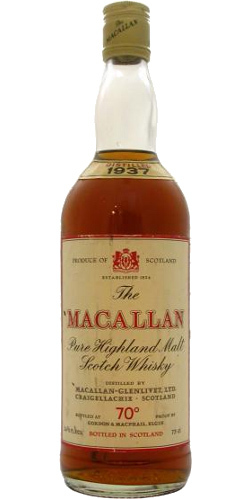 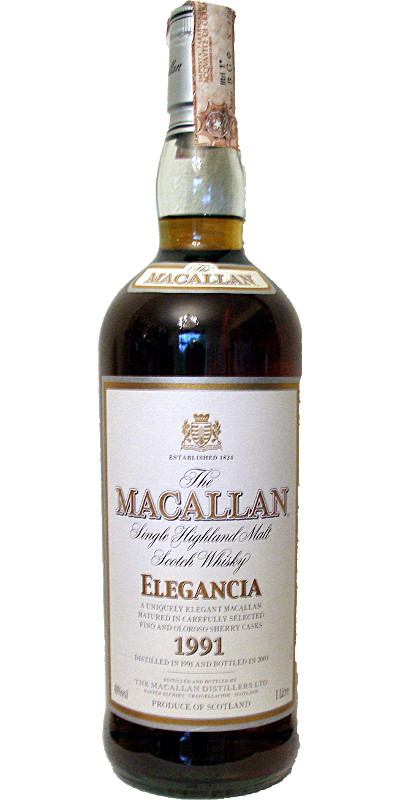 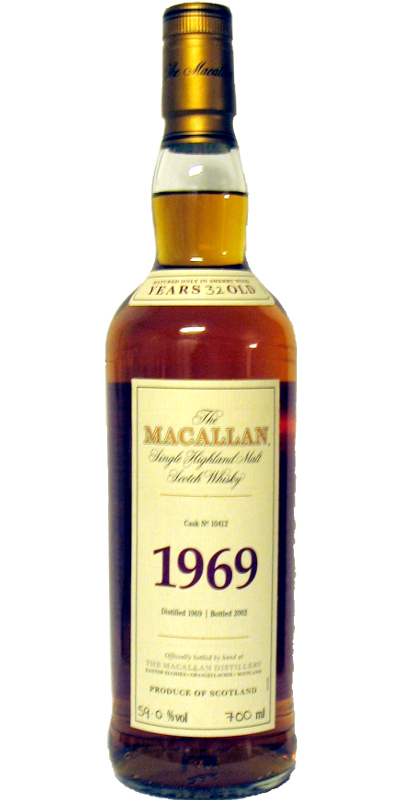 Macallan 1963 43.0 % Vol. 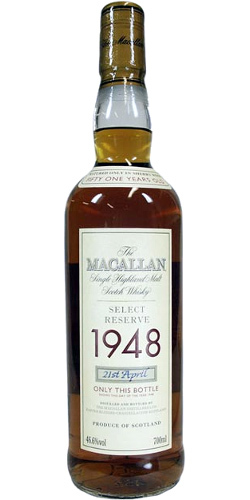 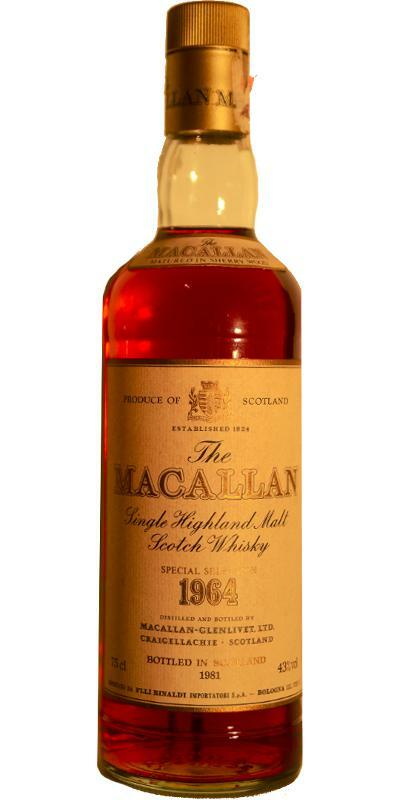 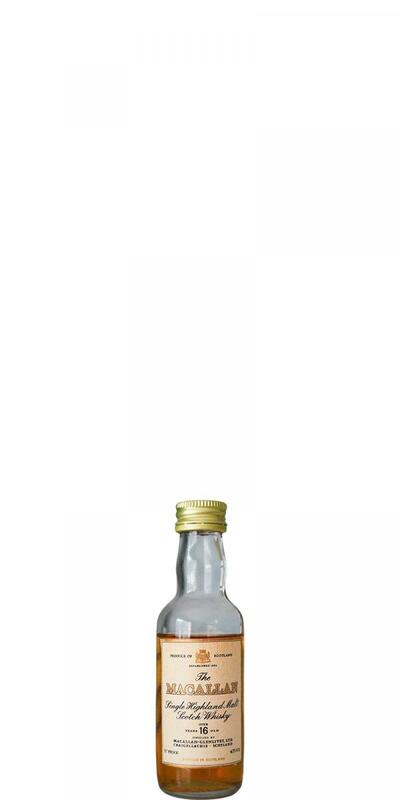 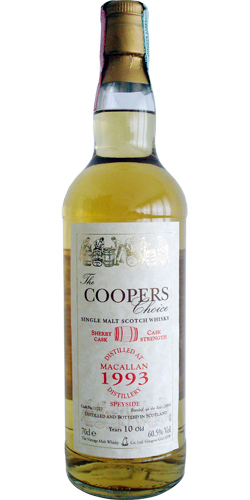 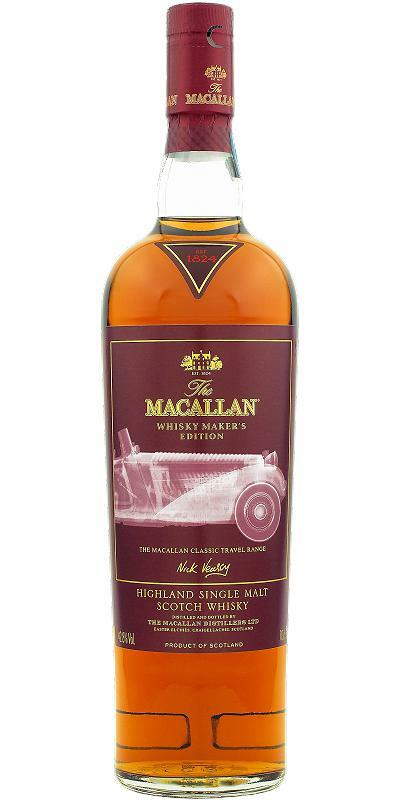 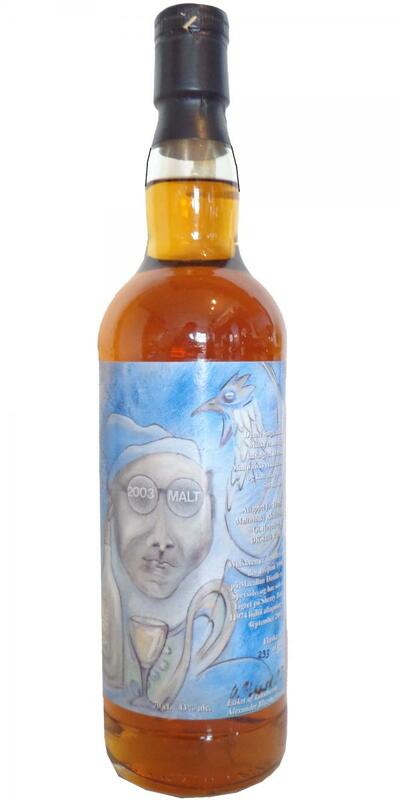 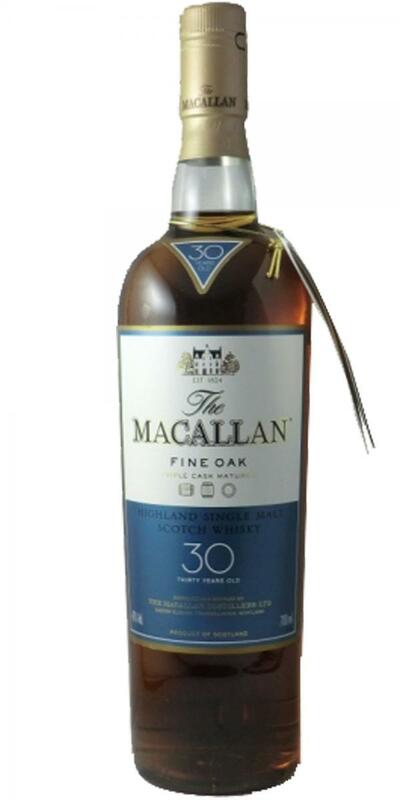 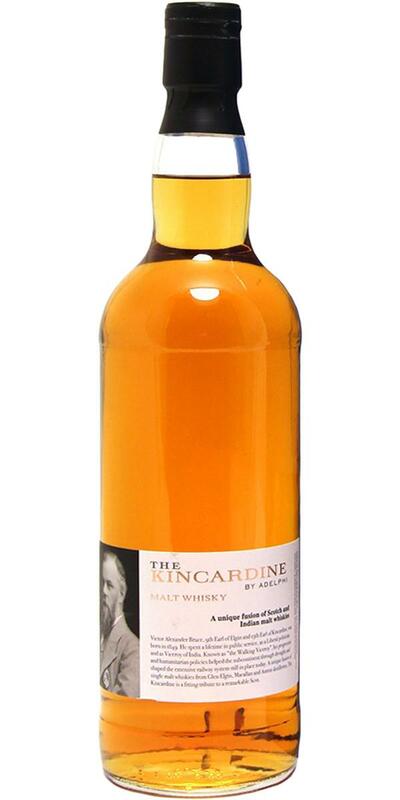 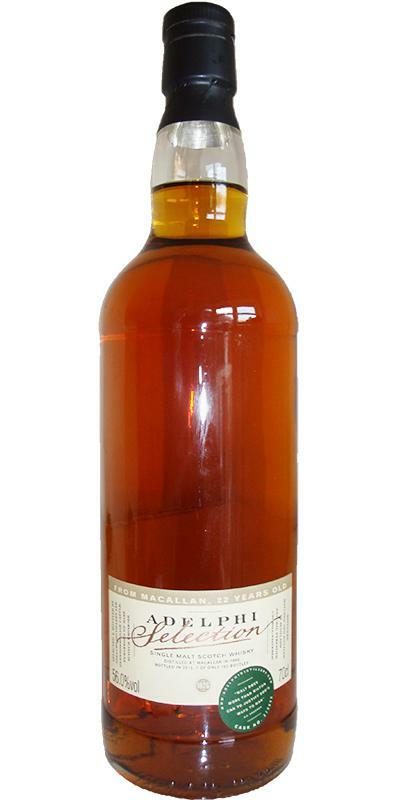 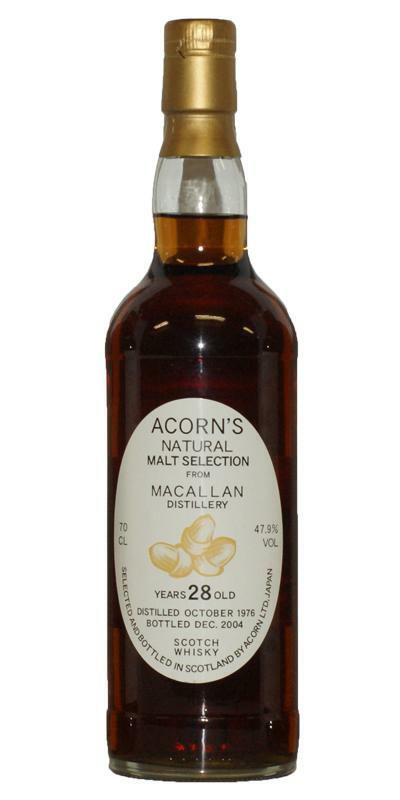 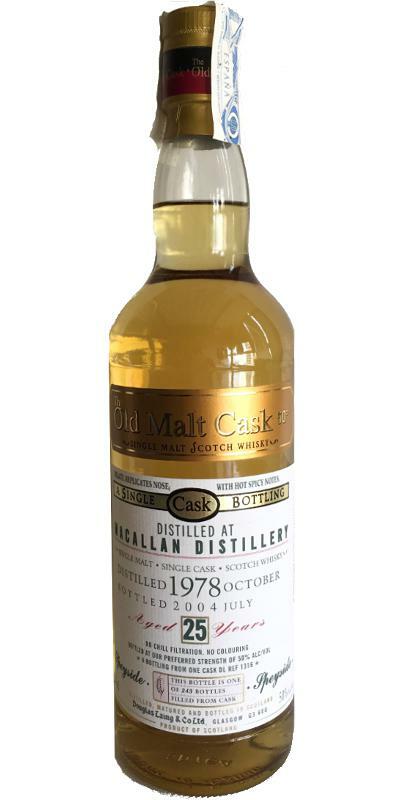 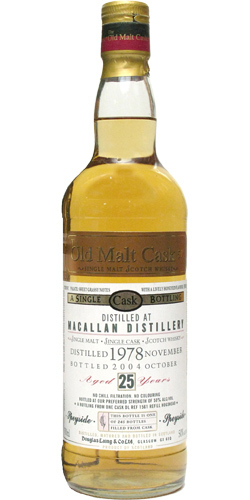 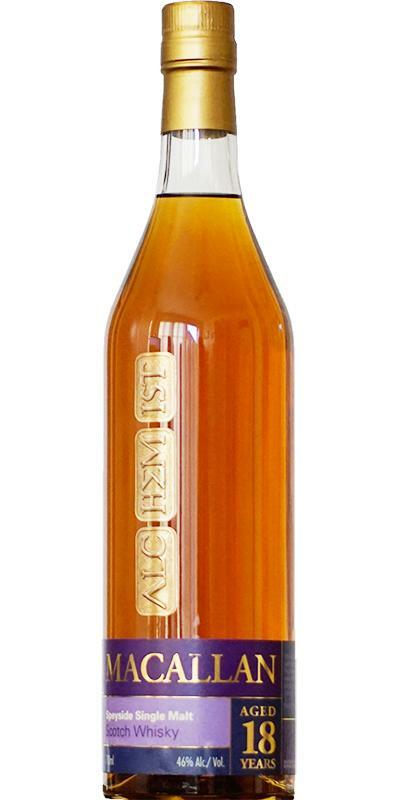 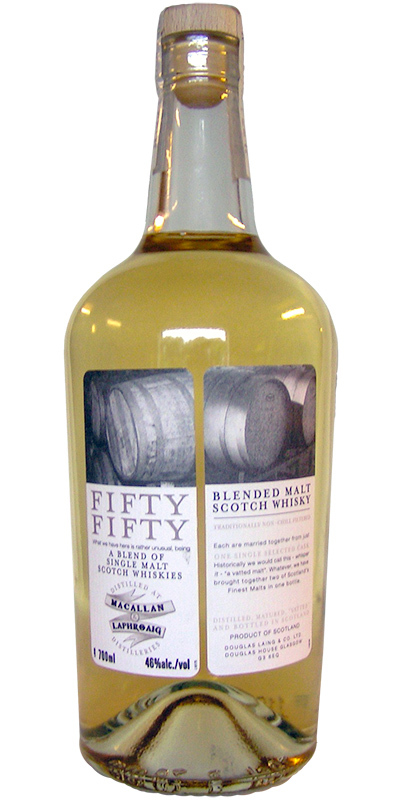 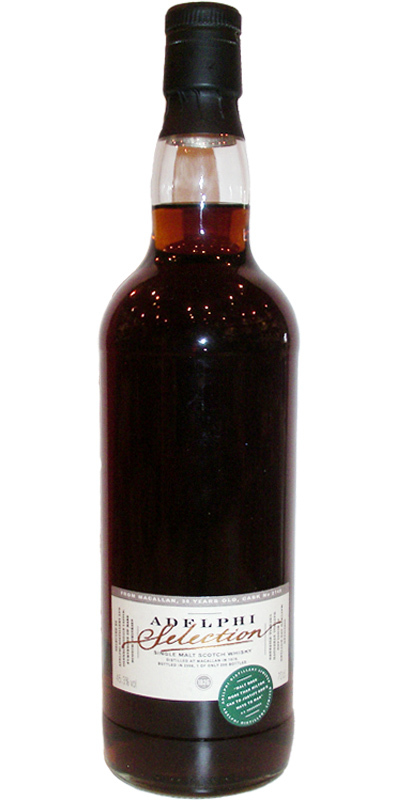 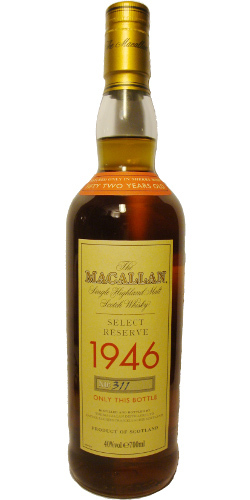 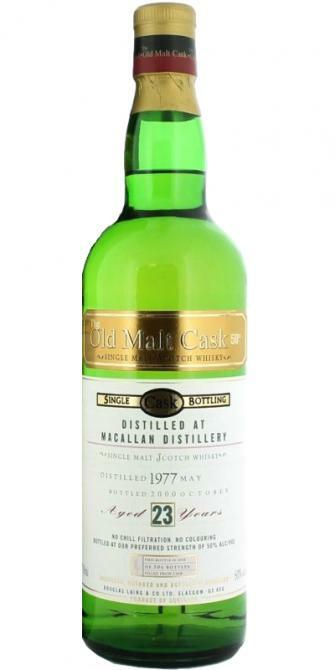 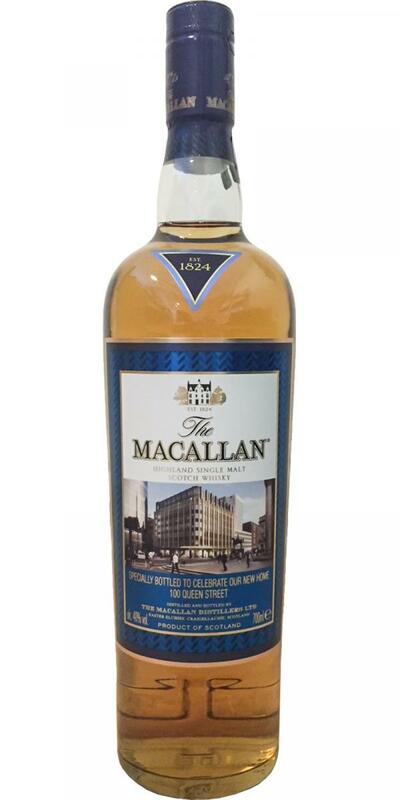 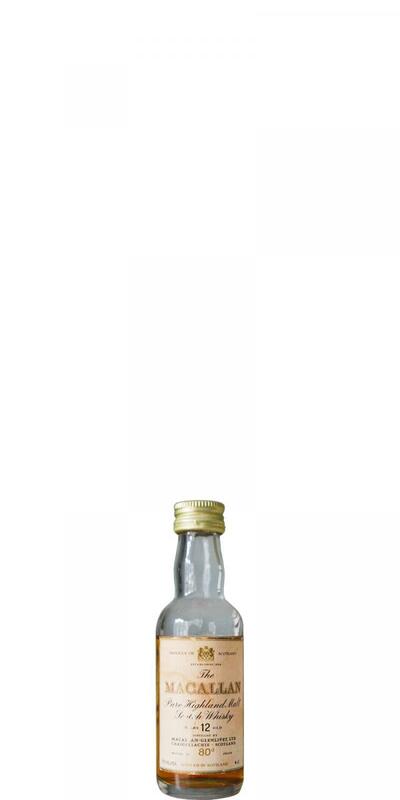 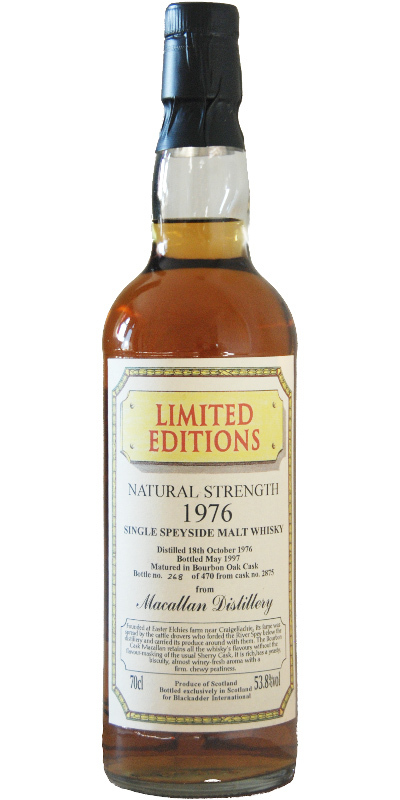 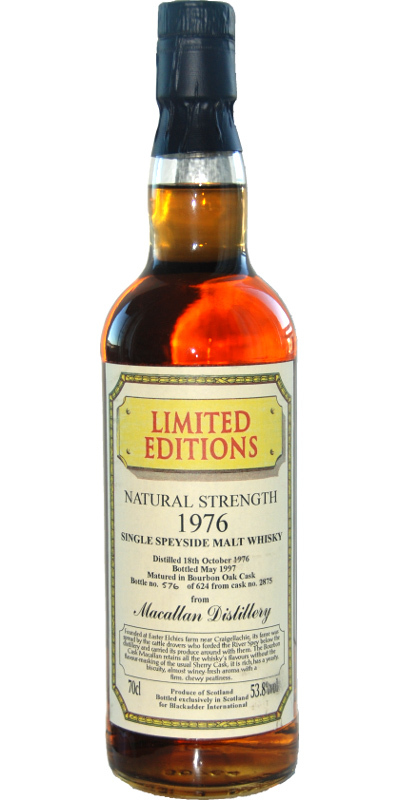 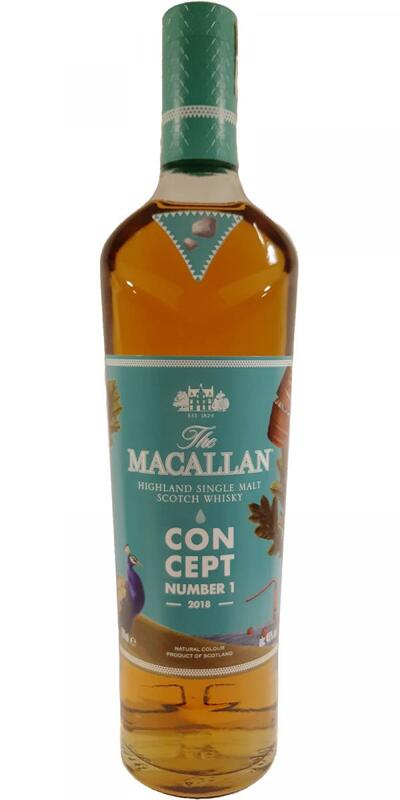 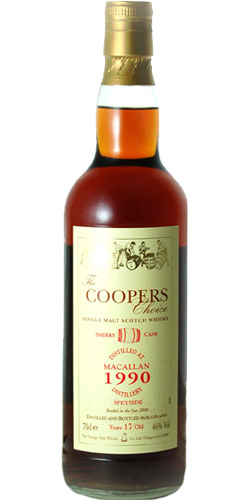 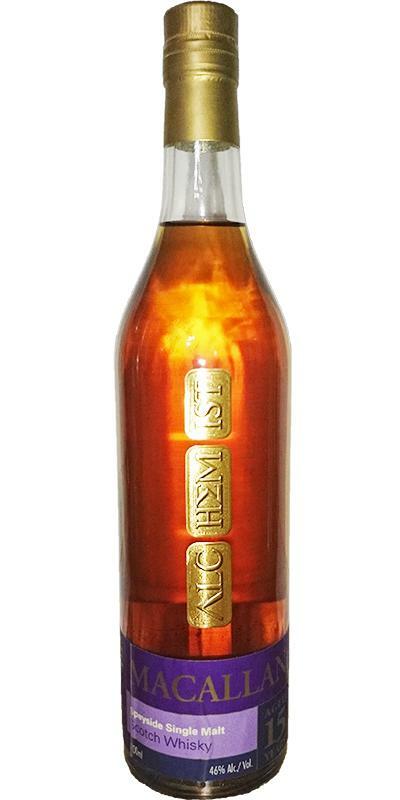 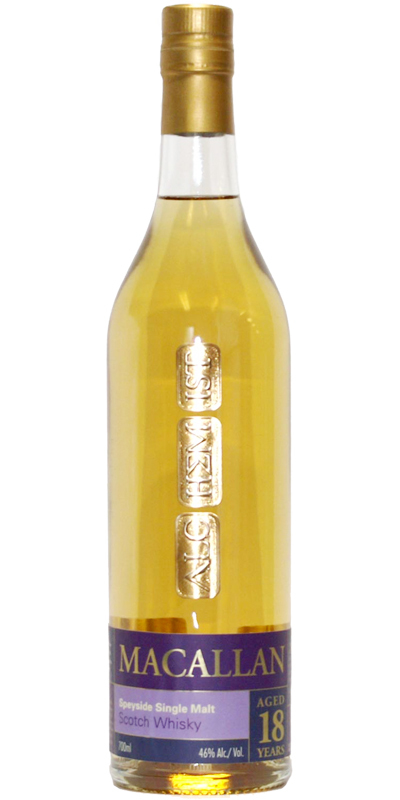 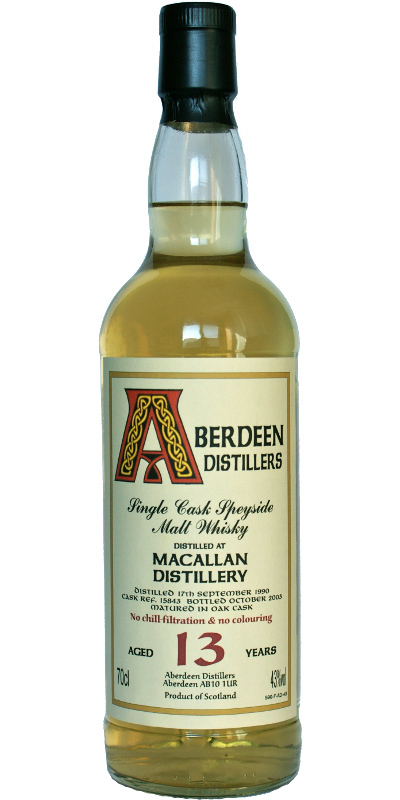 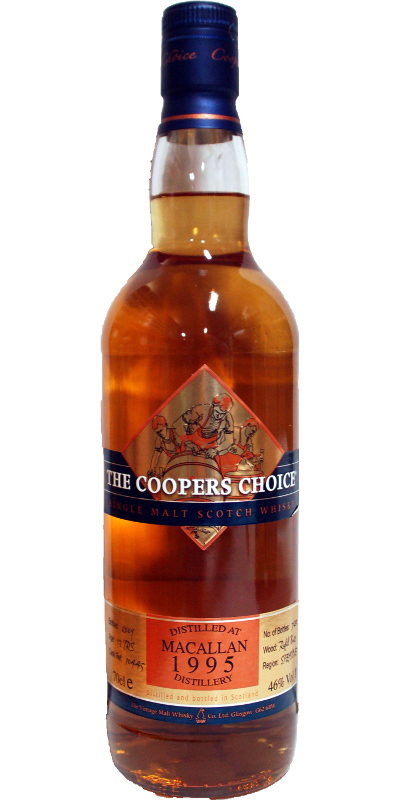 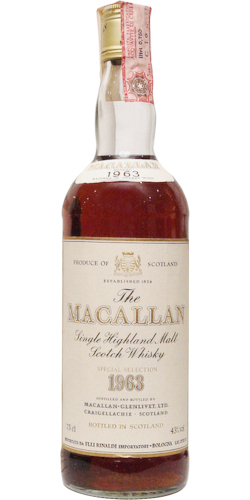 Macallan 1963 The Northern Scot Centenary Malt Whisky 46.0 % Vol. 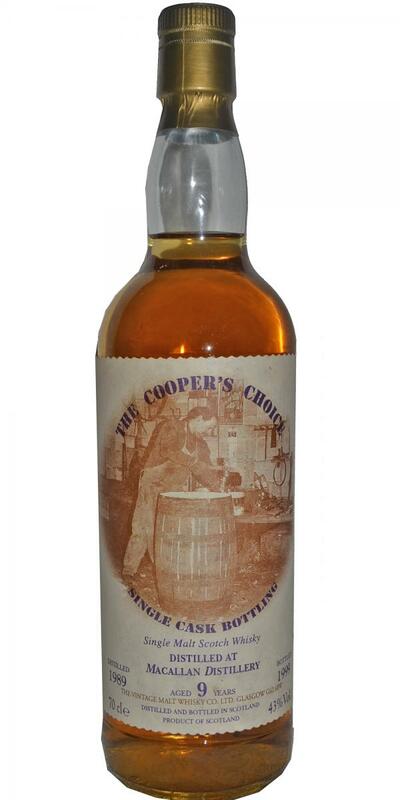 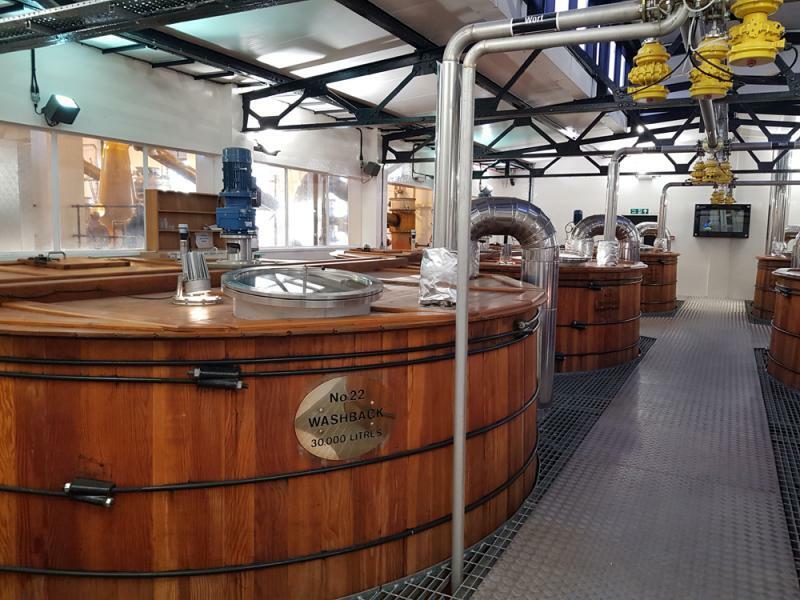 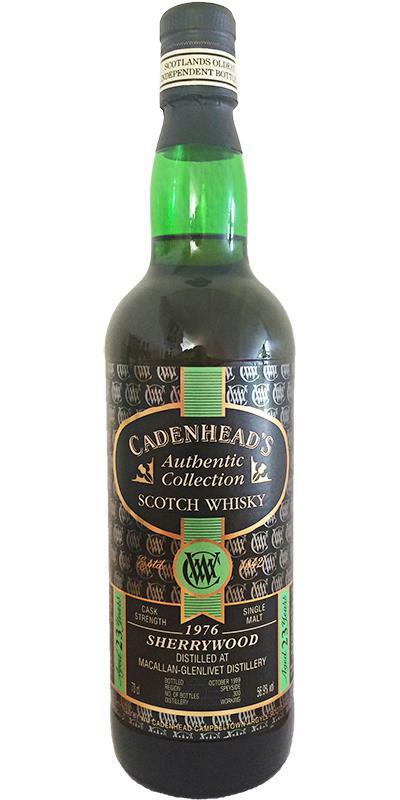 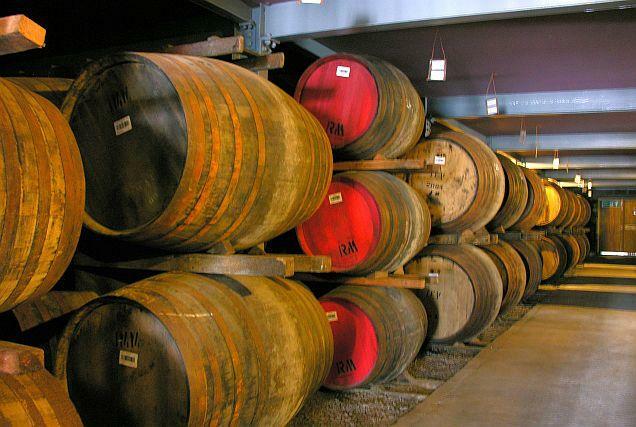 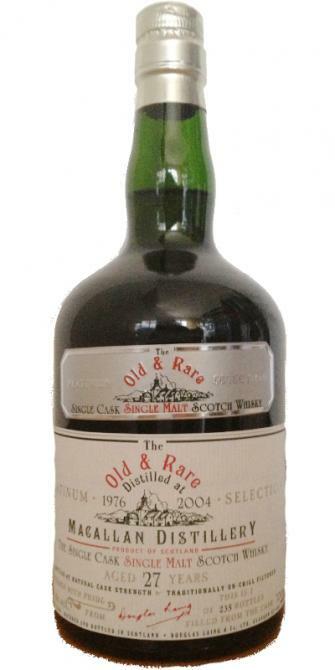 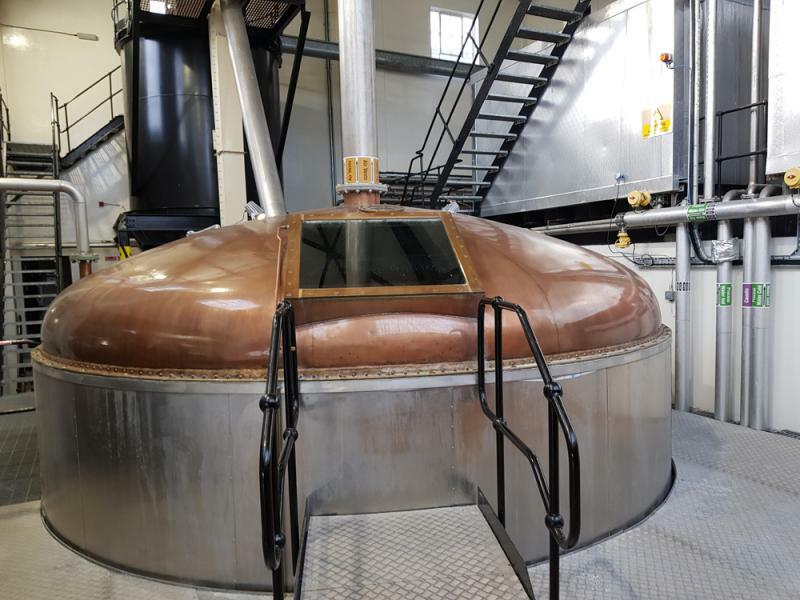 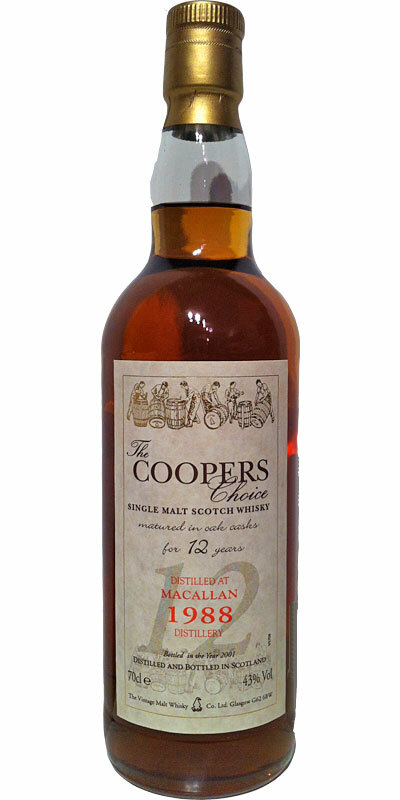 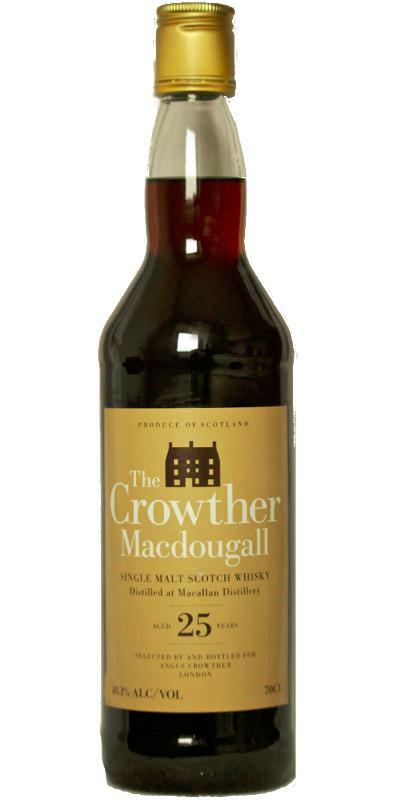 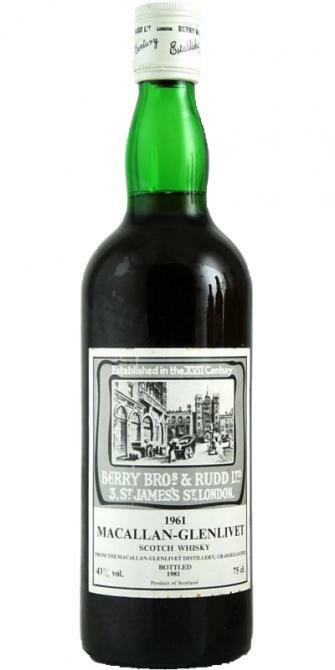 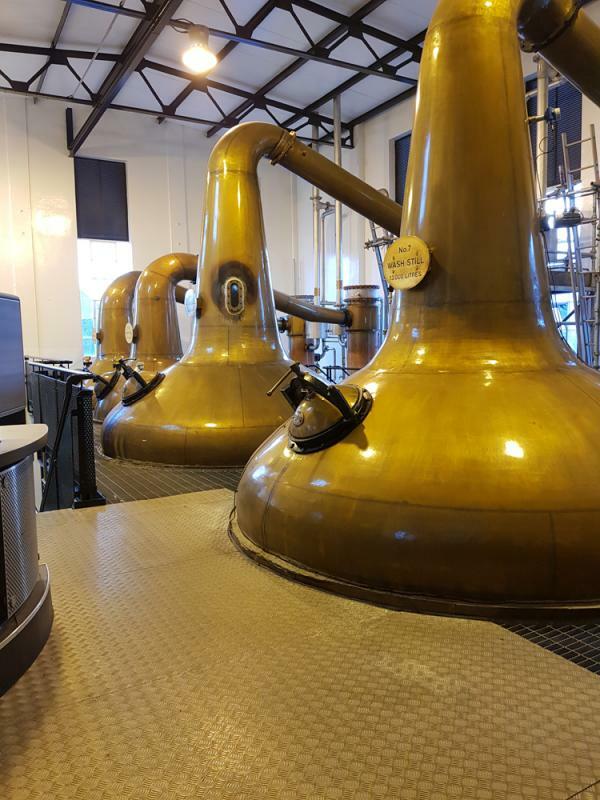 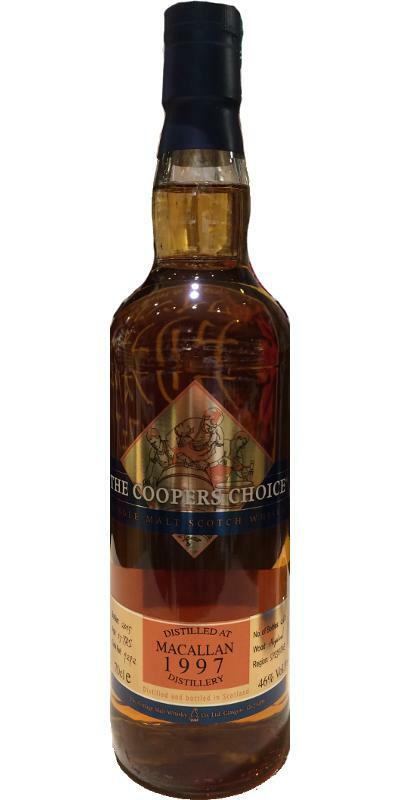 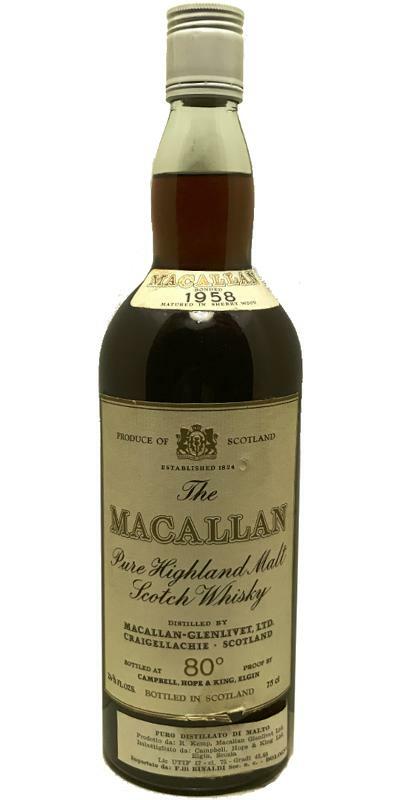 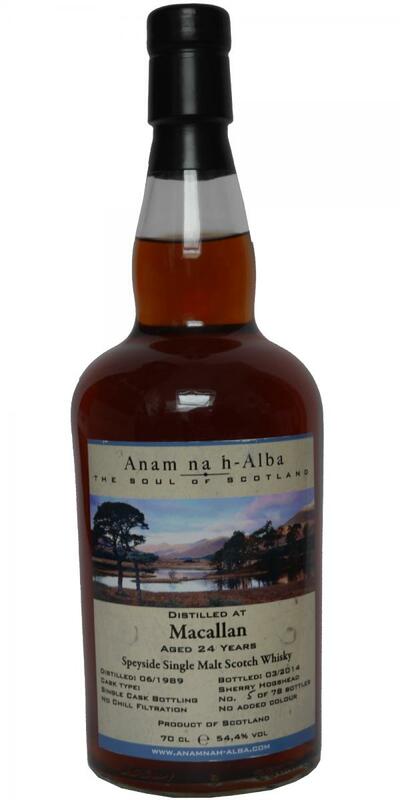 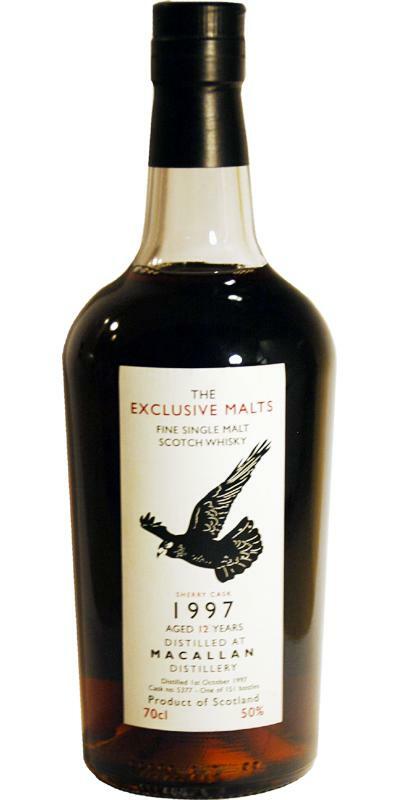 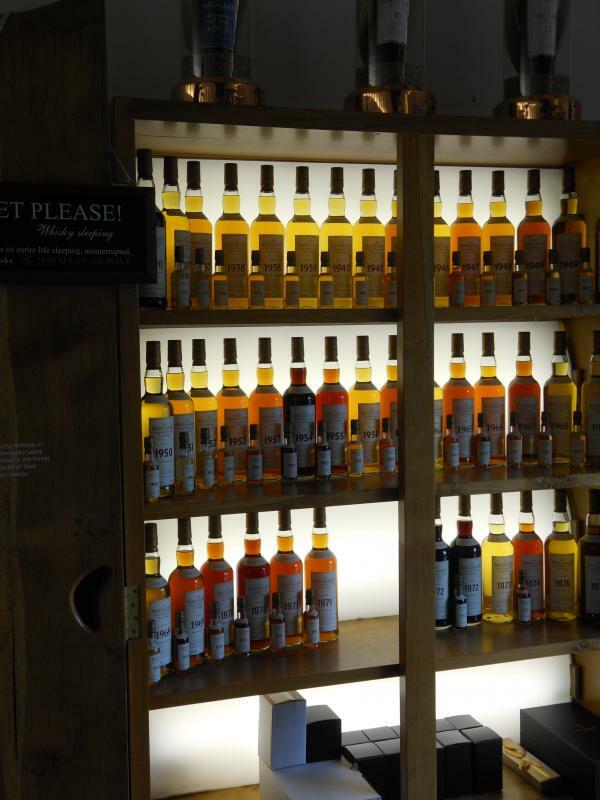 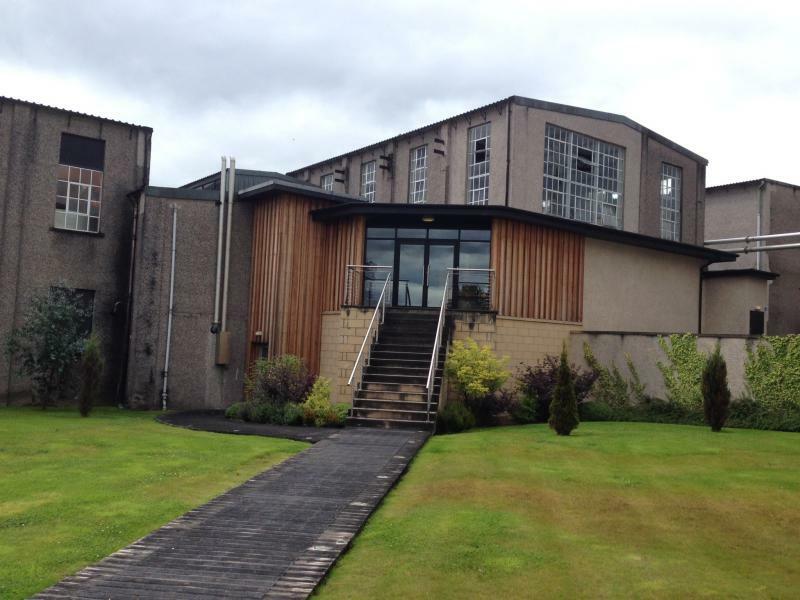 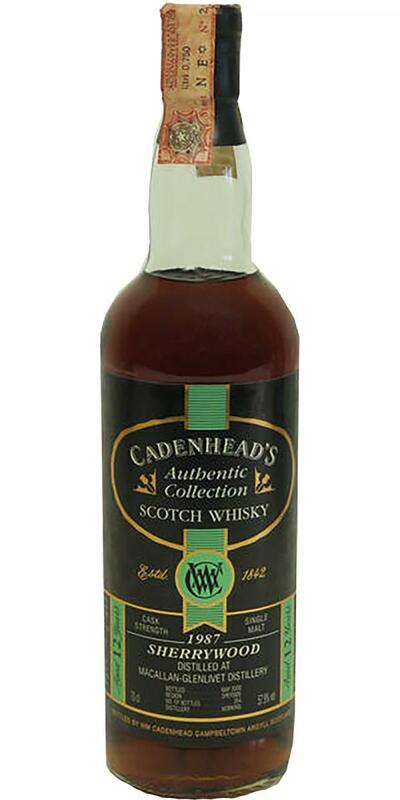 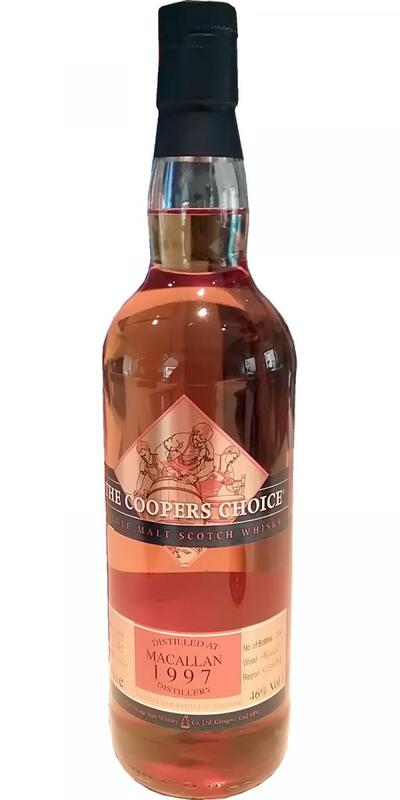 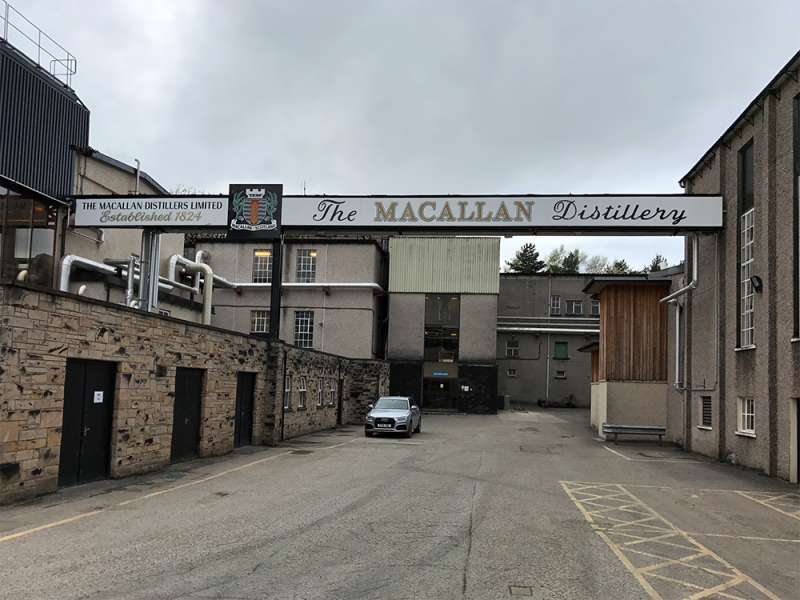 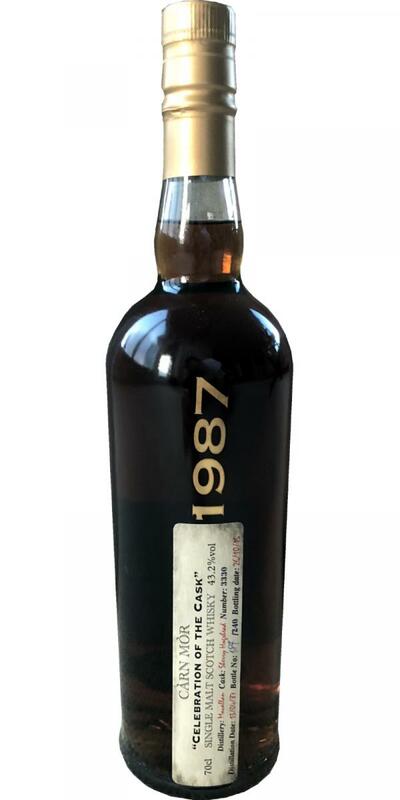 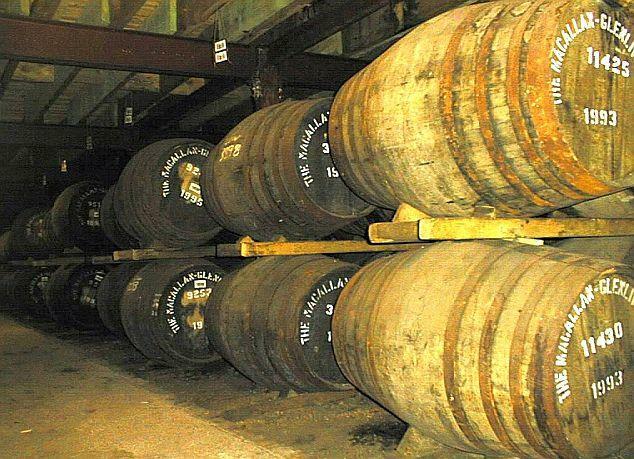 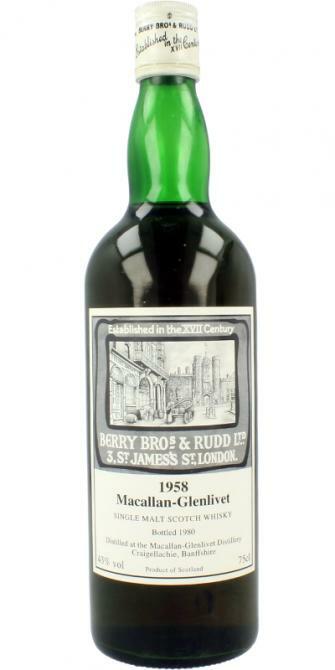 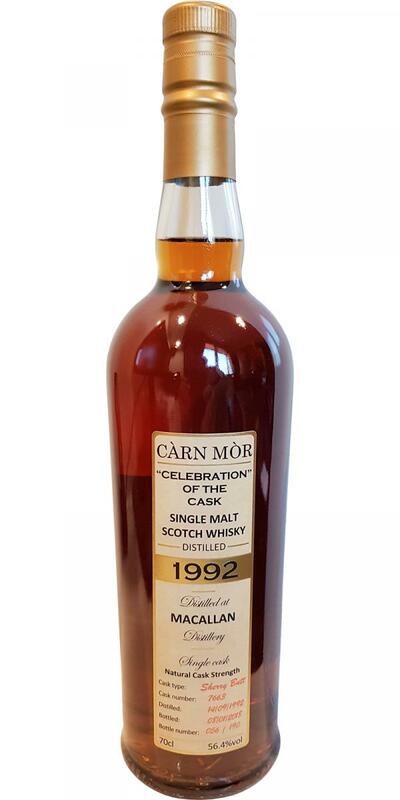 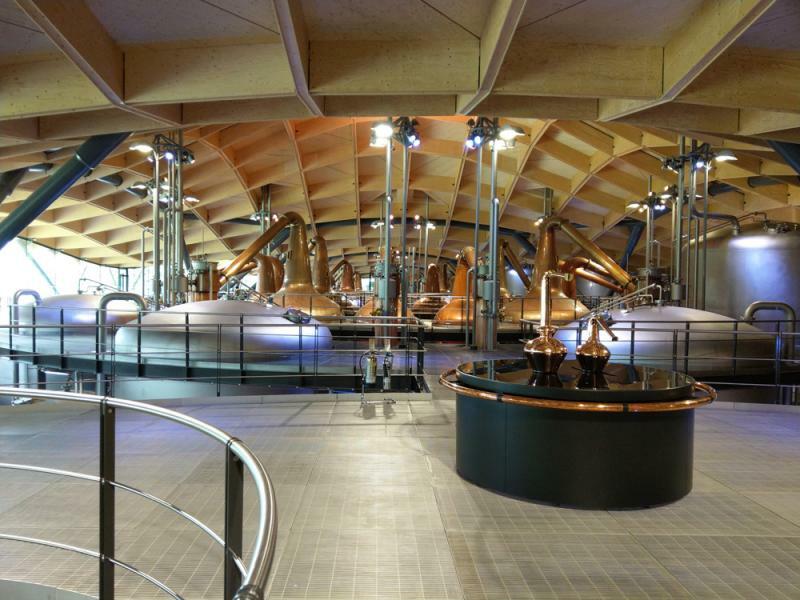 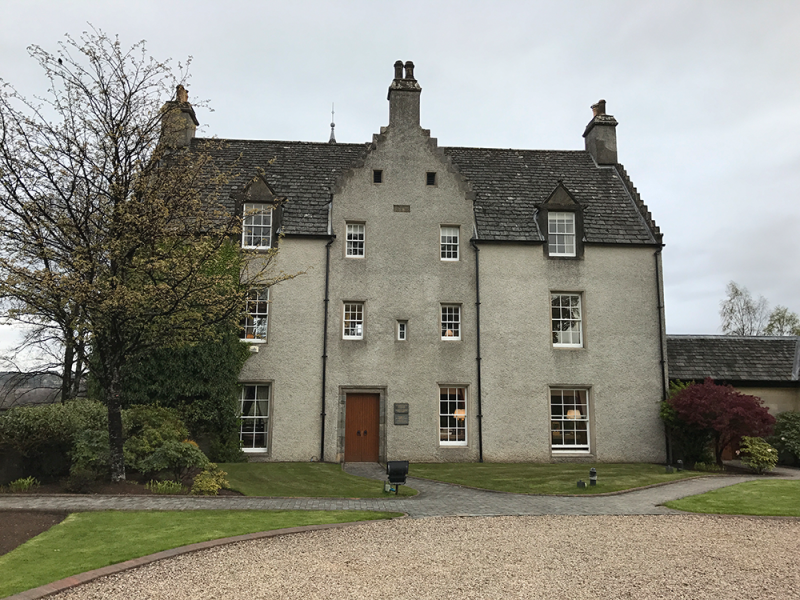 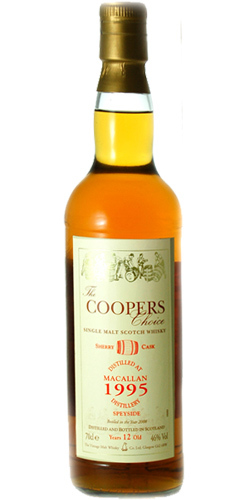 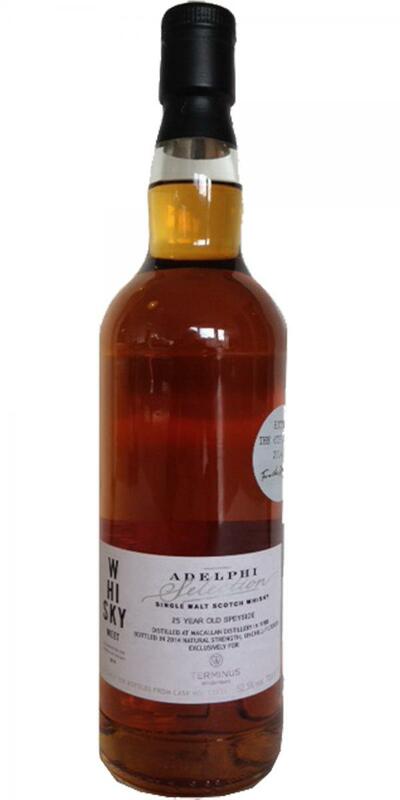 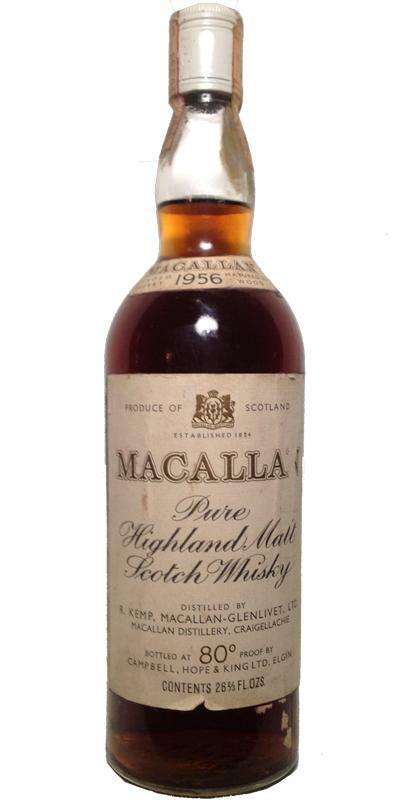 Macallan 1977 HBOS plc, The Mound, Edinburgh 18 43.0 % Vol. 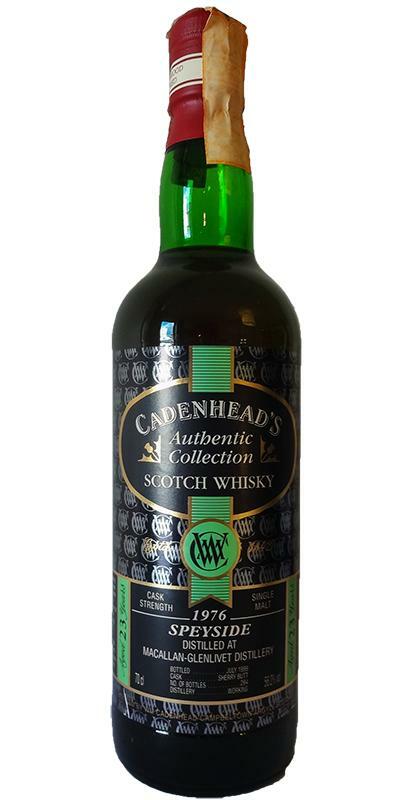 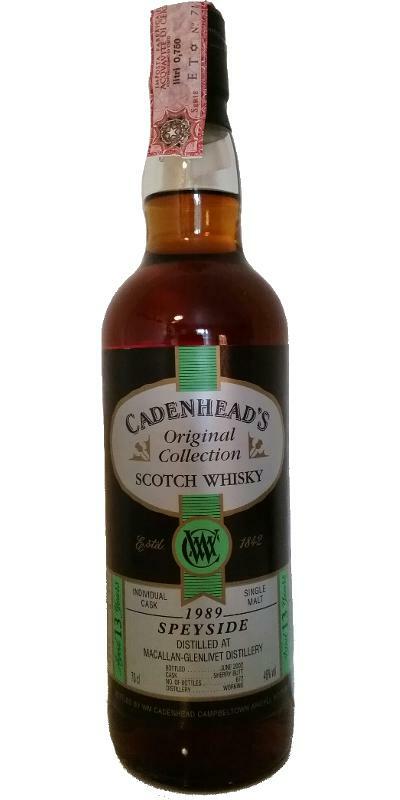 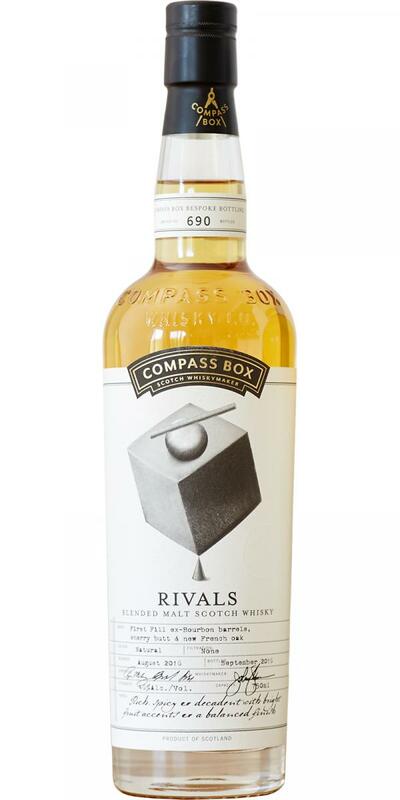 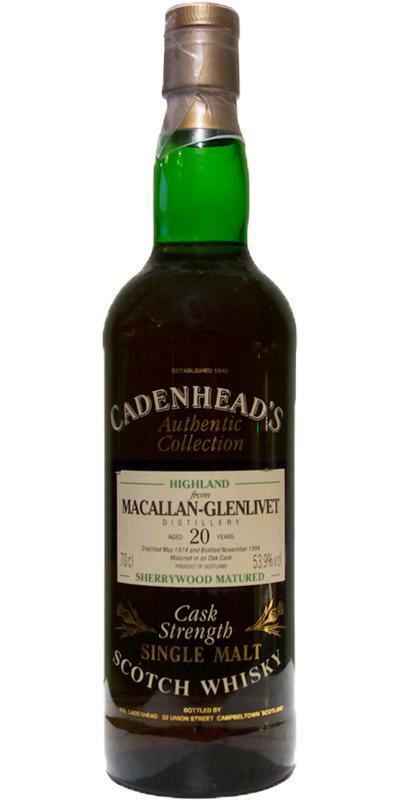 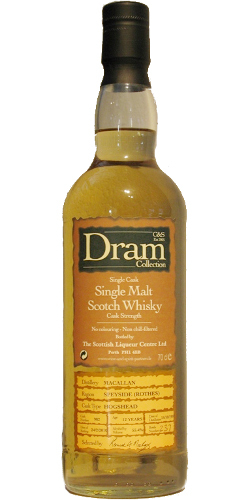 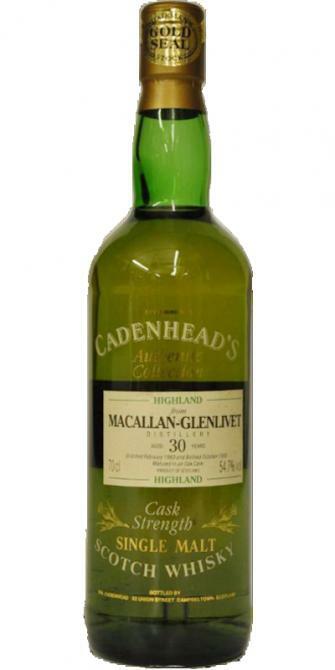 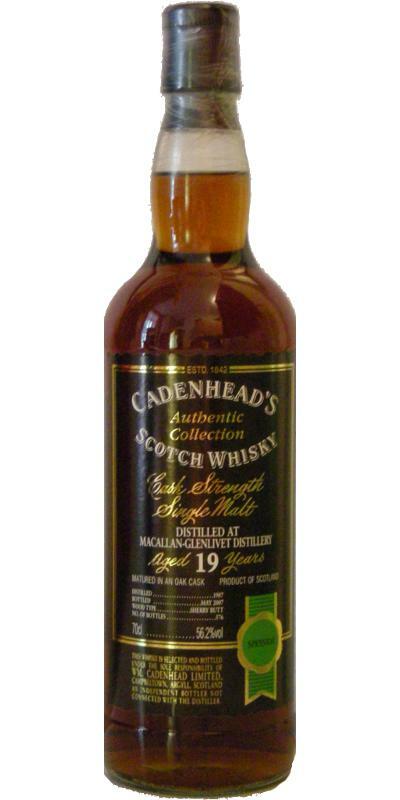 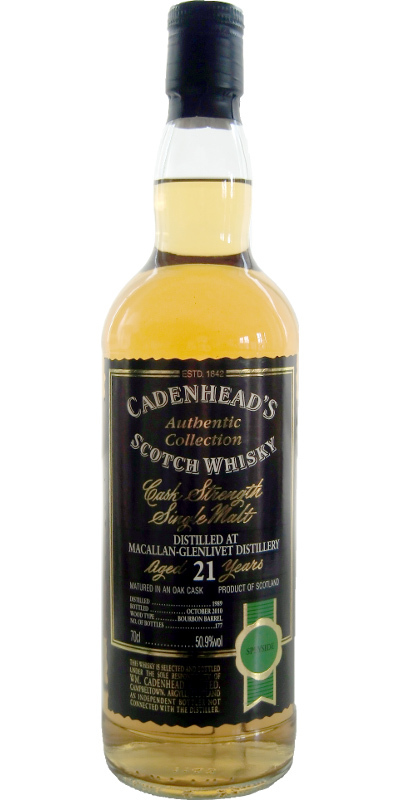 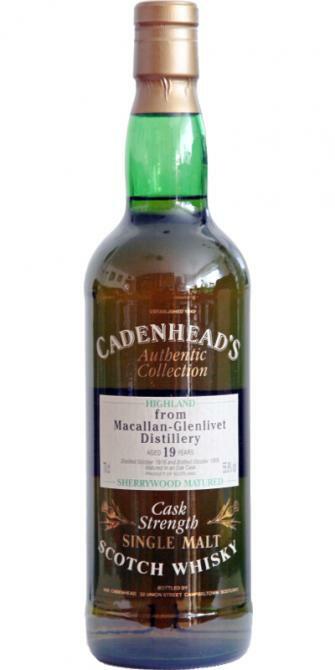 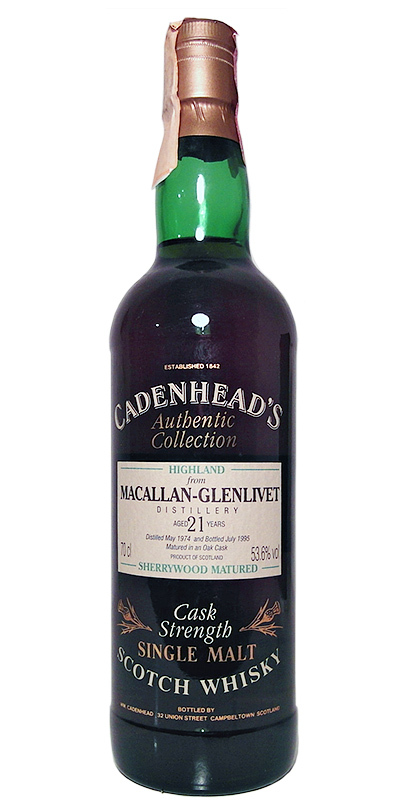 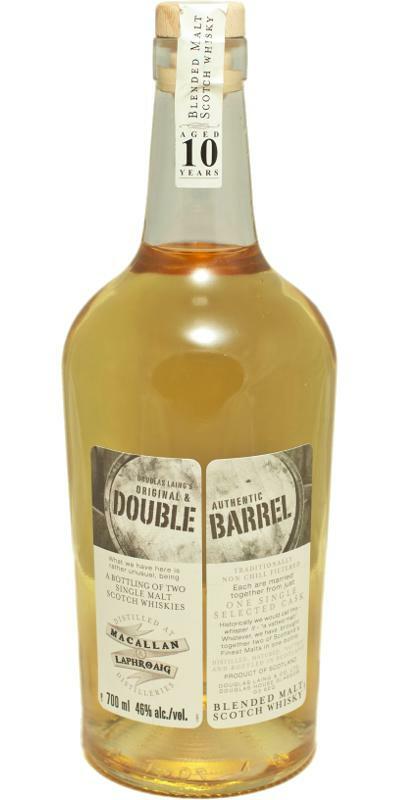 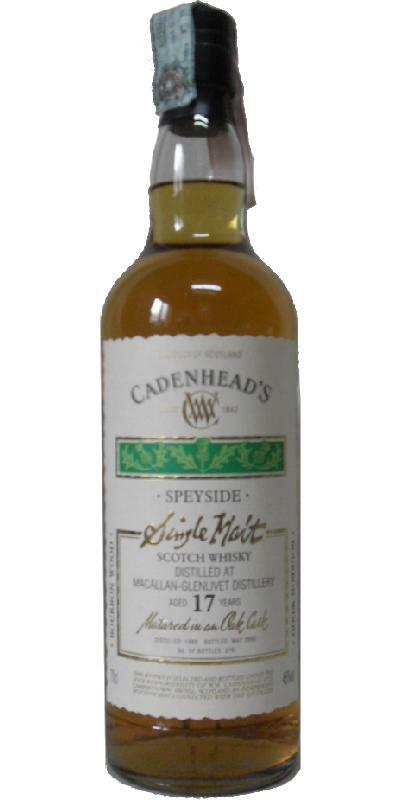 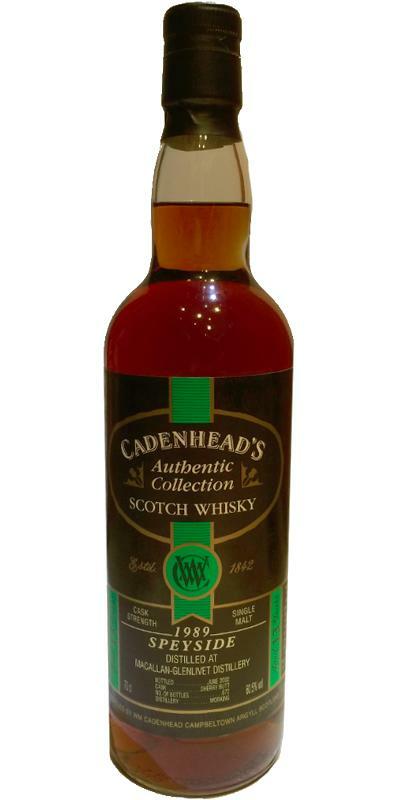 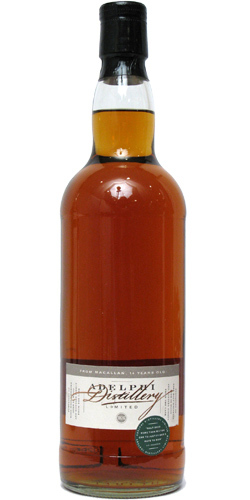 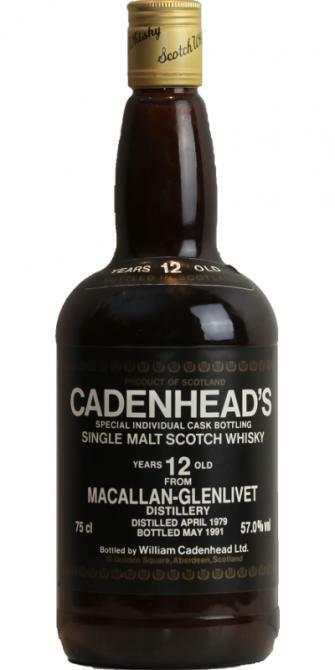 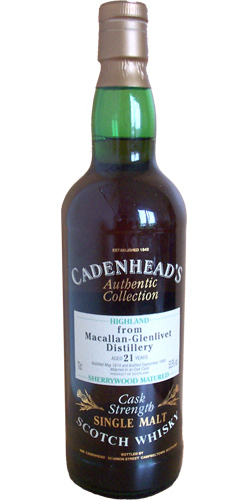 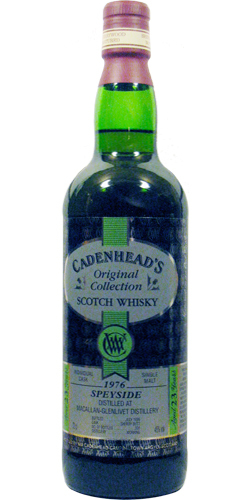 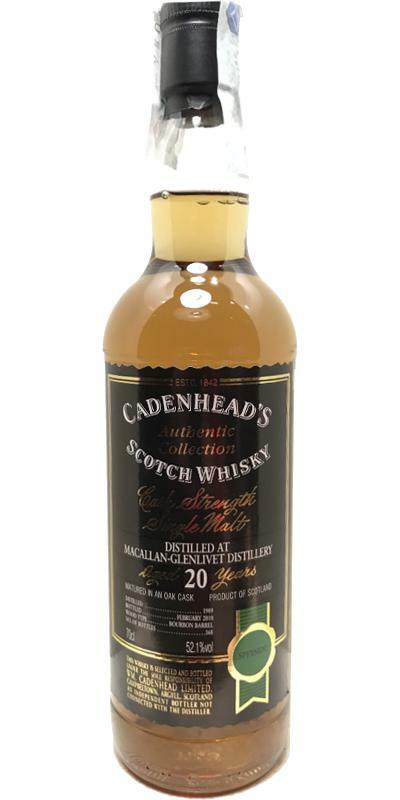 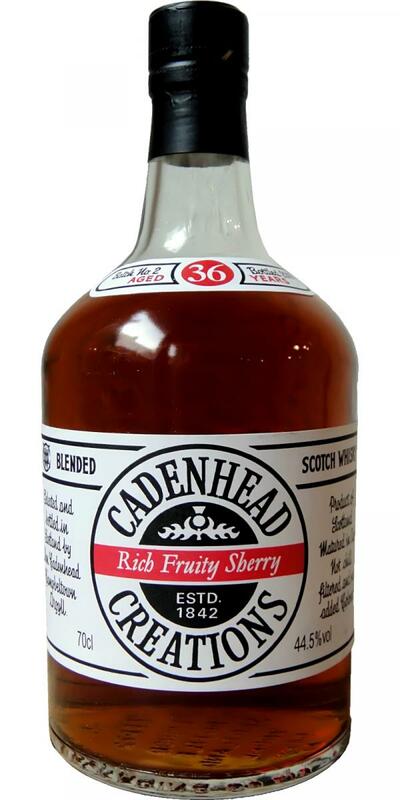 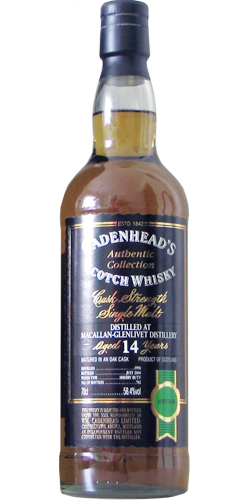 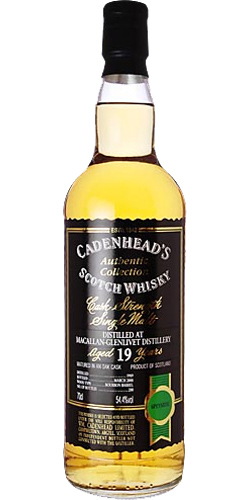 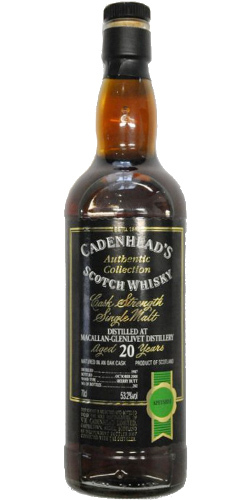 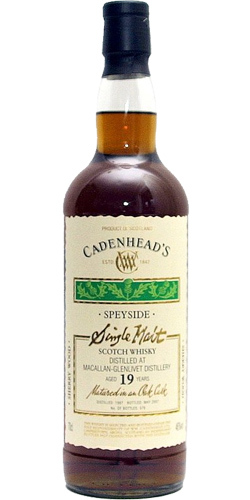 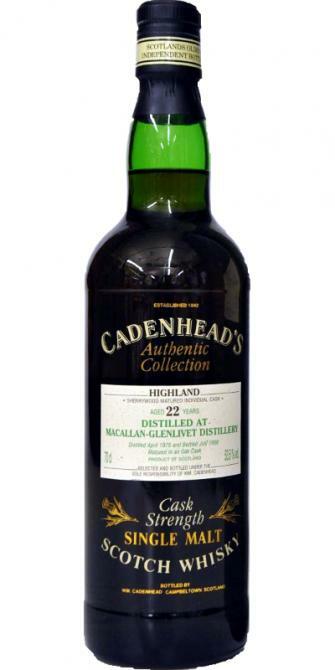 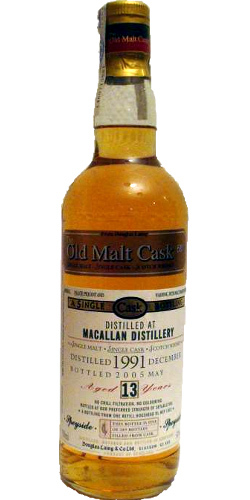 Macallan 21-year-old Drumbeg 21 53.3 % Vol. 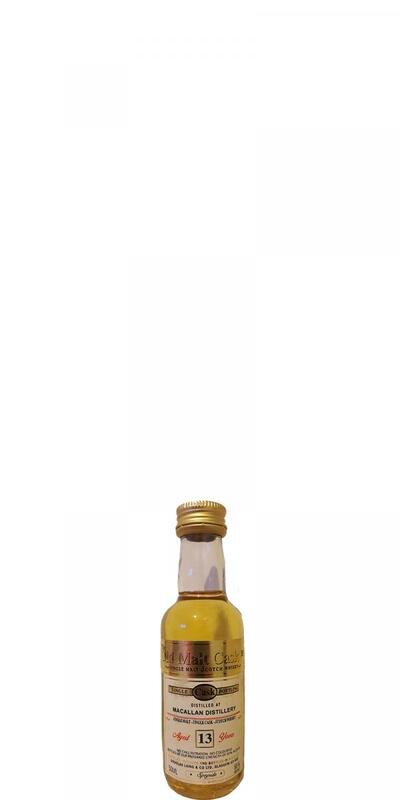 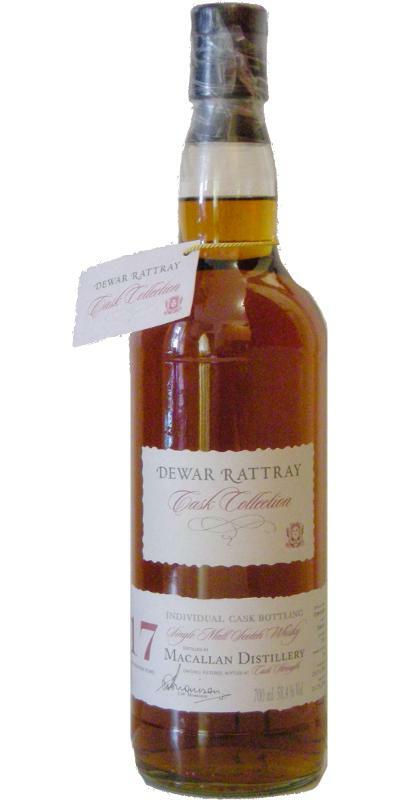 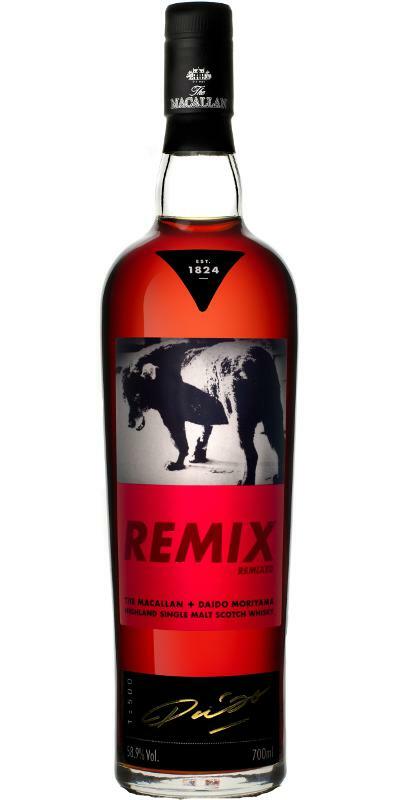 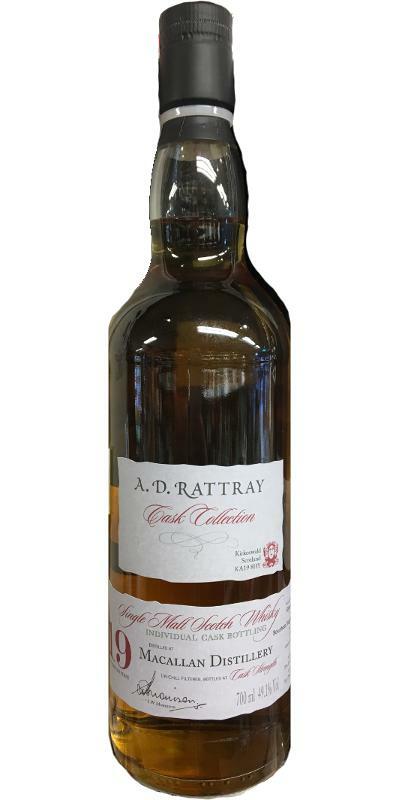 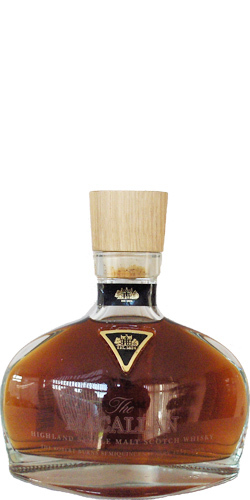 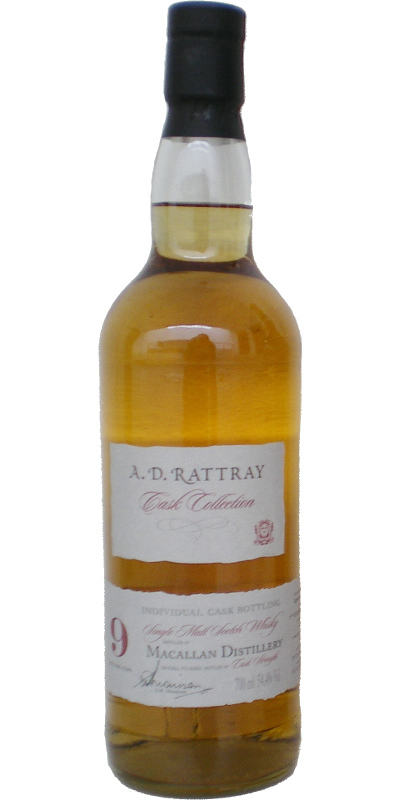 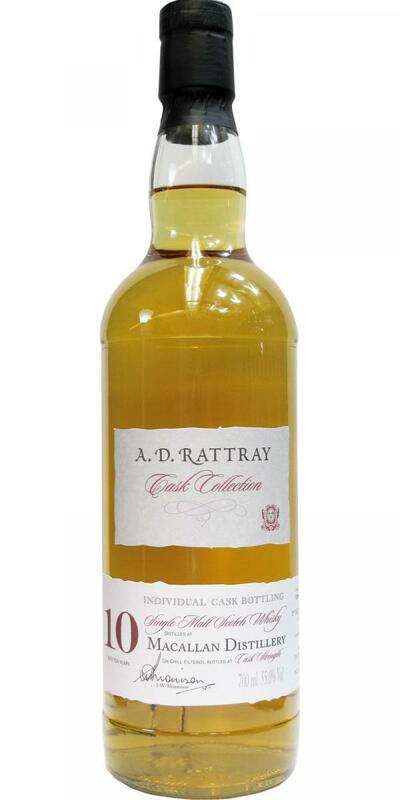 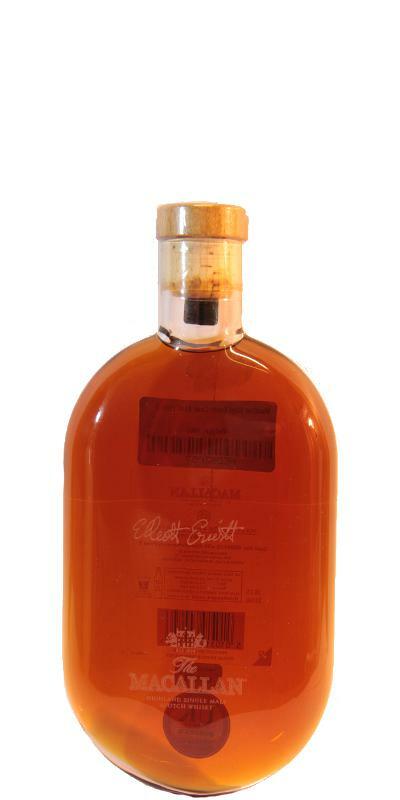 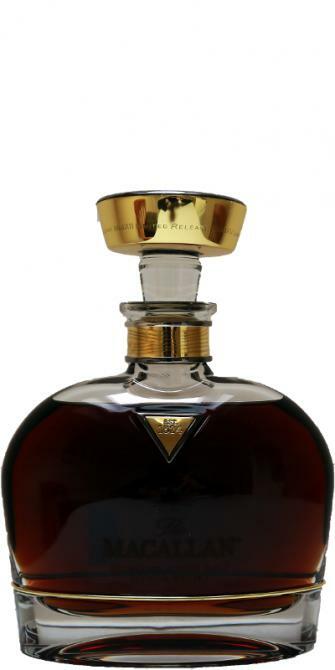 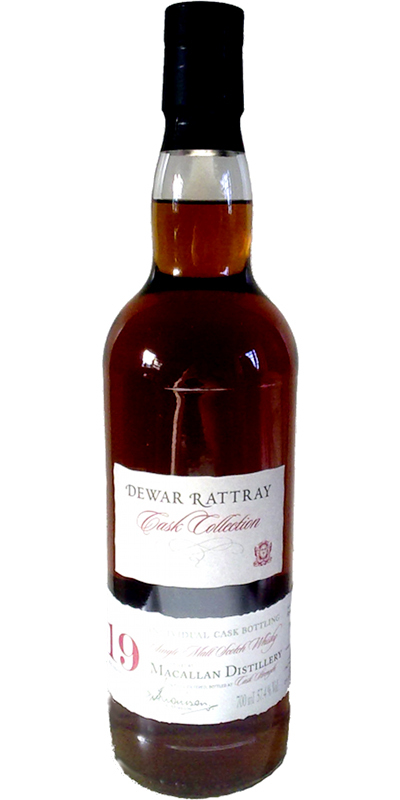 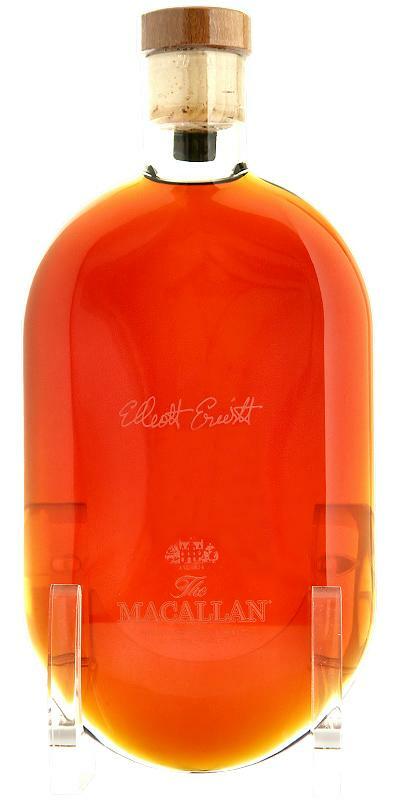 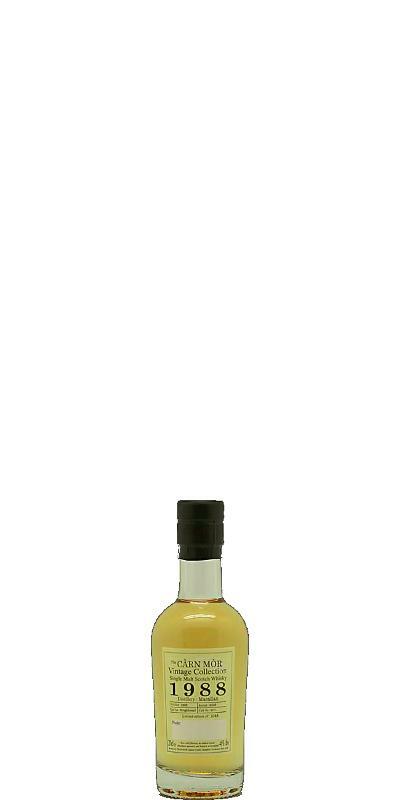 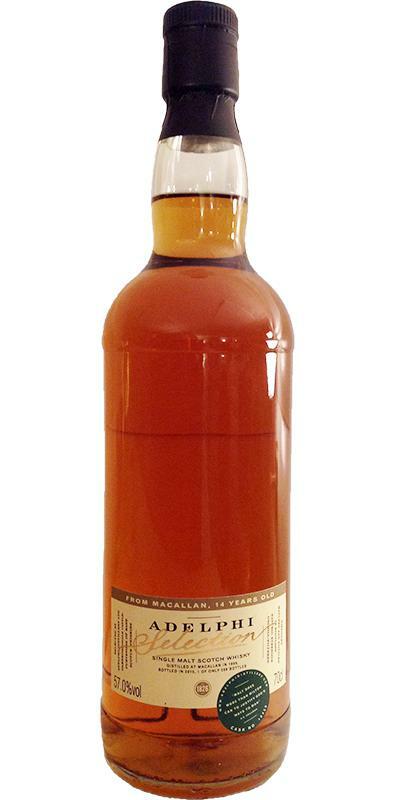 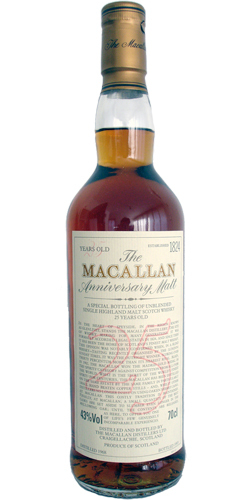 Macallan 25-year-old Remy Martin Amerique import 25 43.0 % Vol. 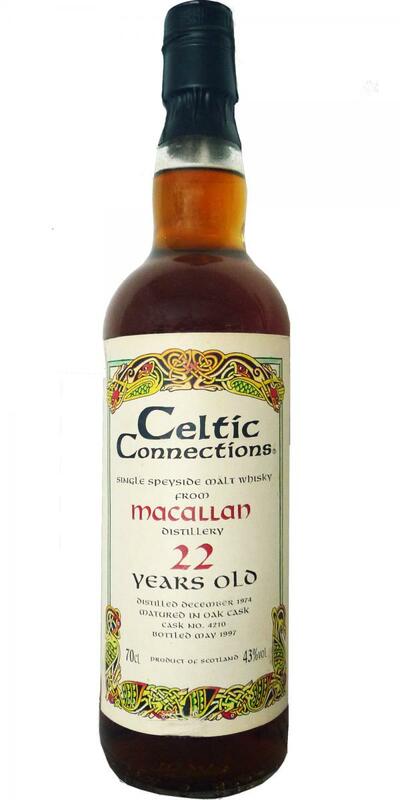 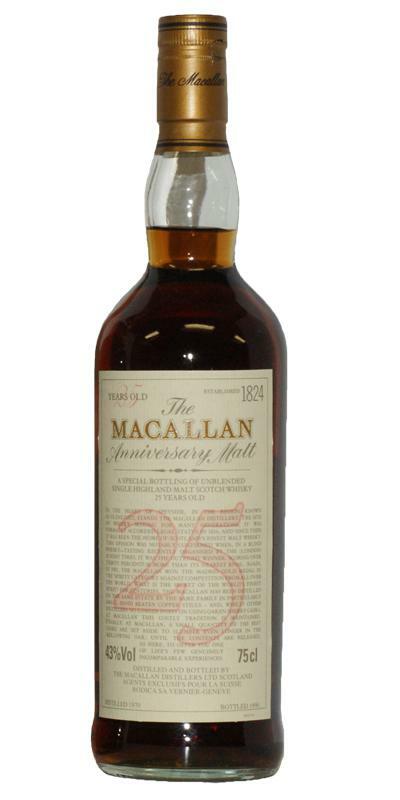 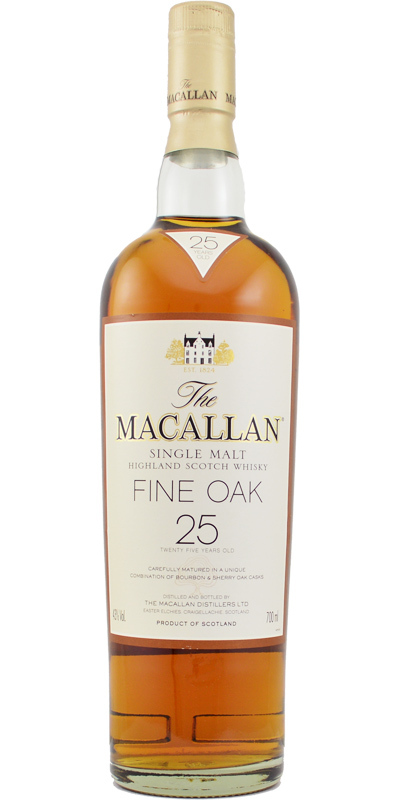 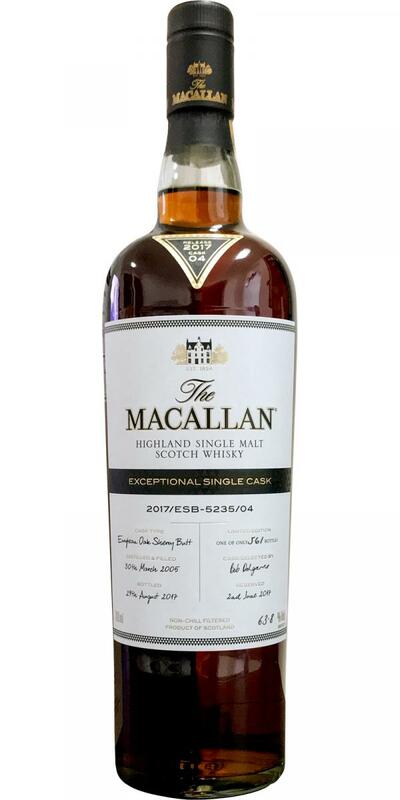 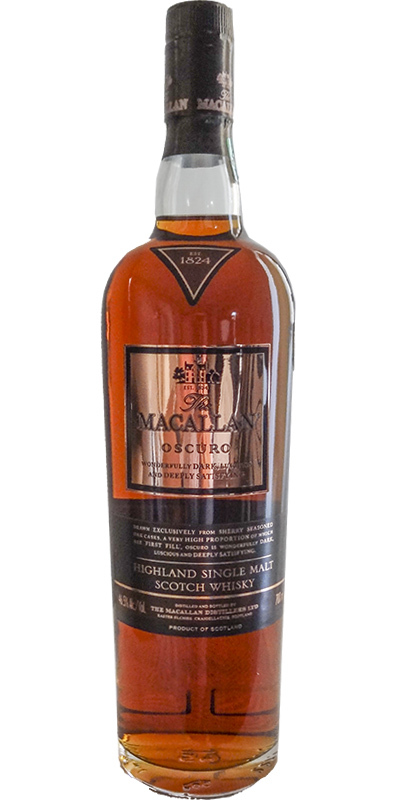 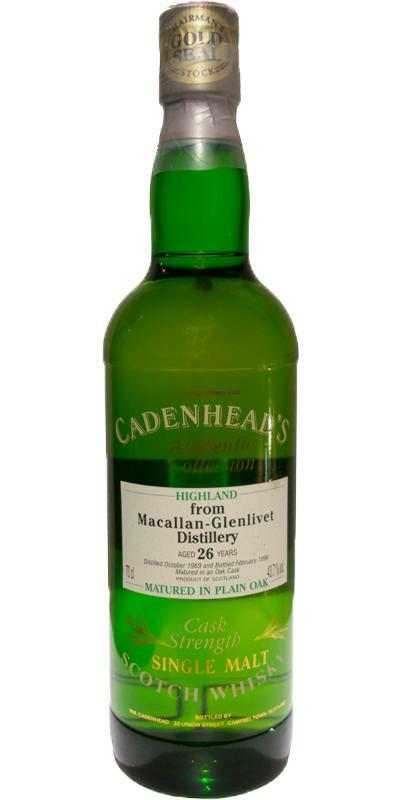 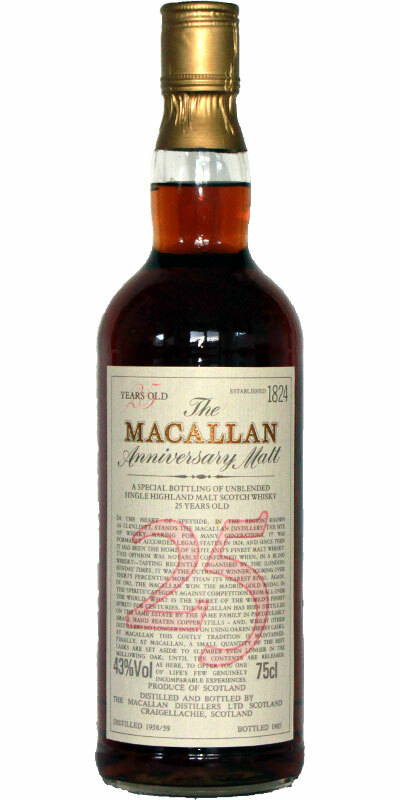 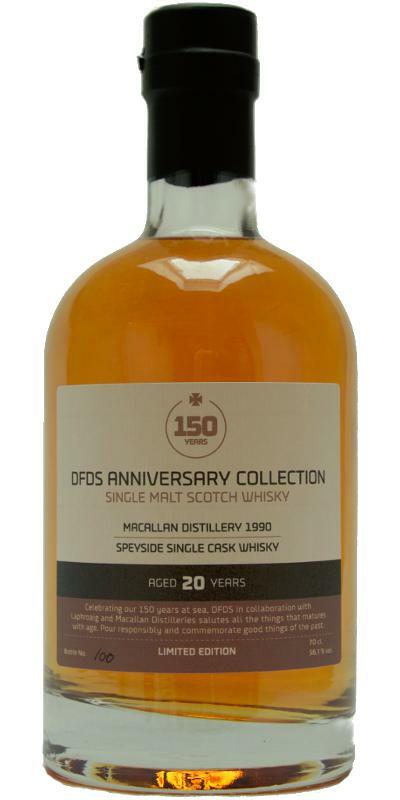 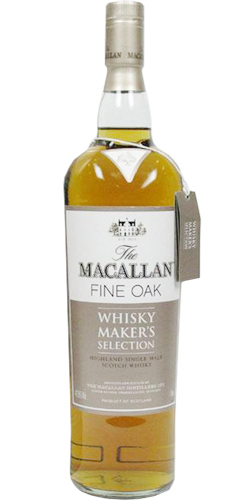 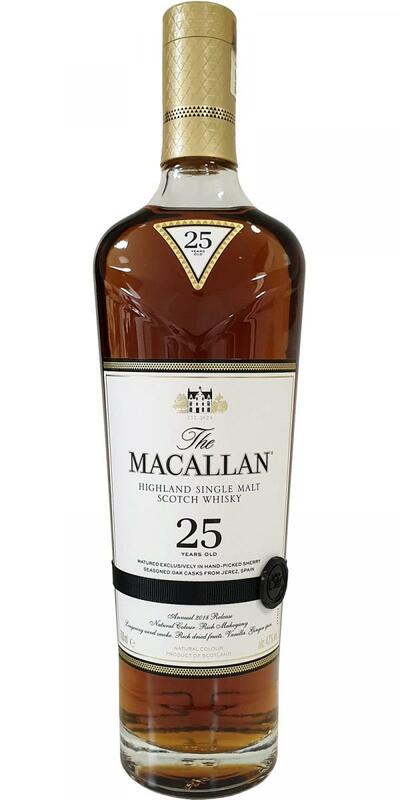 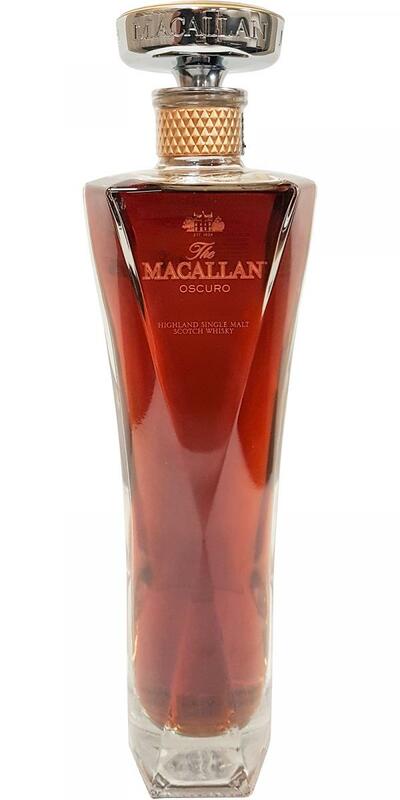 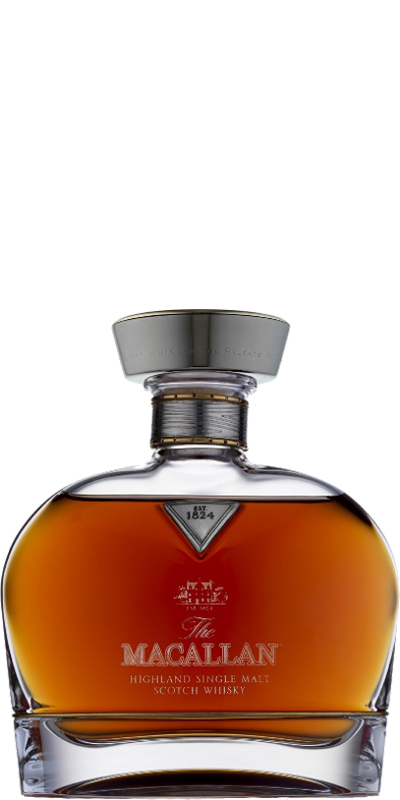 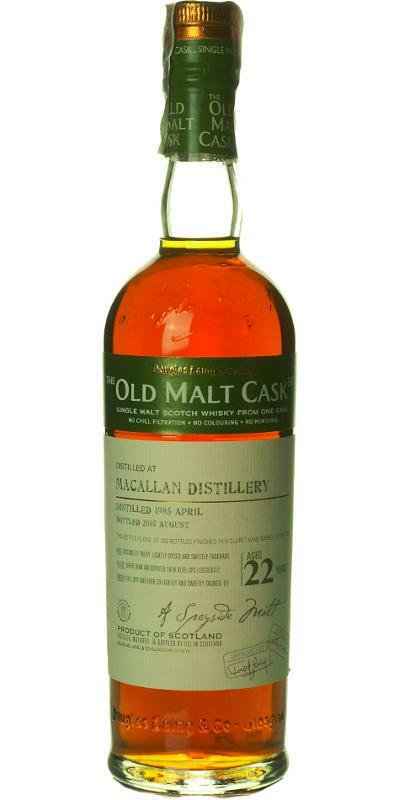 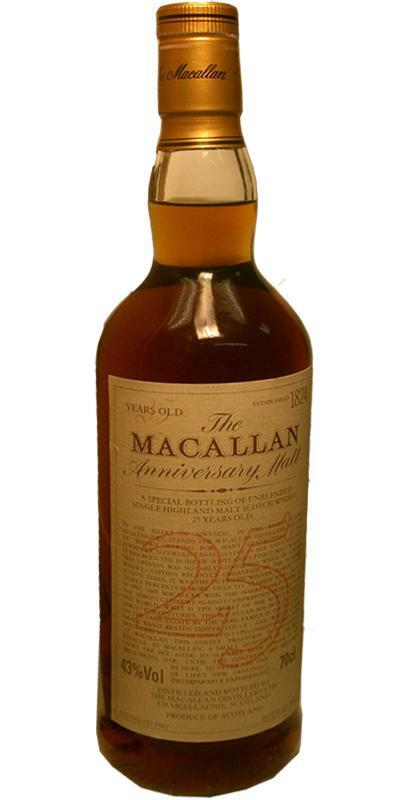 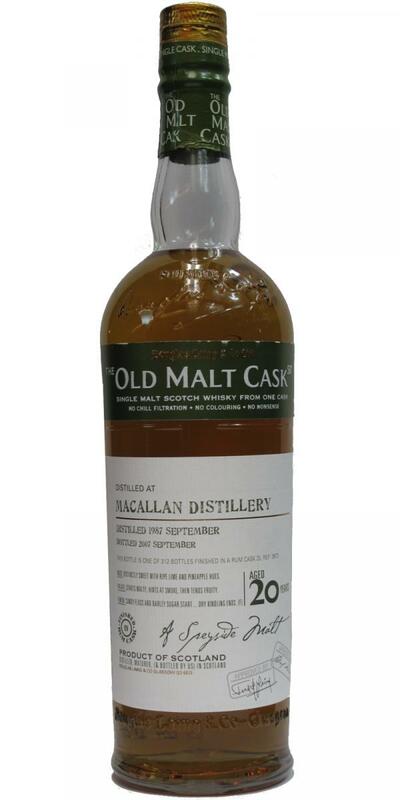 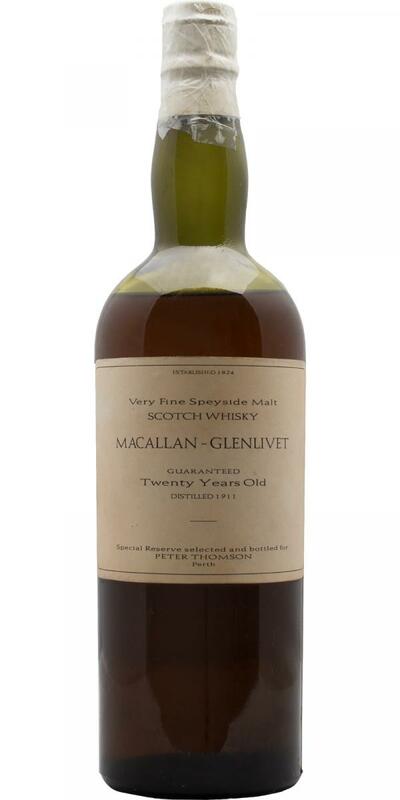 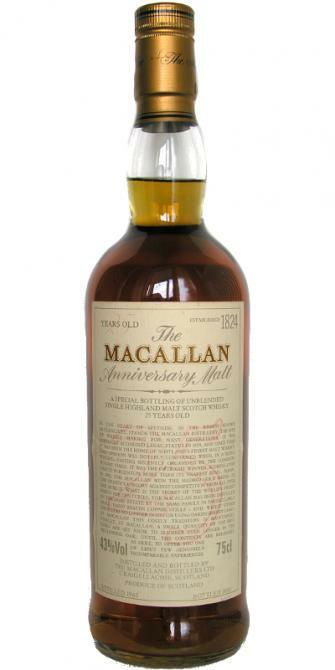 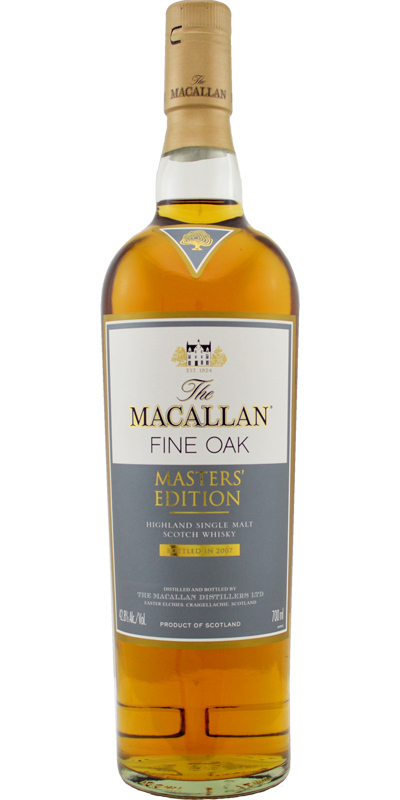 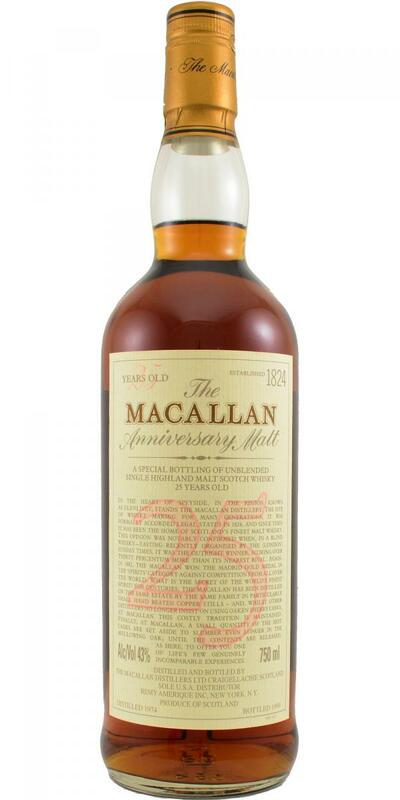 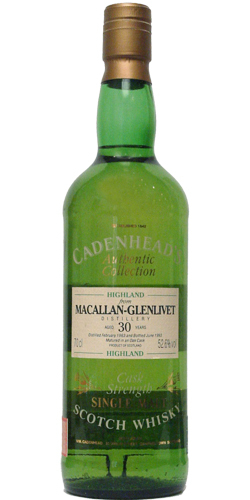 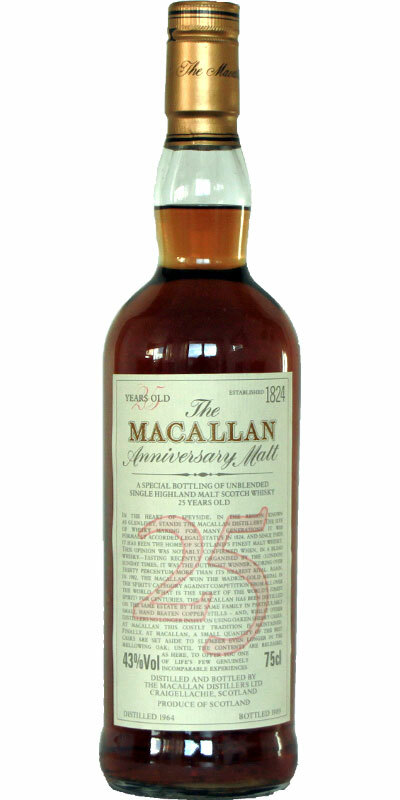 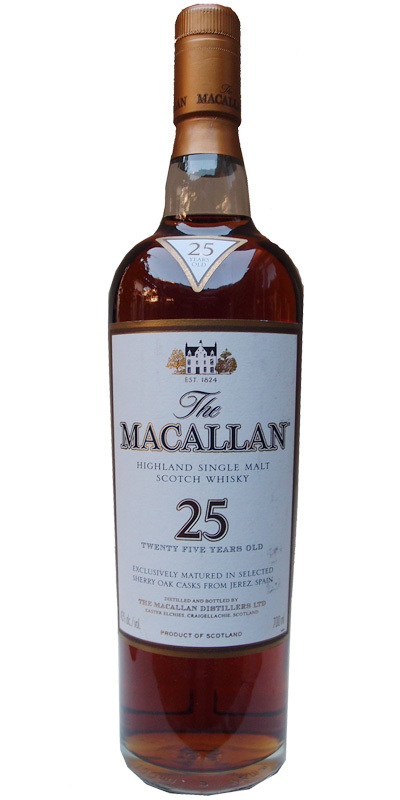 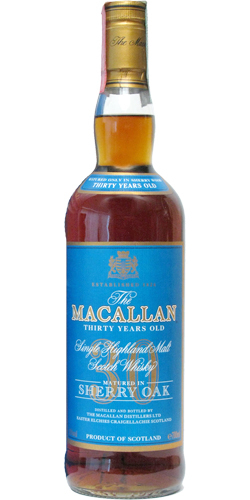 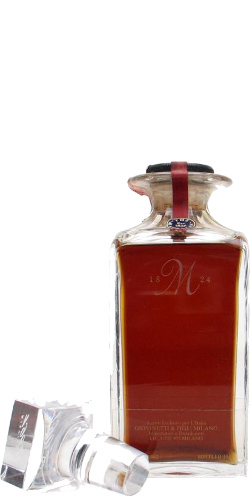 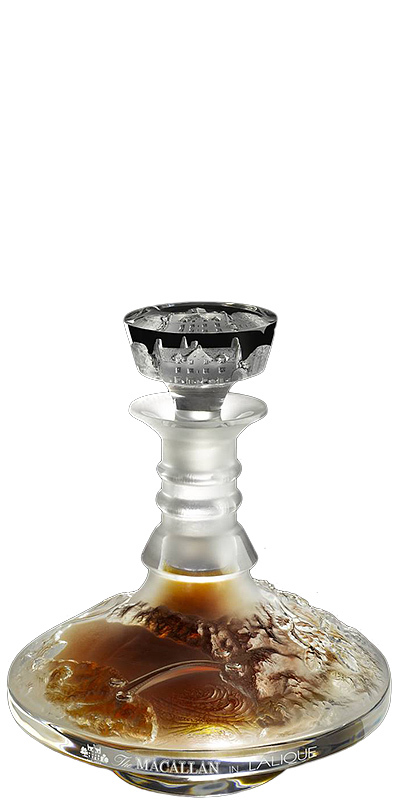 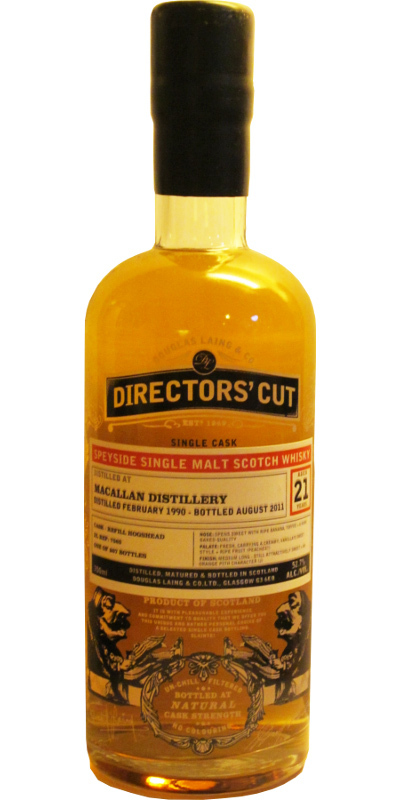 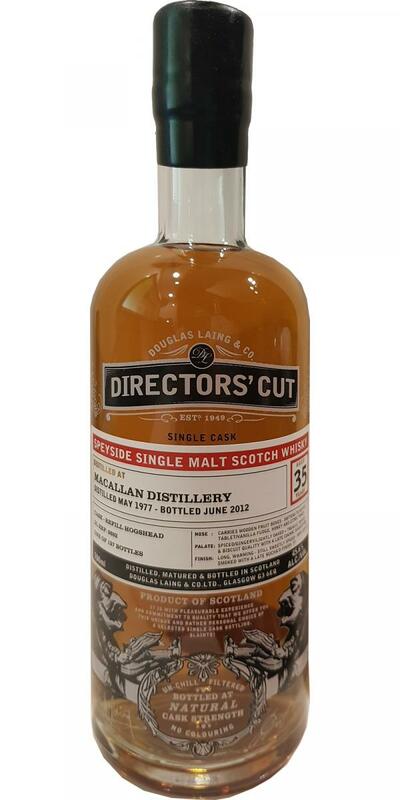 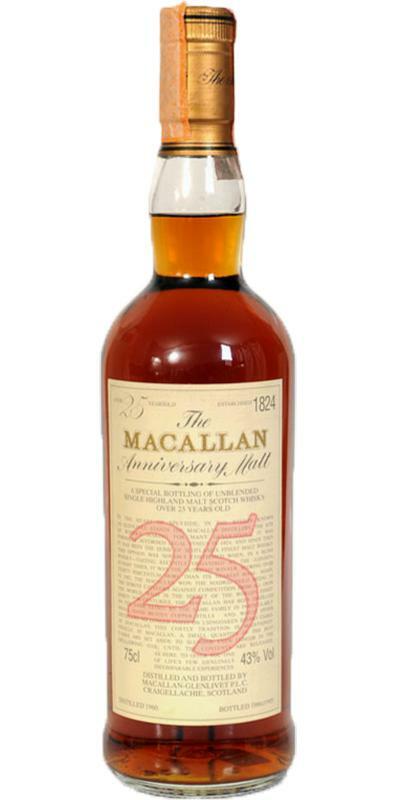 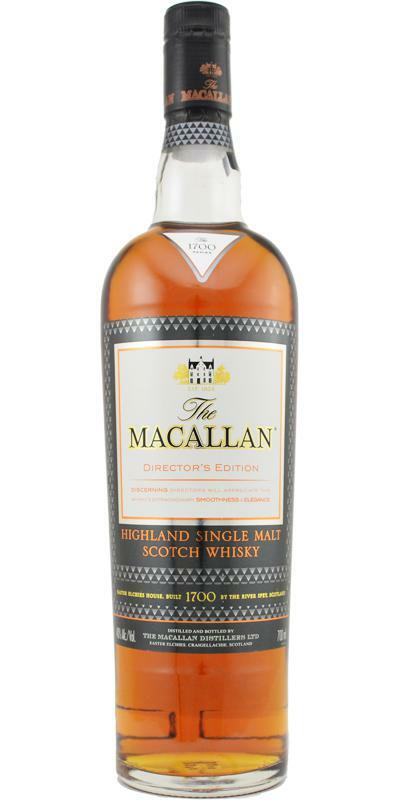 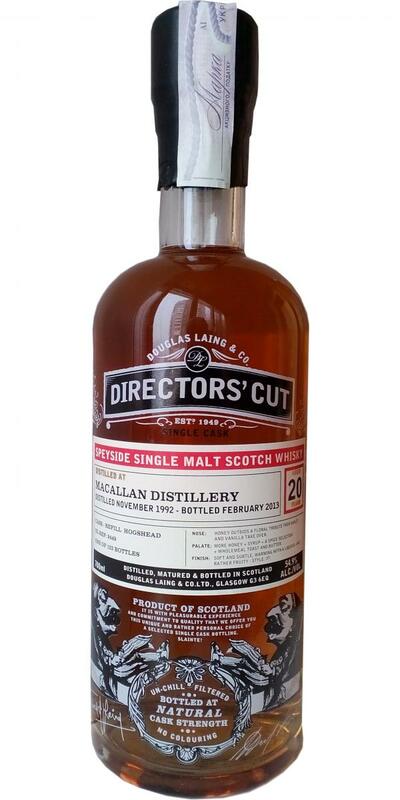 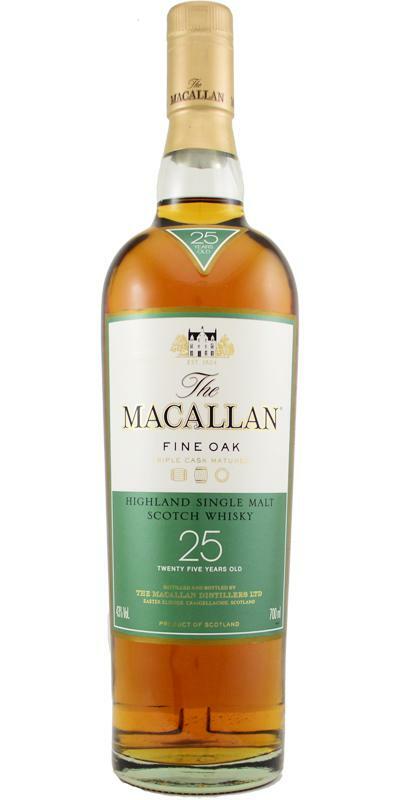 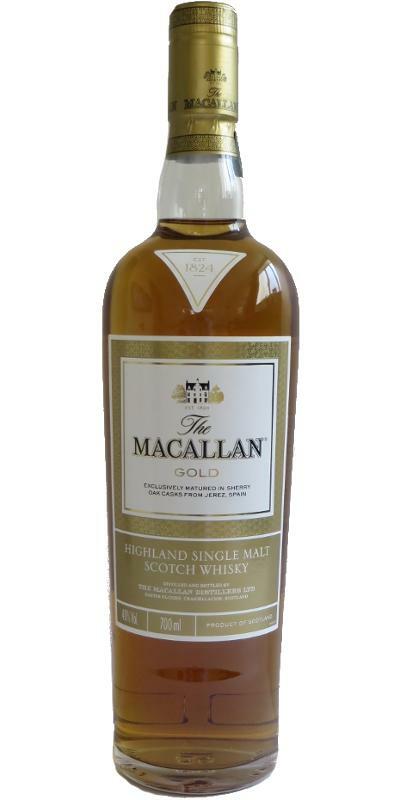 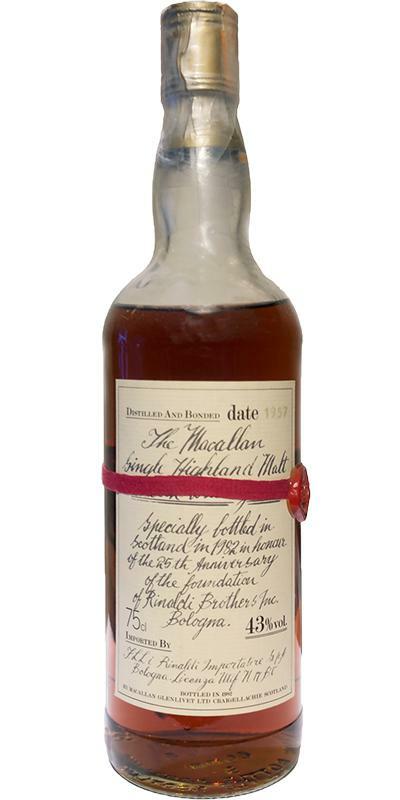 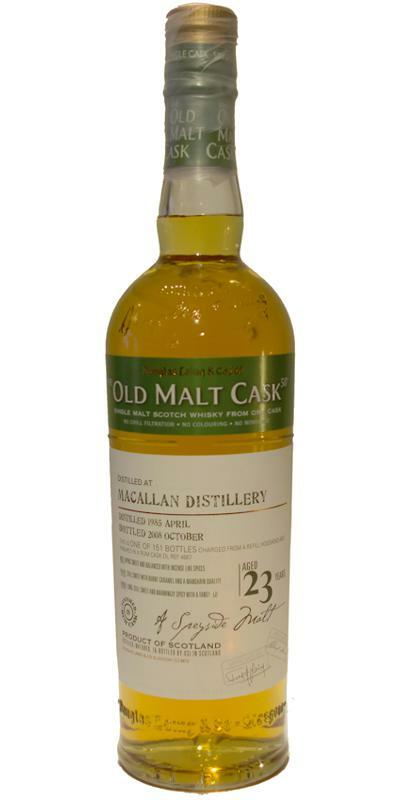 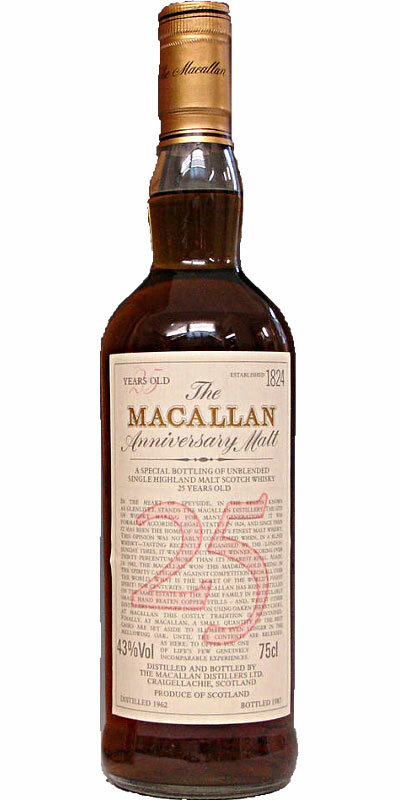 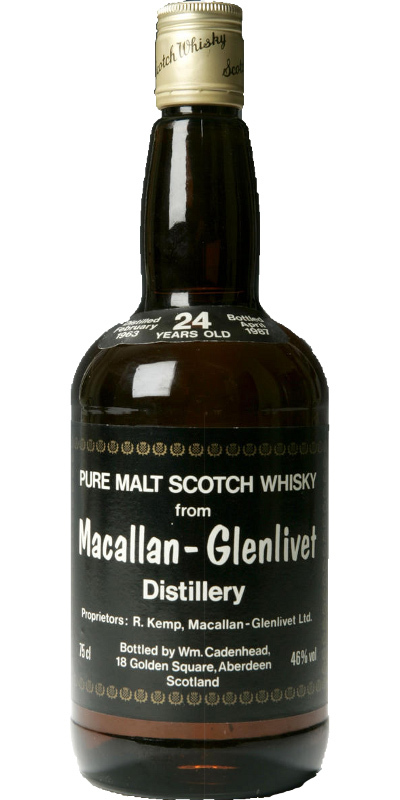 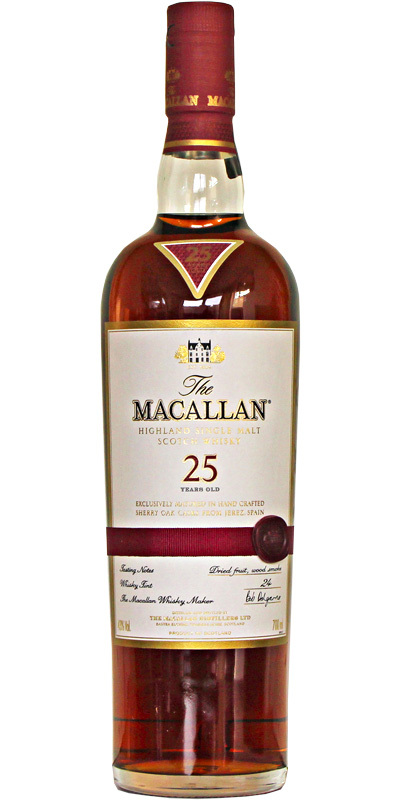 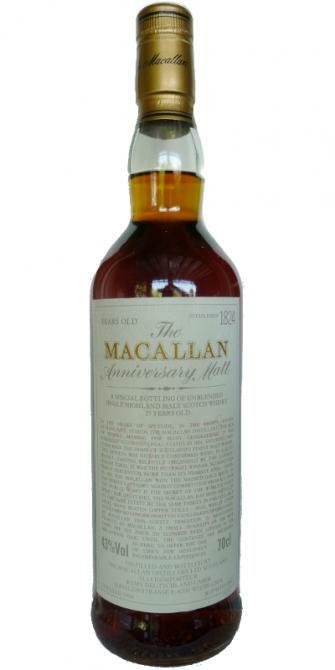 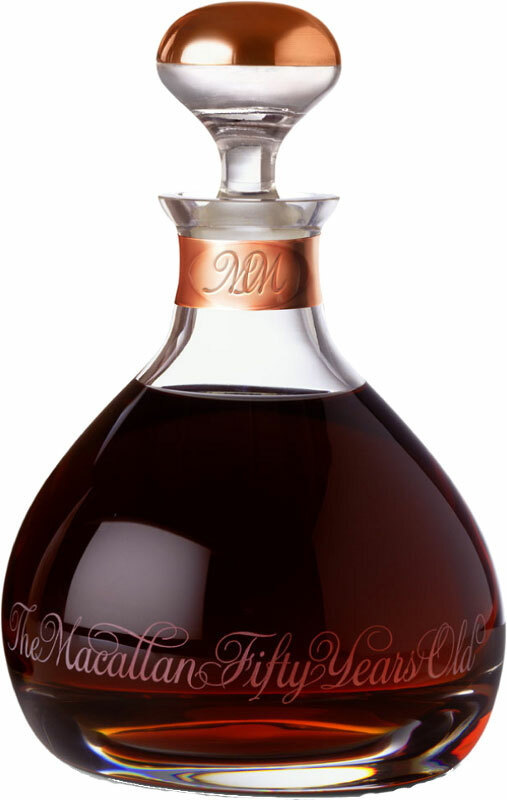 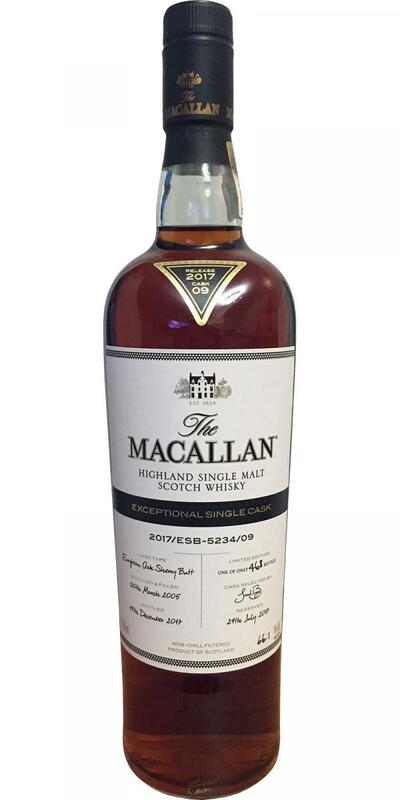 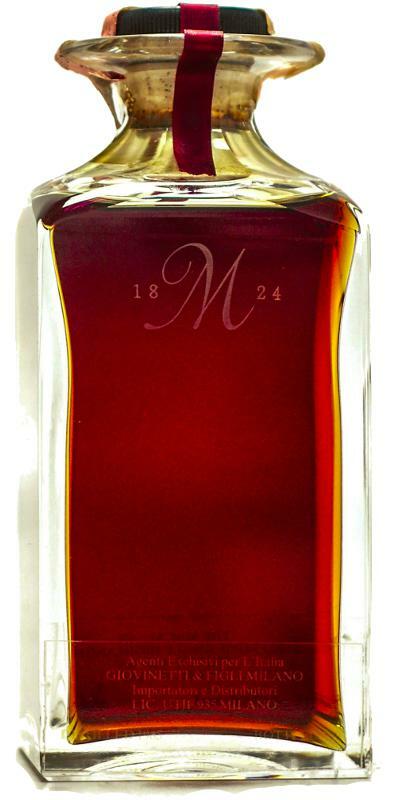 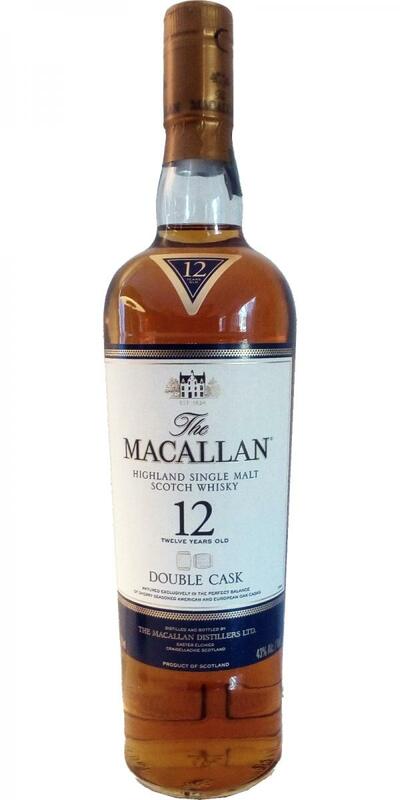 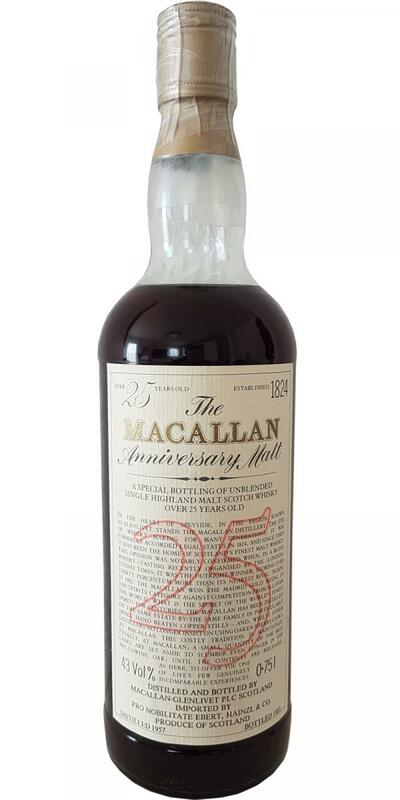 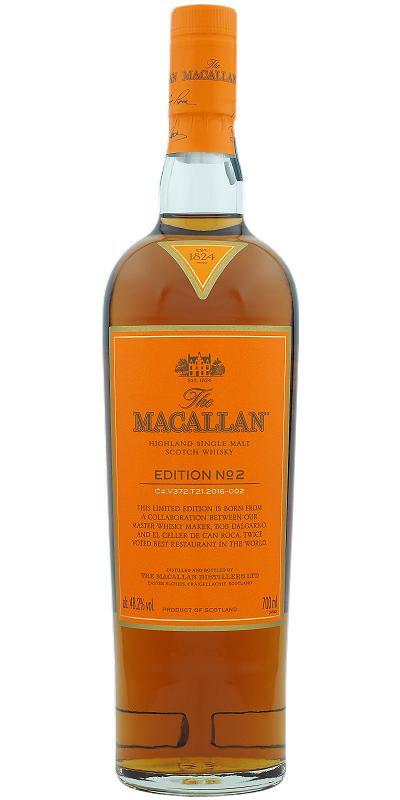 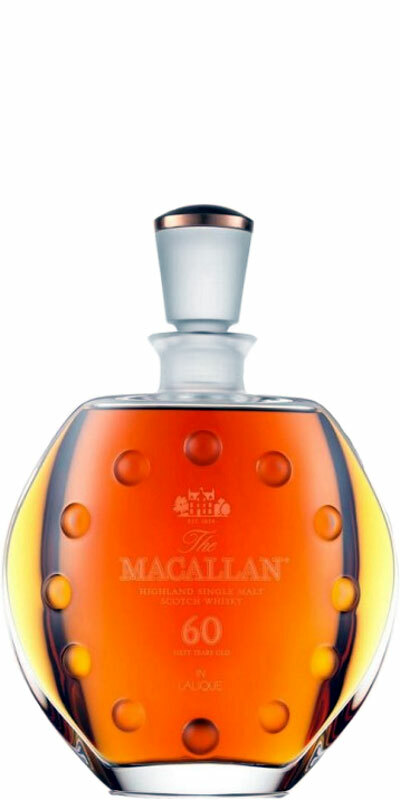 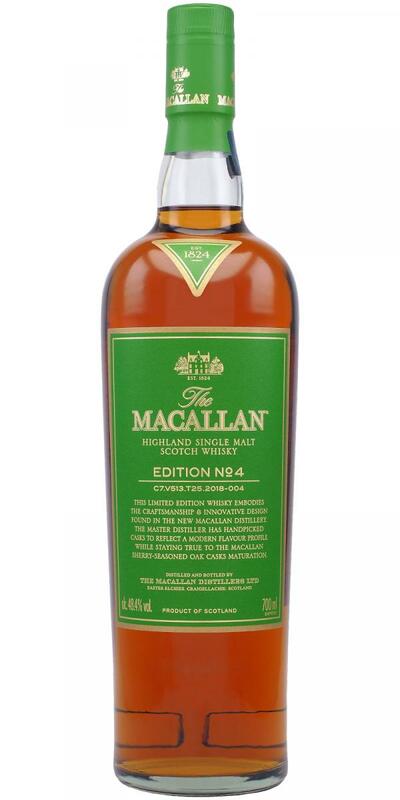 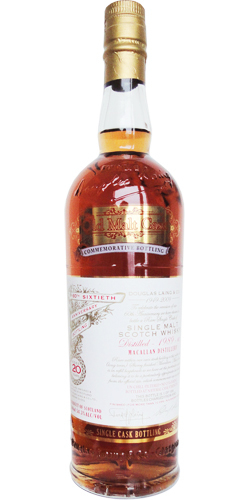 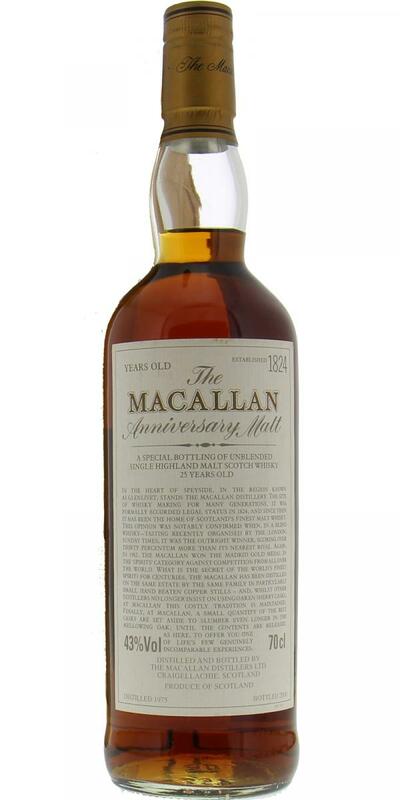 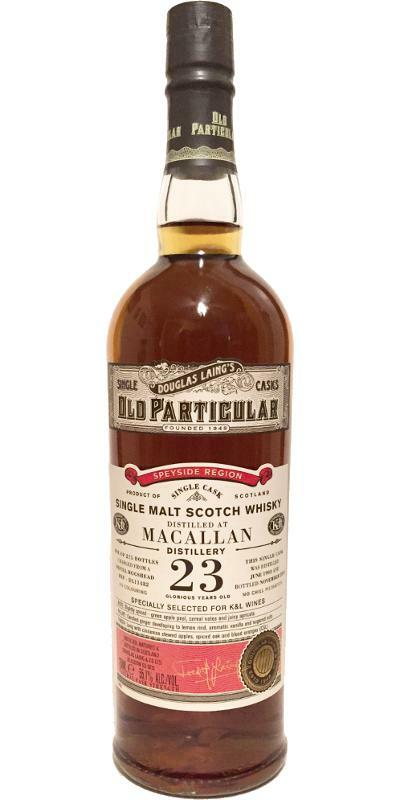 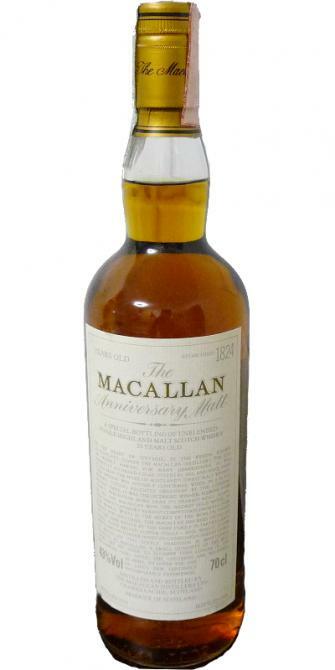 Macallan 25-year-old M decanter - First Edition 25 43.0 % Vol. 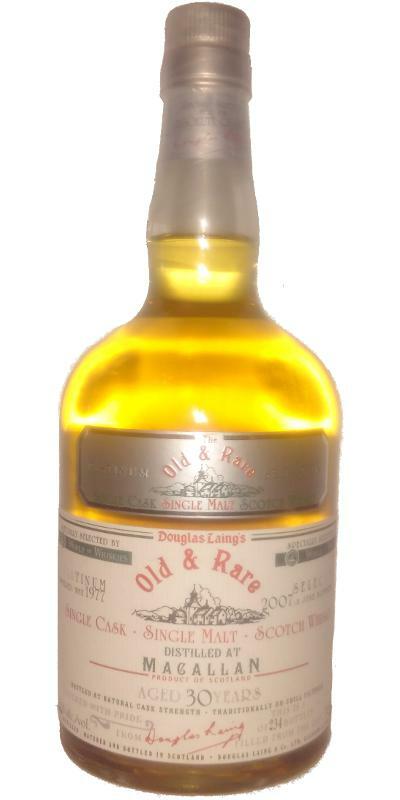 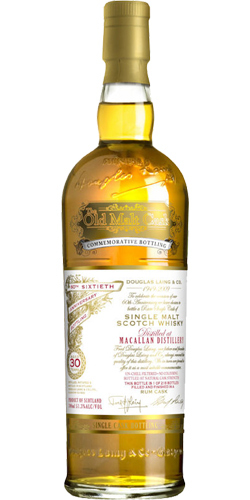 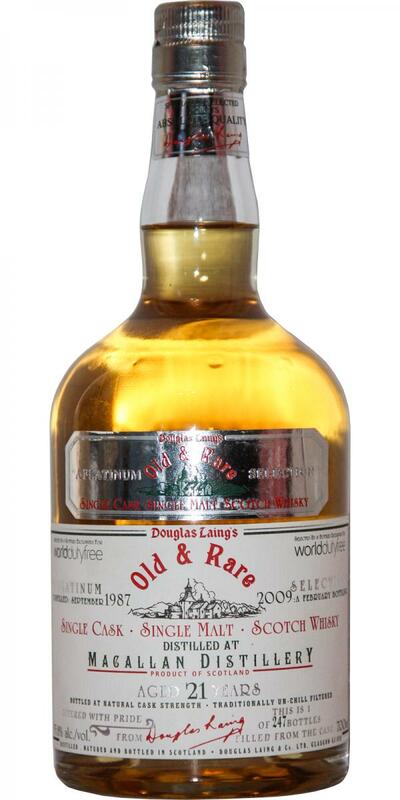 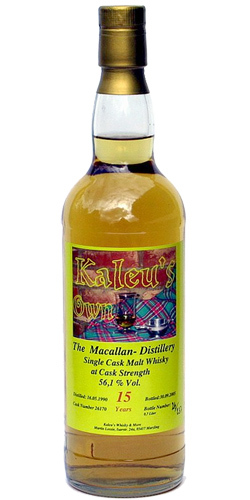 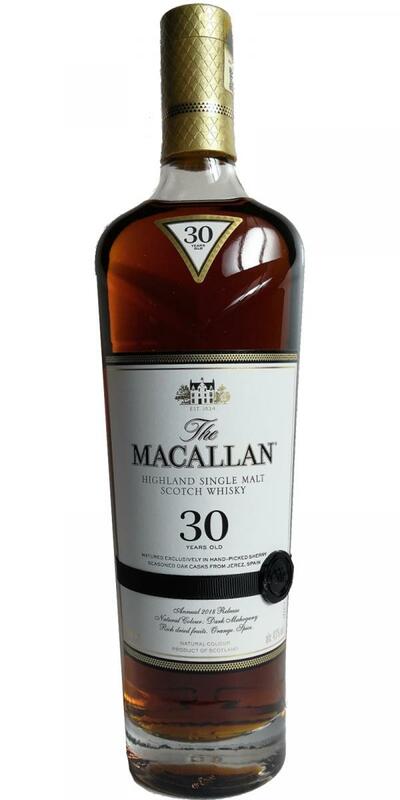 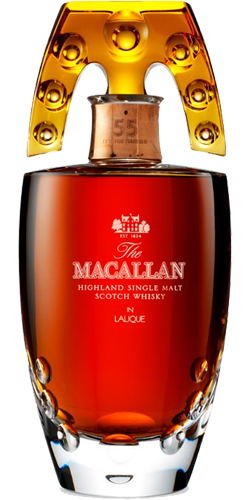 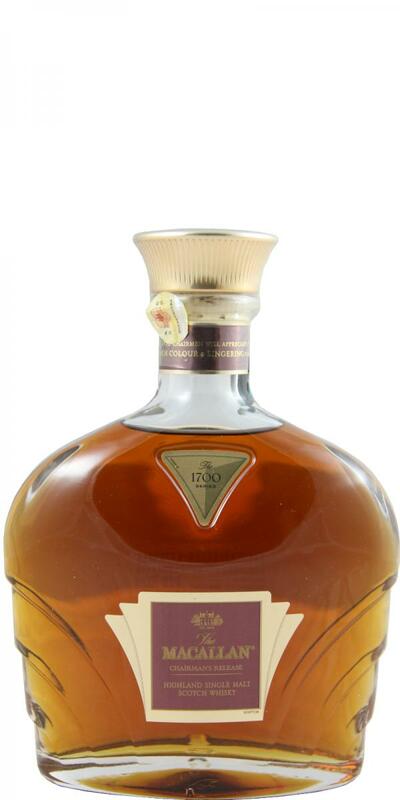 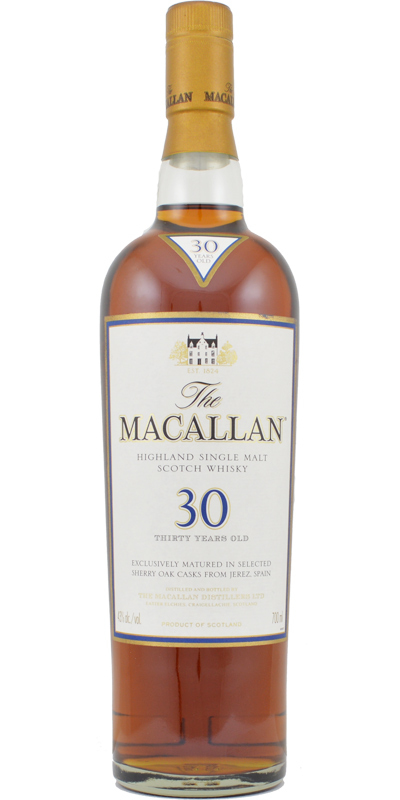 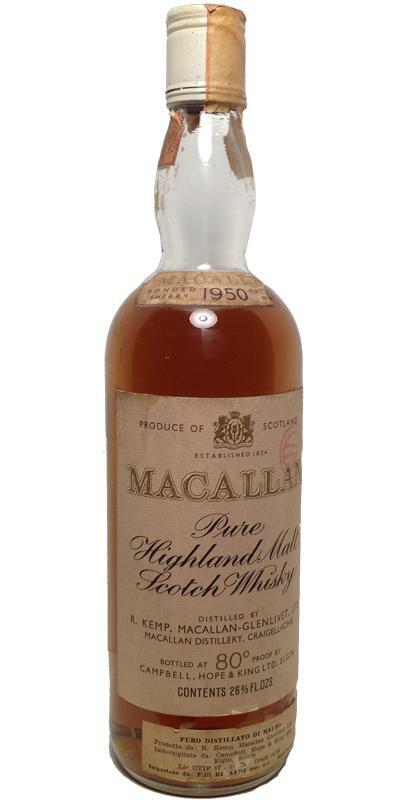 Macallan 50-year-old - Lalique 50 46.0 % Vol. 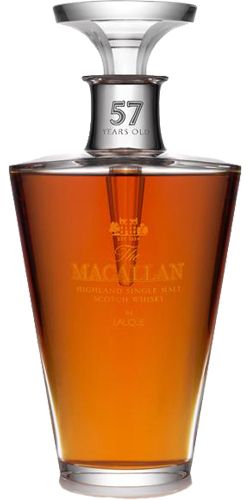 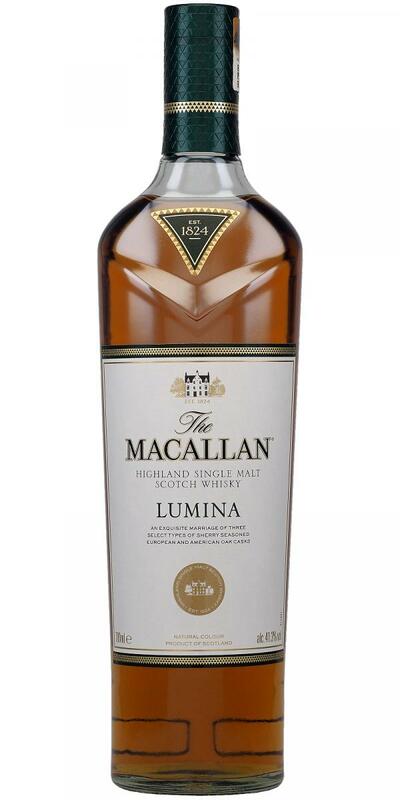 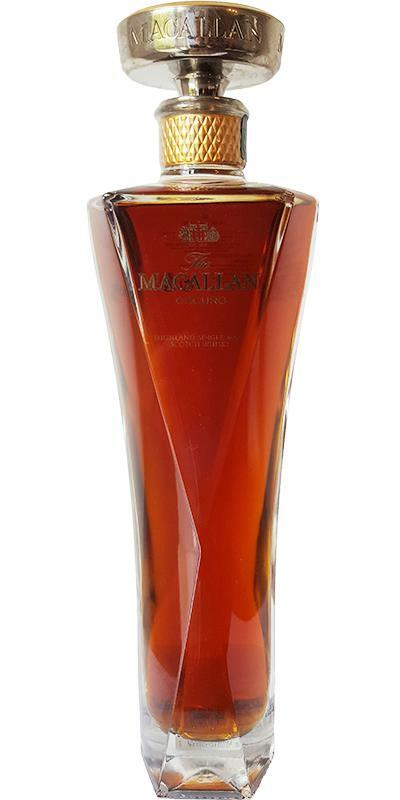 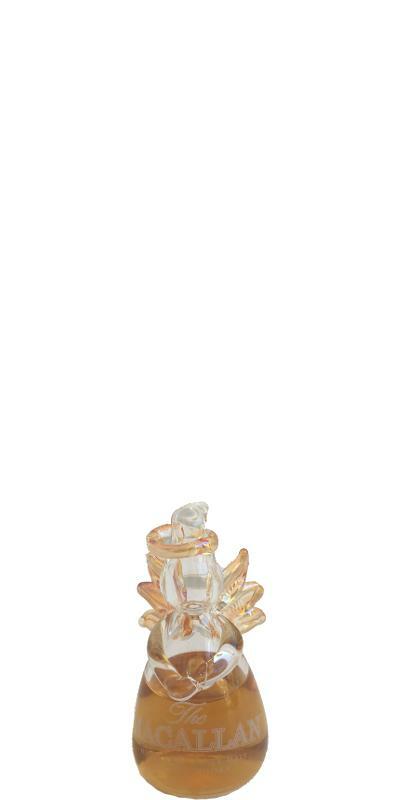 Macallan 72-year-old - Lalique 72 42.0 % Vol. 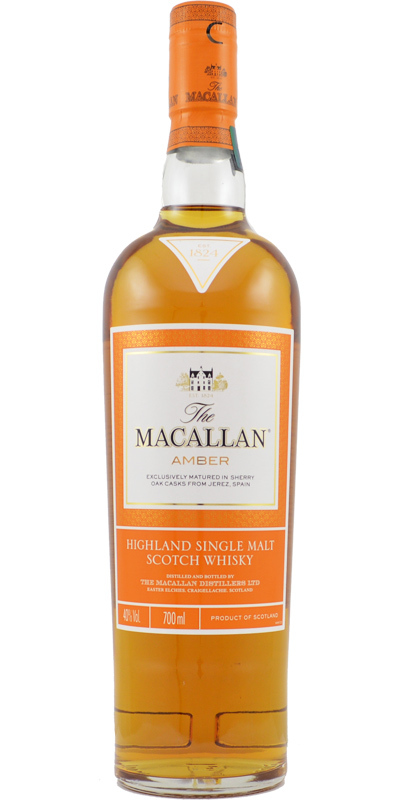 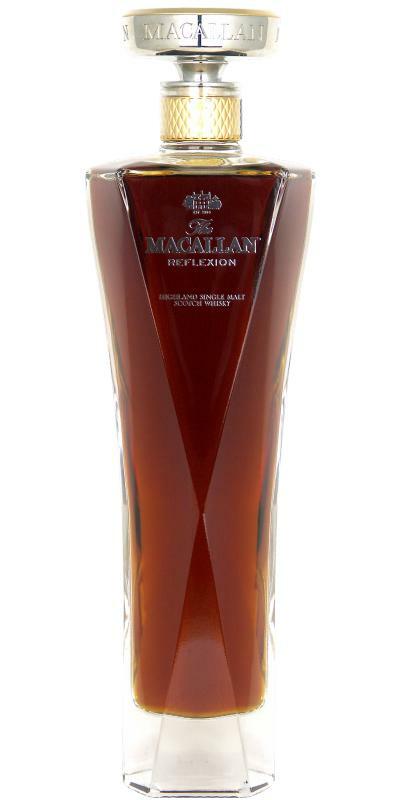 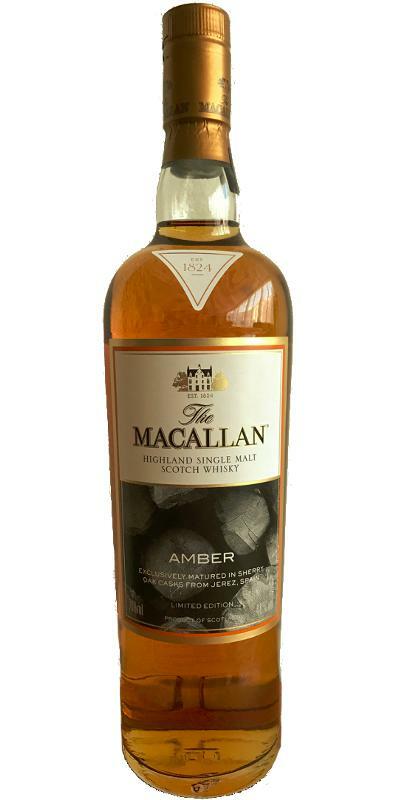 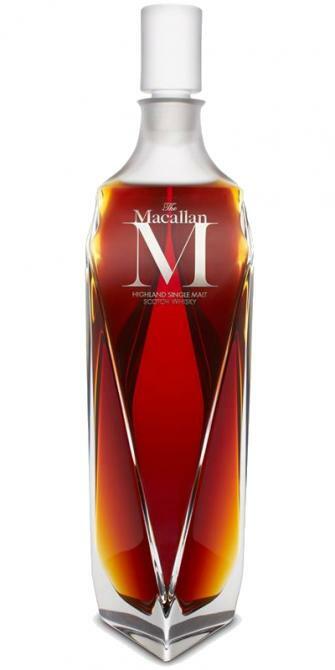 Macallan Amber - Gift Set 40.0 % Vol. 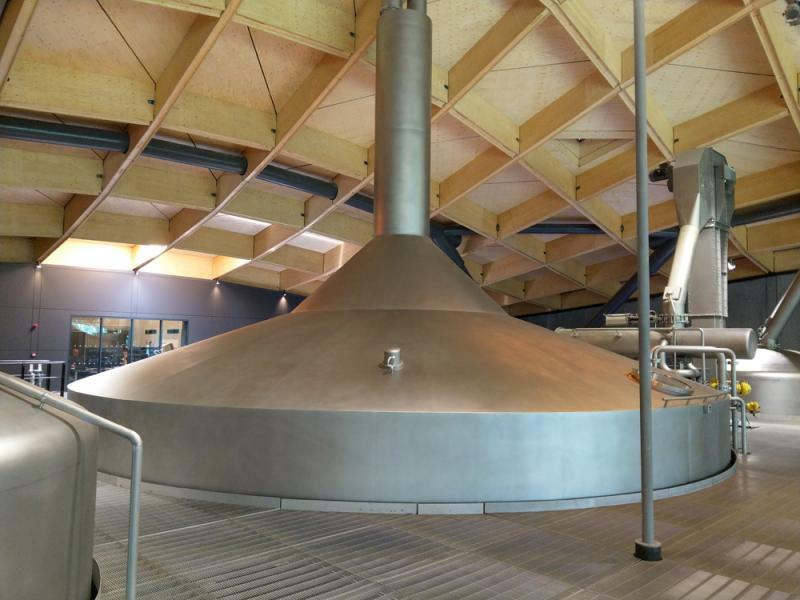 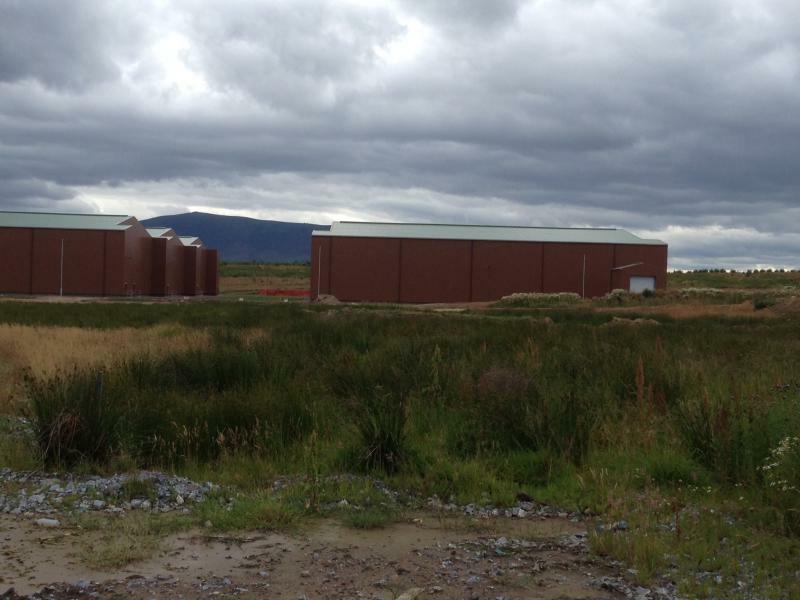 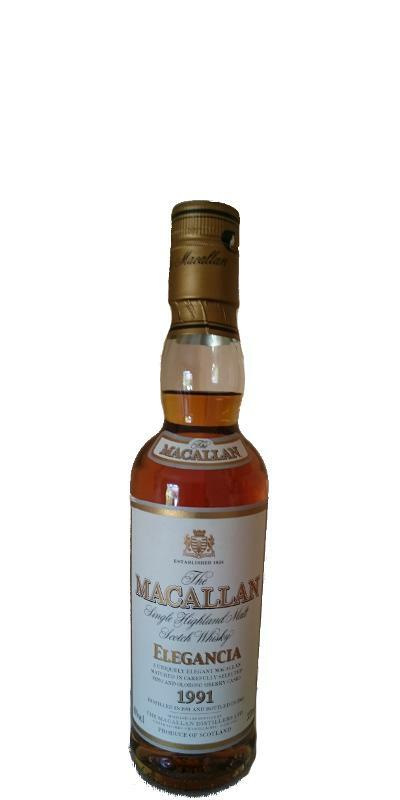 Macallan Angel's share 10 40.0 % Vol. 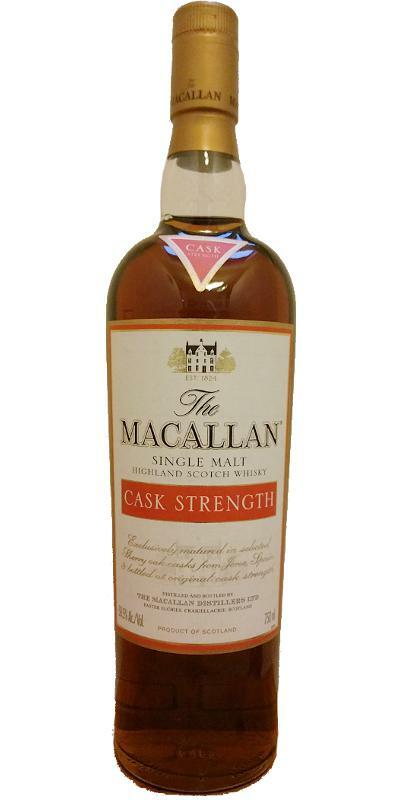 Macallan Cask Strength 57.8 % Vol. 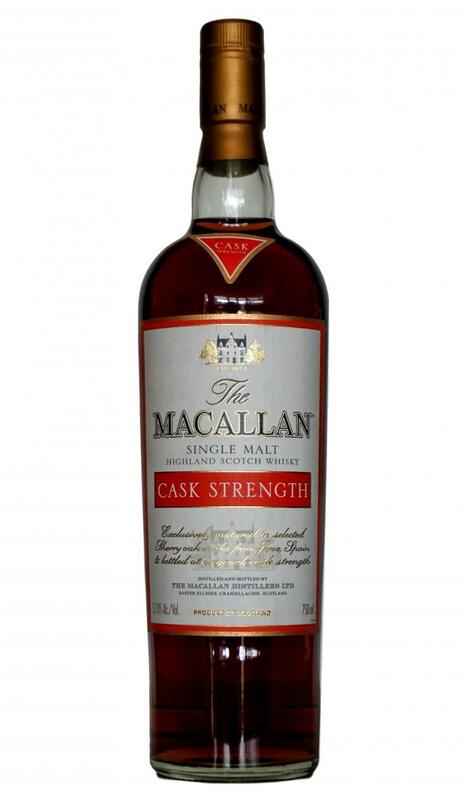 Macallan Cask Strength 60.7 % Vol. 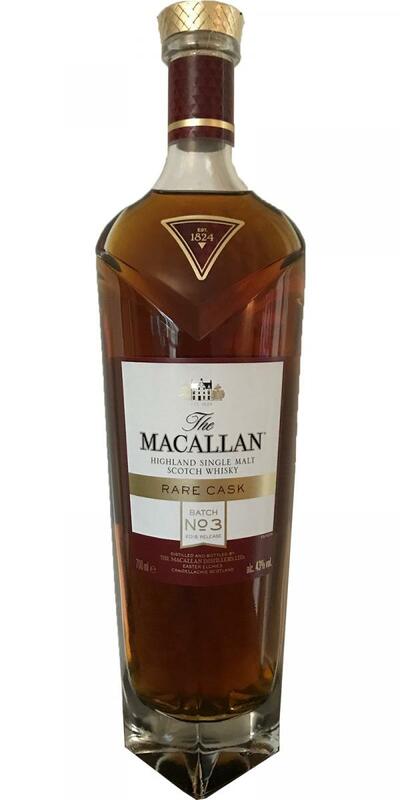 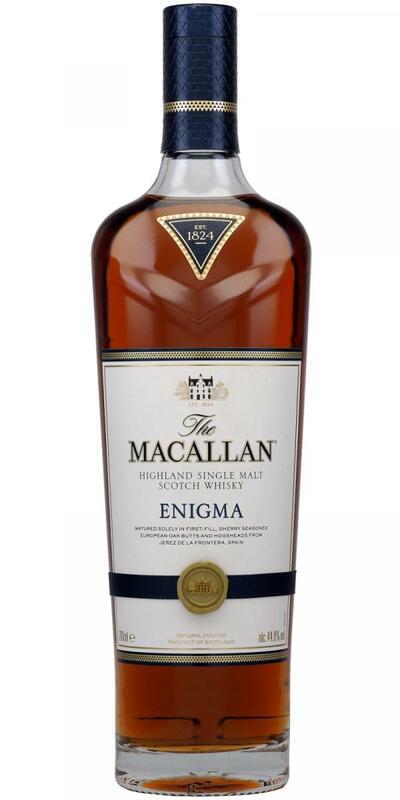 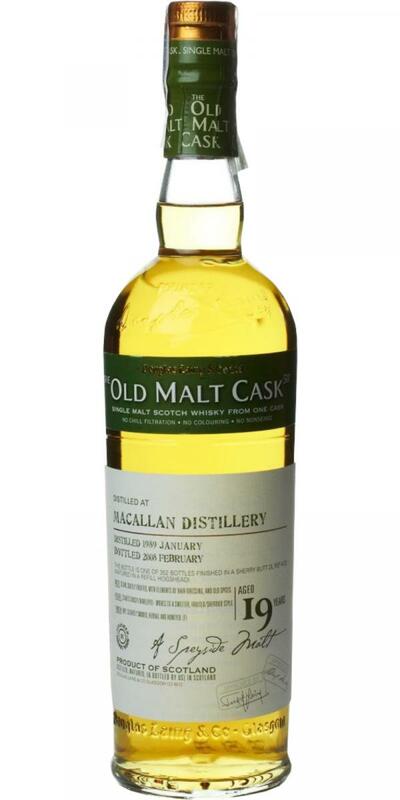 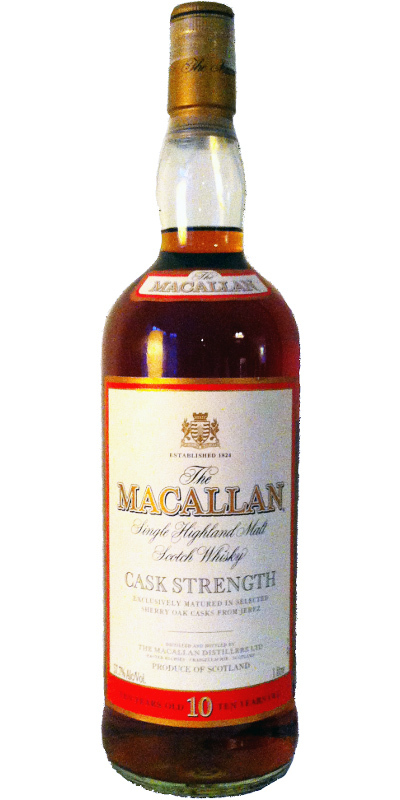 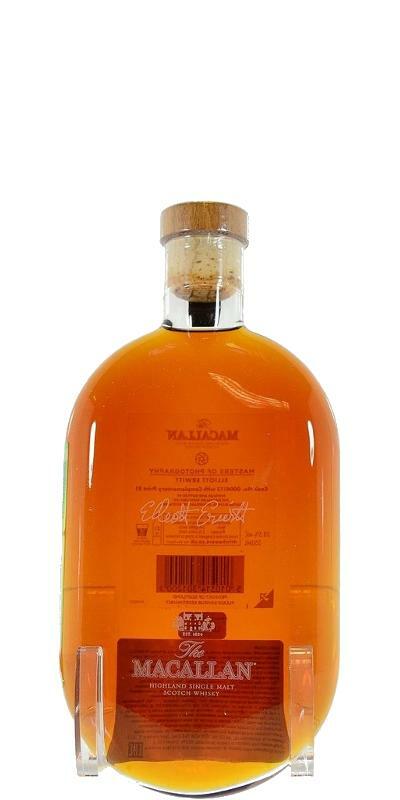 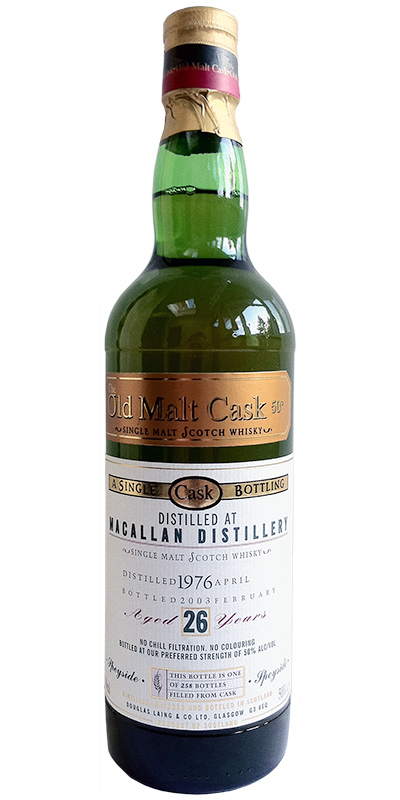 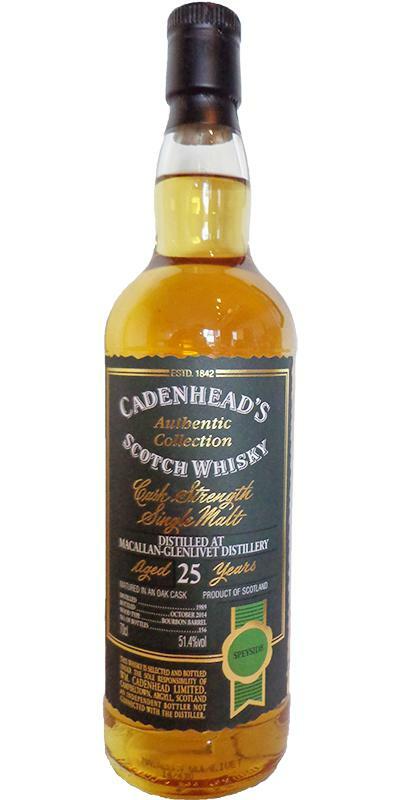 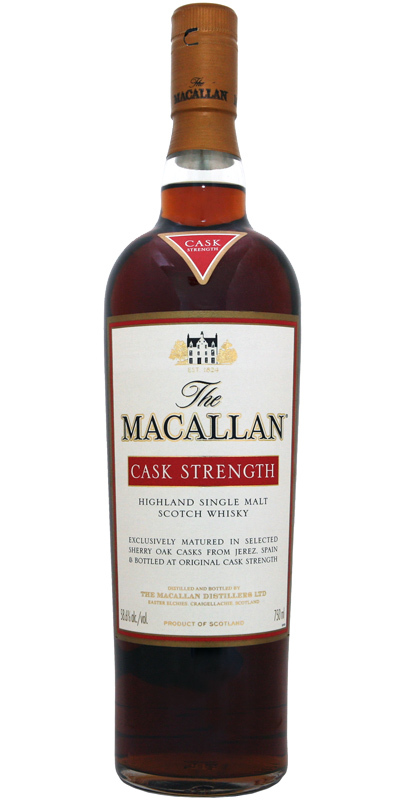 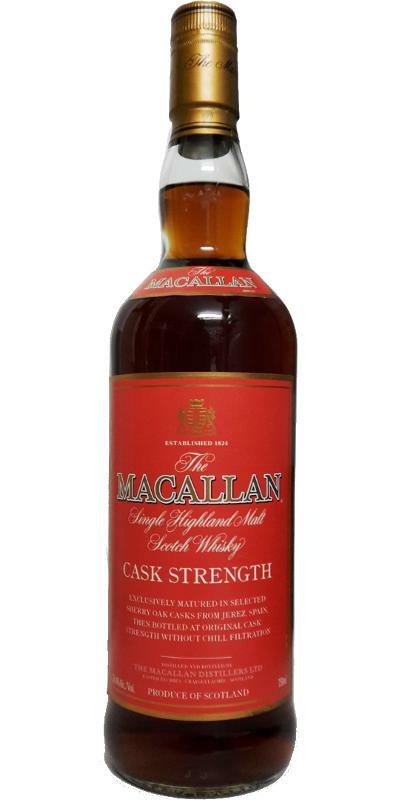 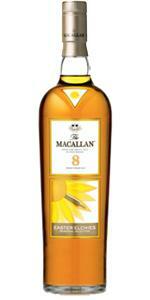 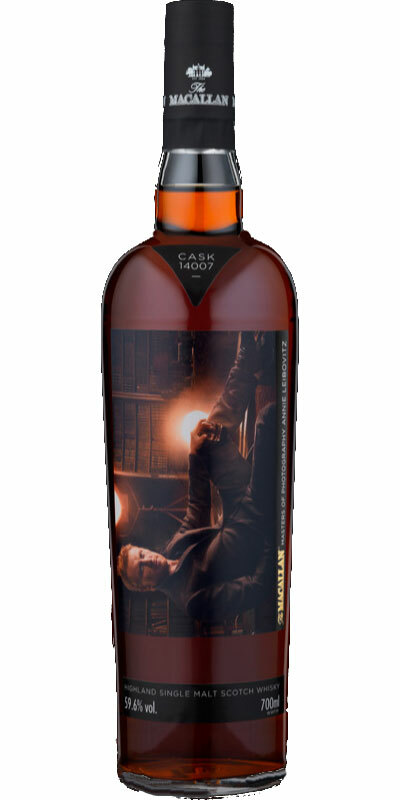 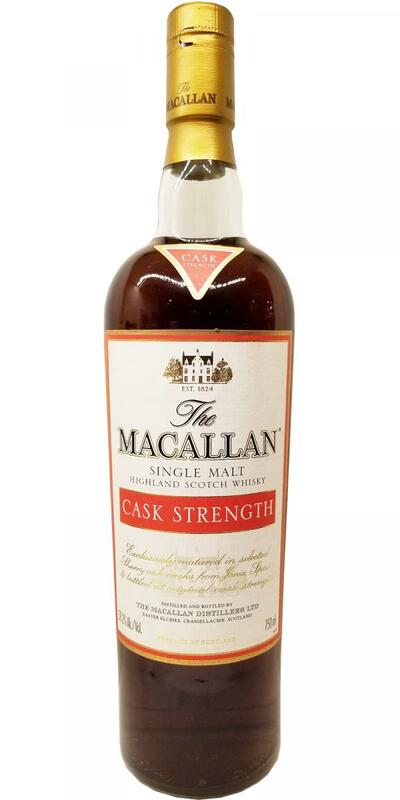 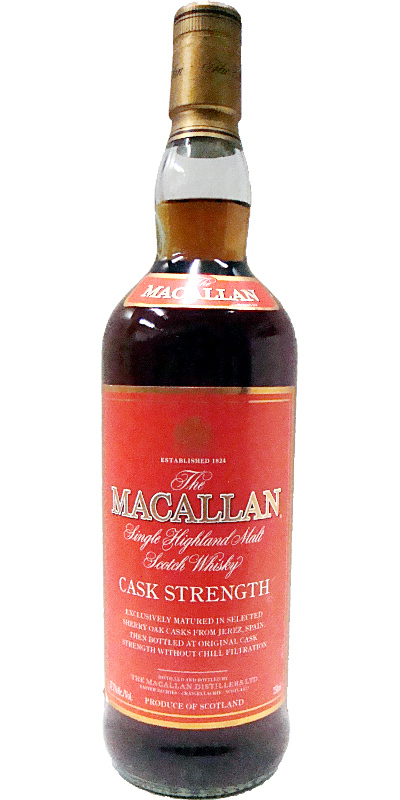 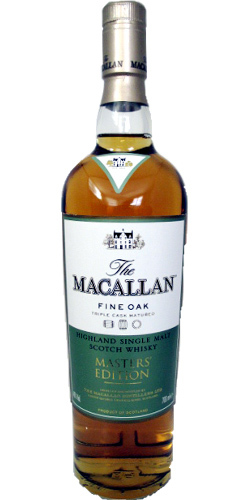 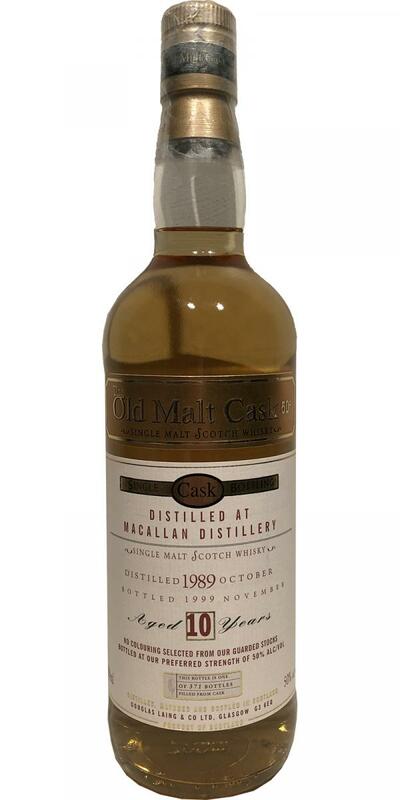 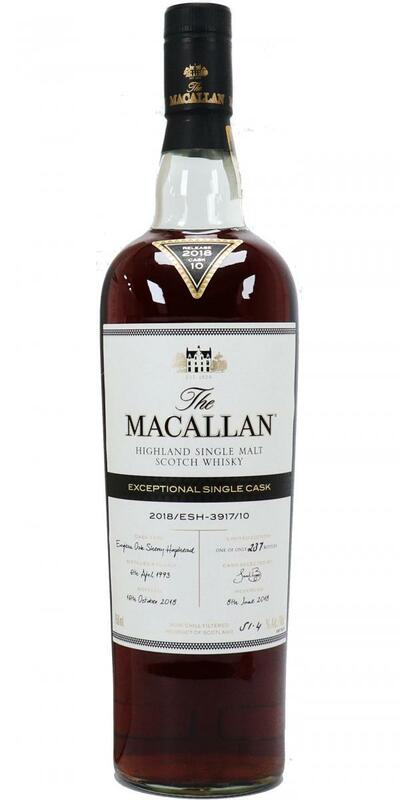 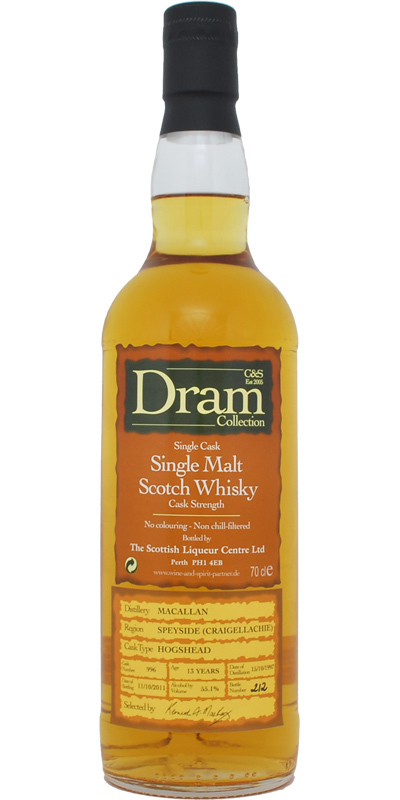 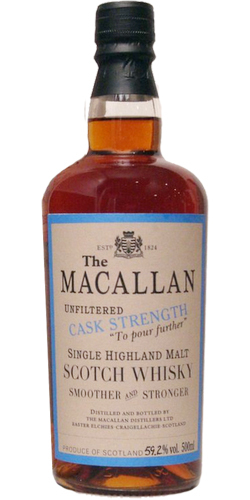 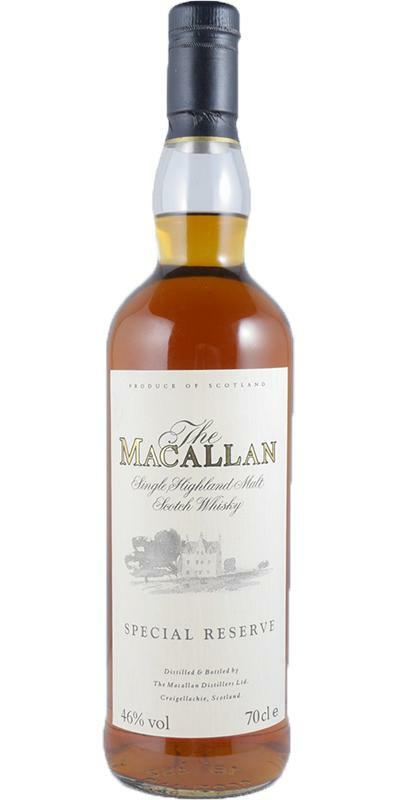 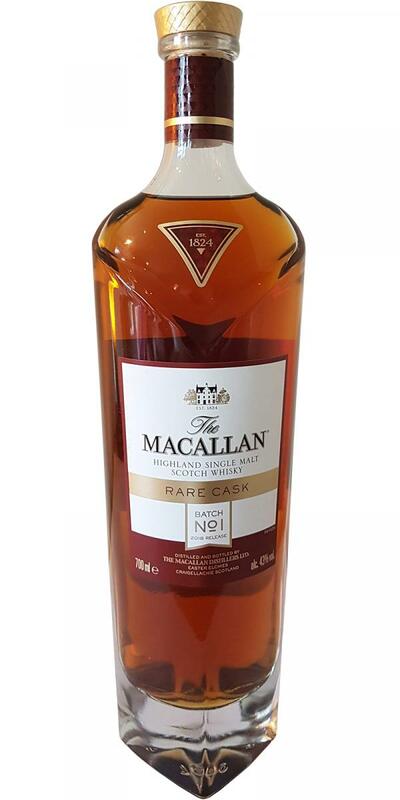 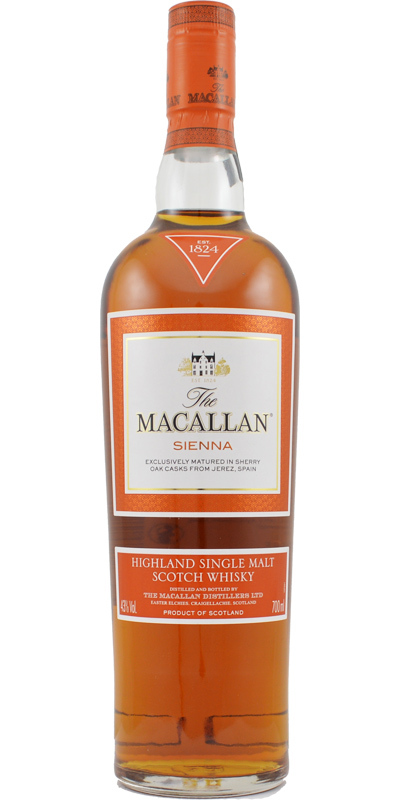 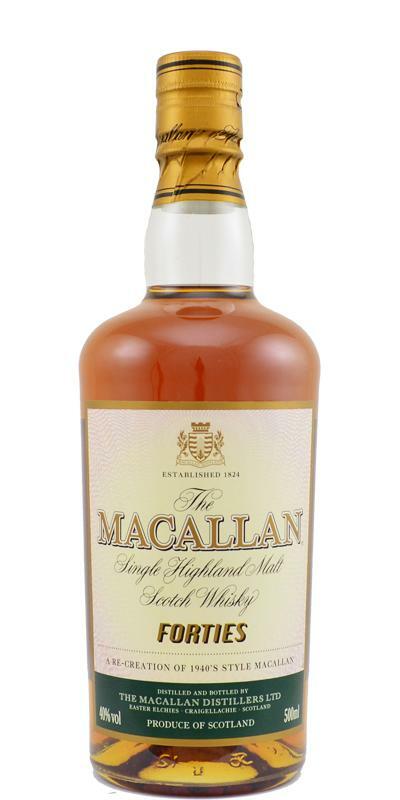 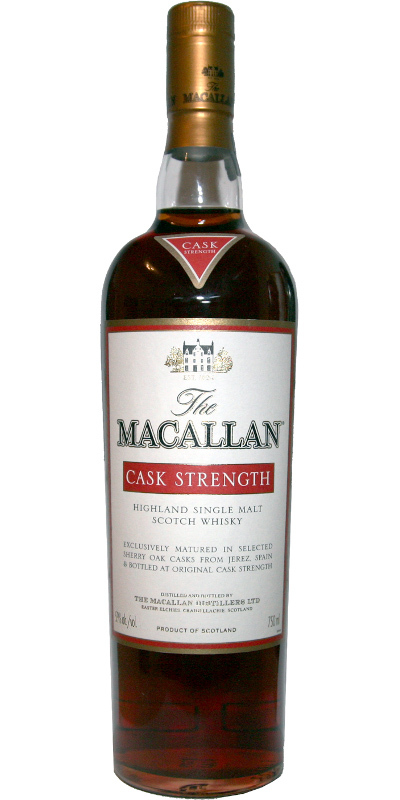 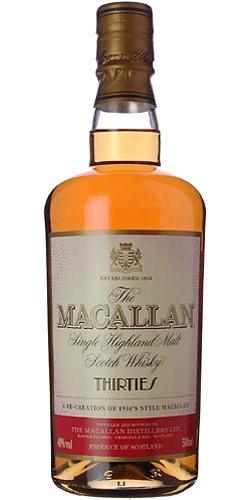 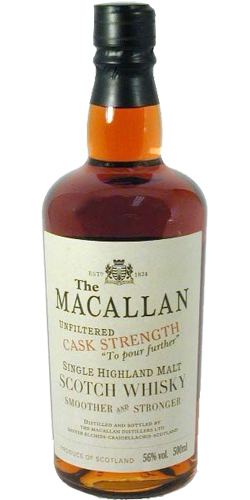 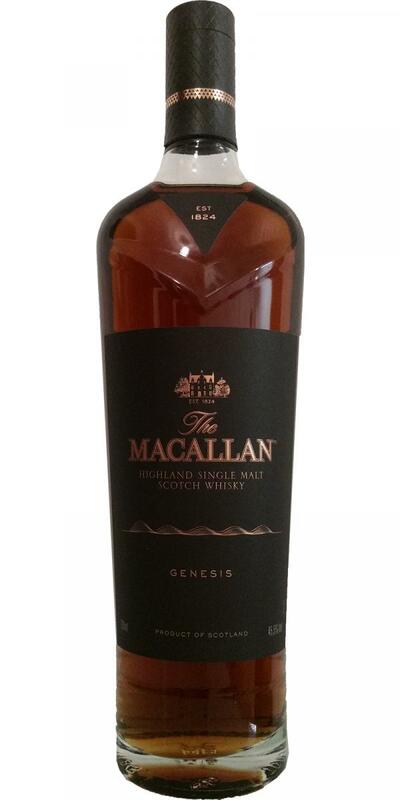 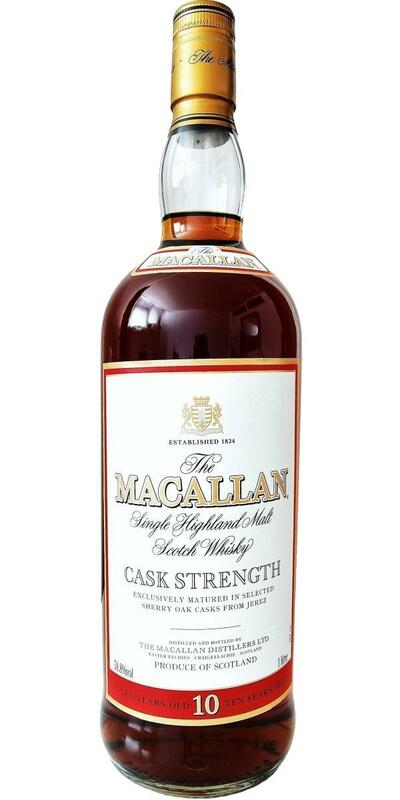 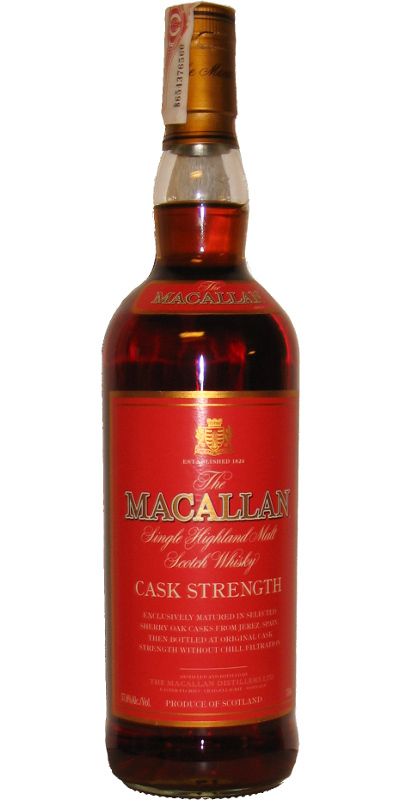 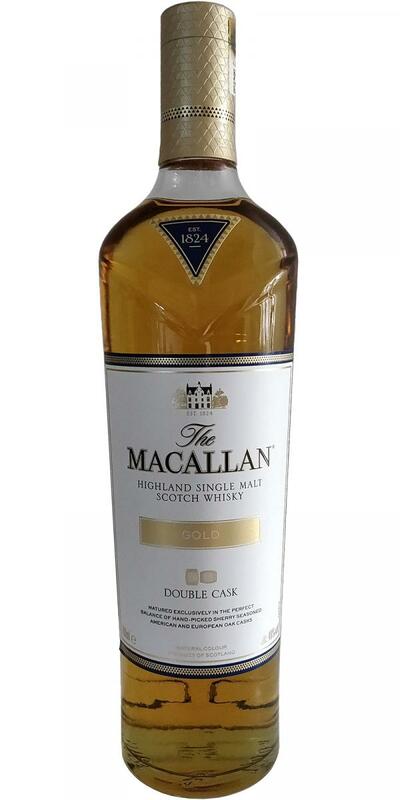 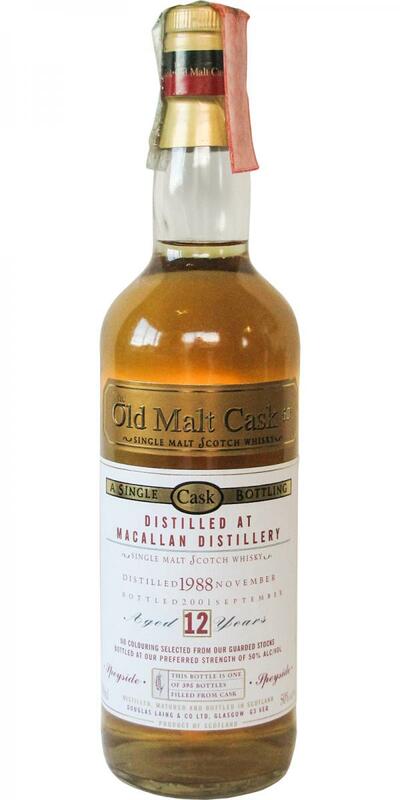 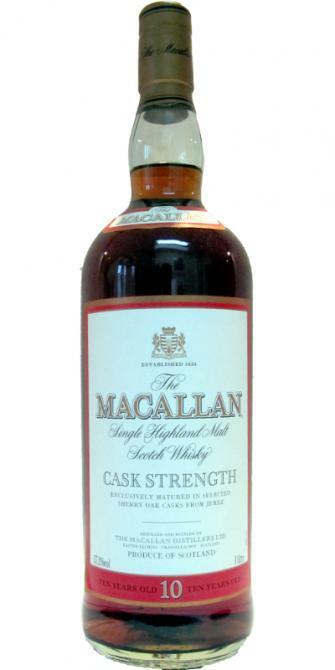 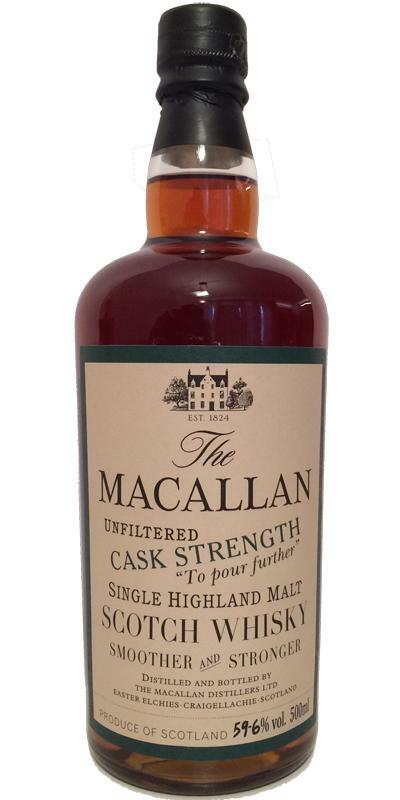 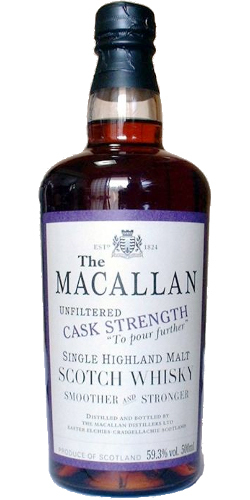 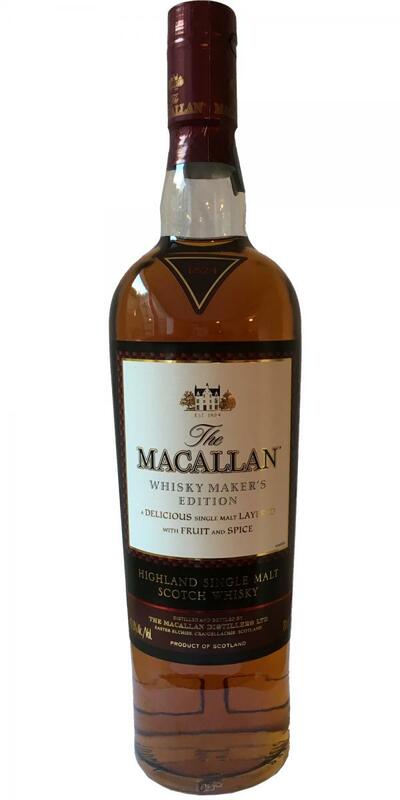 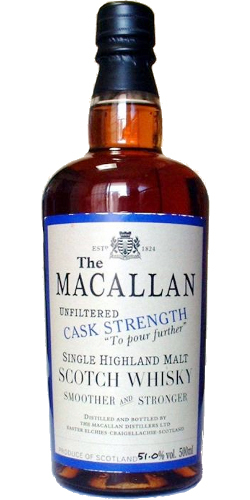 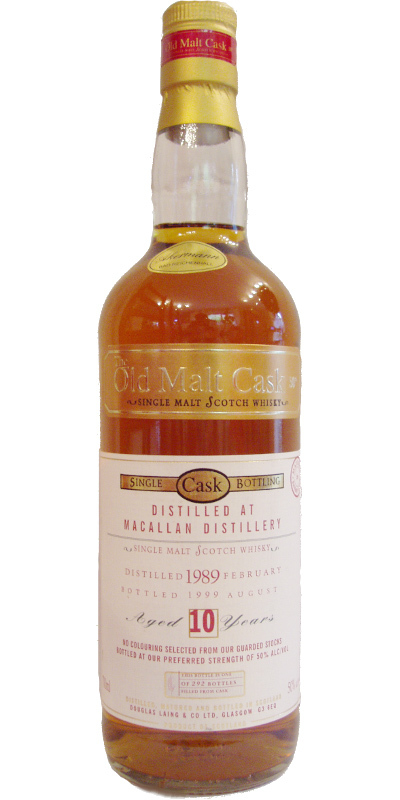 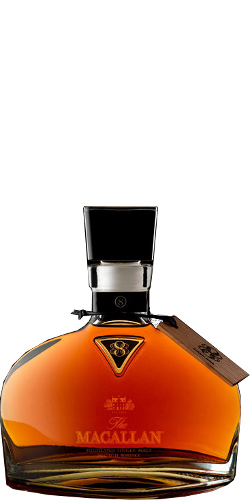 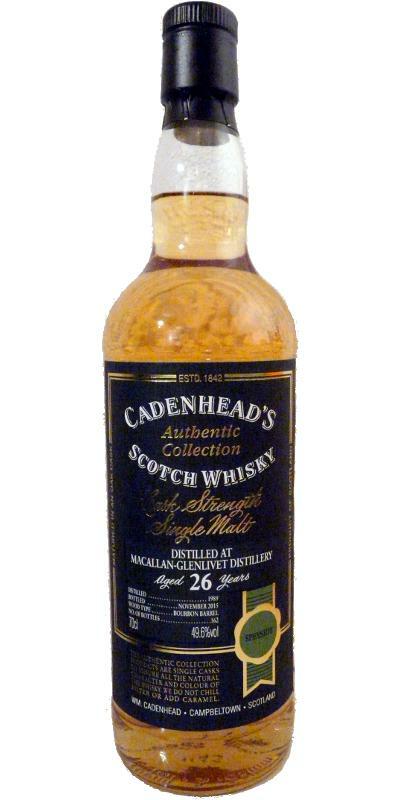 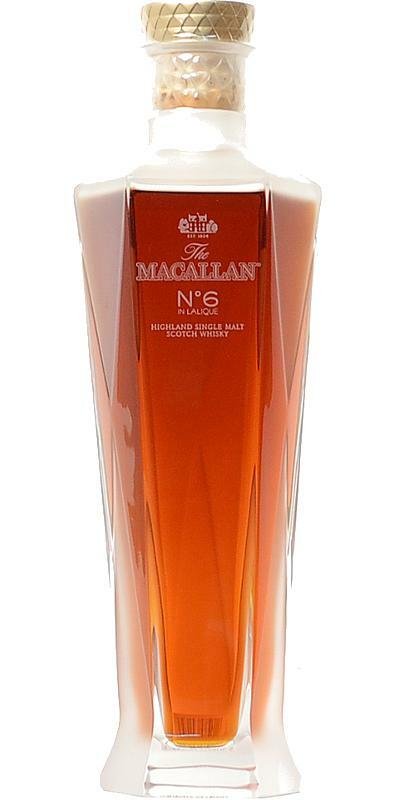 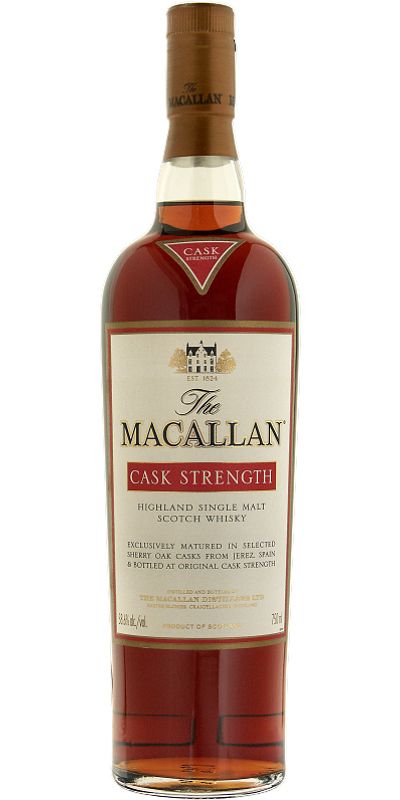 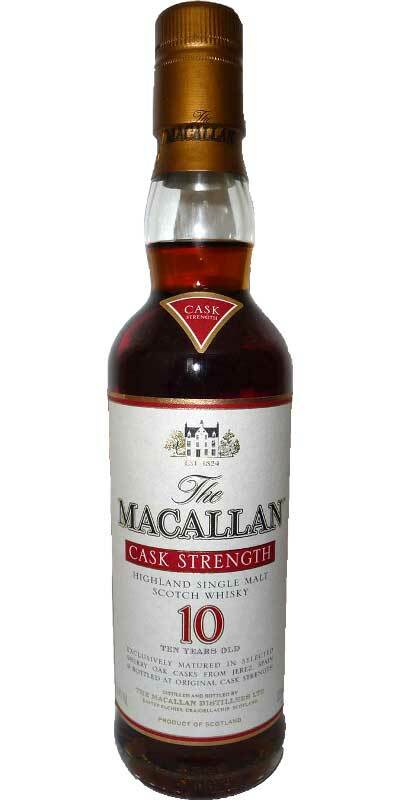 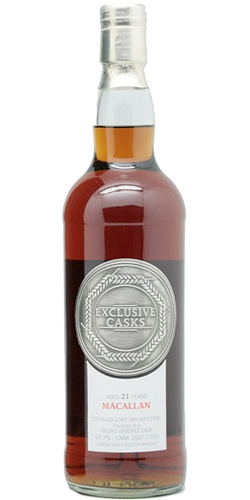 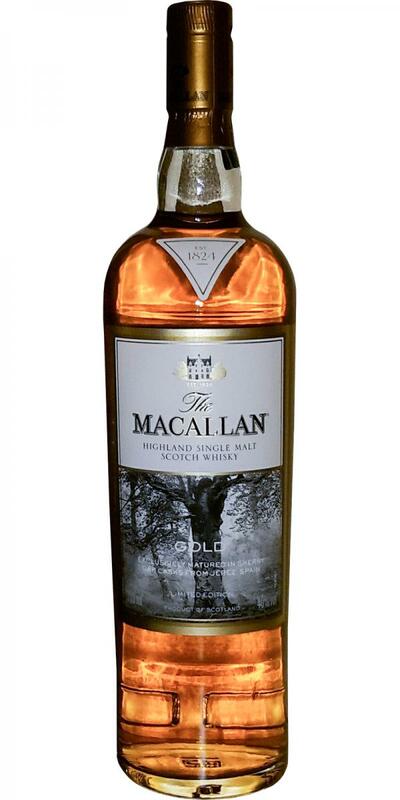 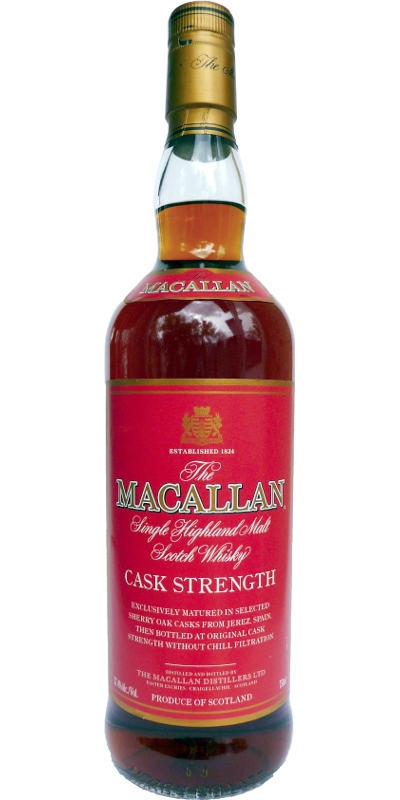 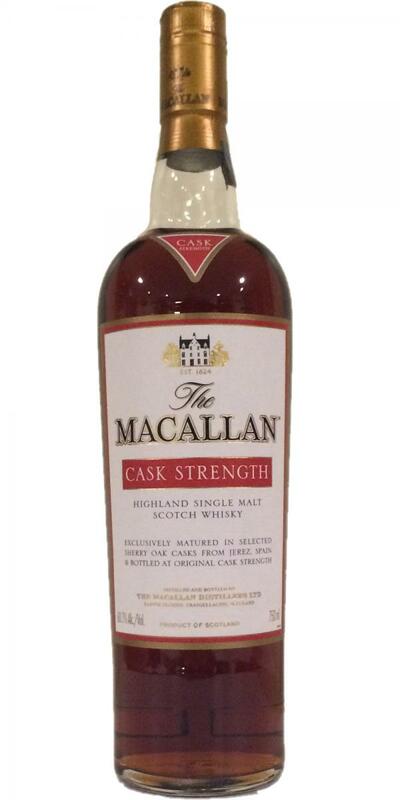 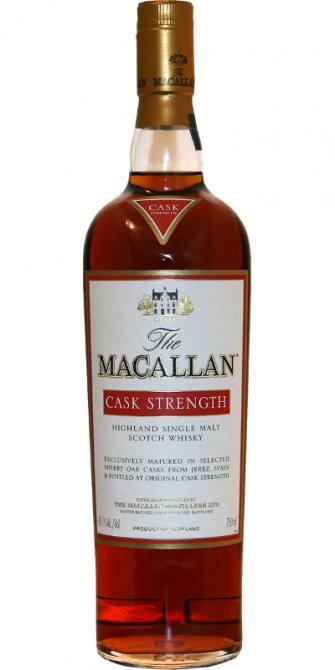 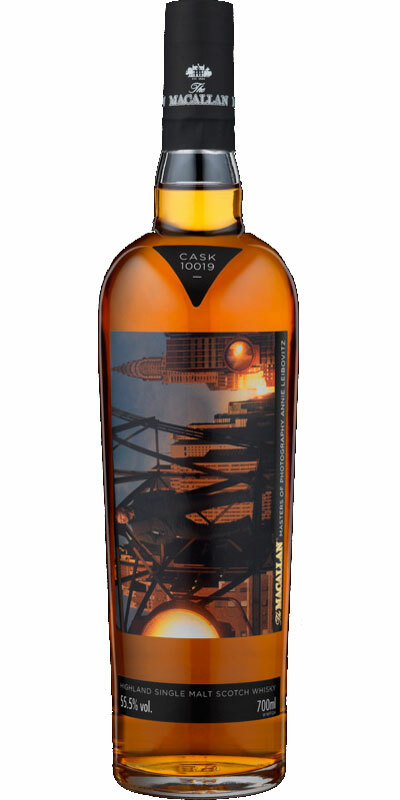 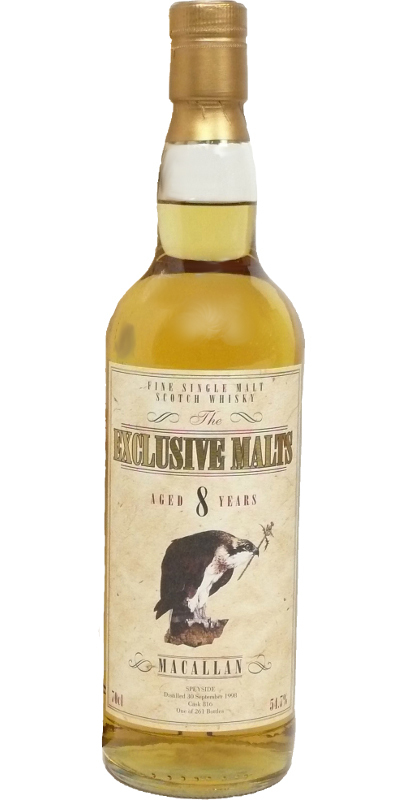 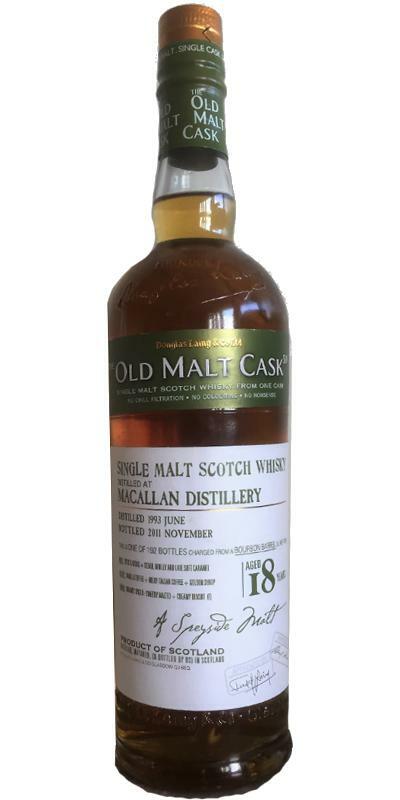 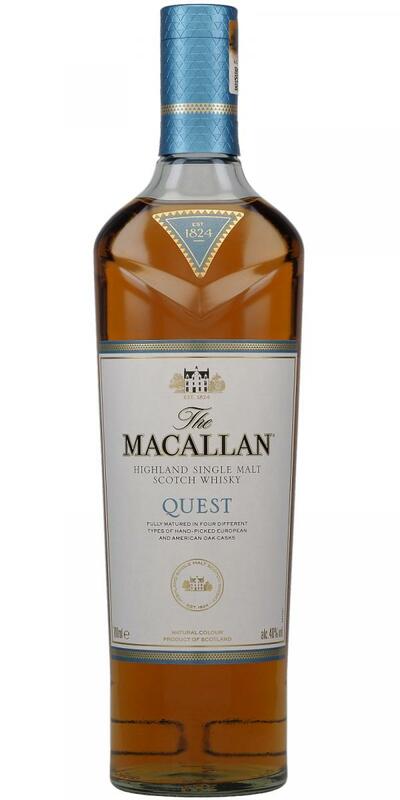 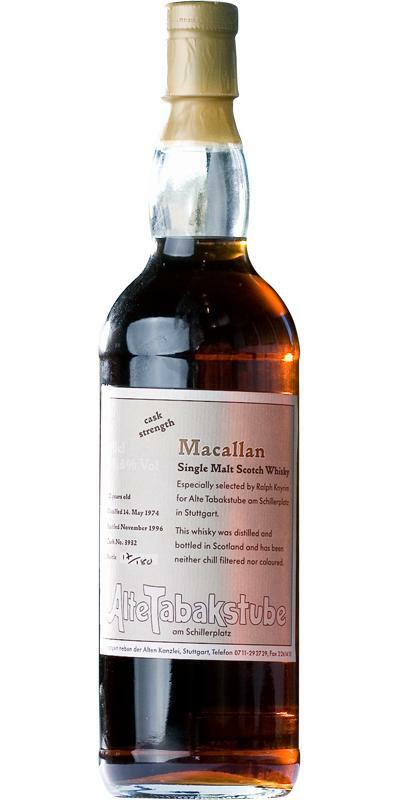 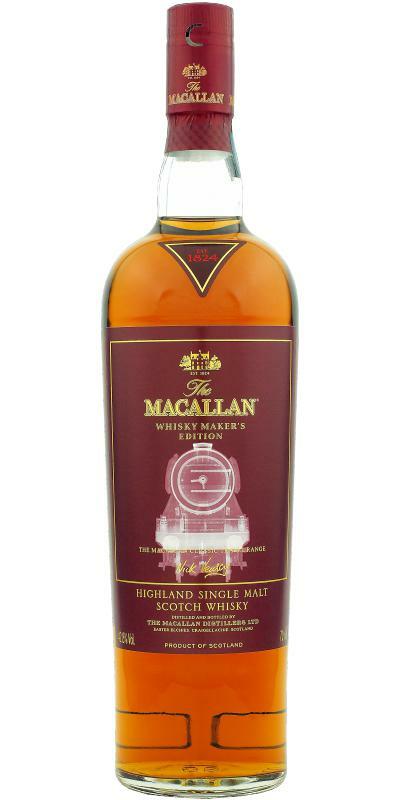 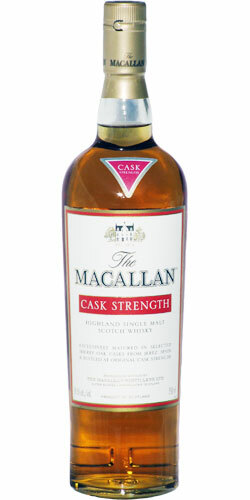 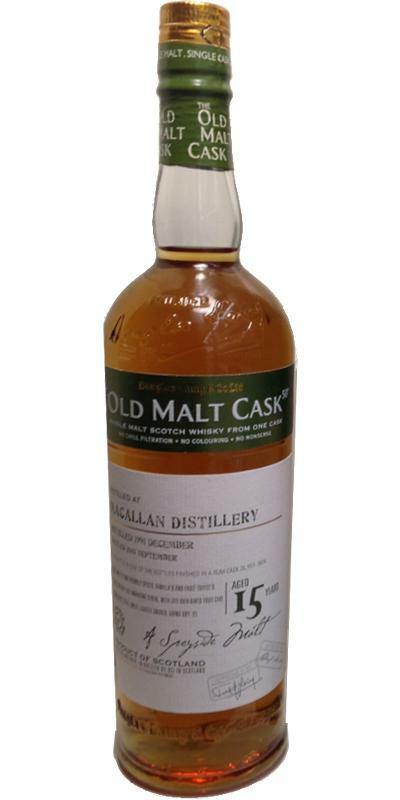 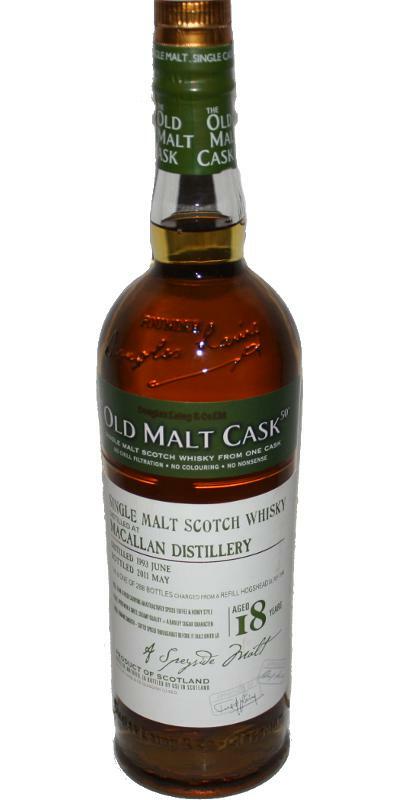 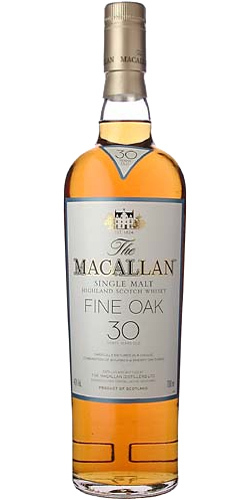 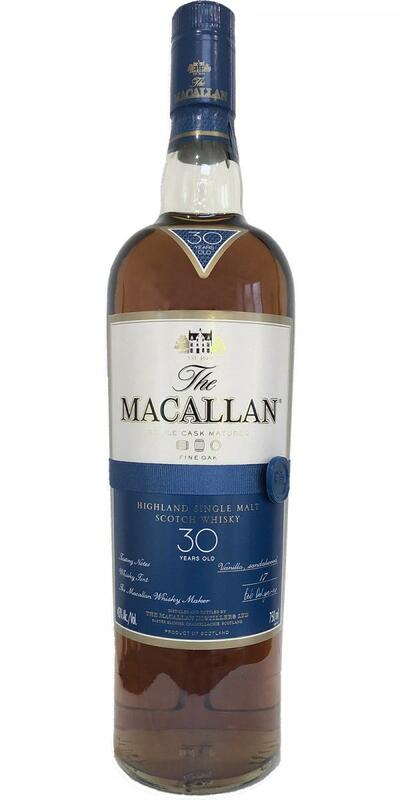 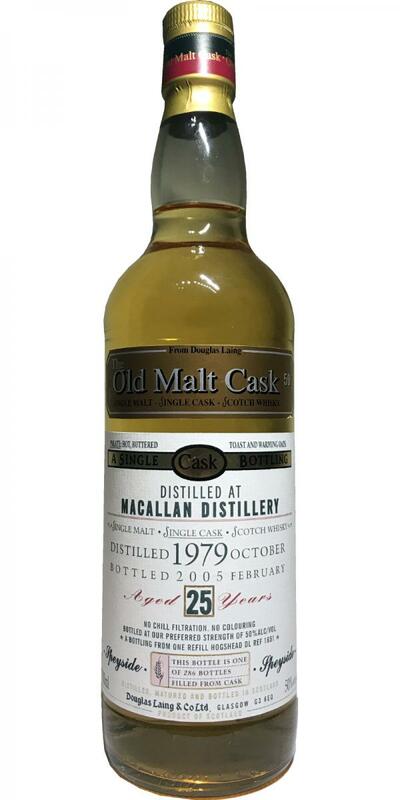 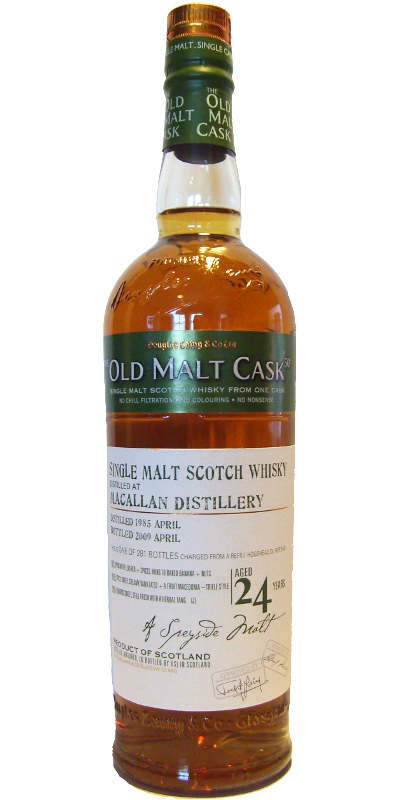 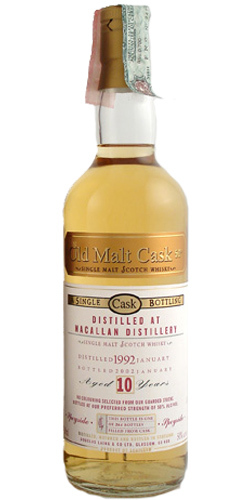 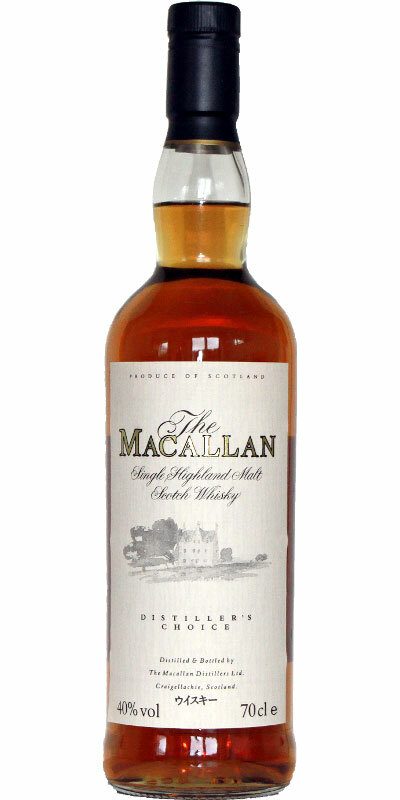 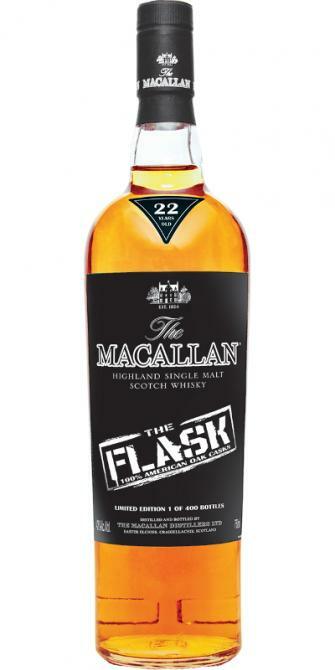 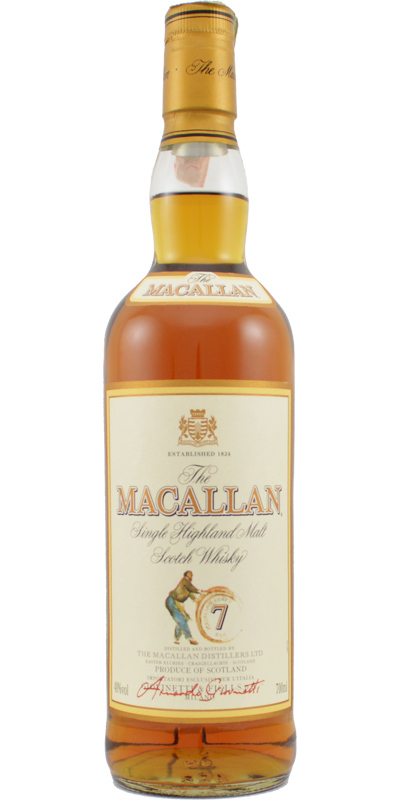 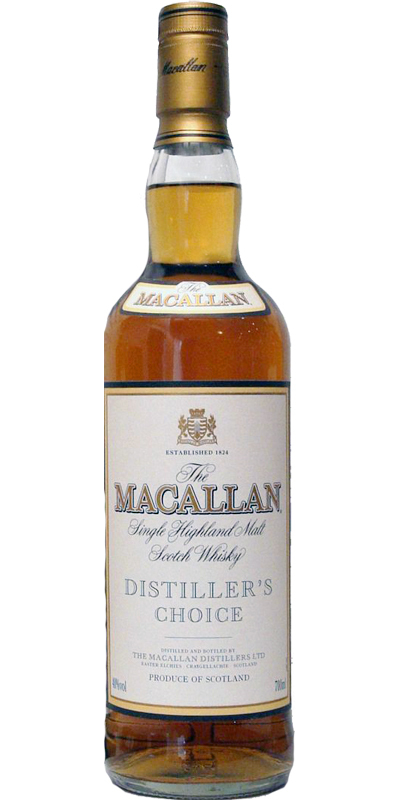 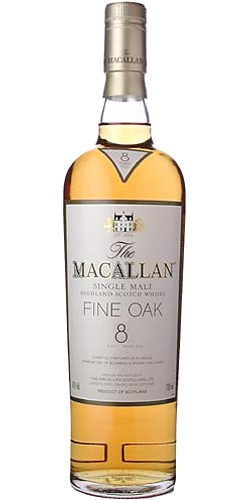 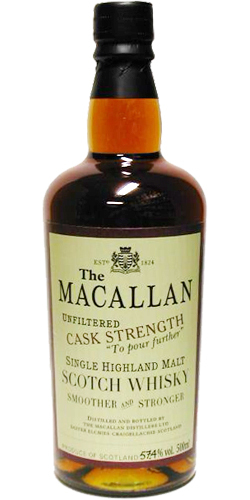 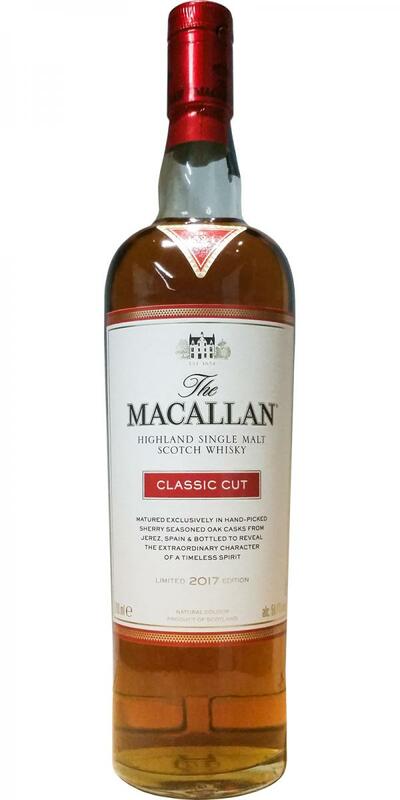 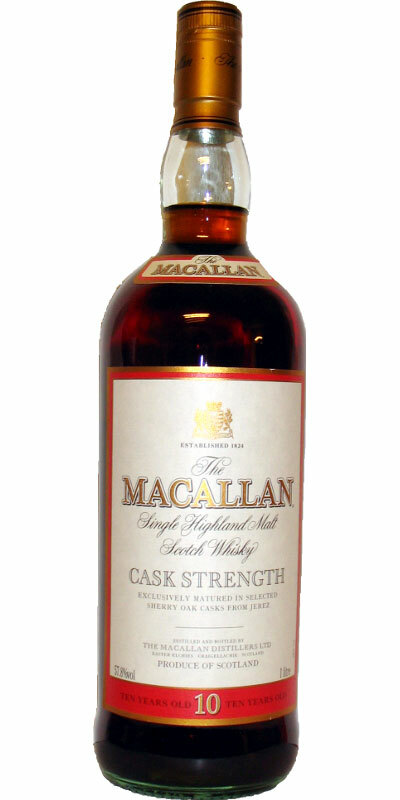 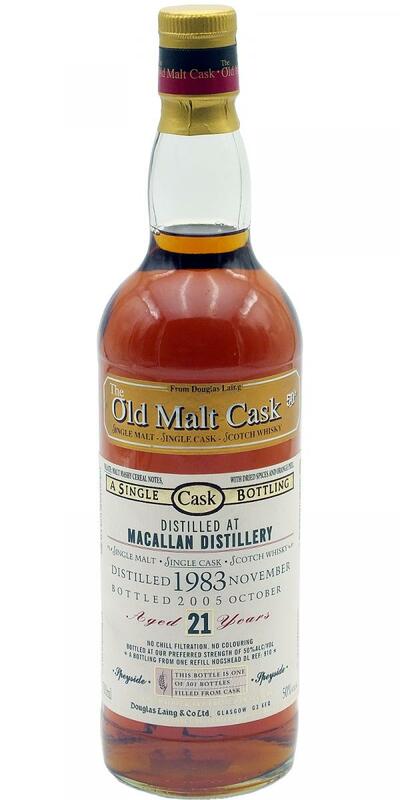 Macallan Cask Strength Cask Strength 58.2 % Vol. 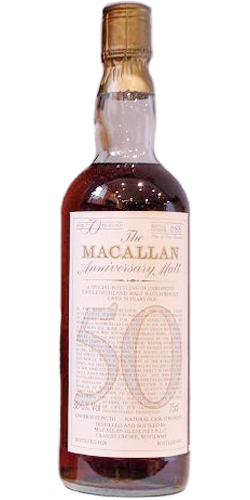 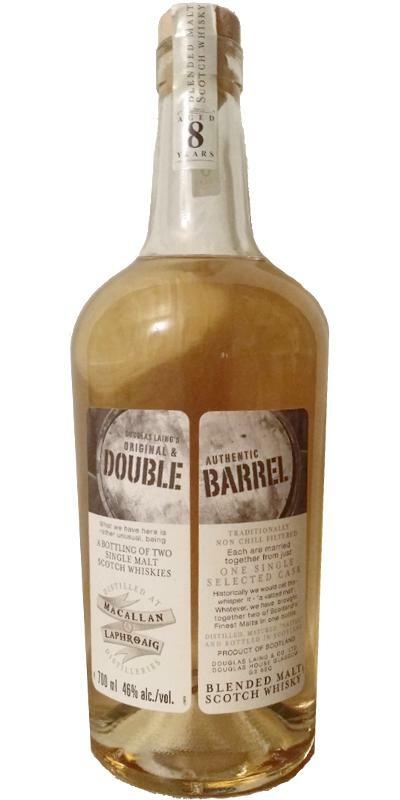 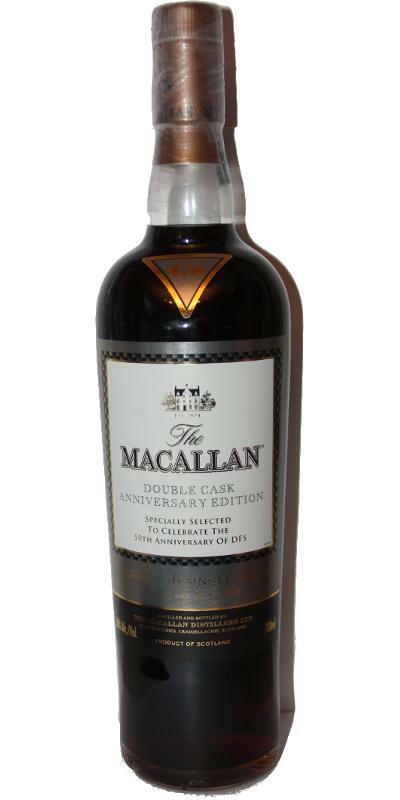 Macallan Double Cask Anniversary Edition 50.0 % Vol. 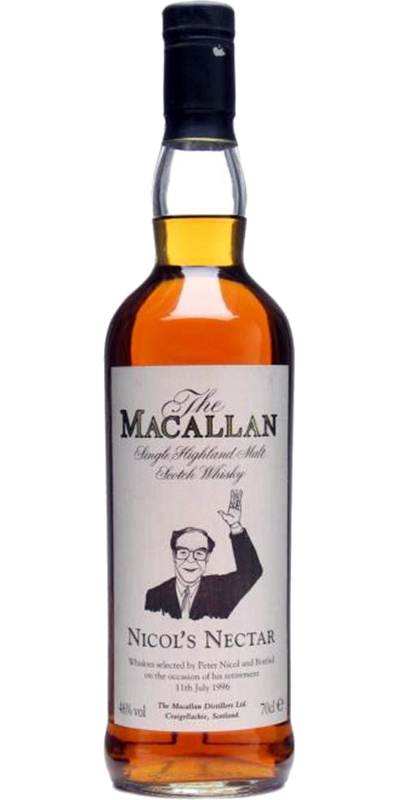 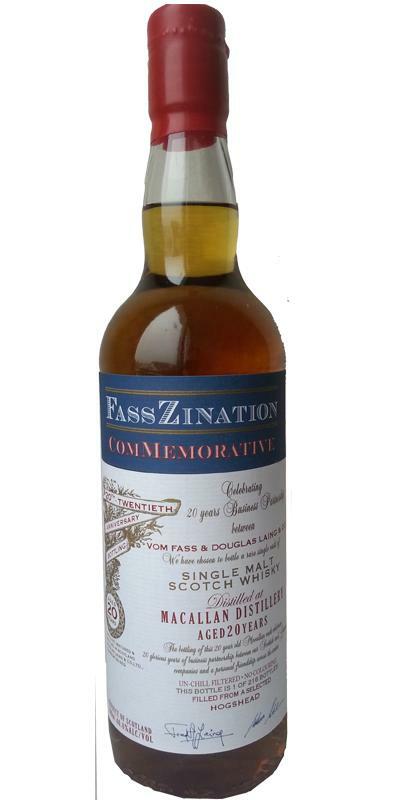 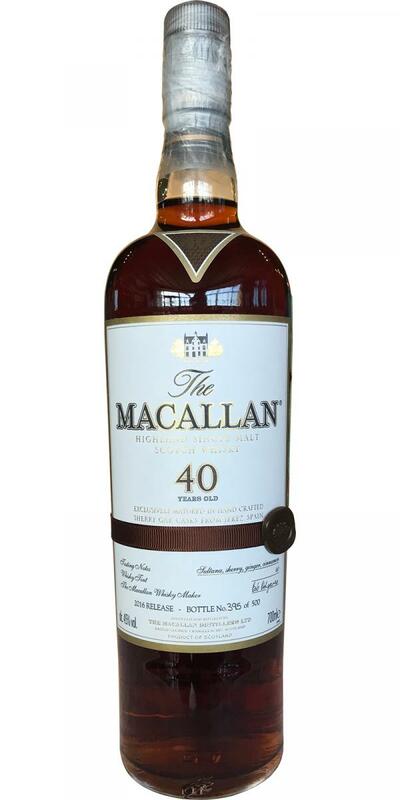 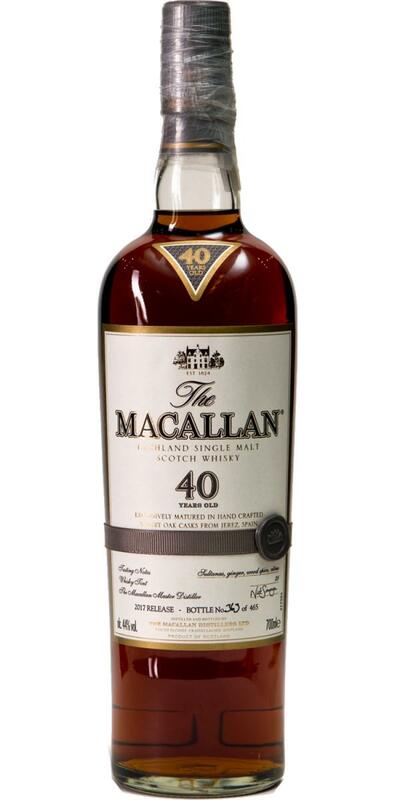 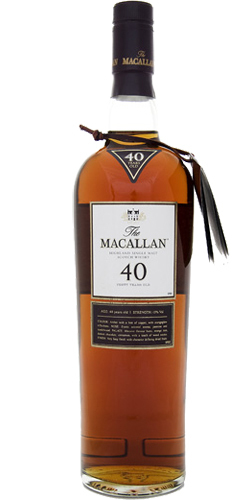 Macallan Folio 4 The Archival Series 43.0 % Vol. 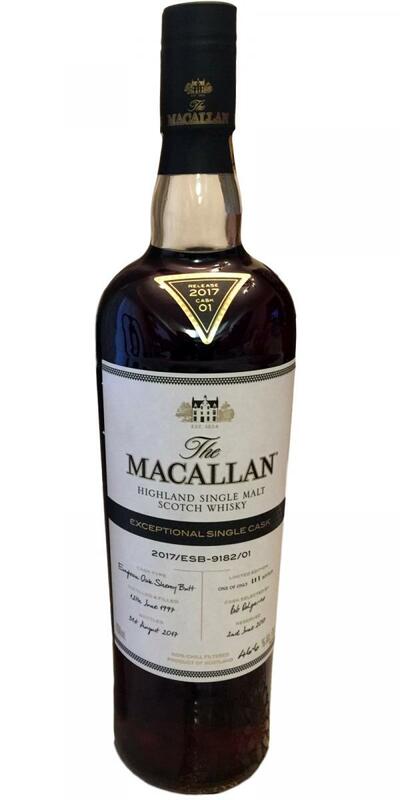 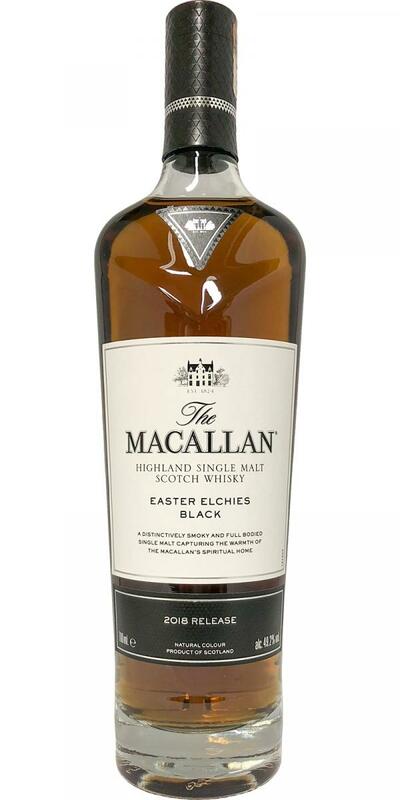 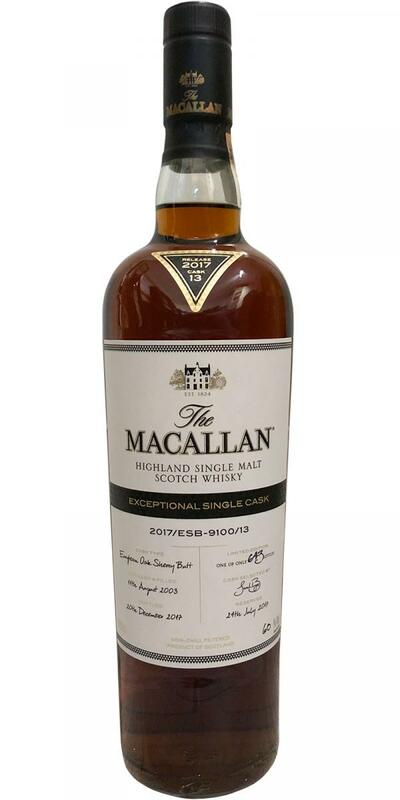 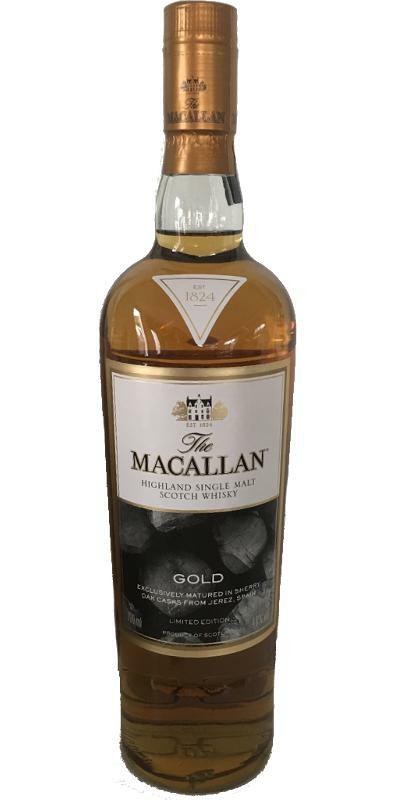 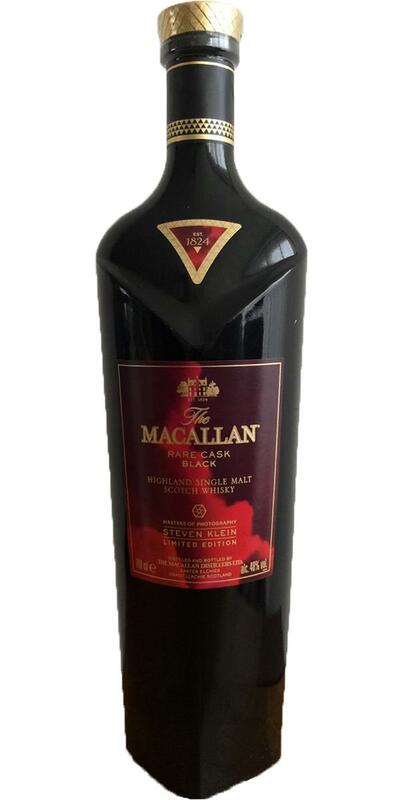 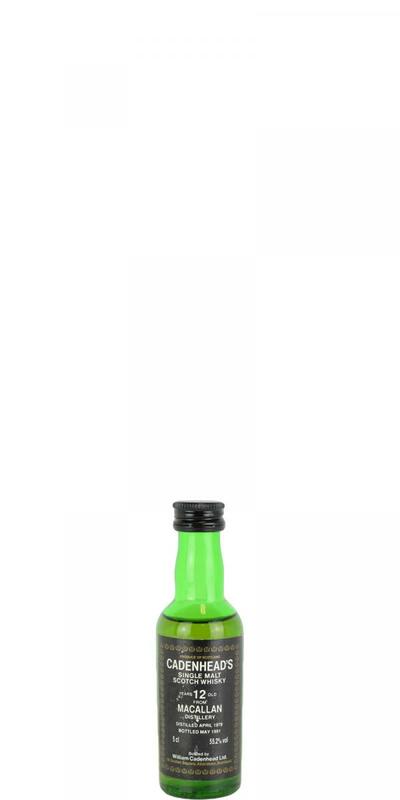 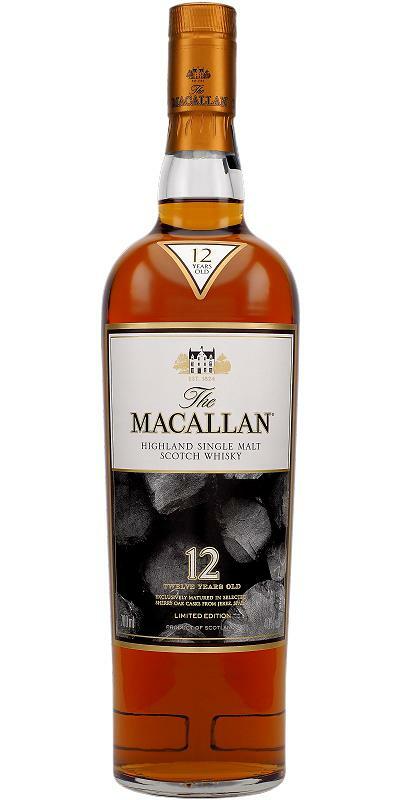 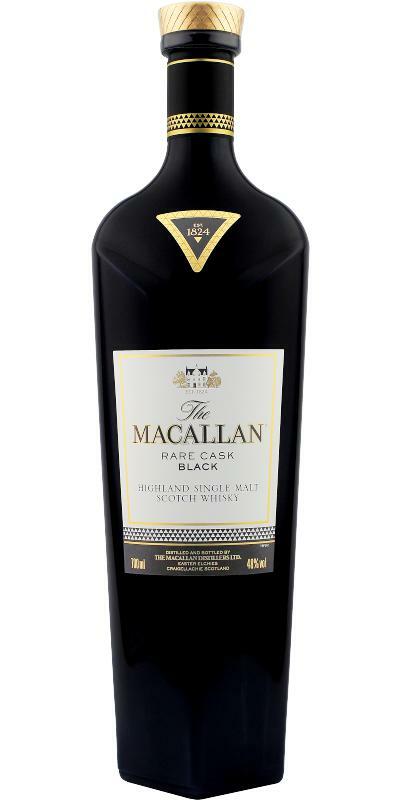 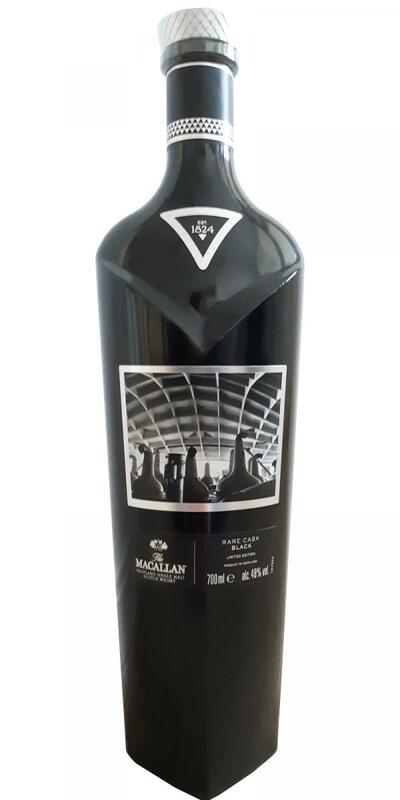 Macallan M black 2017 1824 Masters Series 45.0 % Vol. 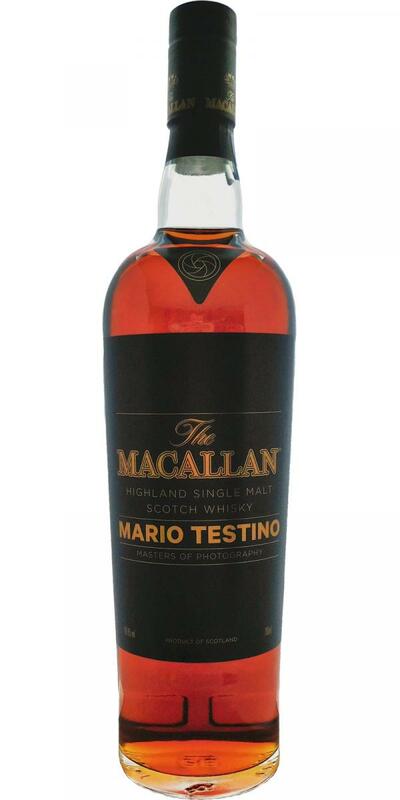 Macallan Masters of Photography Rankin Edition - B&W photo 30 43.0 % Vol. 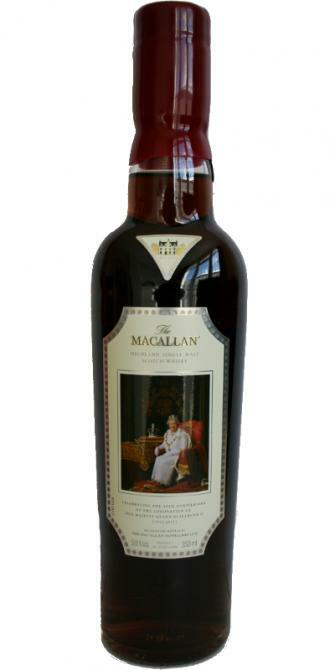 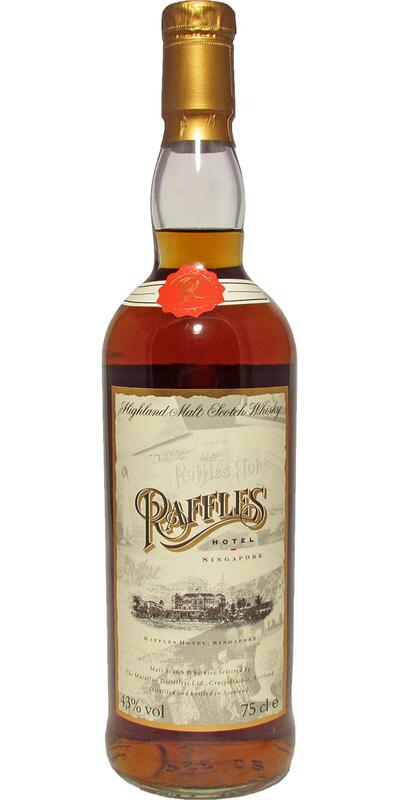 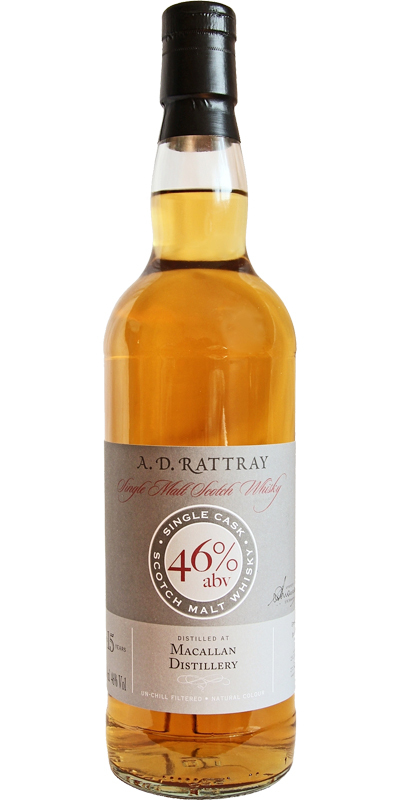 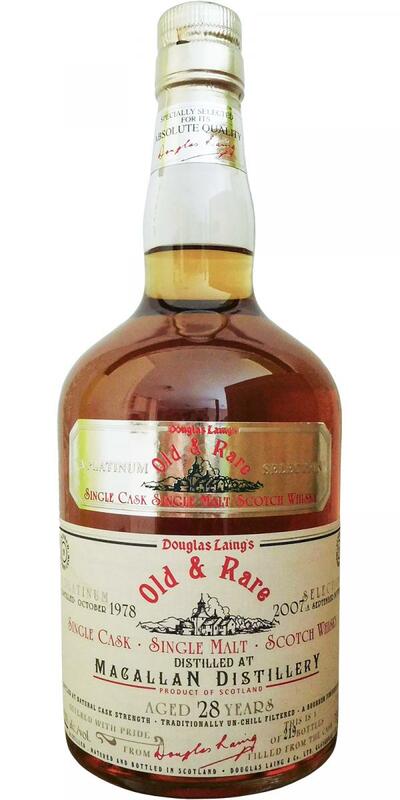 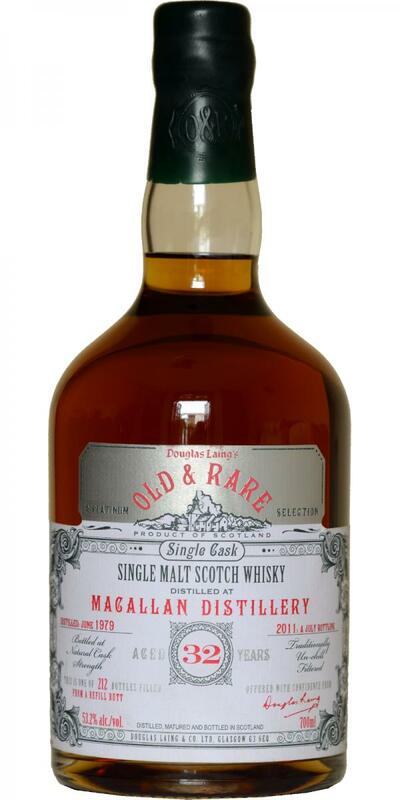 Macallan Raffles Hotel Singapore 43.0 % Vol. 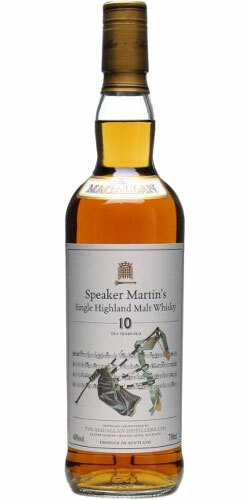 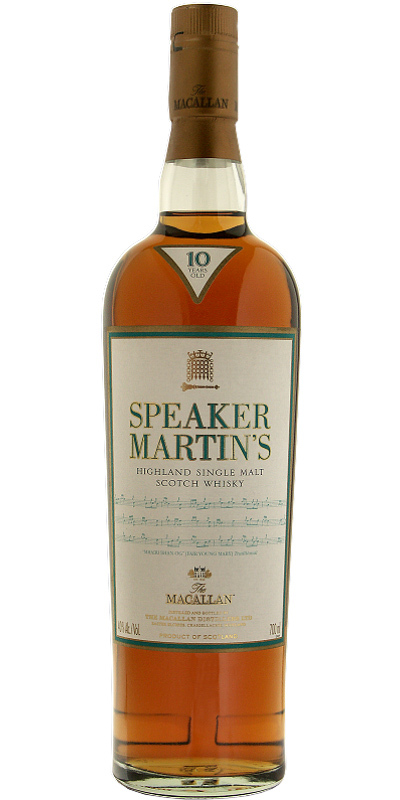 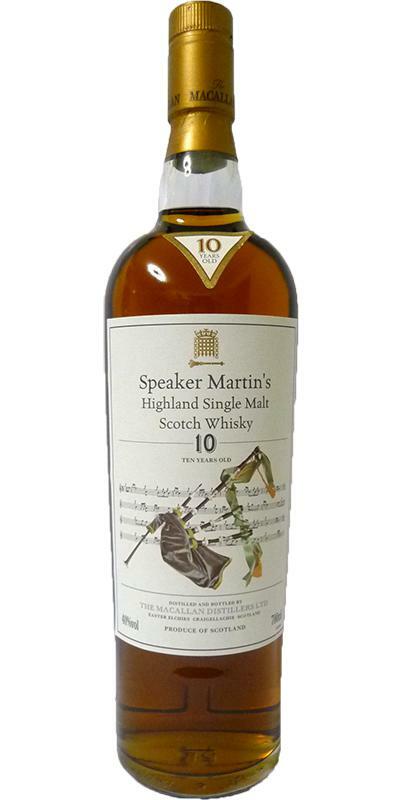 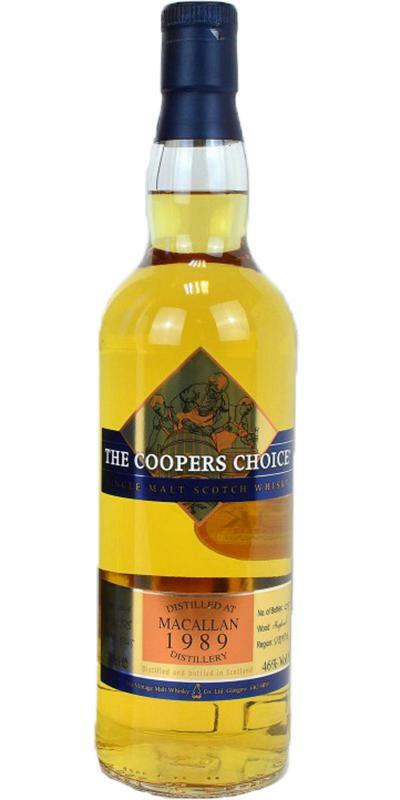 Macallan Speaker Martin's 2nd Edition 10 40.0 % Vol. 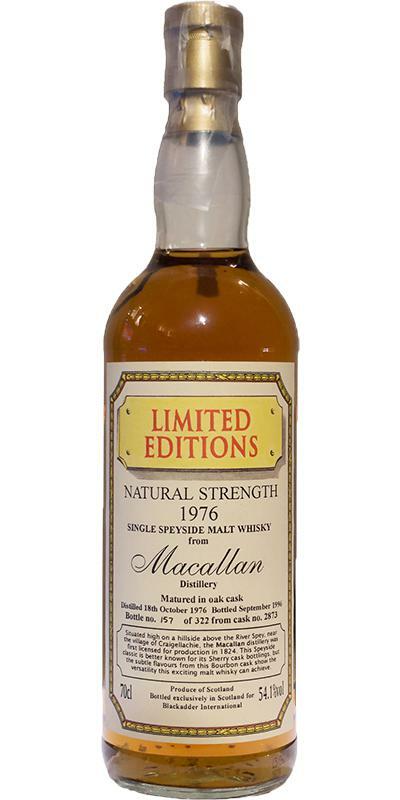 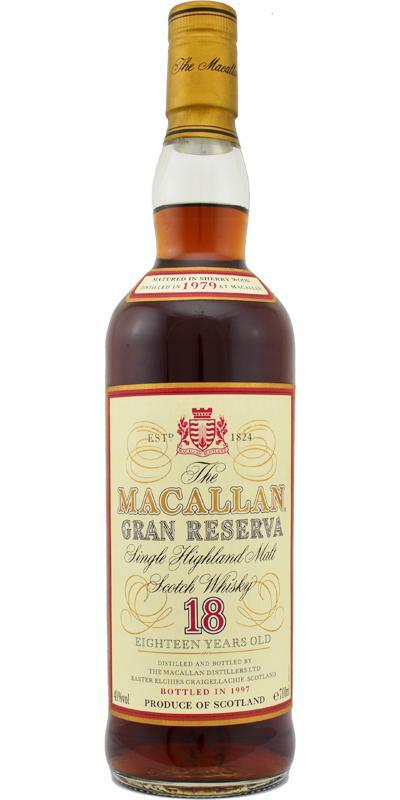 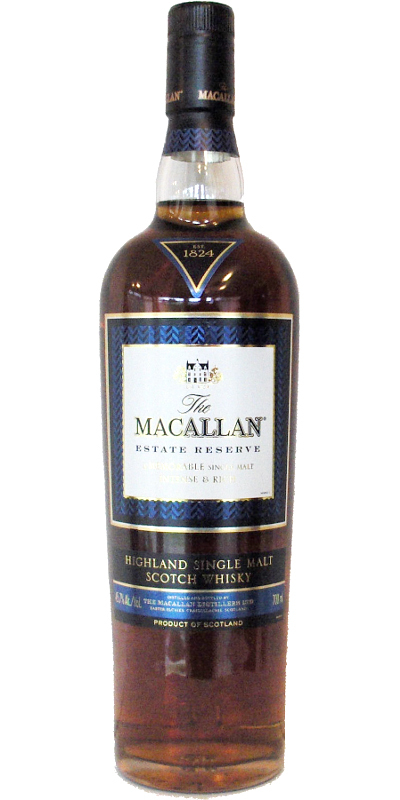 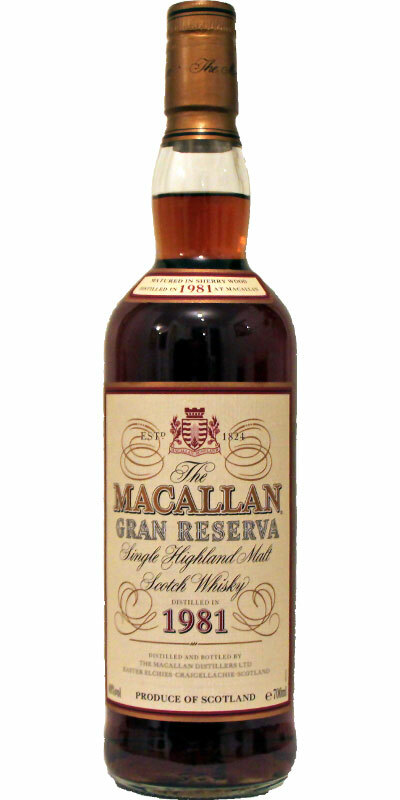 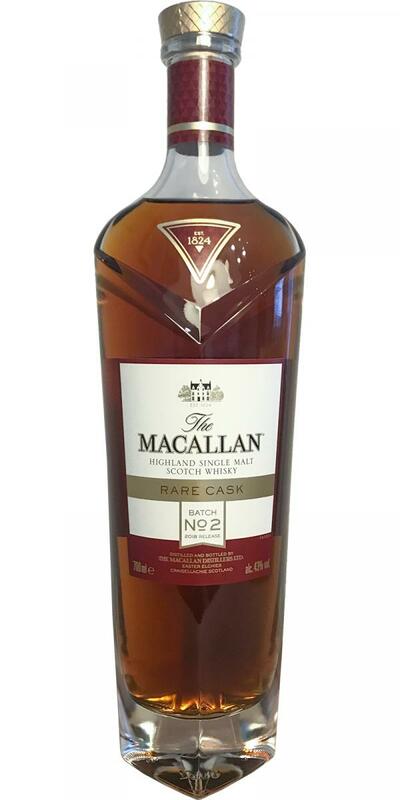 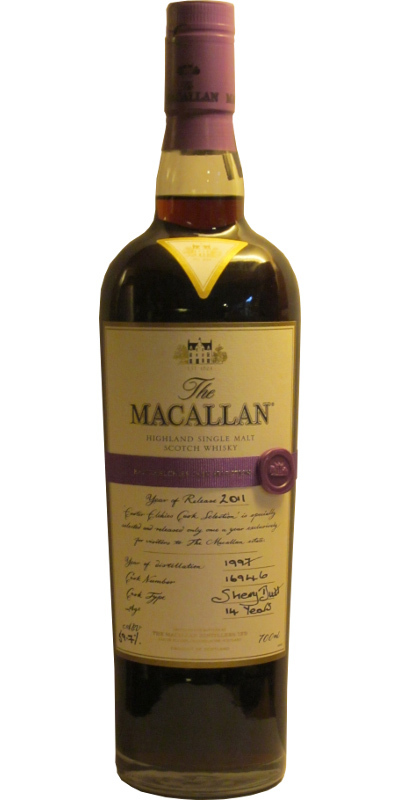 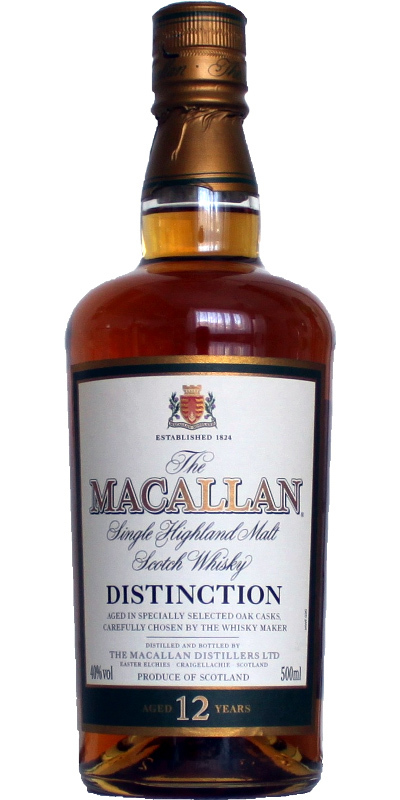 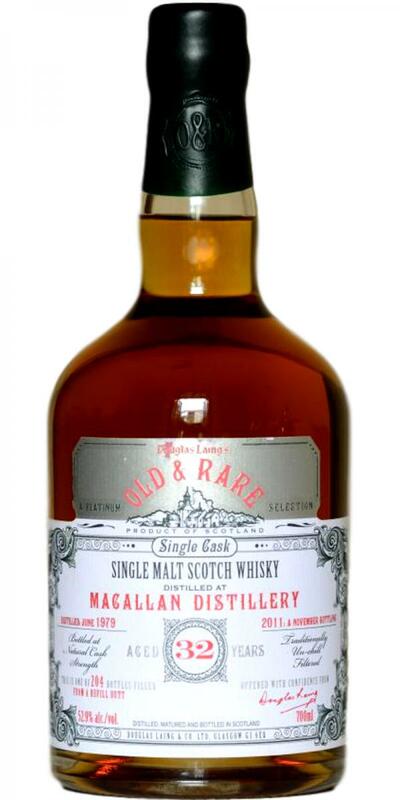 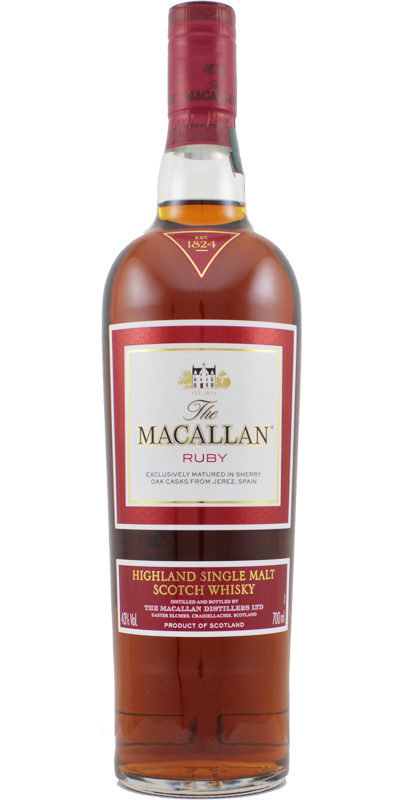 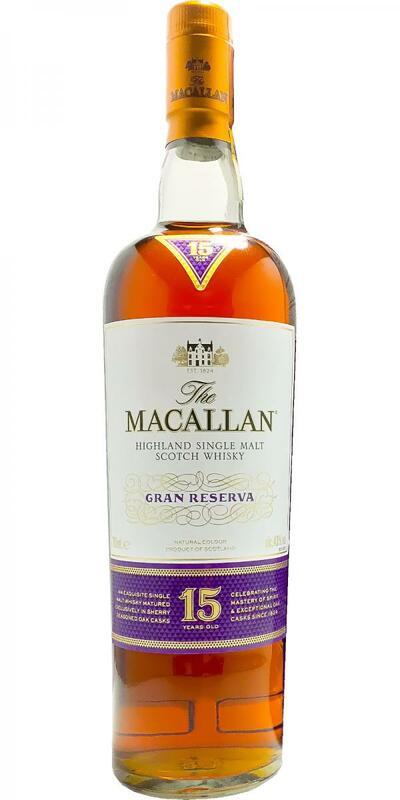 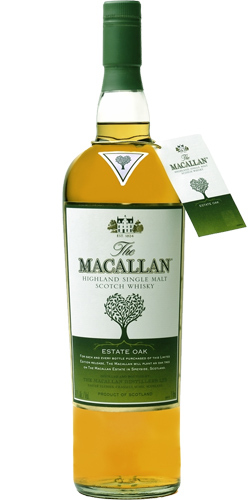 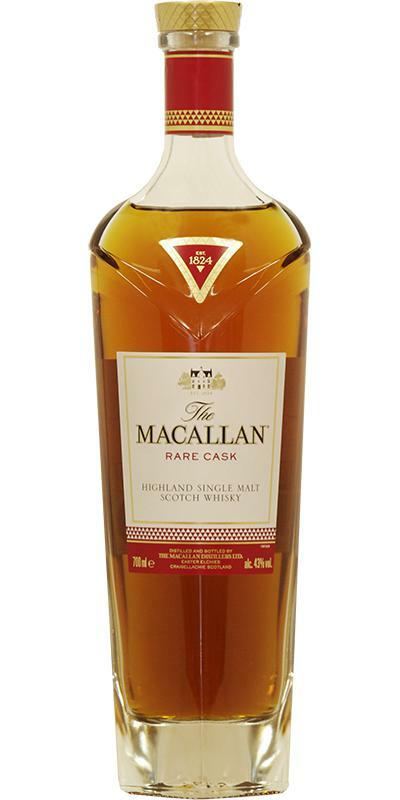 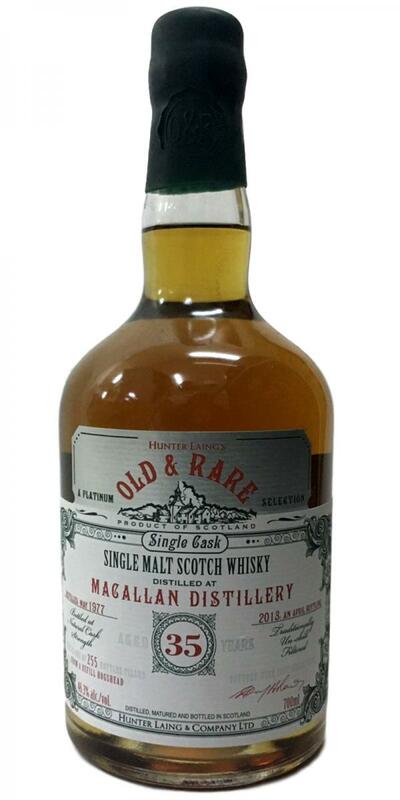 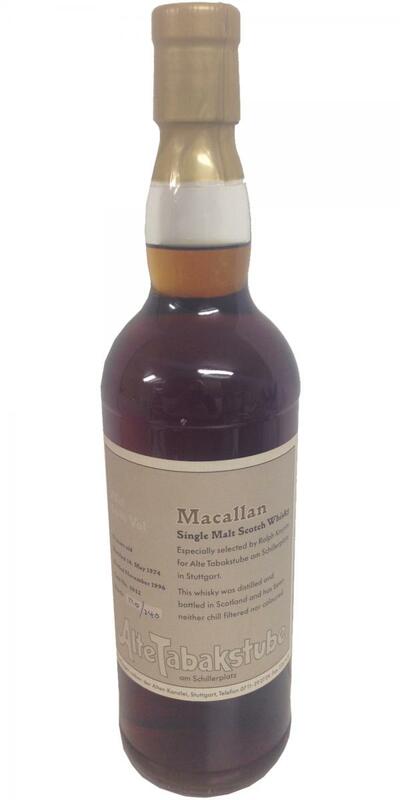 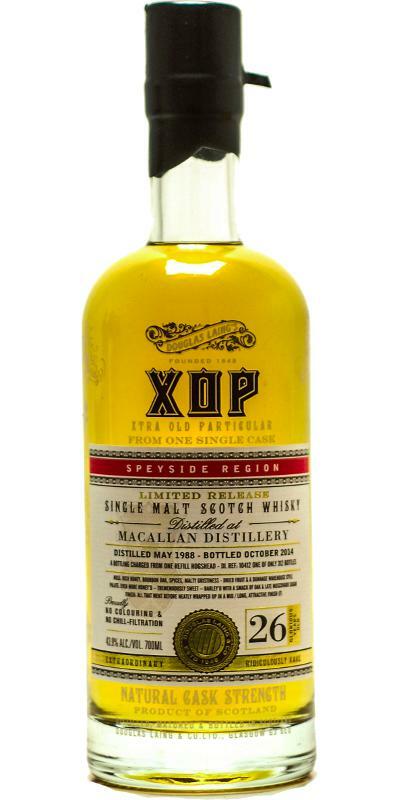 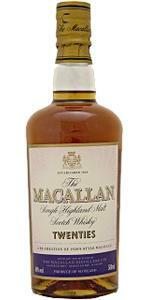 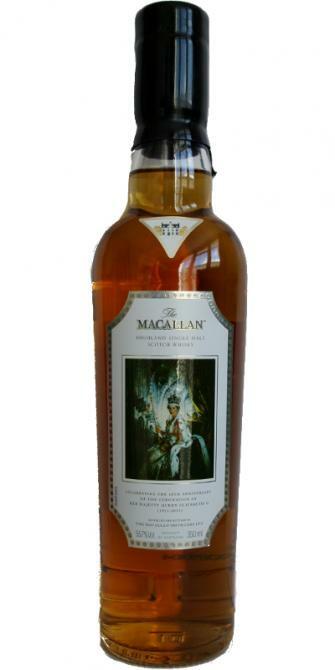 Macallan Special Reserve 2nd Edition 46.0 % Vol. 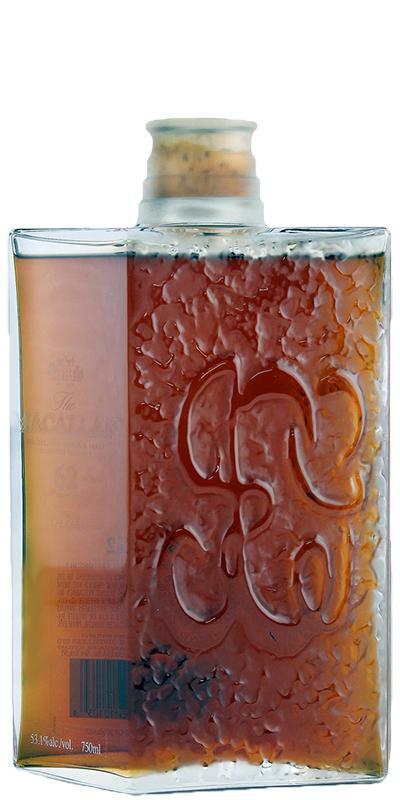 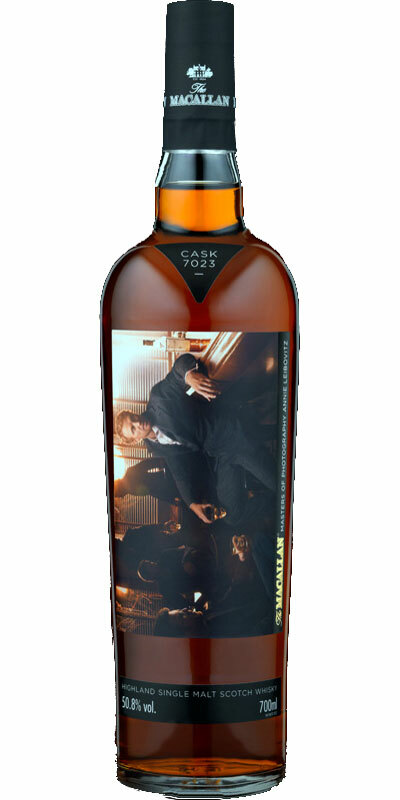 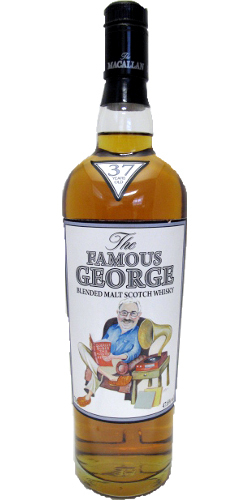 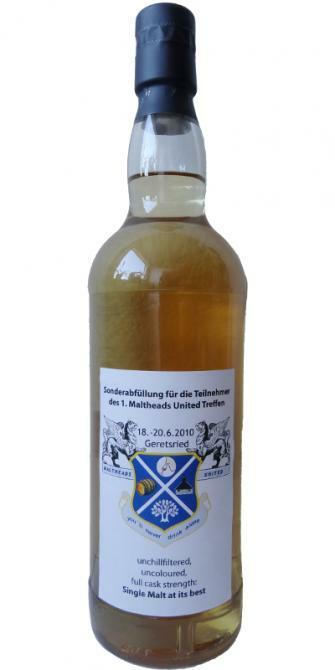 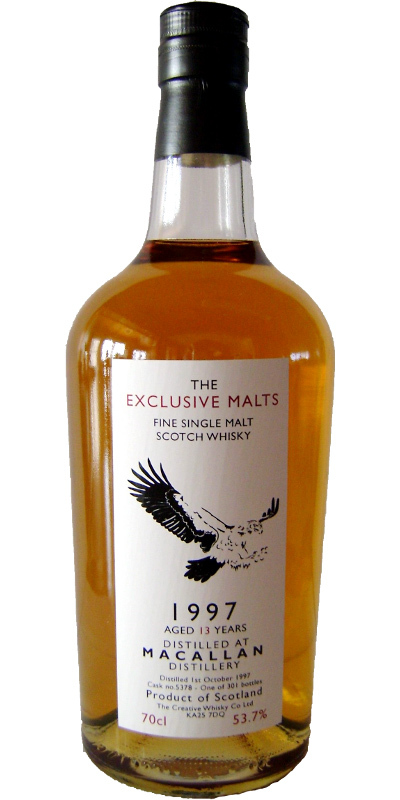 Macallan The Famous George Blended Malt 37 47.6 % Vol. 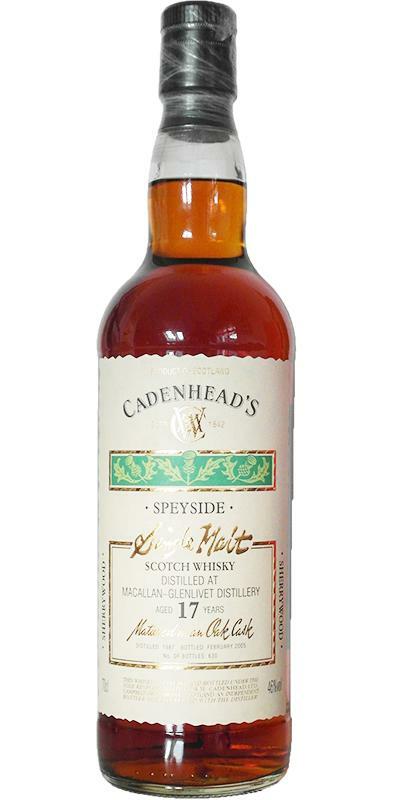 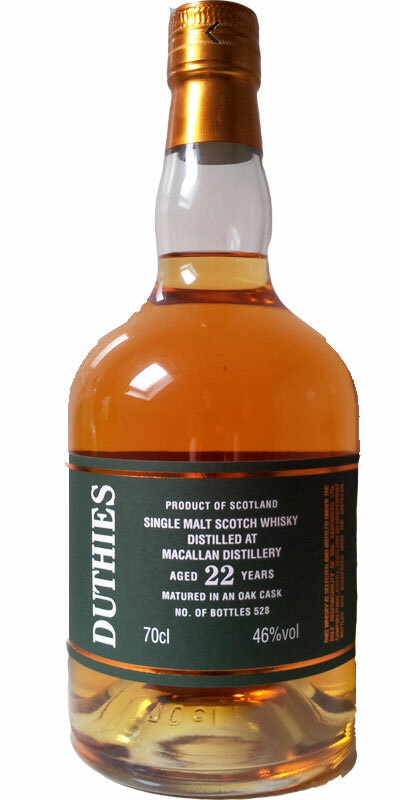 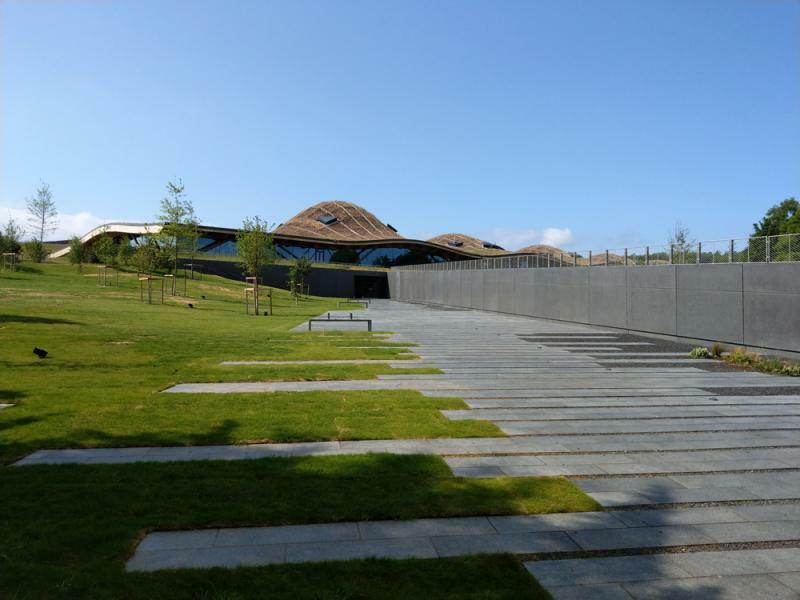 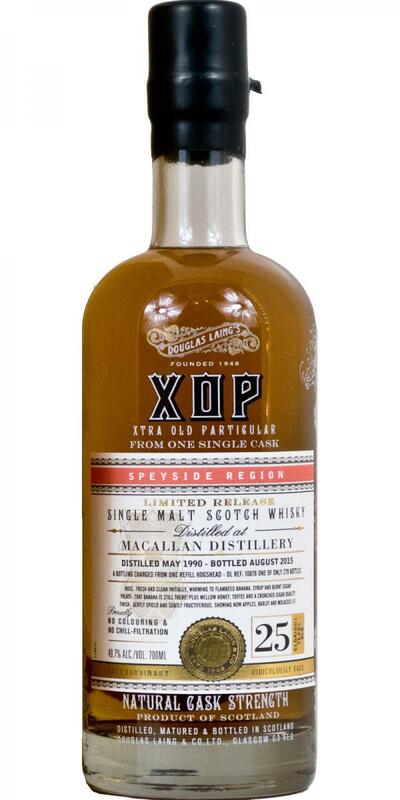 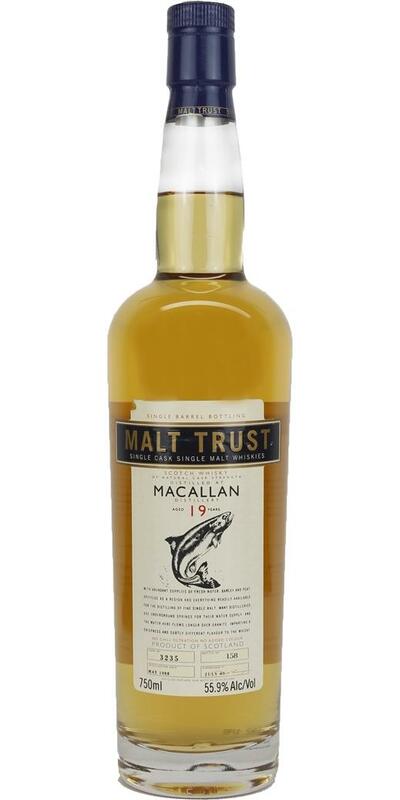 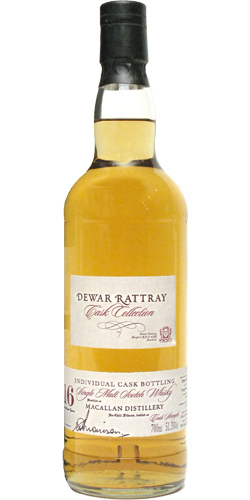 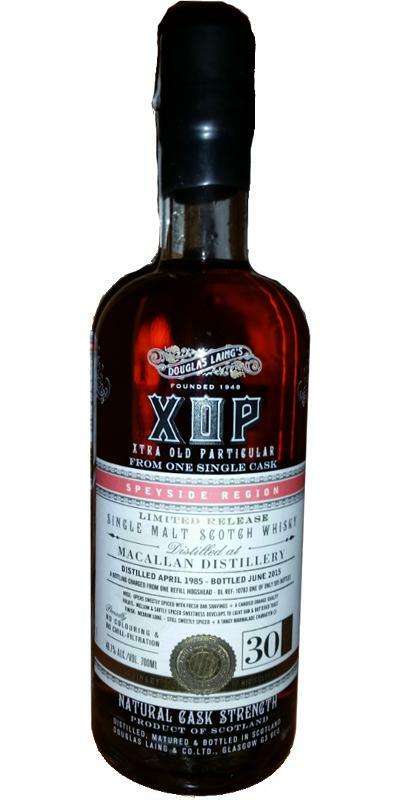 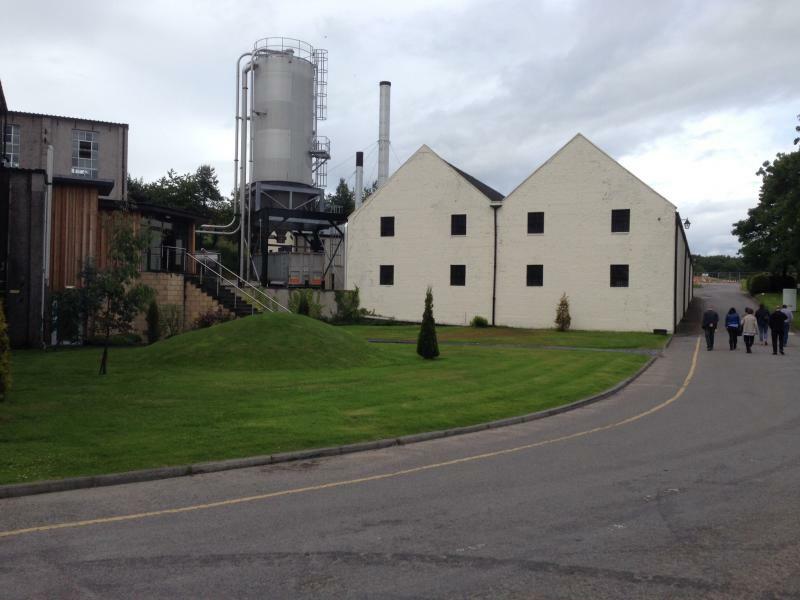 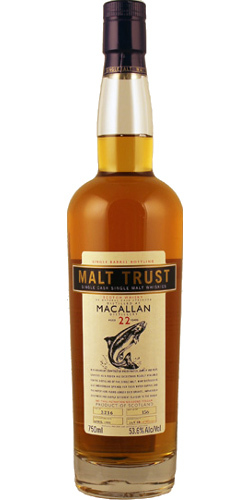 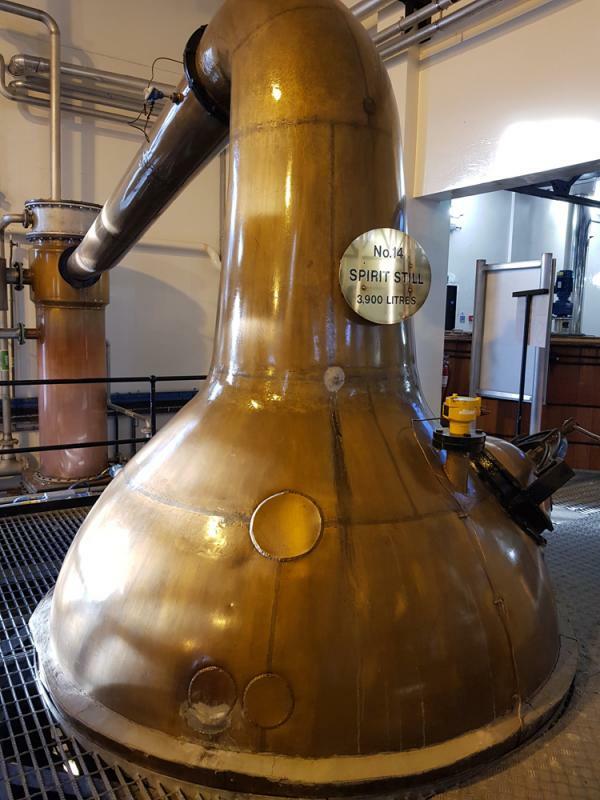 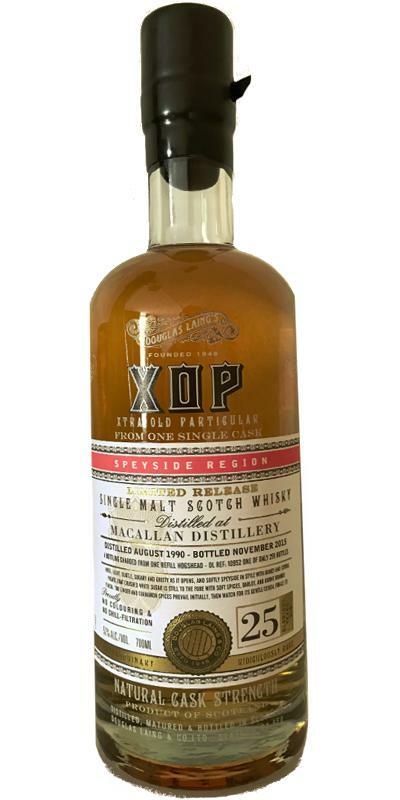 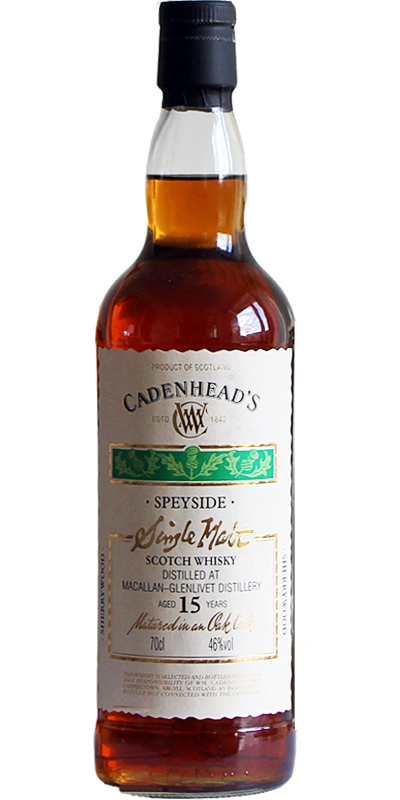 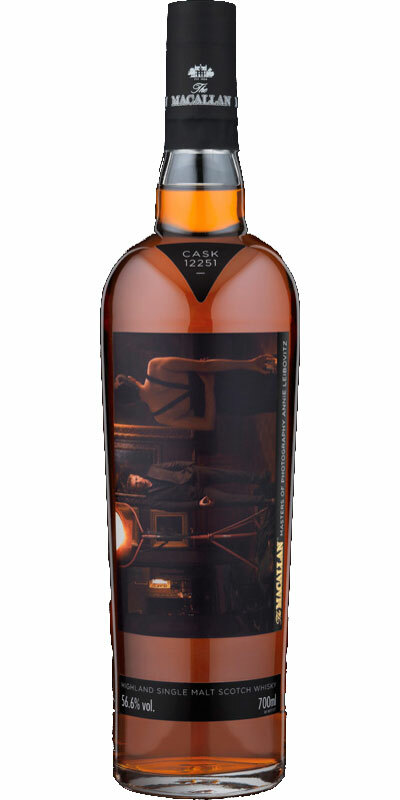 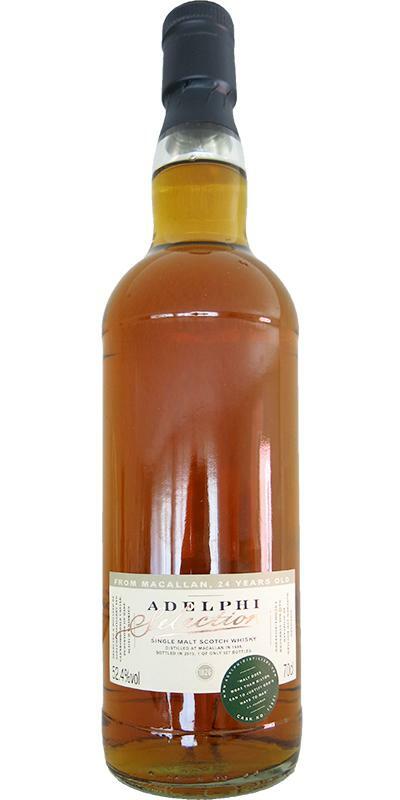 Macallan 12-year-old AI The Speyside Trail 12 46.0 % Vol. 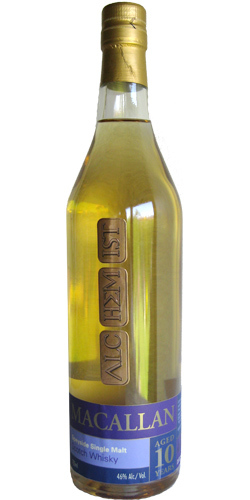 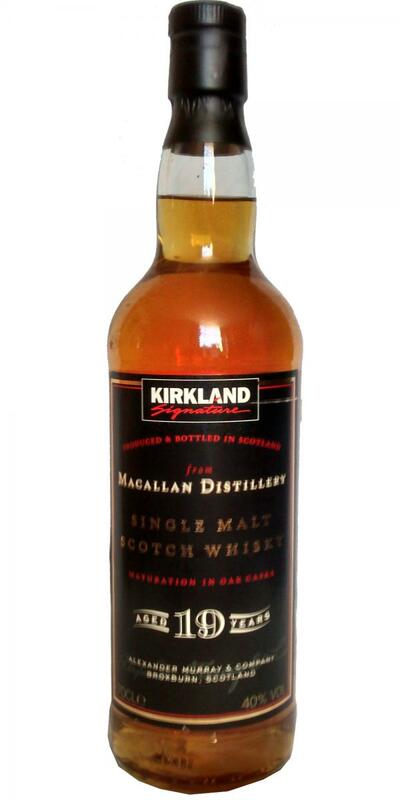 Macallan 1991 AMC Kirkland Signature 17 40.0 % Vol. 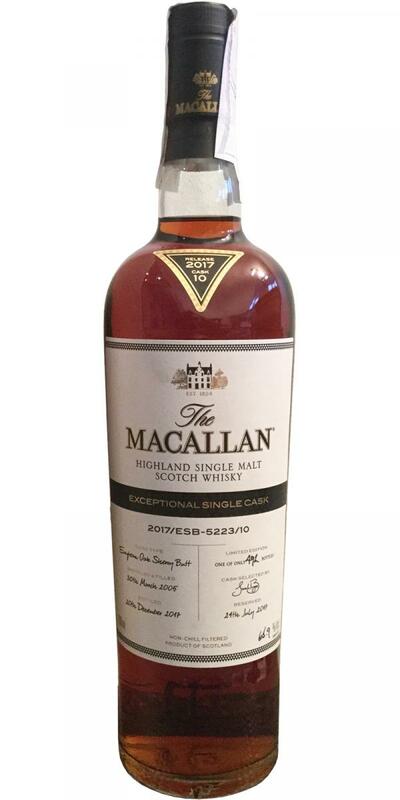 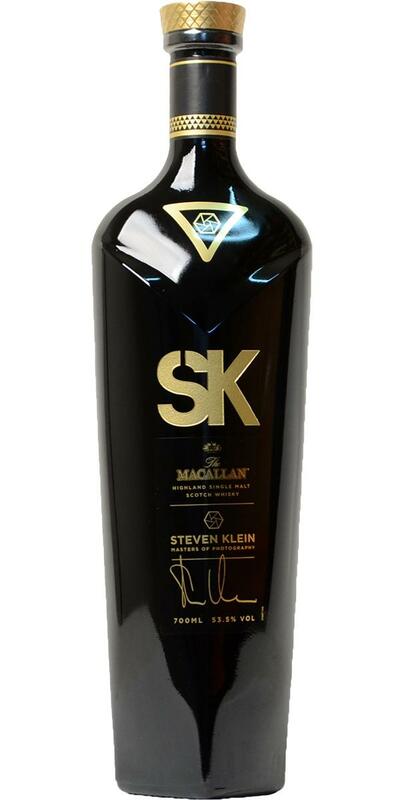 Macallan 1991 AMC Kirkland Signature 20 40.0 % Vol. 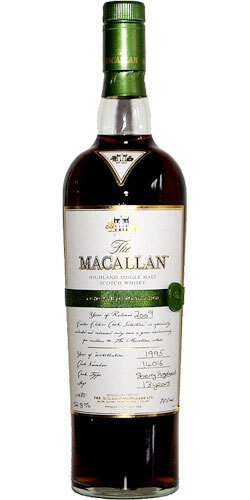 Macallan 1997 AMC Kirkland Signature 15 40.0 % Vol. 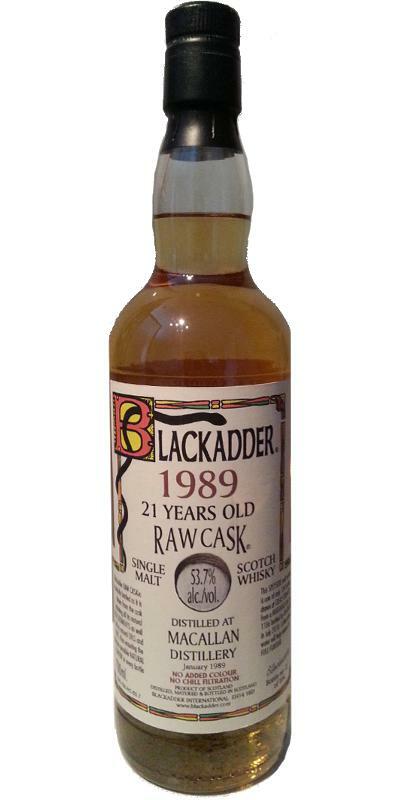 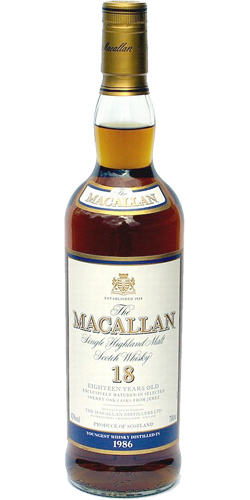 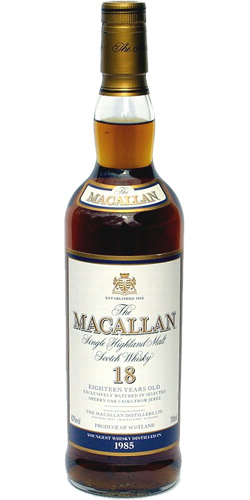 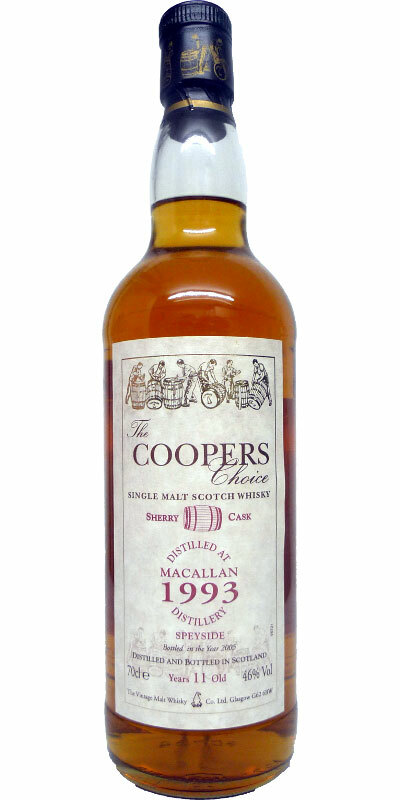 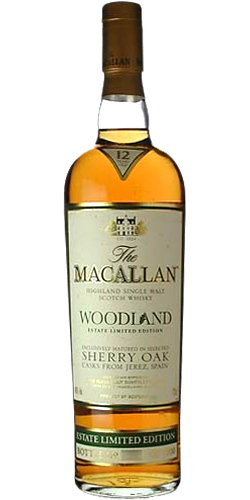 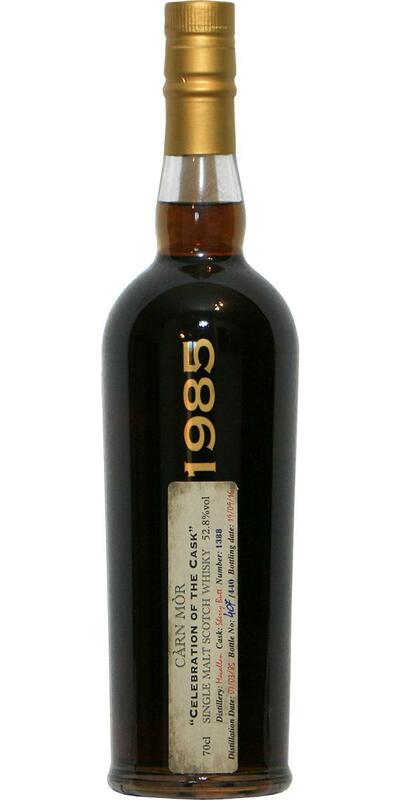 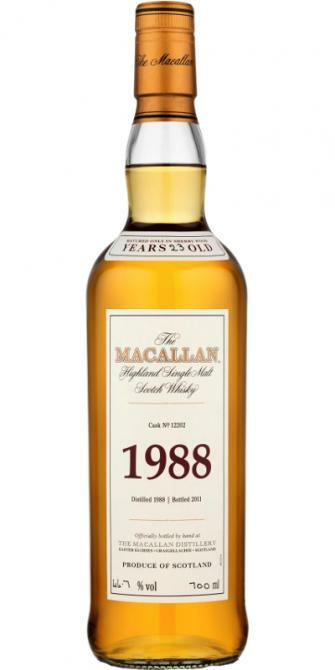 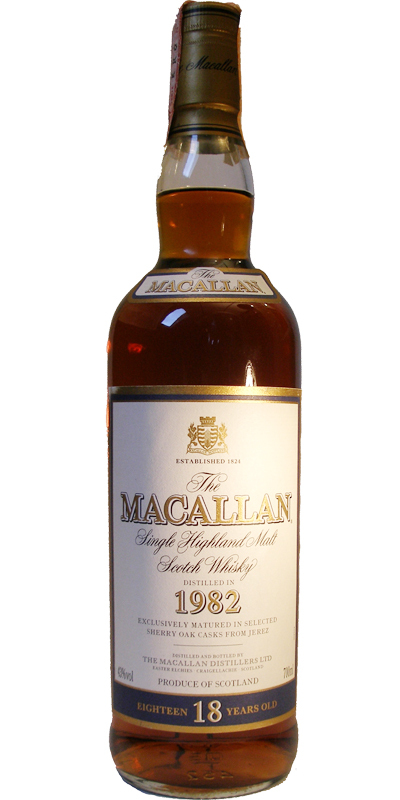 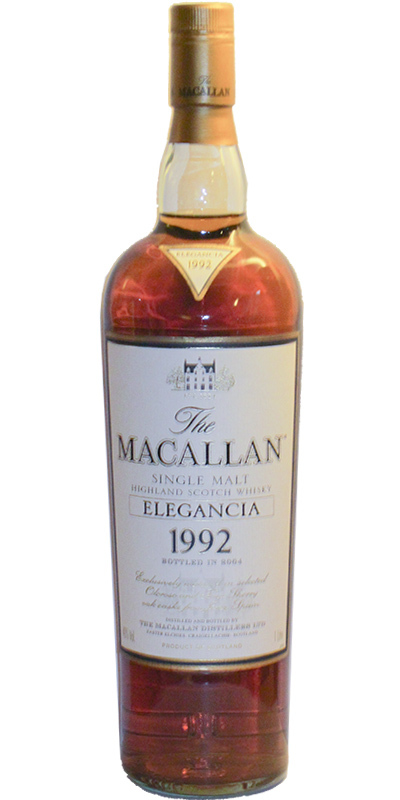 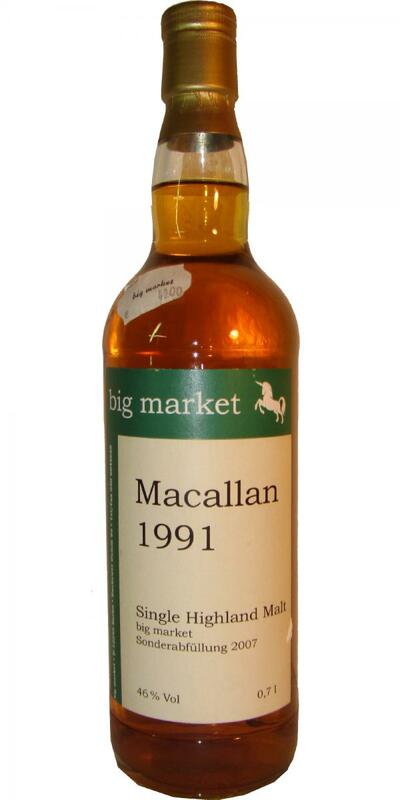 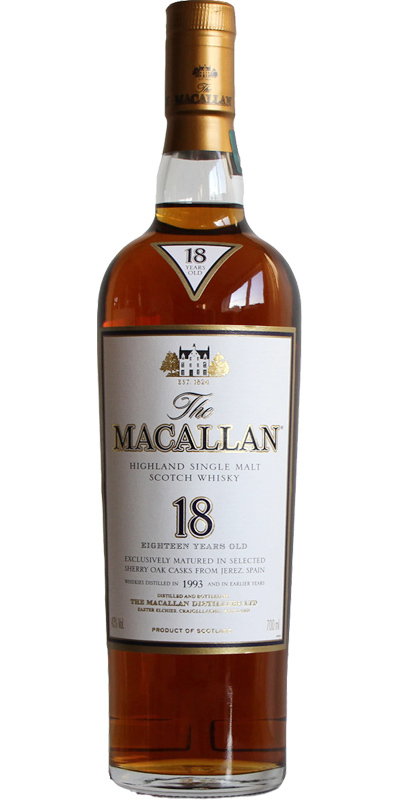 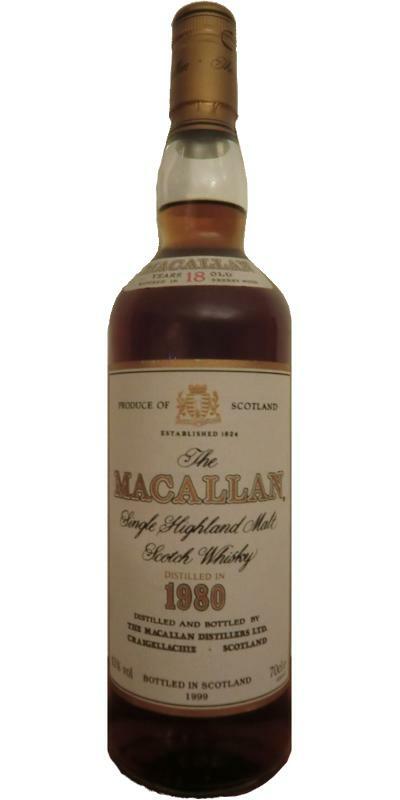 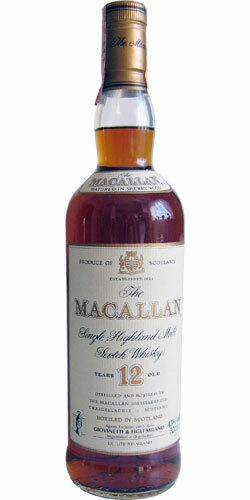 Macallan 1989 As 12 58.3 % Vol. 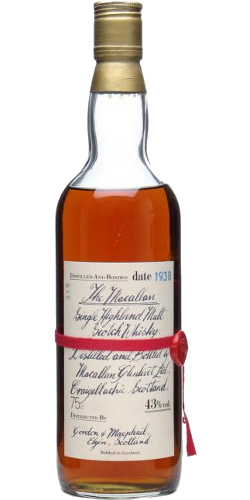 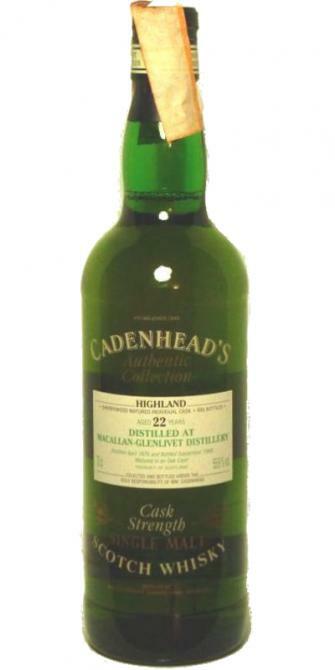 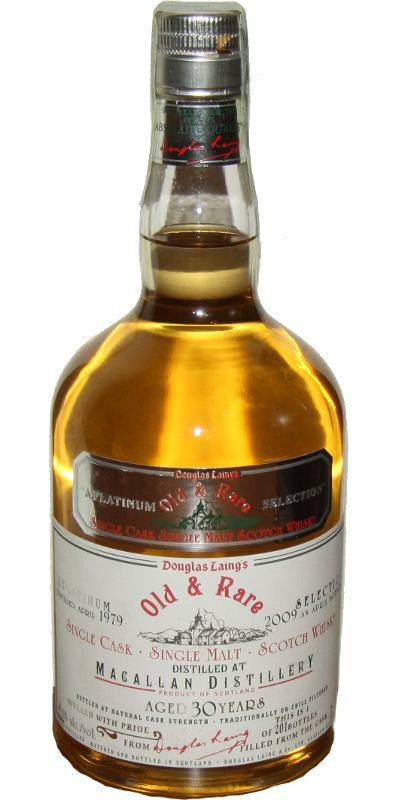 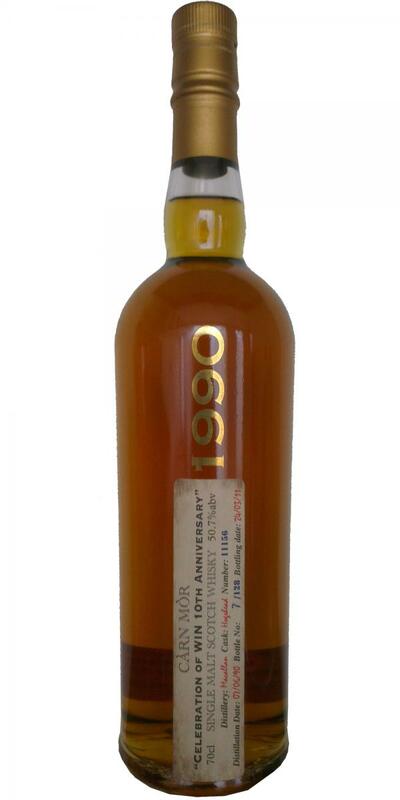 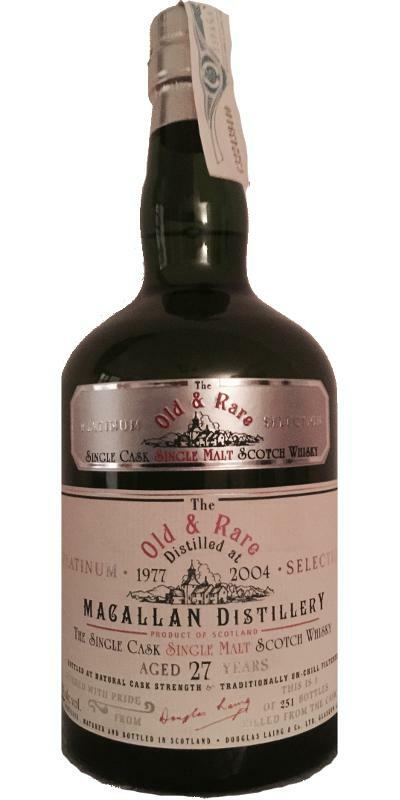 Macallan 1995 BRI Highland Laird 19 47.4 % Vol. 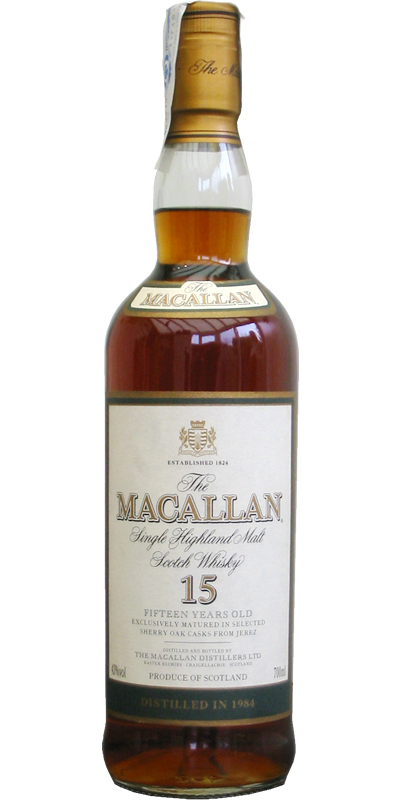 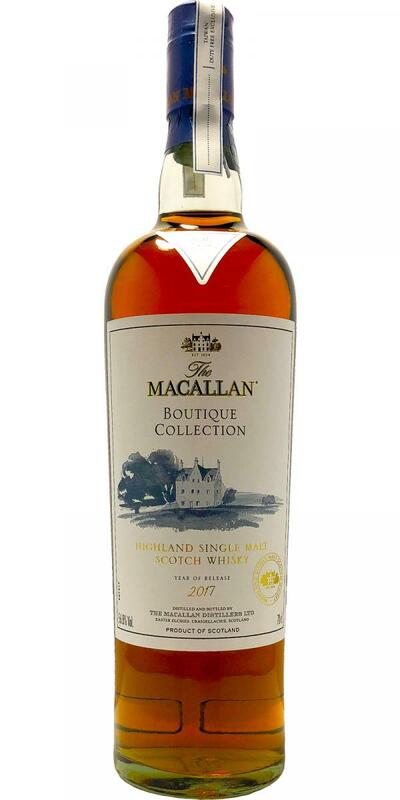 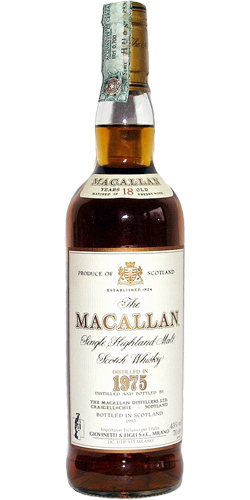 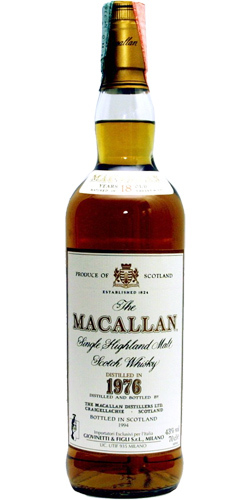 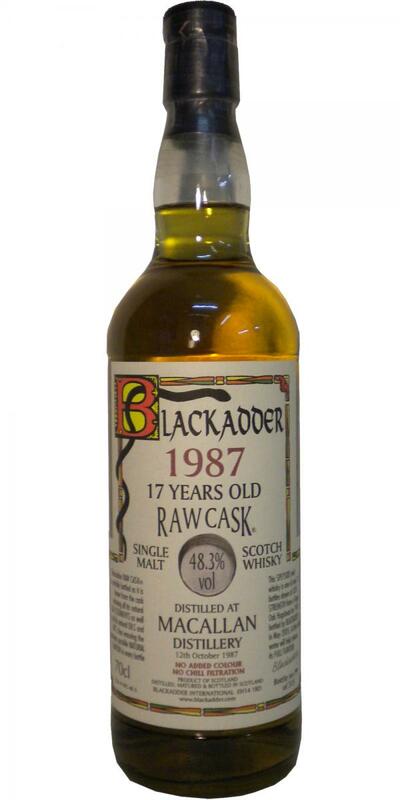 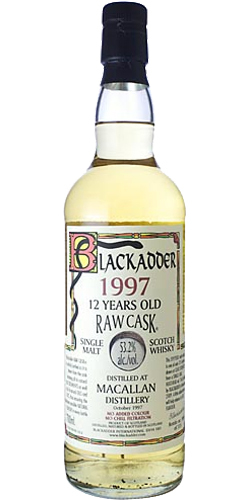 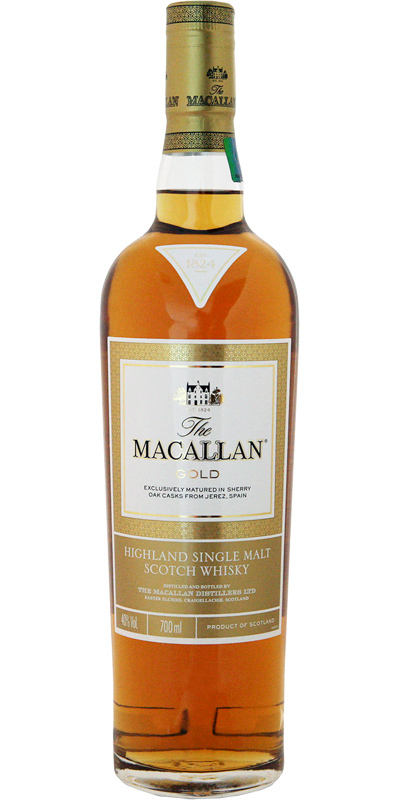 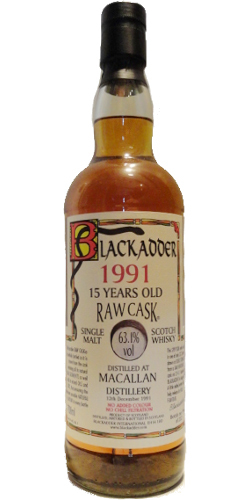 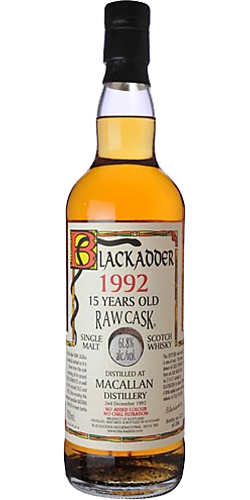 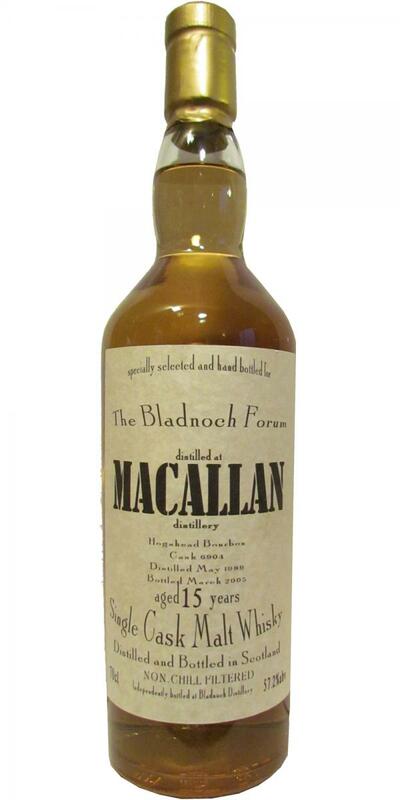 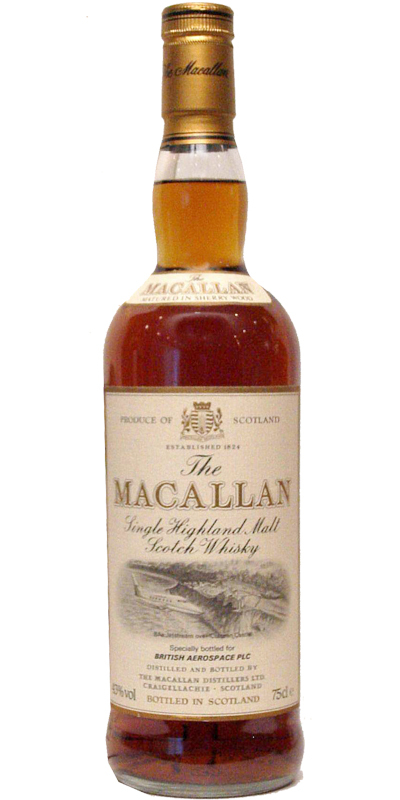 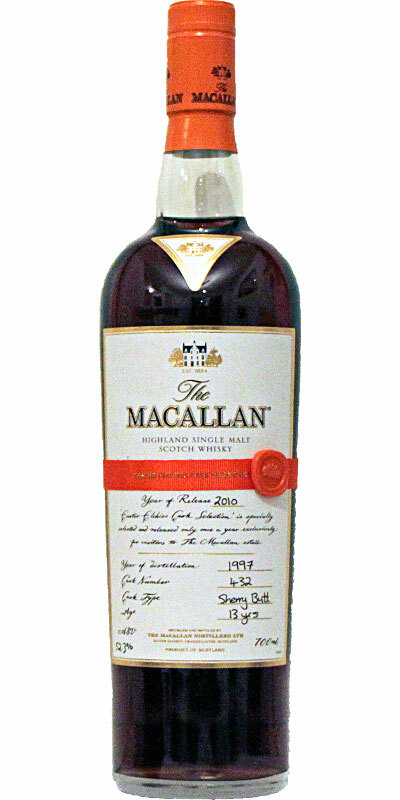 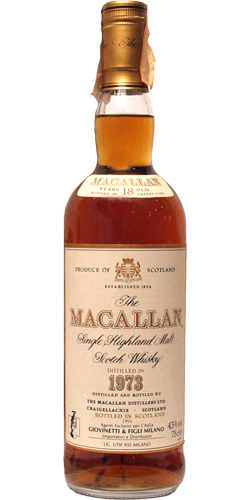 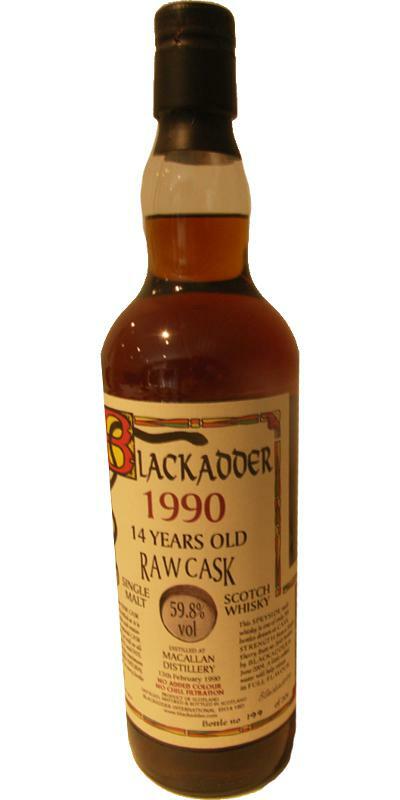 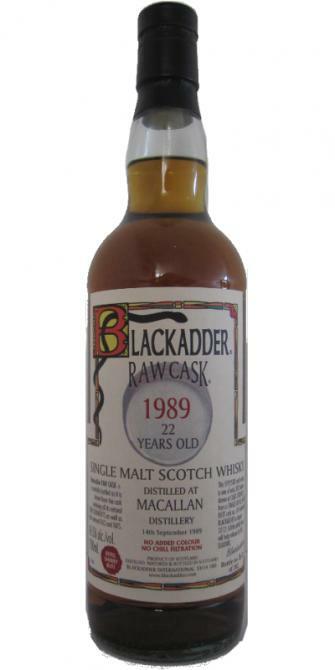 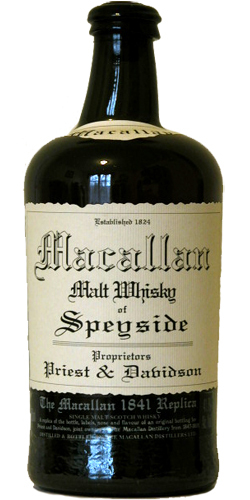 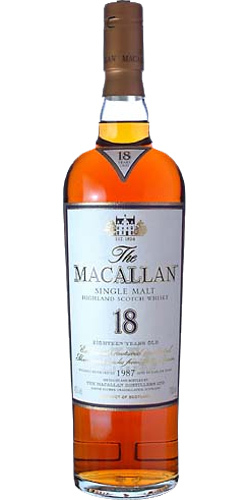 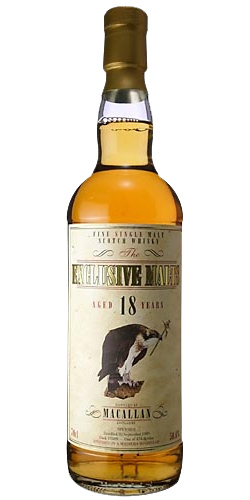 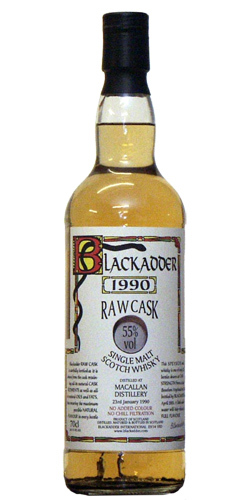 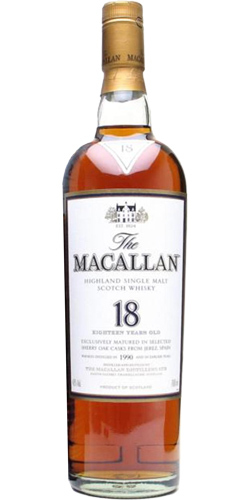 Macallan 16-year-old BSW 16 46.0 % Vol. 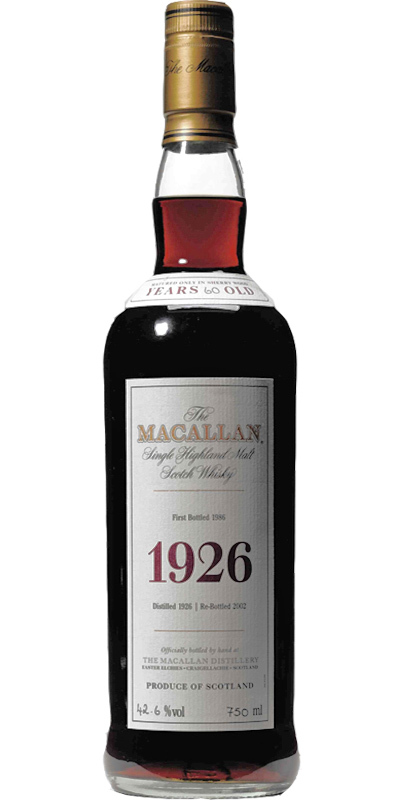 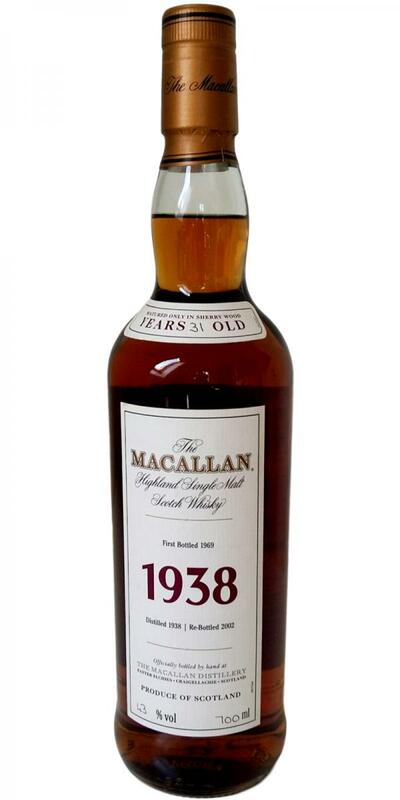 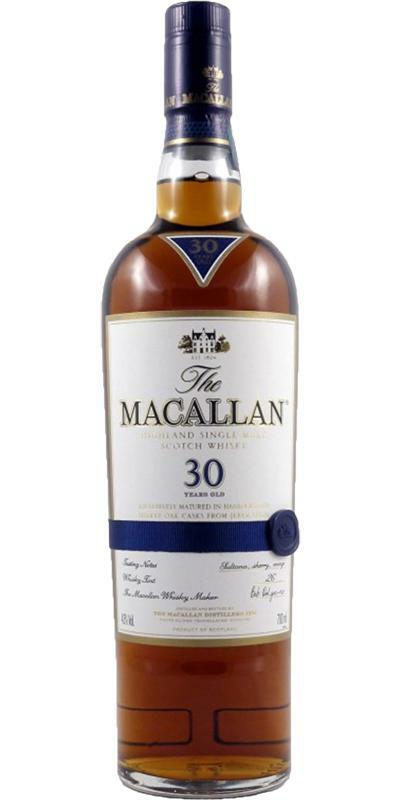 Macallan 1936 BR 43.0 % Vol. 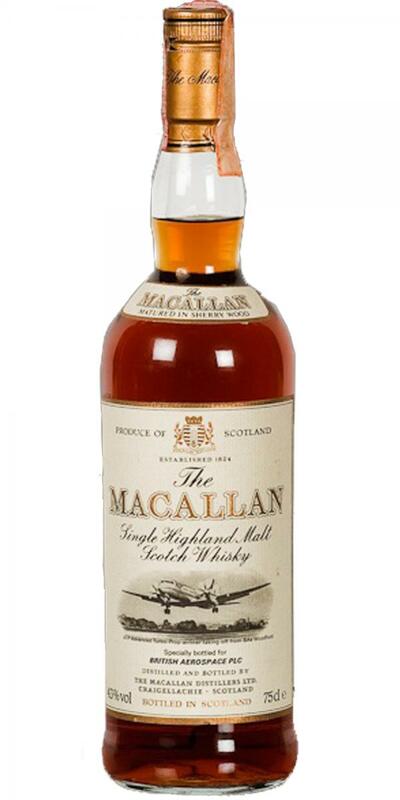 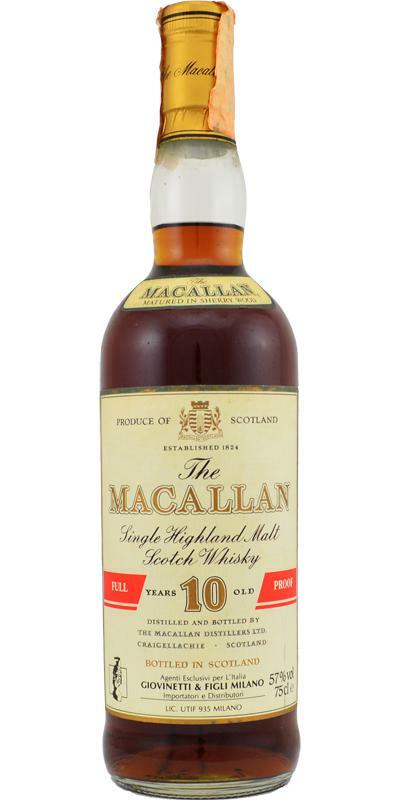 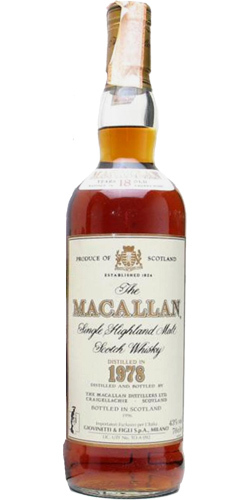 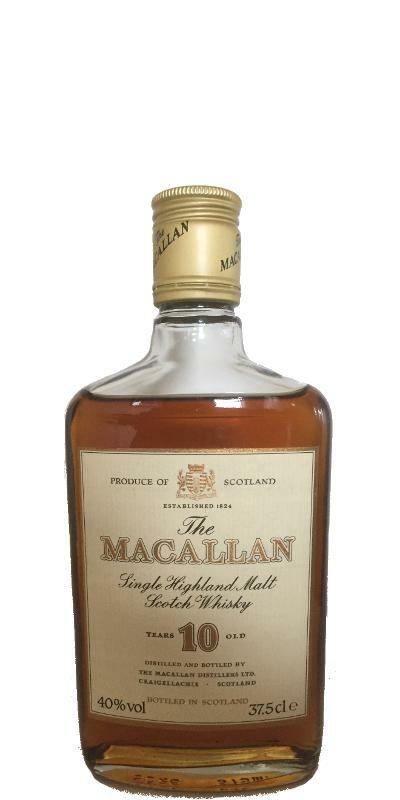 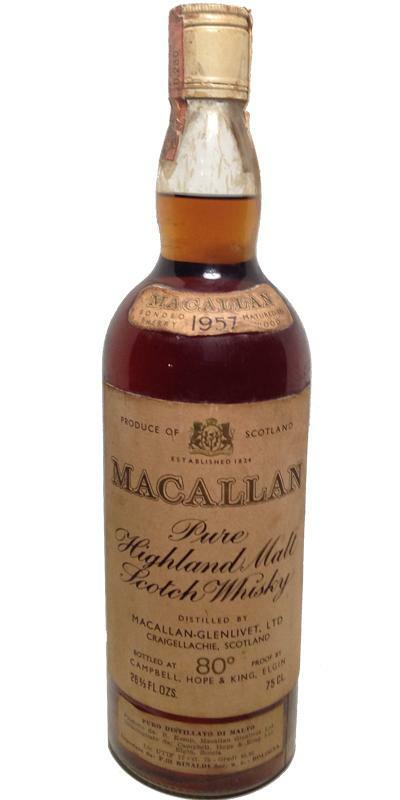 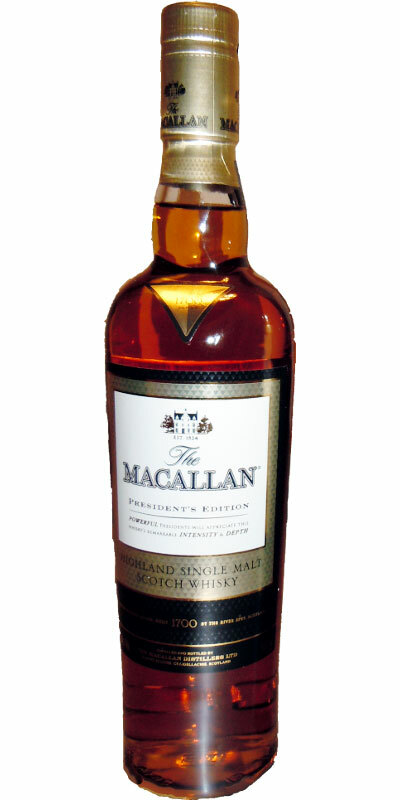 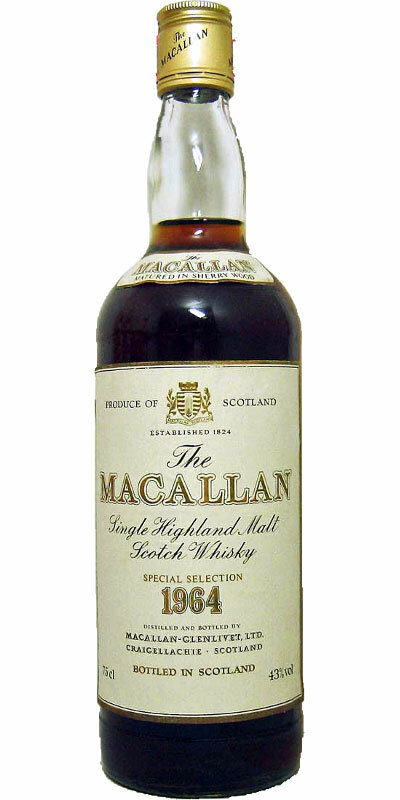 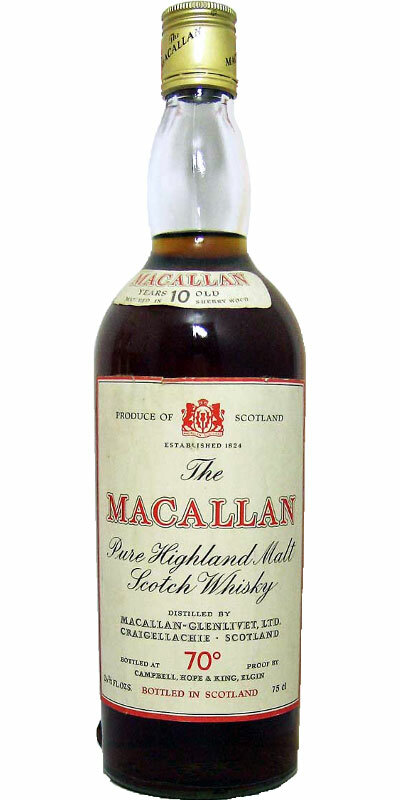 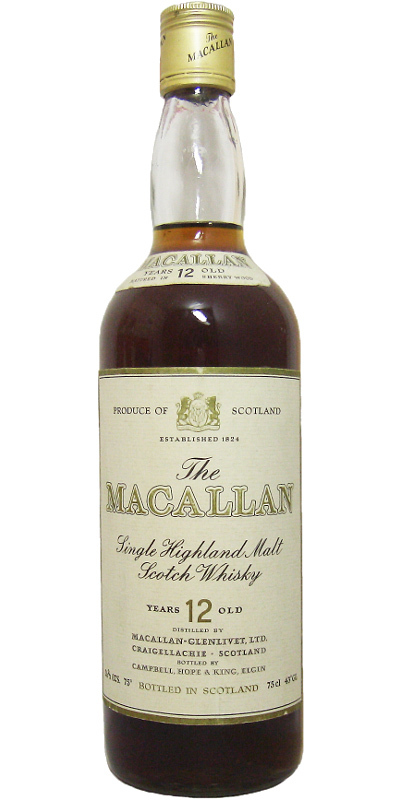 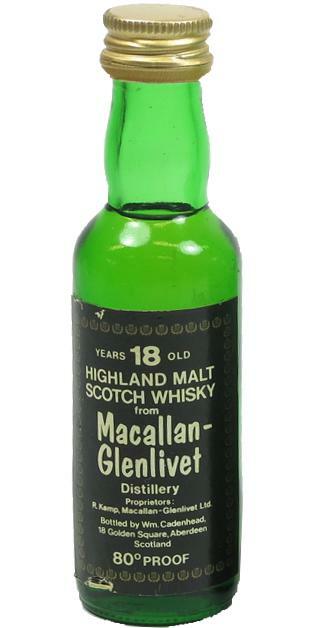 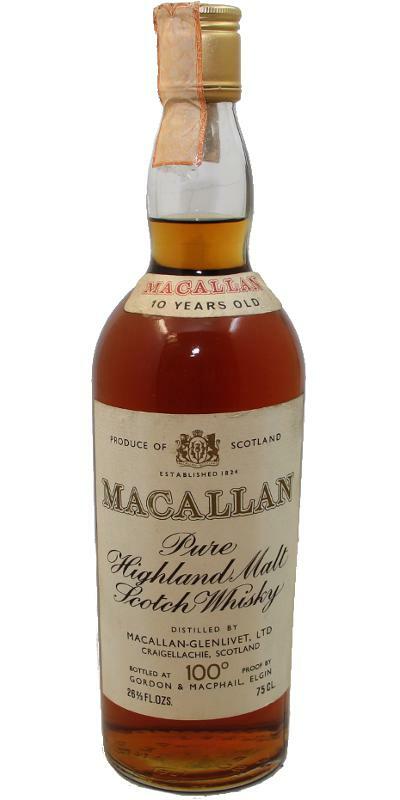 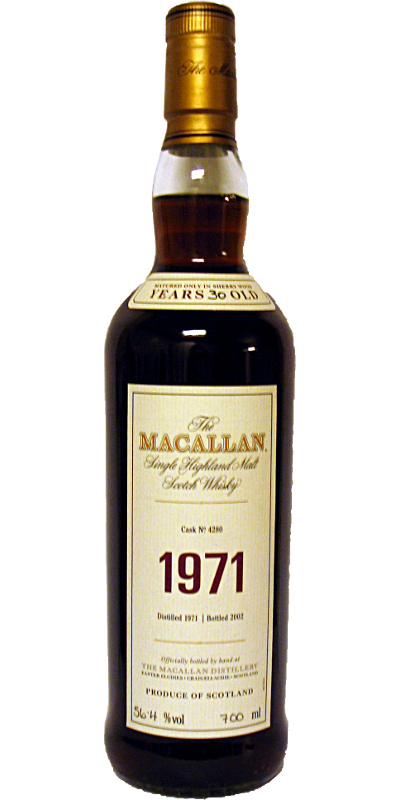 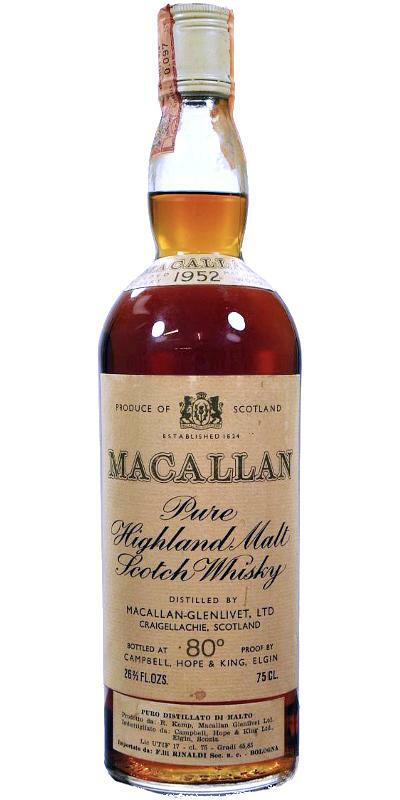 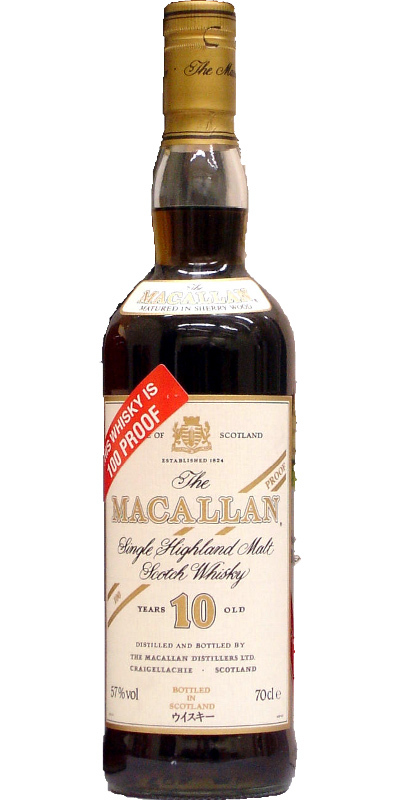 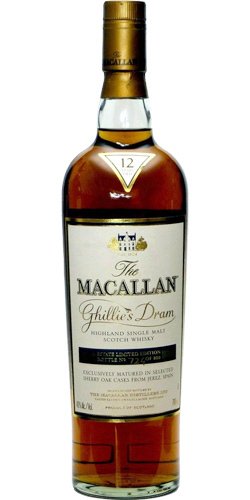 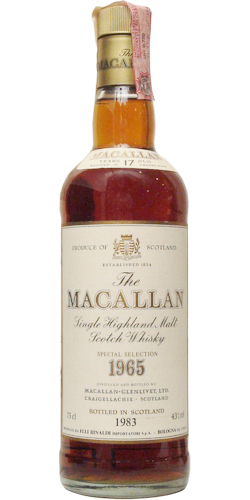 Macallan 1968 BR 43.0 % Vol. 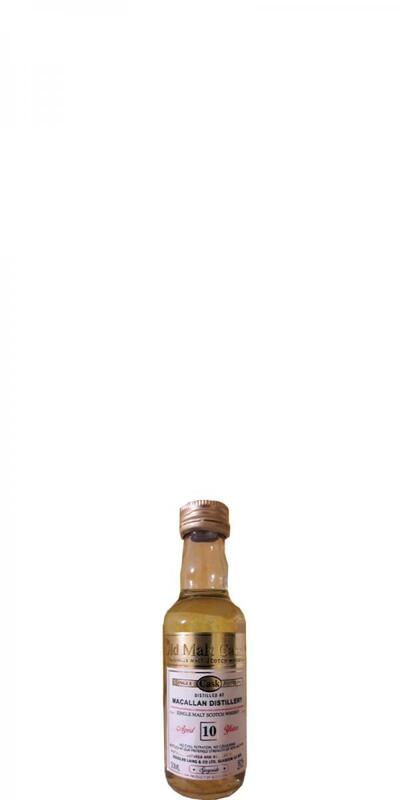 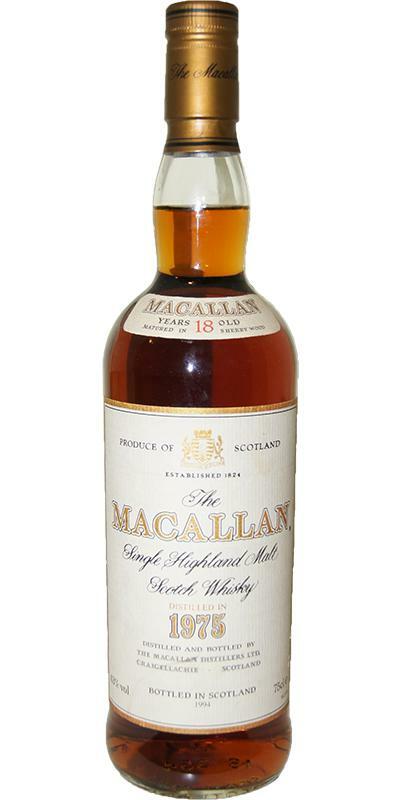 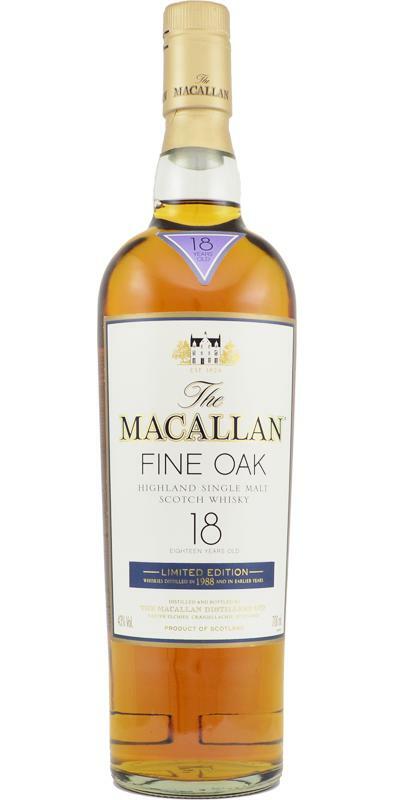 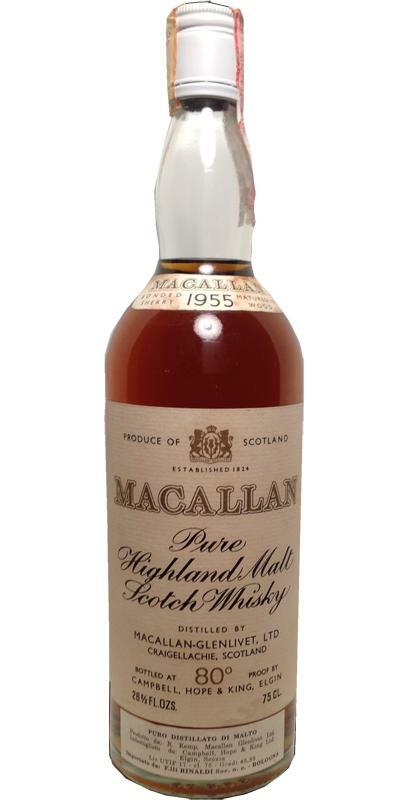 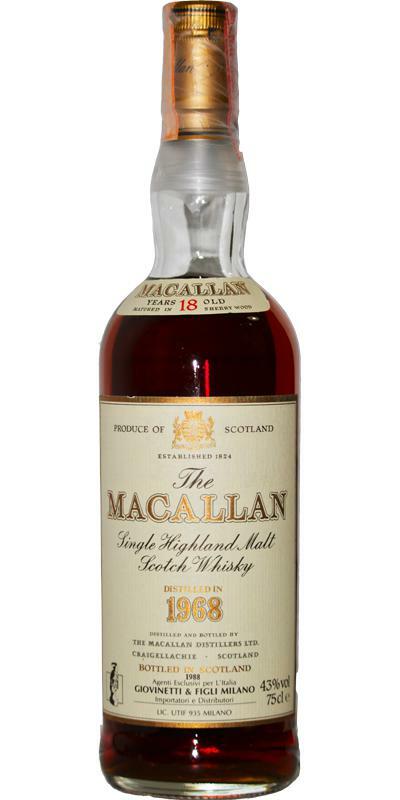 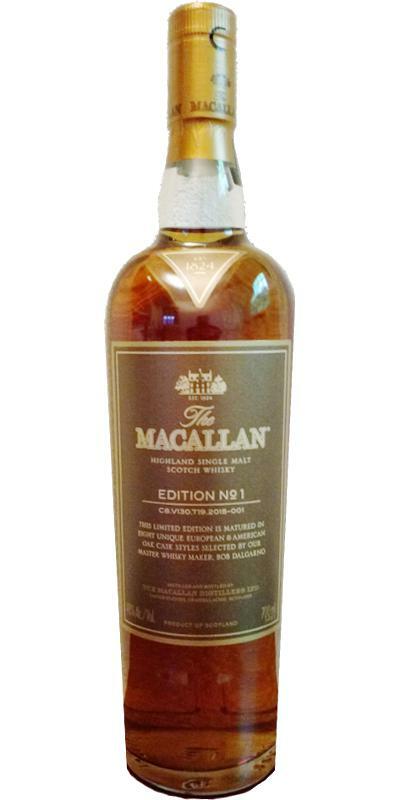 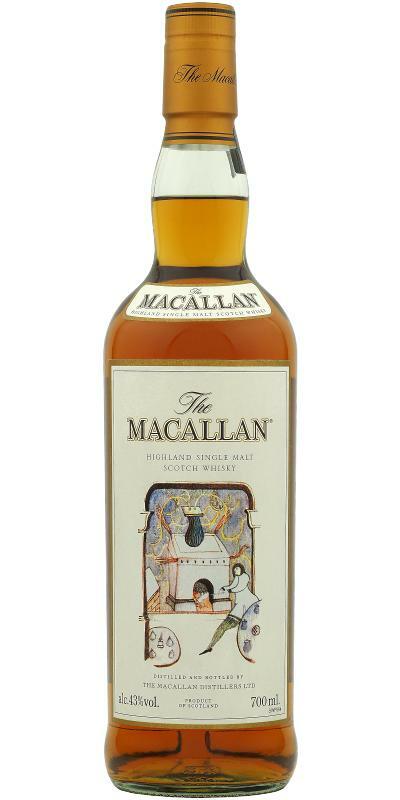 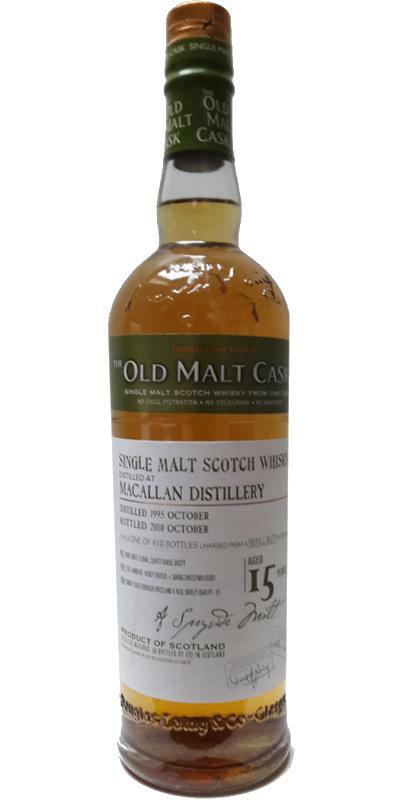 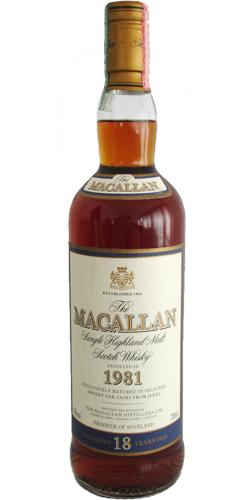 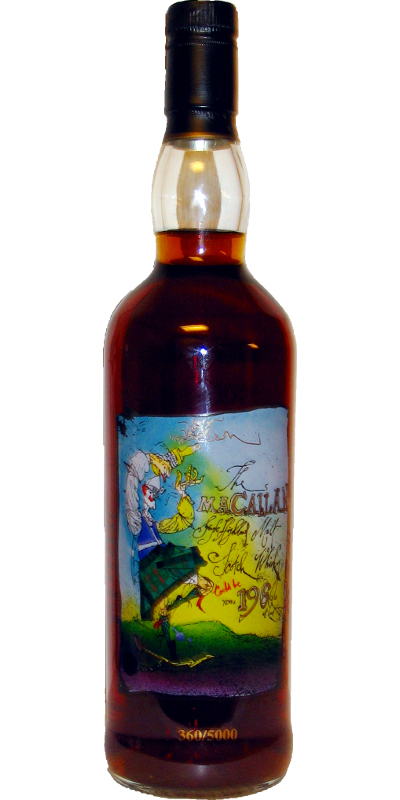 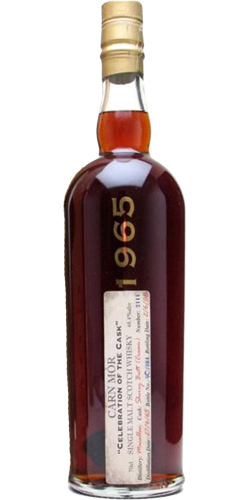 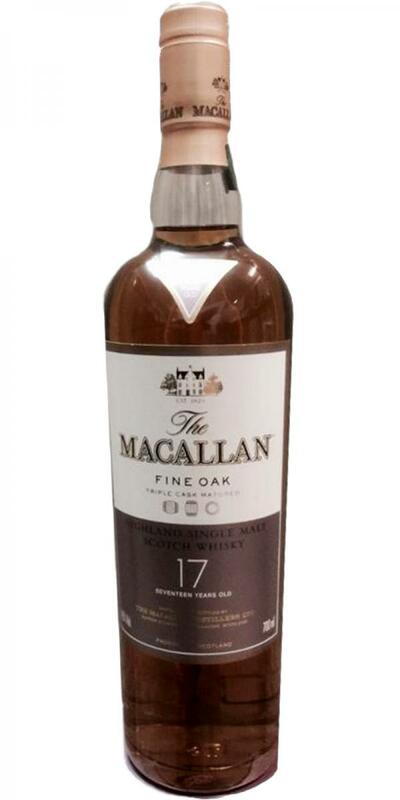 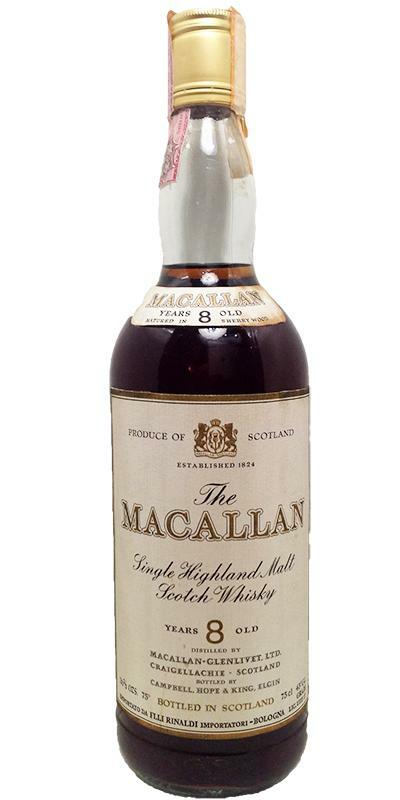 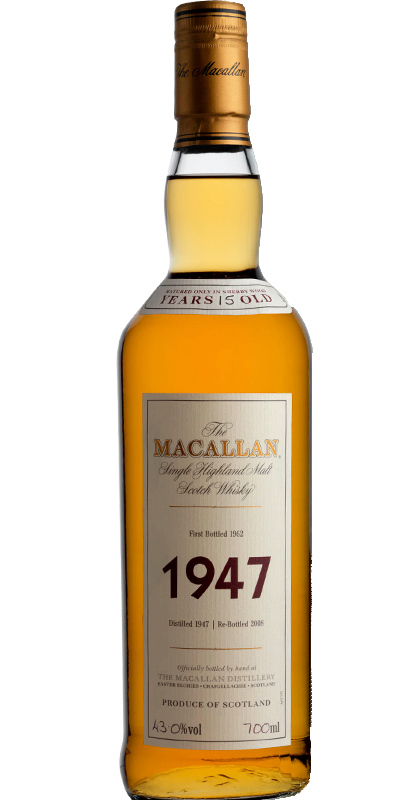 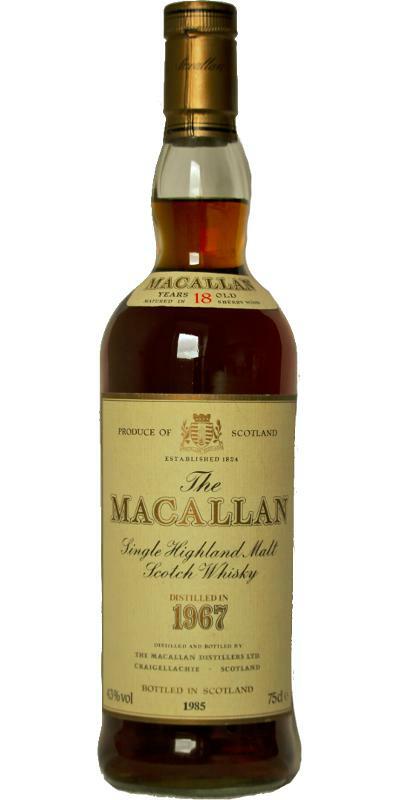 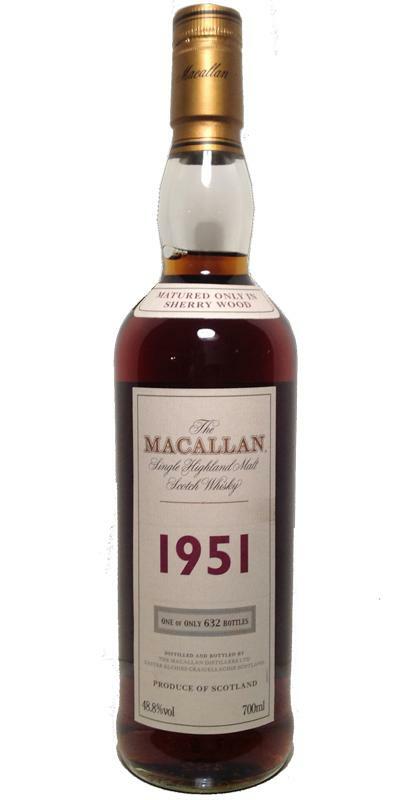 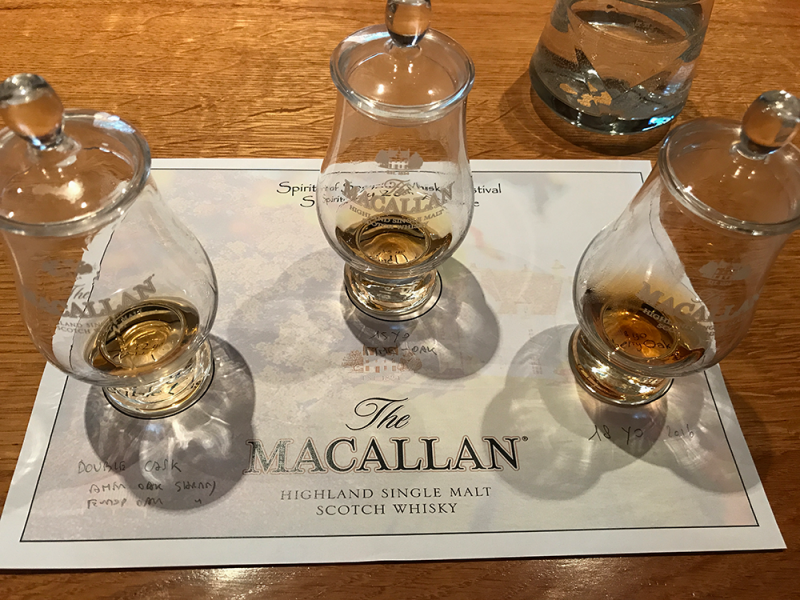 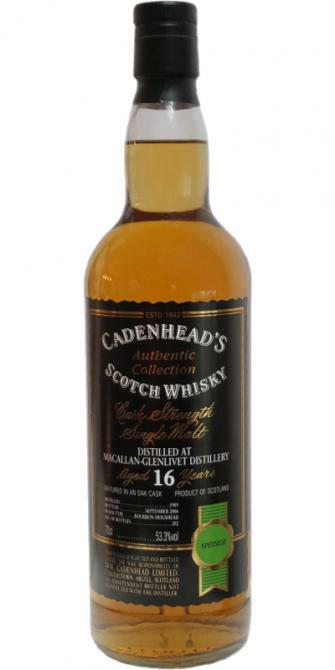 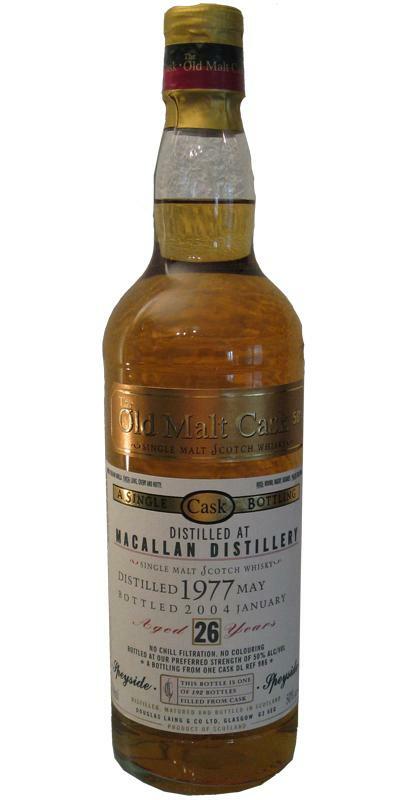 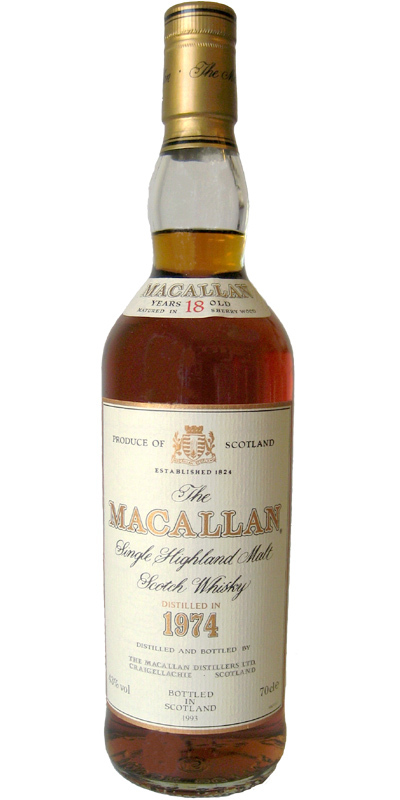 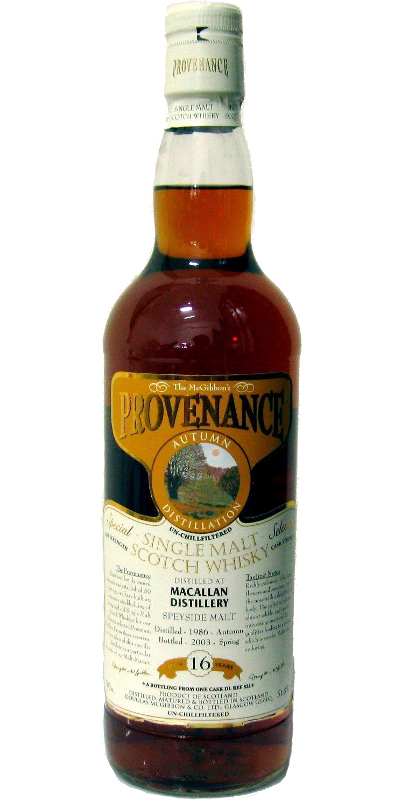 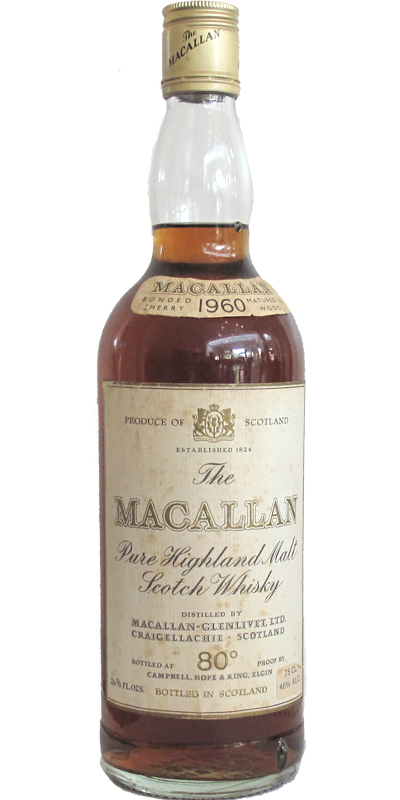 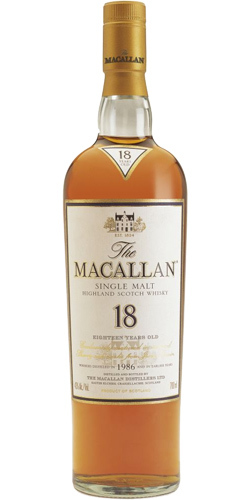 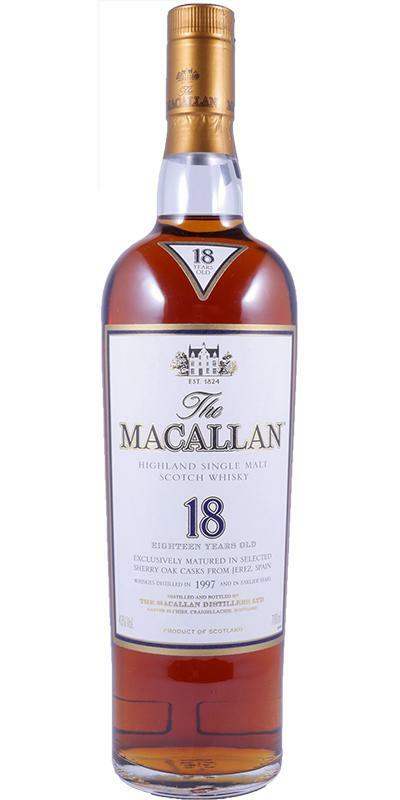 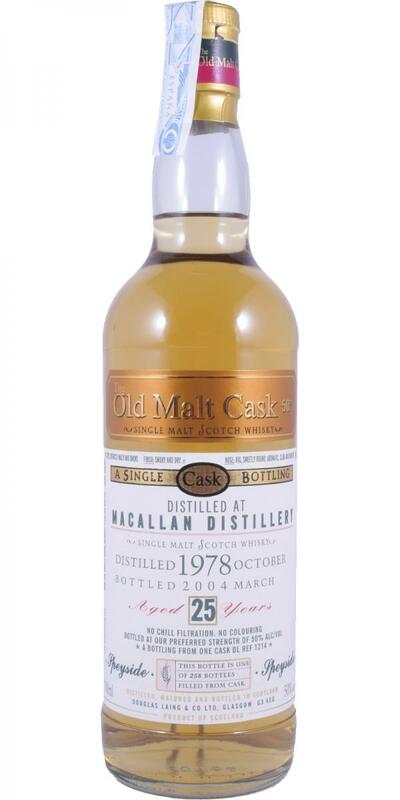 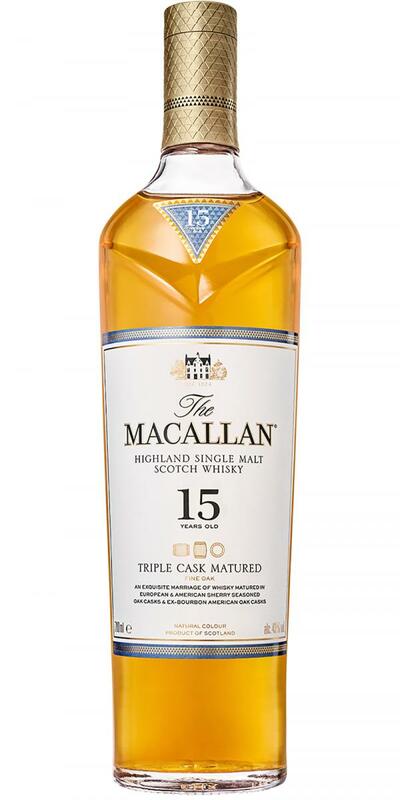 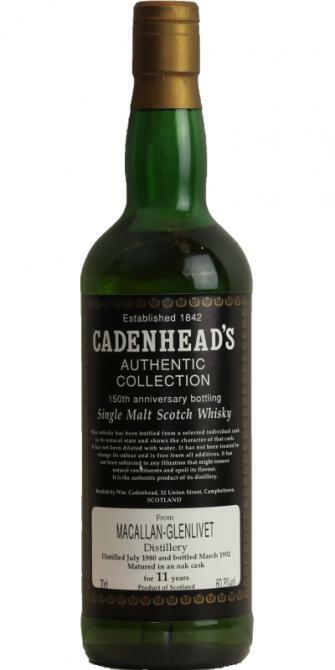 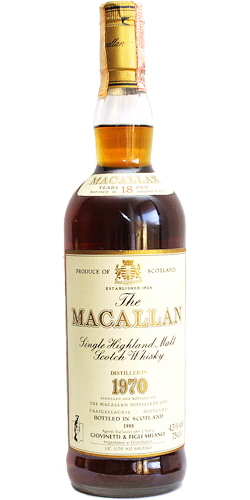 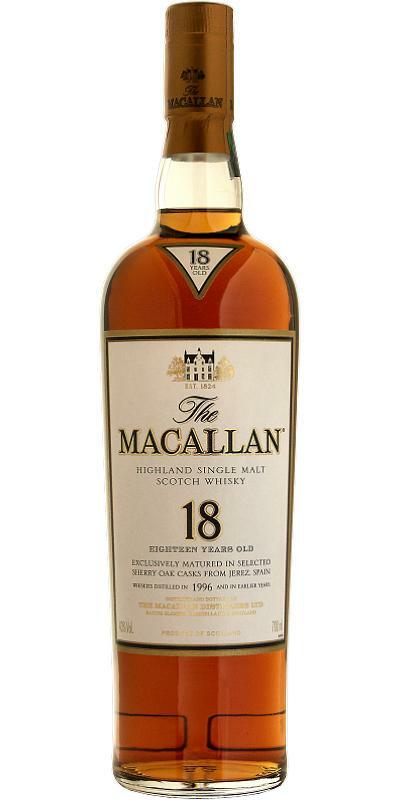 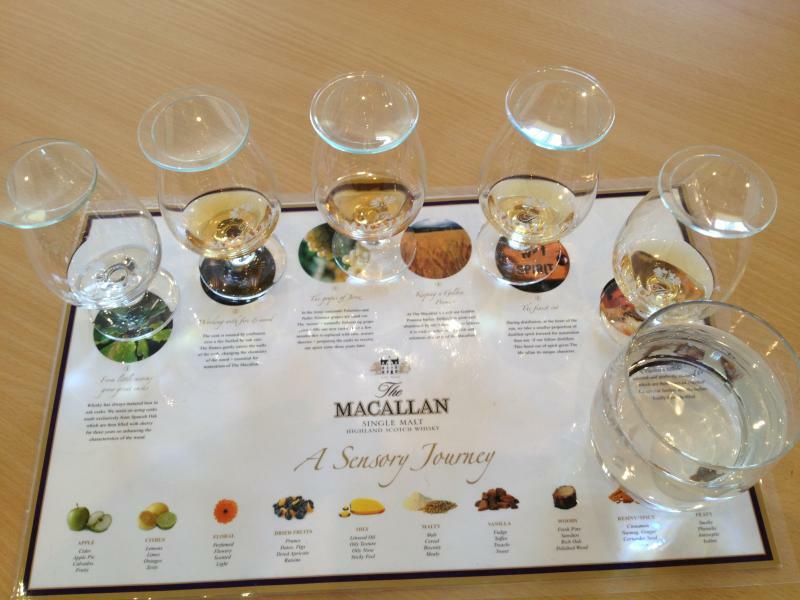 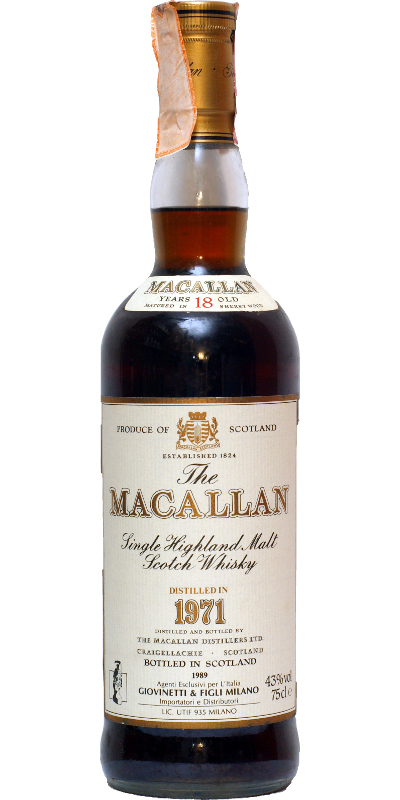 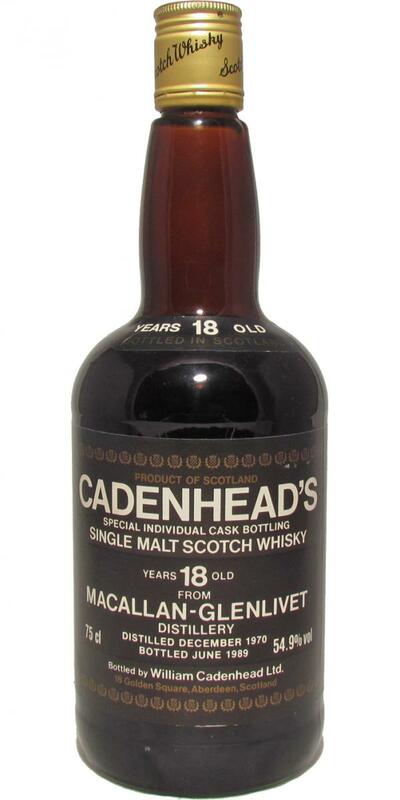 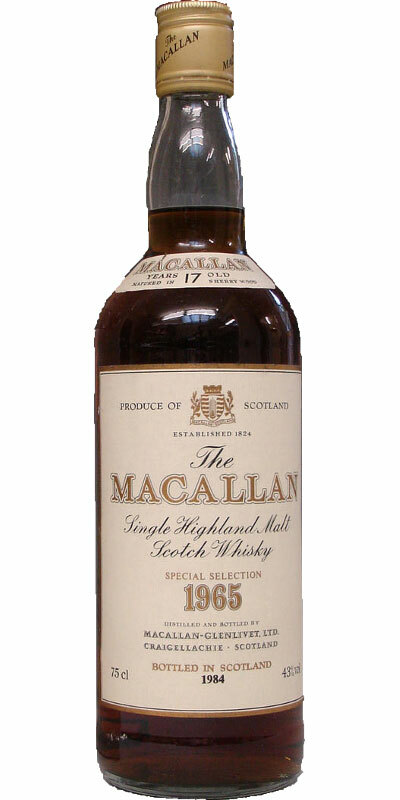 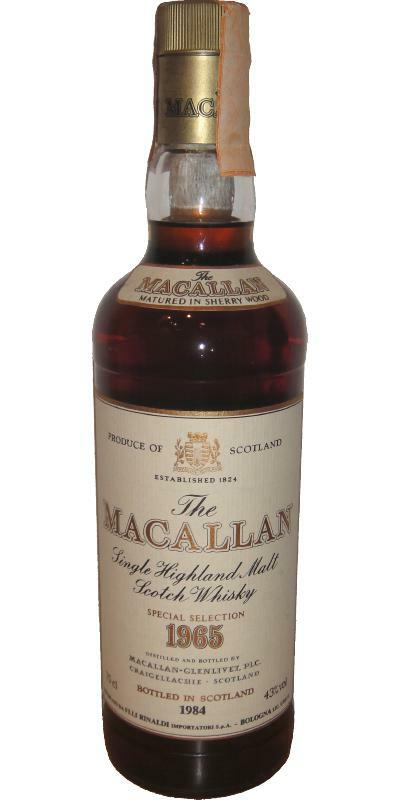 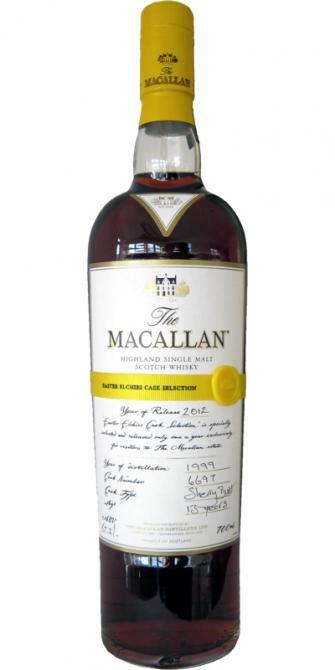 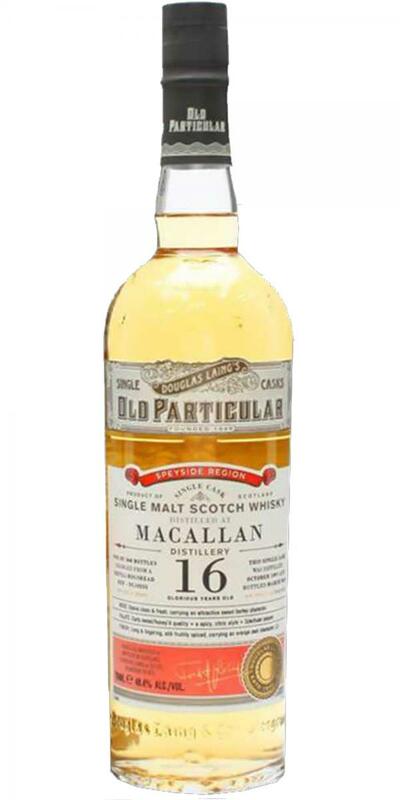 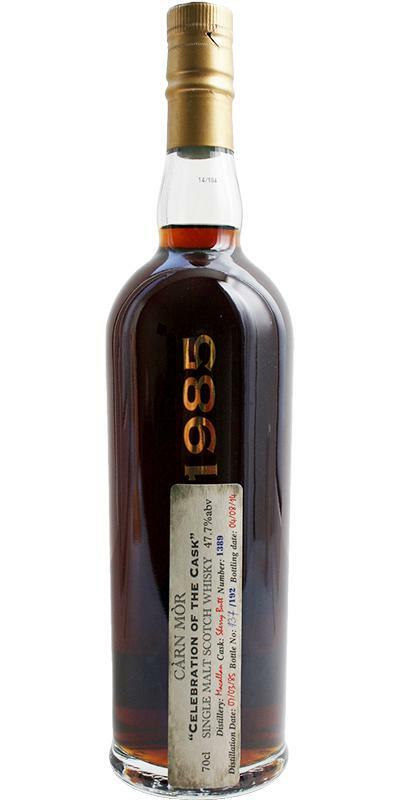 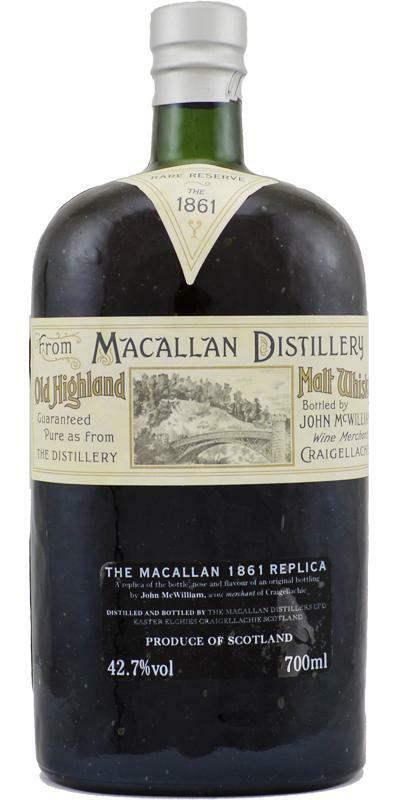 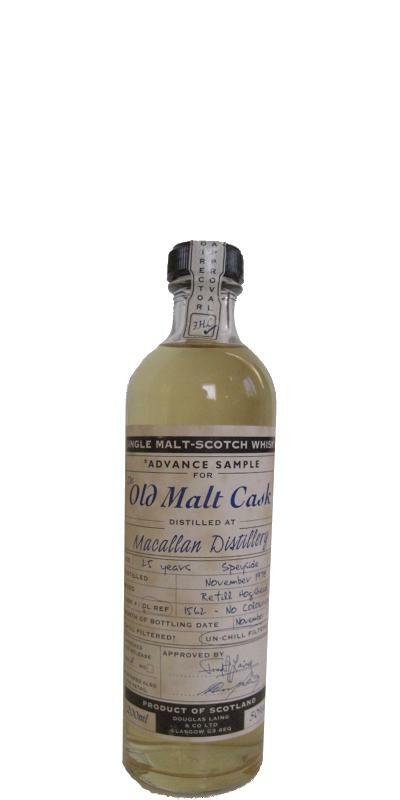 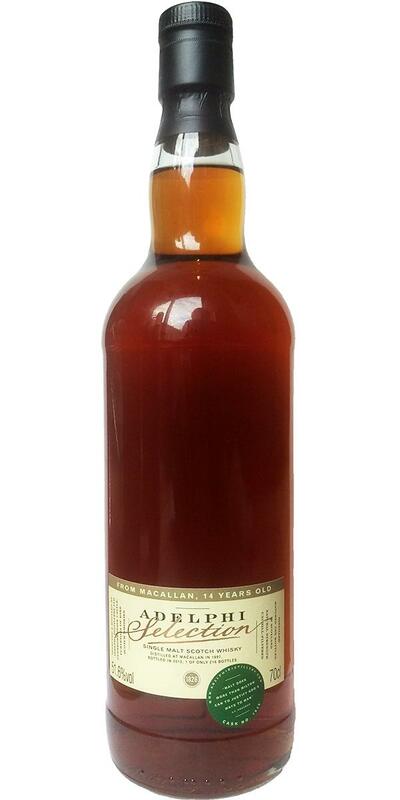 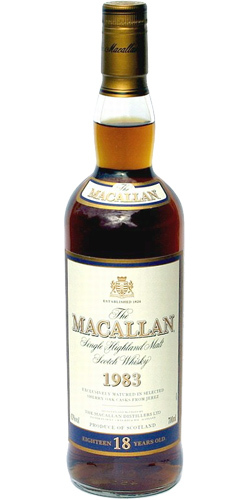 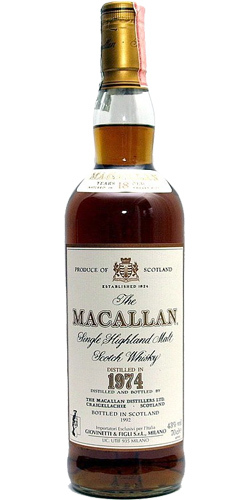 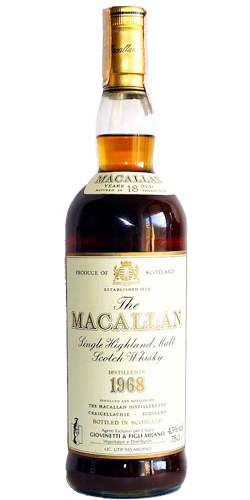 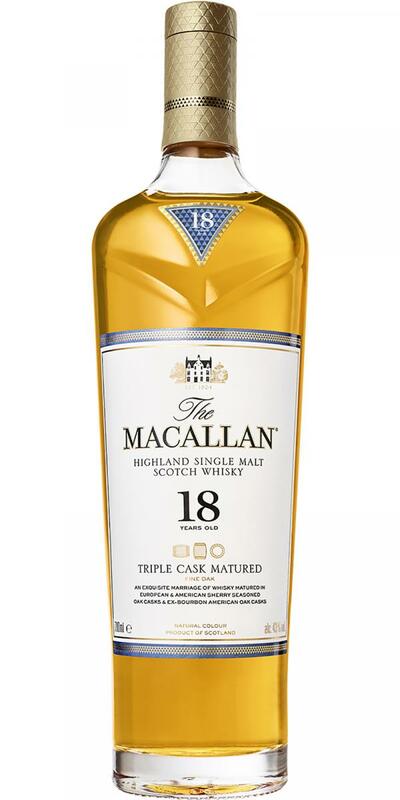 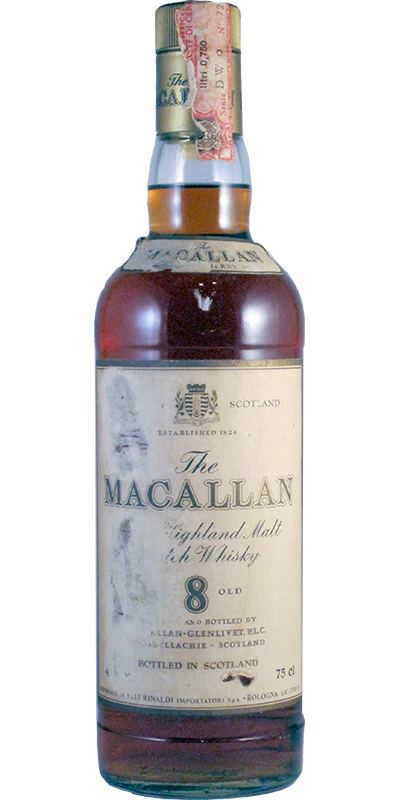 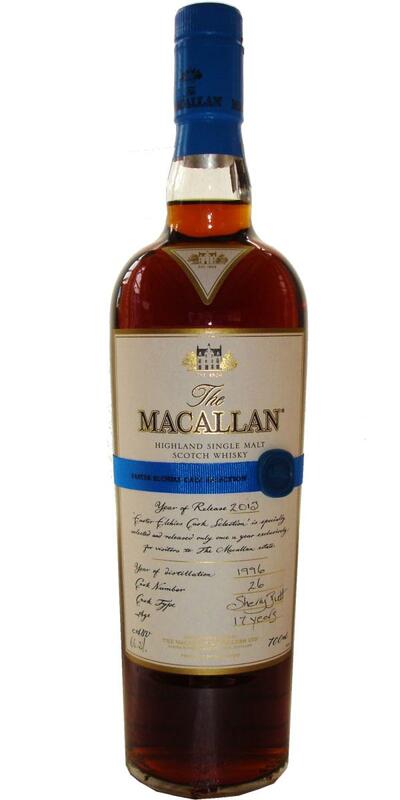 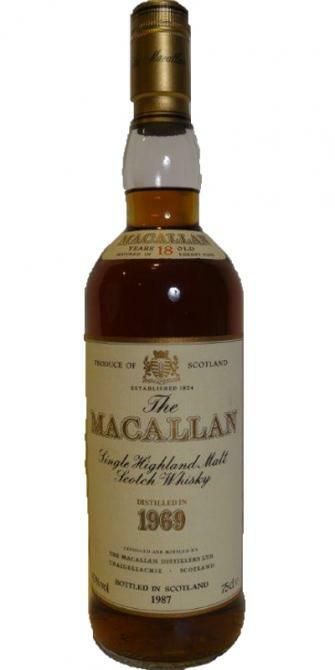 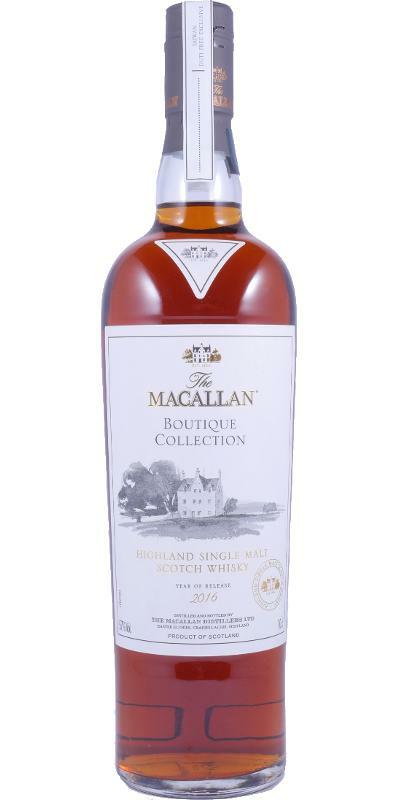 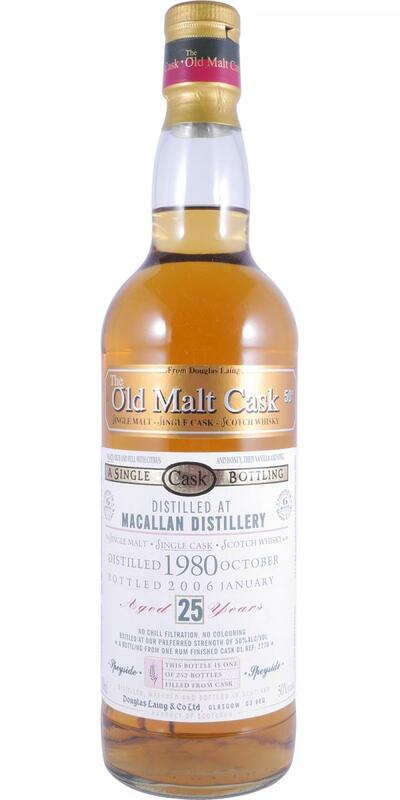 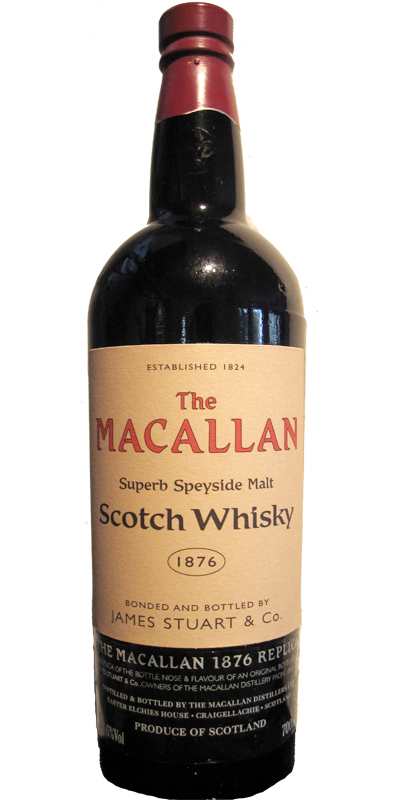 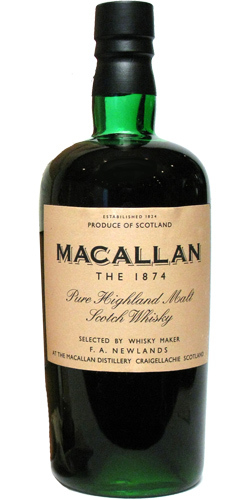 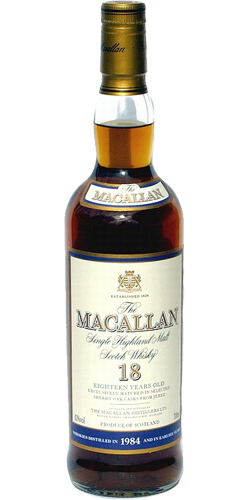 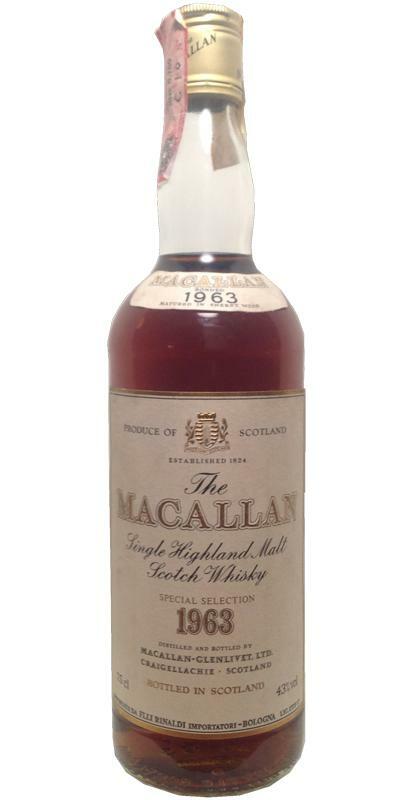 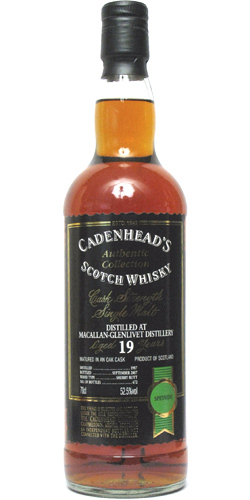 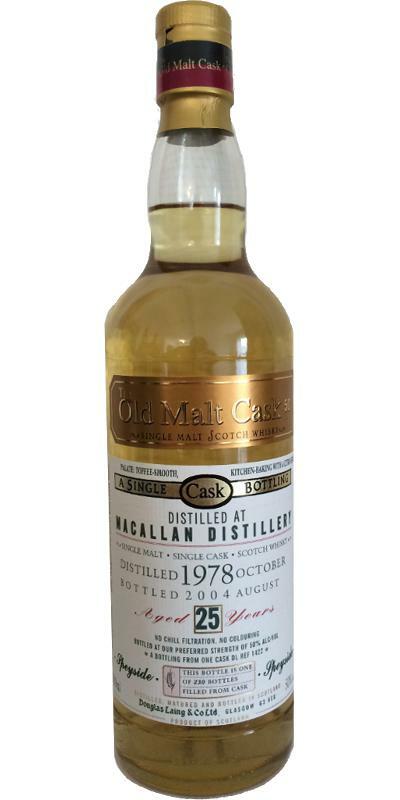 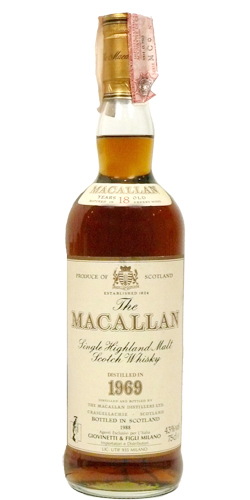 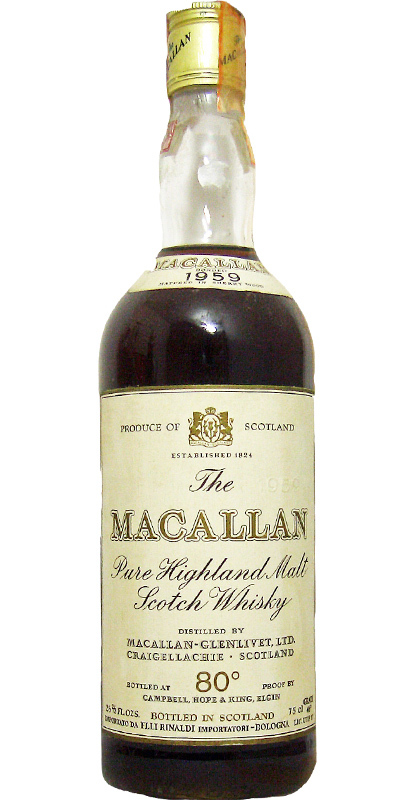 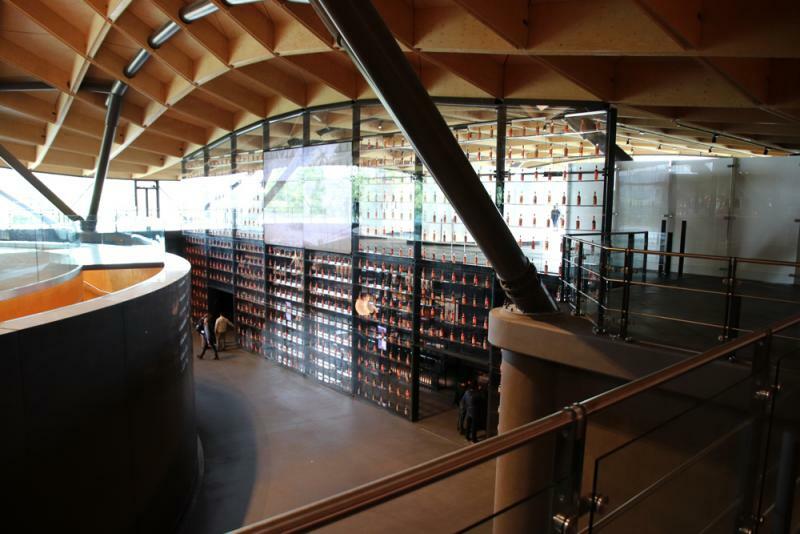 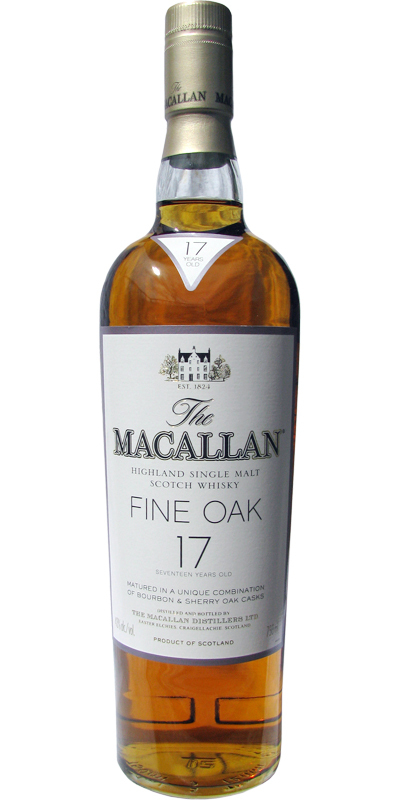 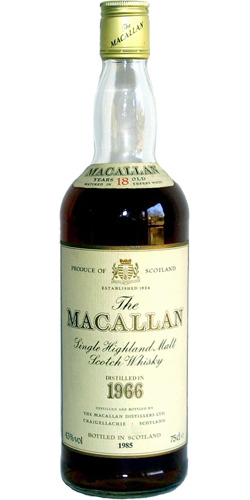 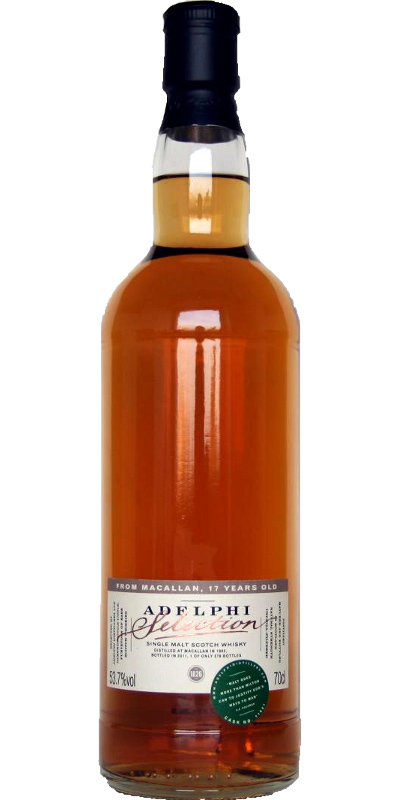 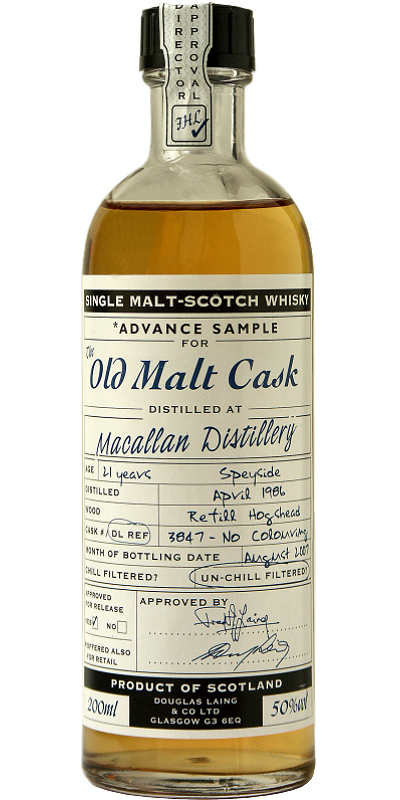 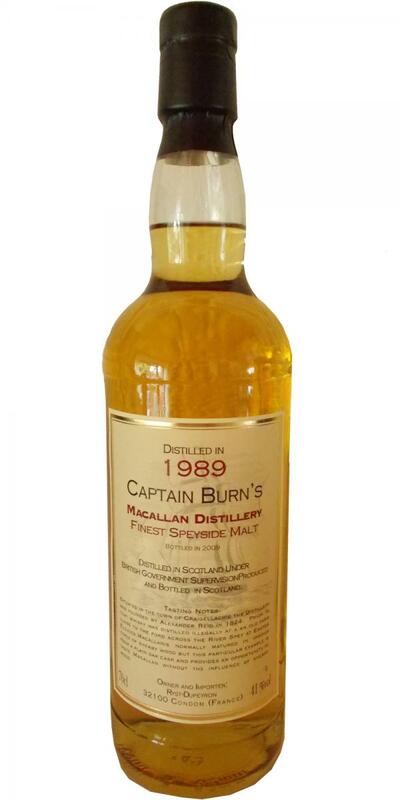 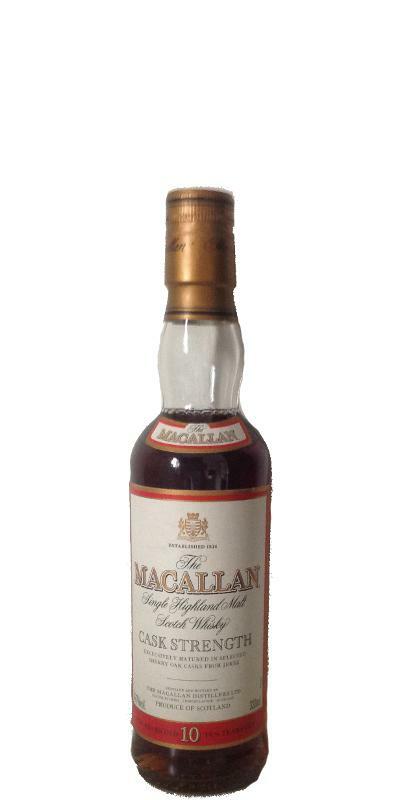 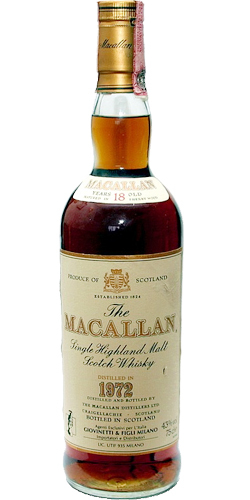 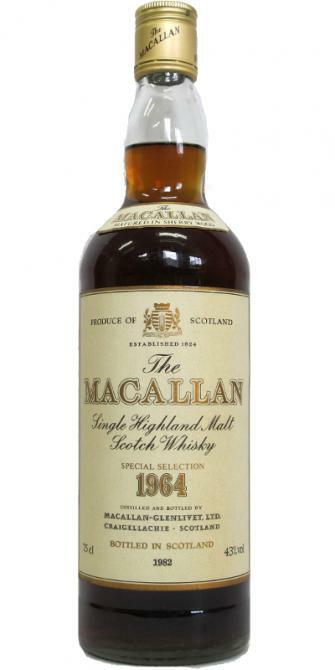 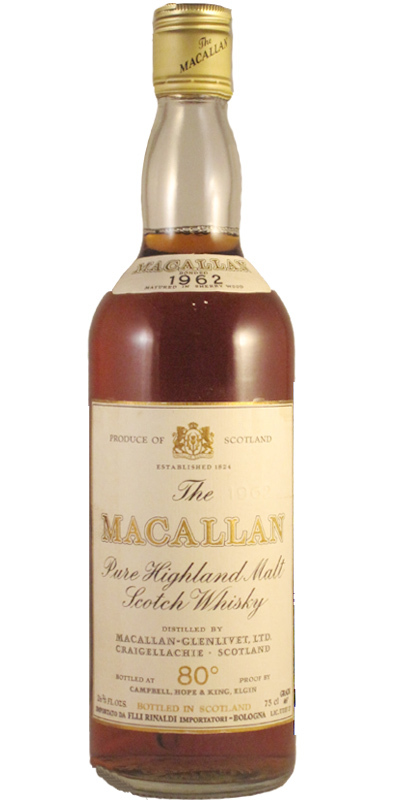 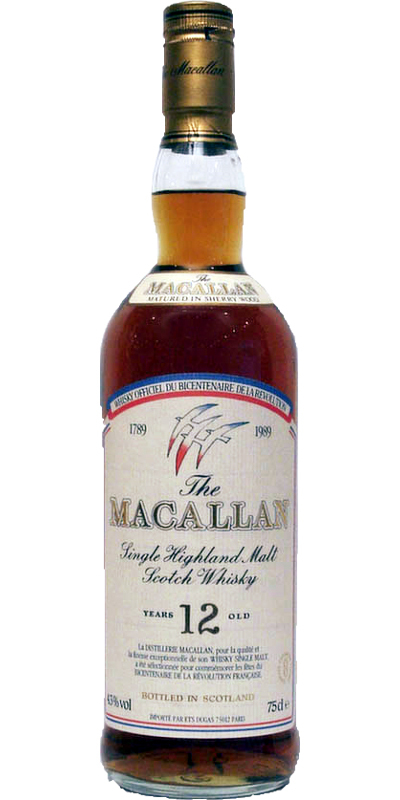 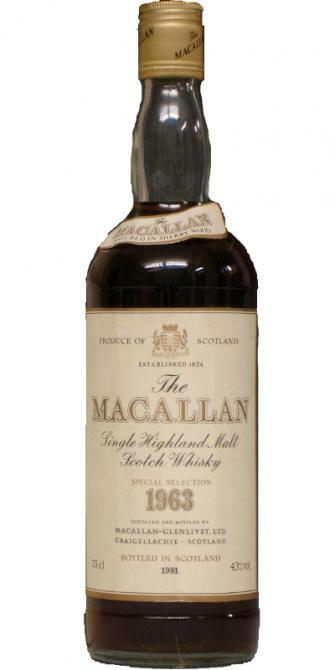 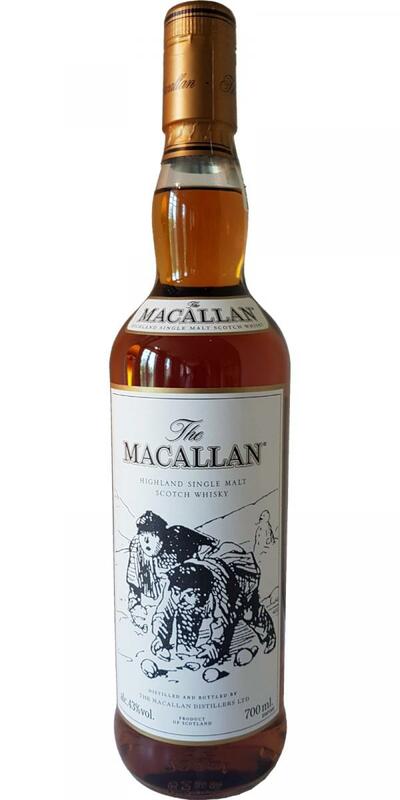 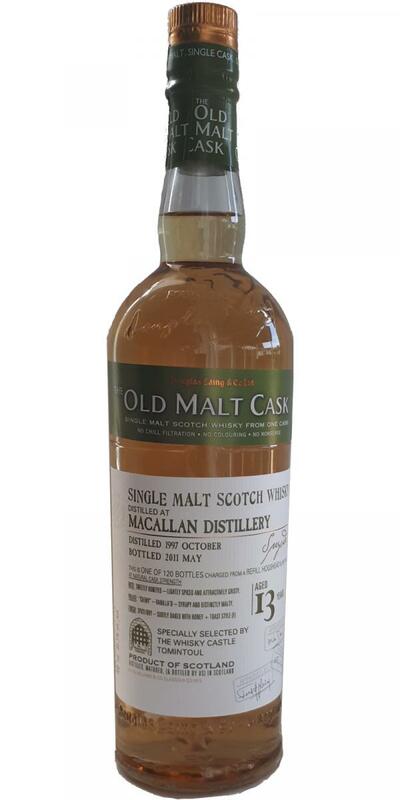 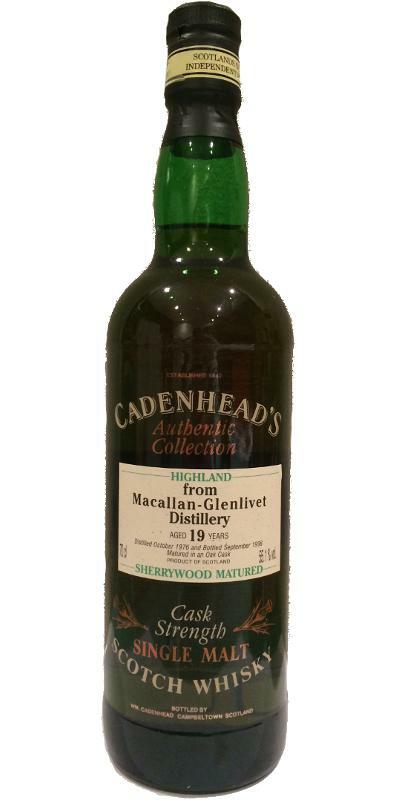 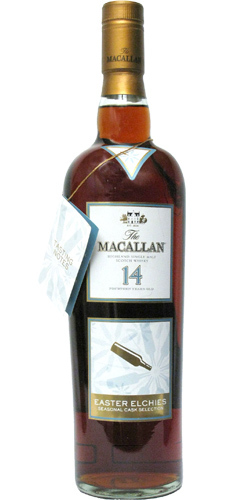 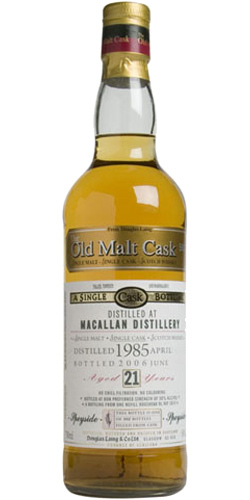 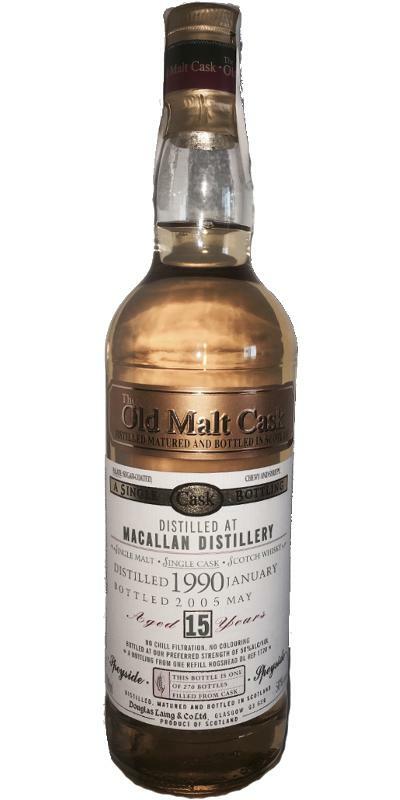 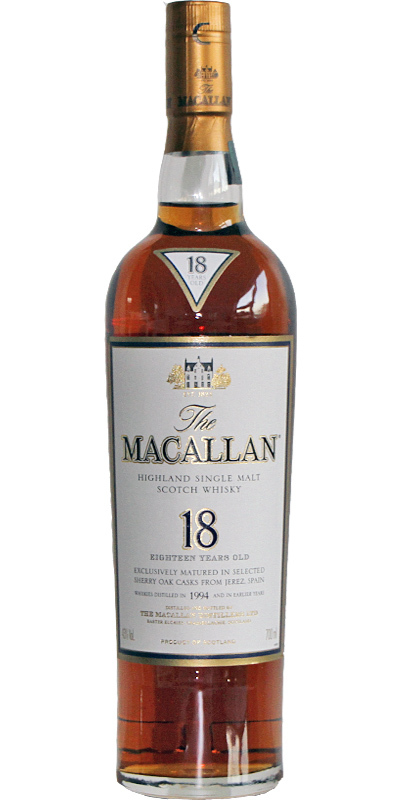 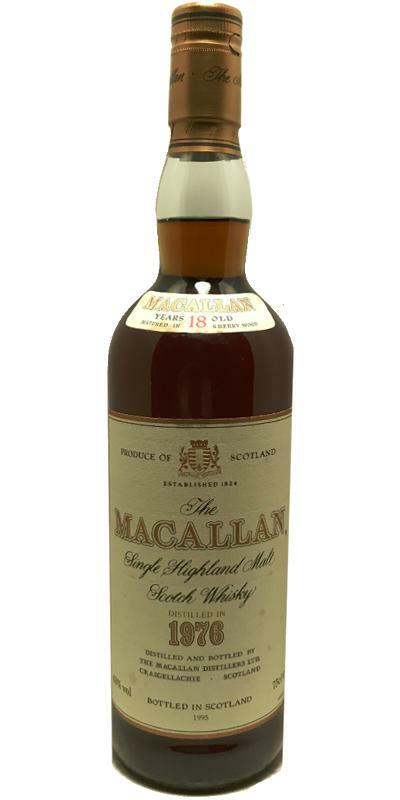 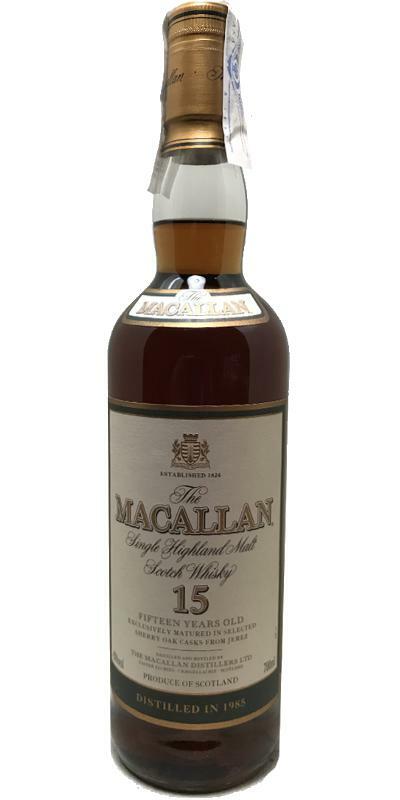 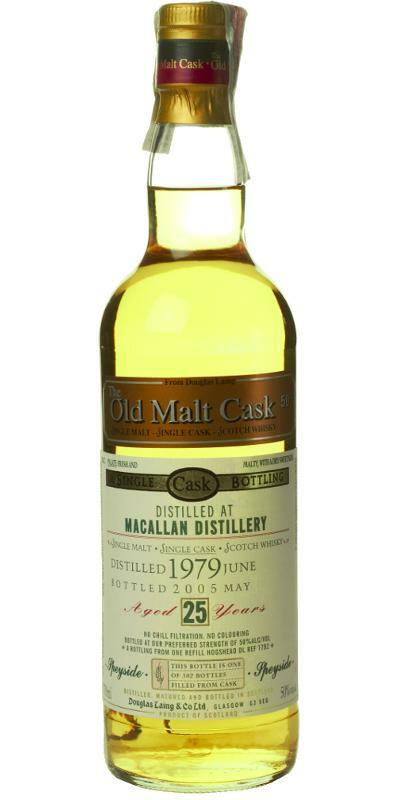 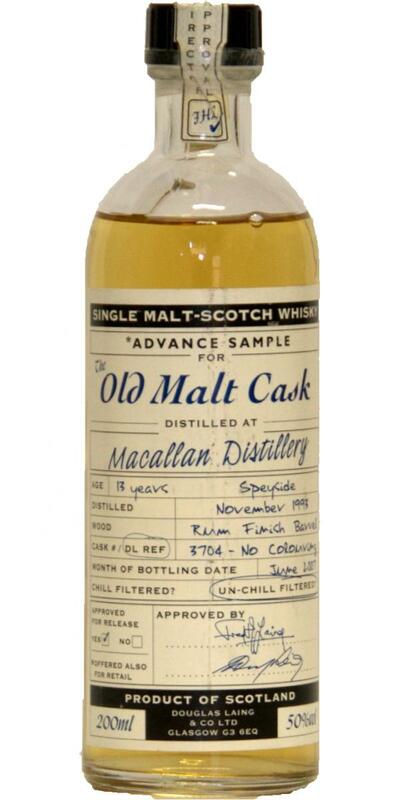 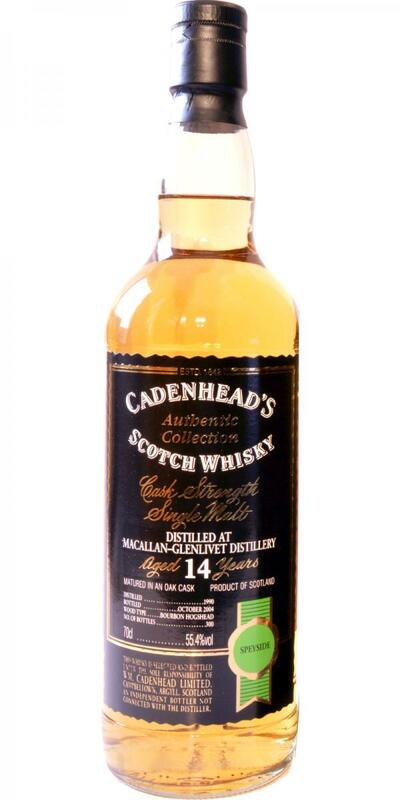 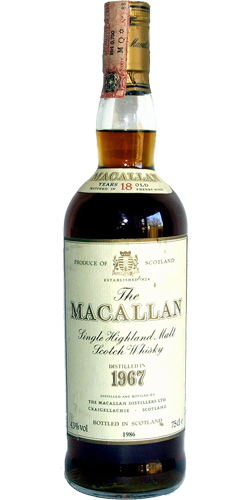 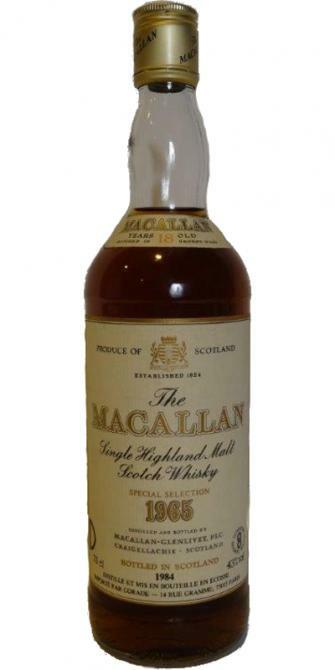 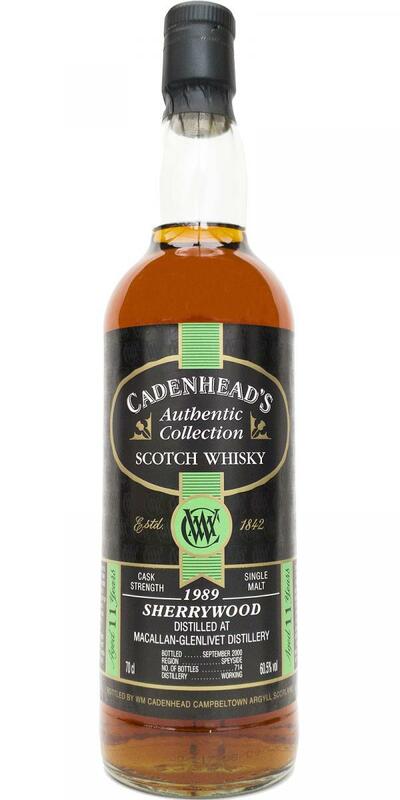 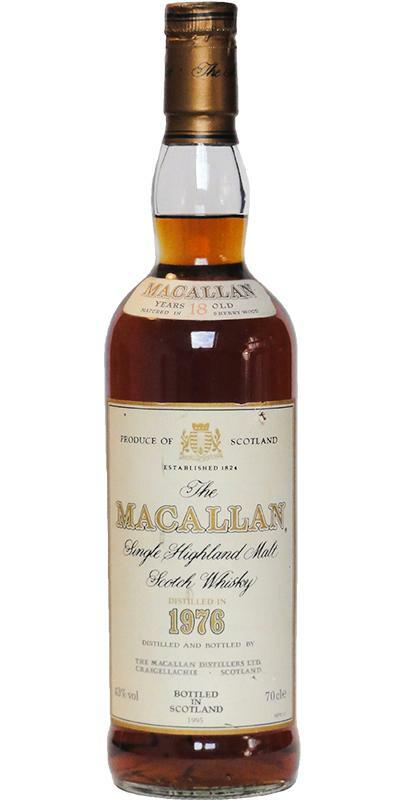 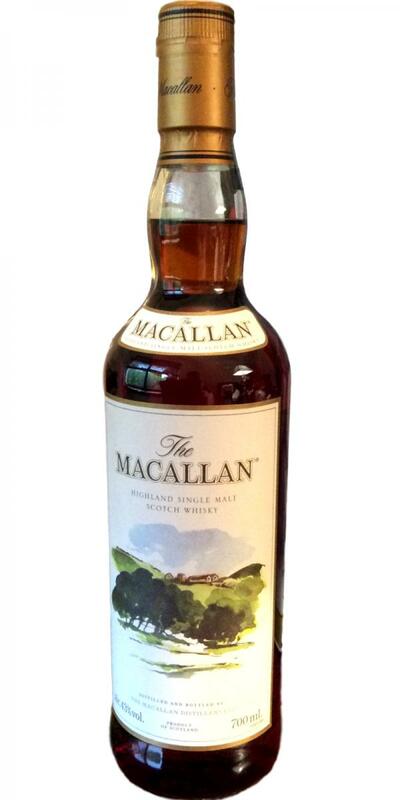 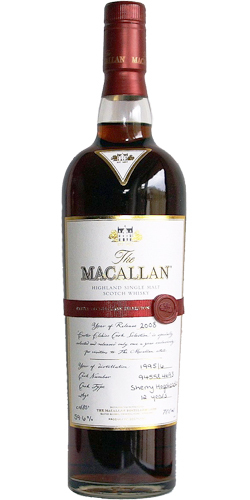 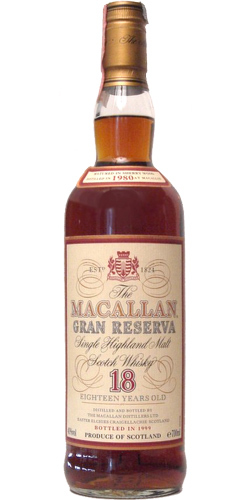 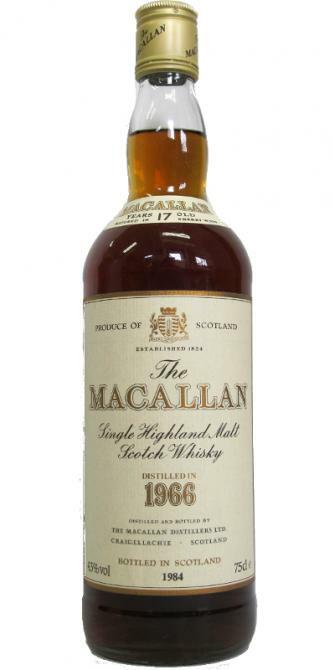 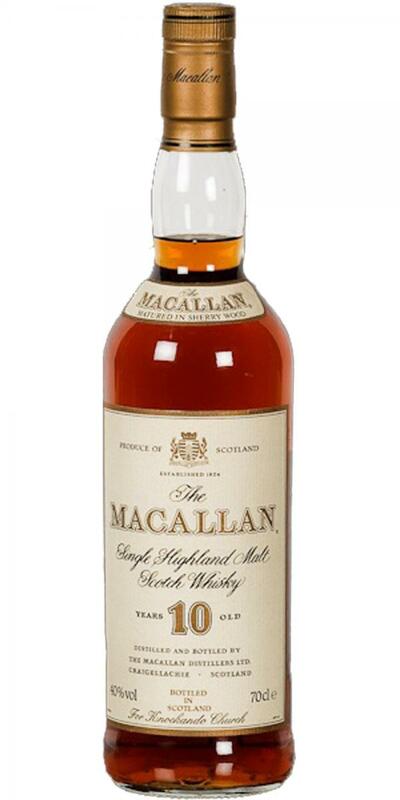 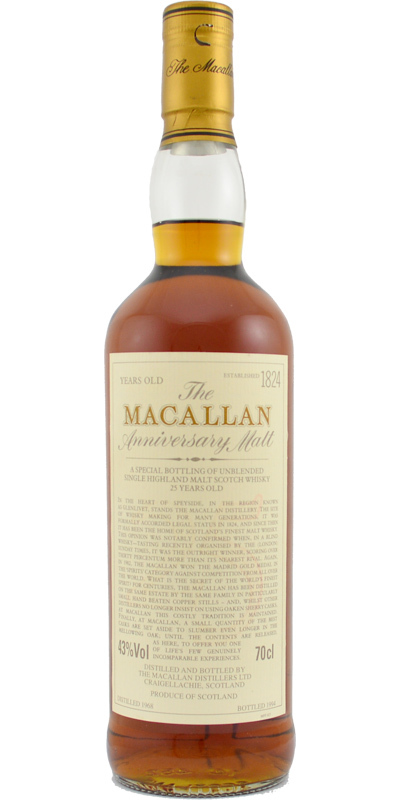 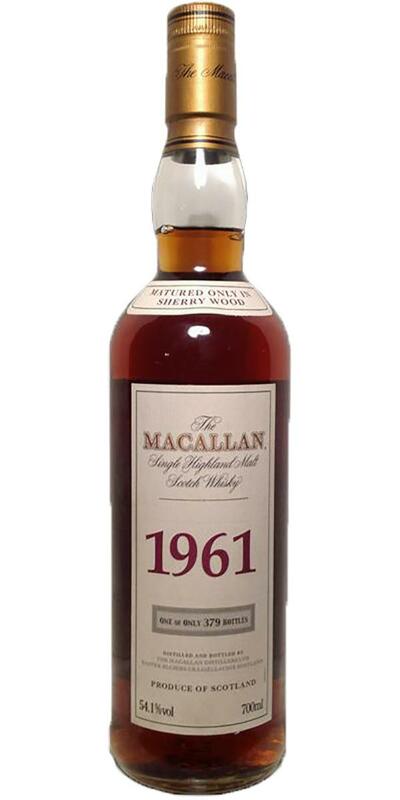 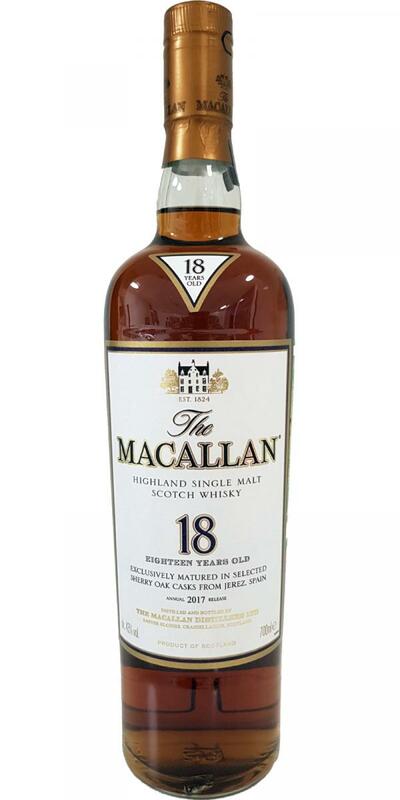 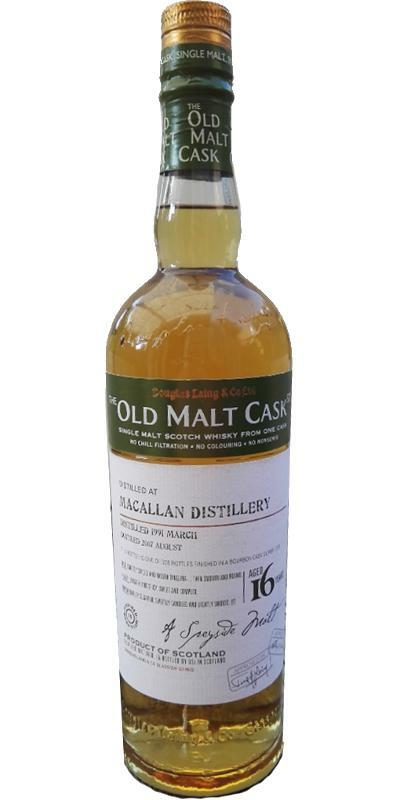 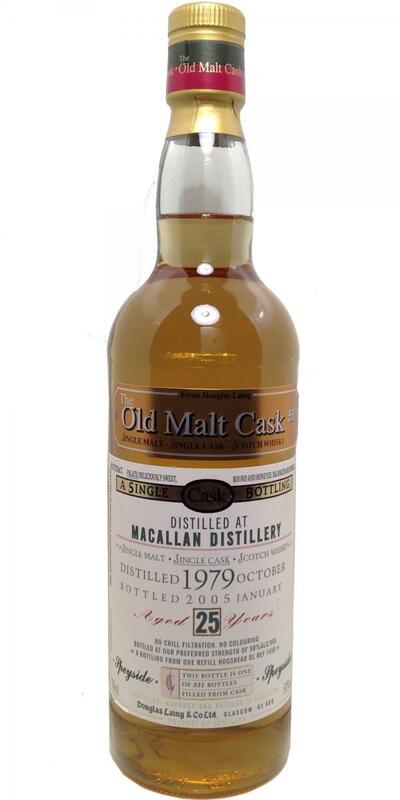 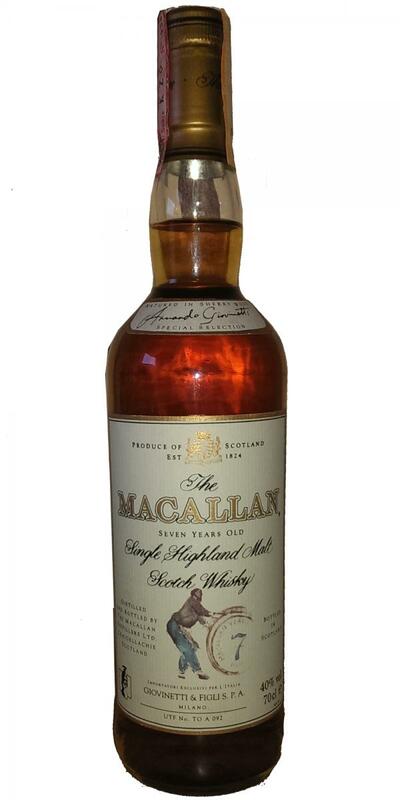 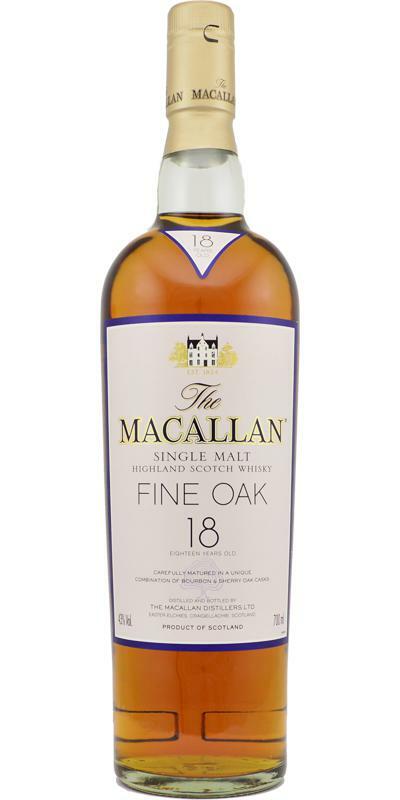 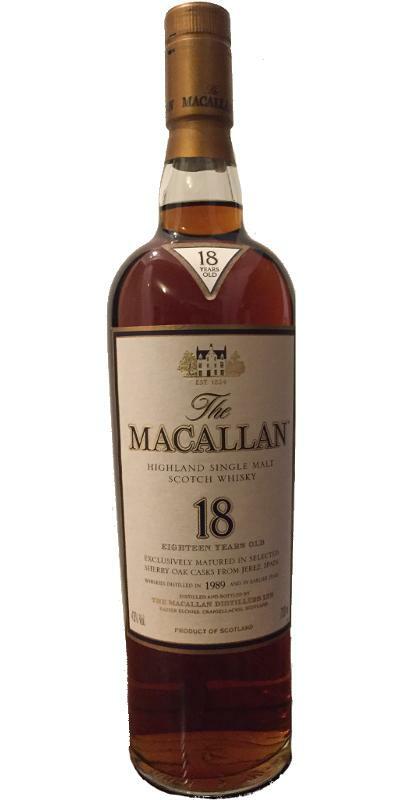 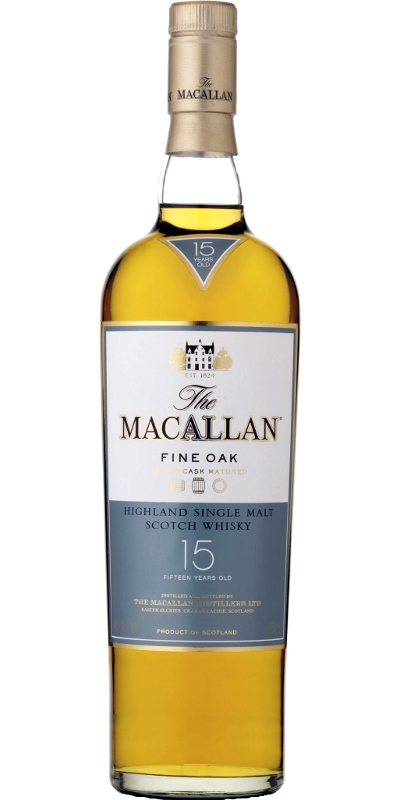 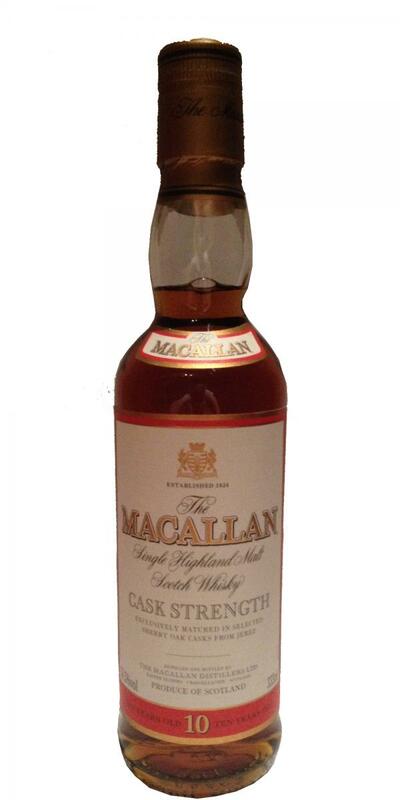 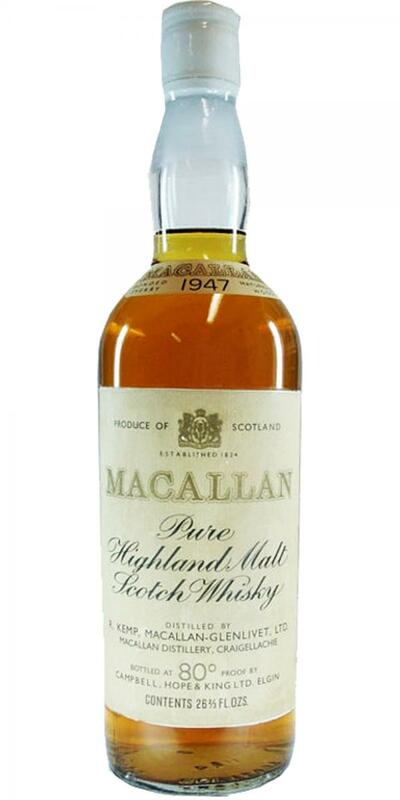 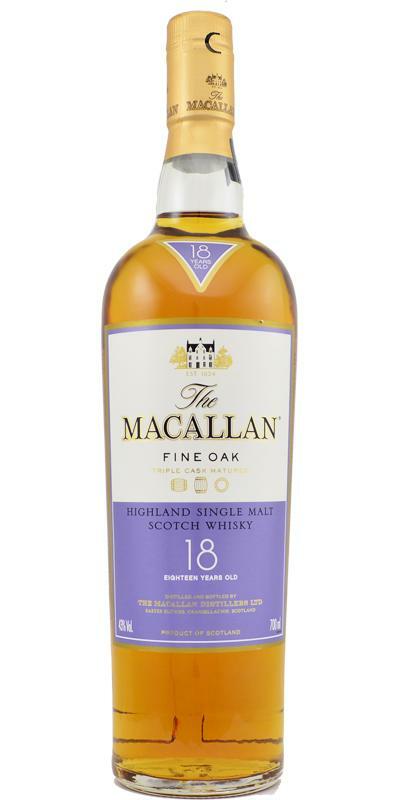 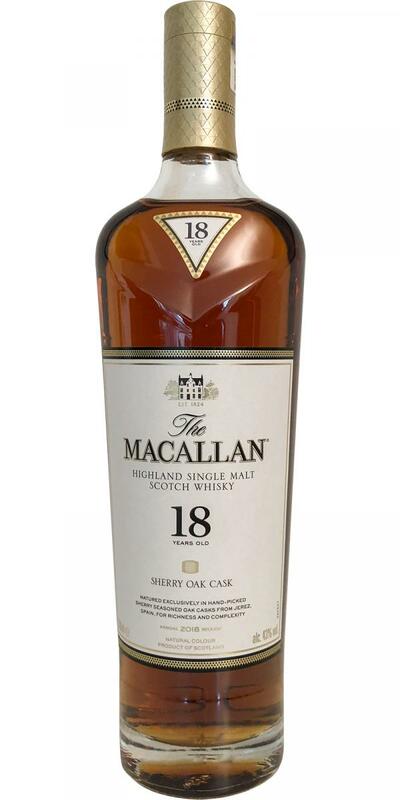 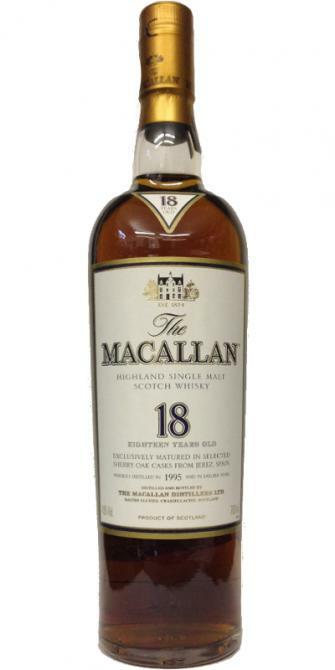 Macallan 16-year-old CA Original Collection 16 46.0 % Vol. 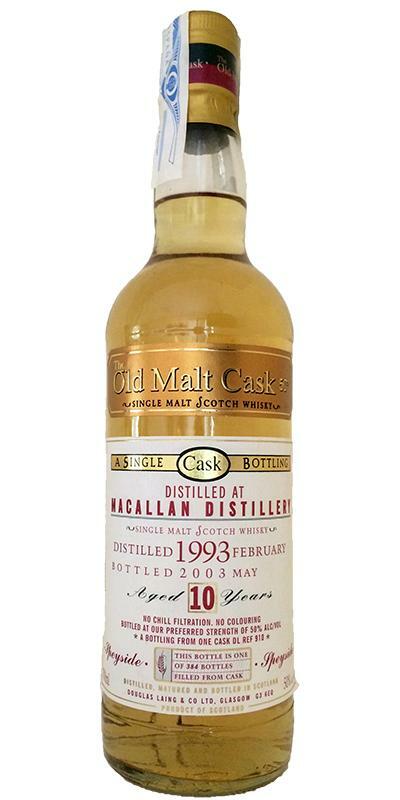 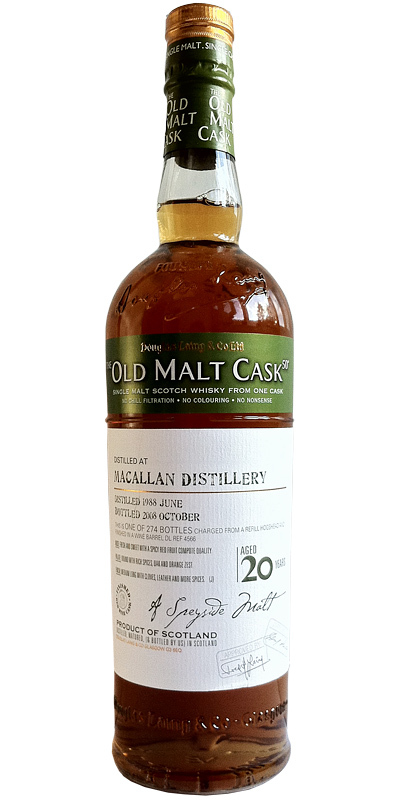 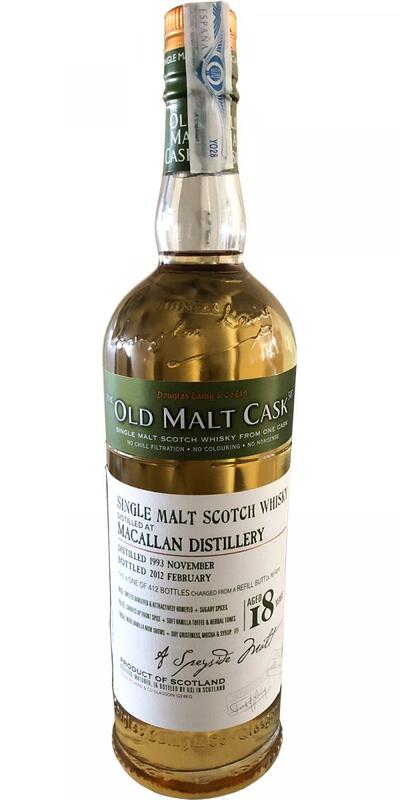 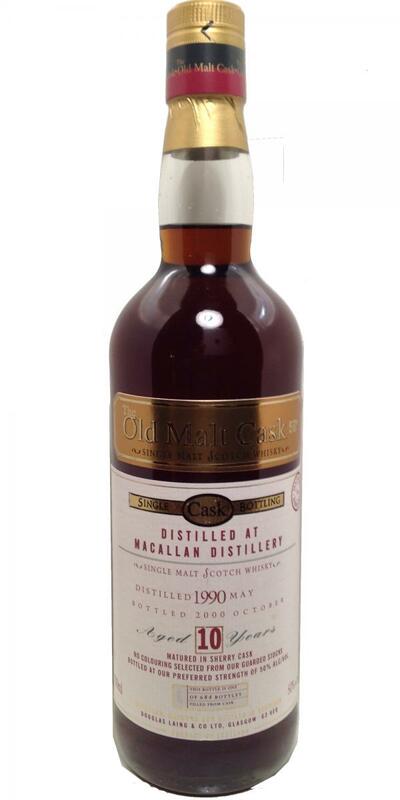 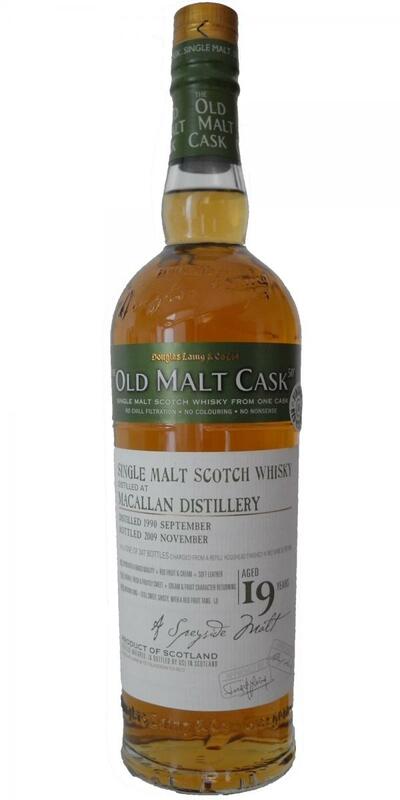 Macallan 10-year-old DL Old Malt Cask 10 50.0 % Vol. 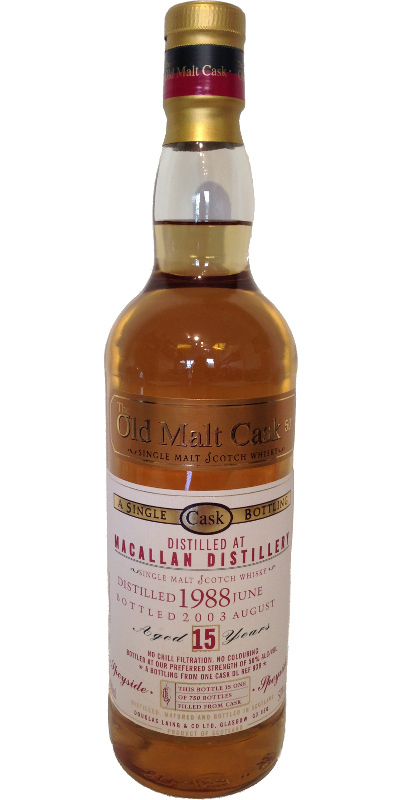 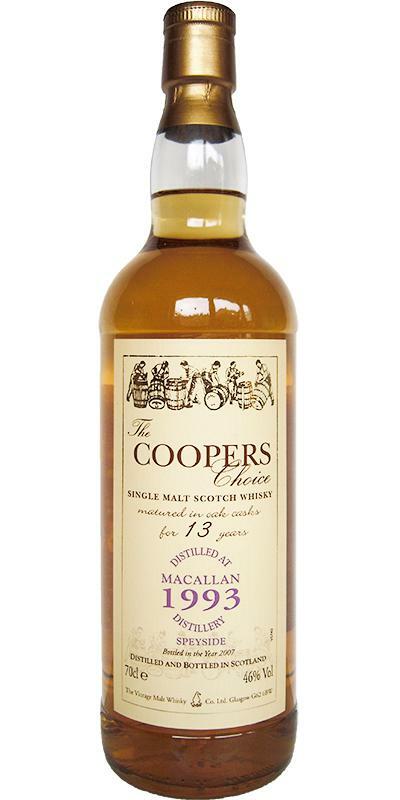 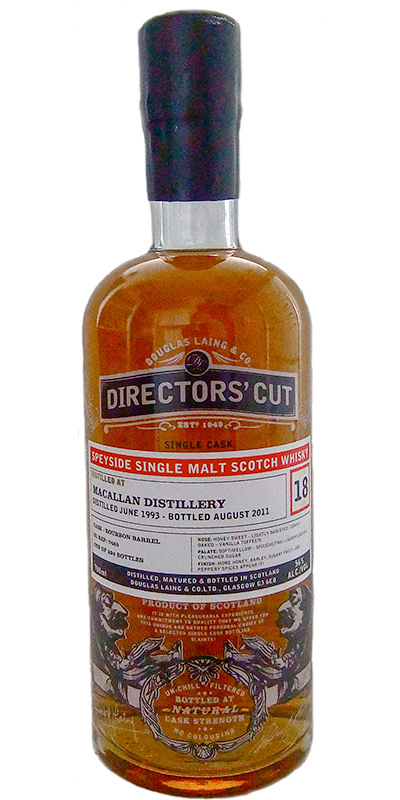 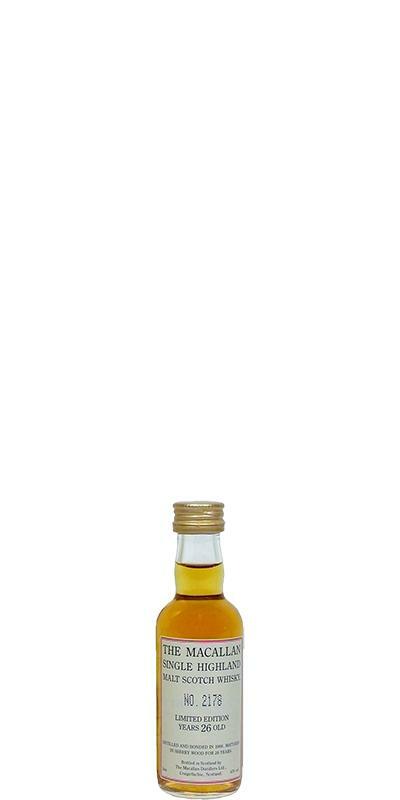 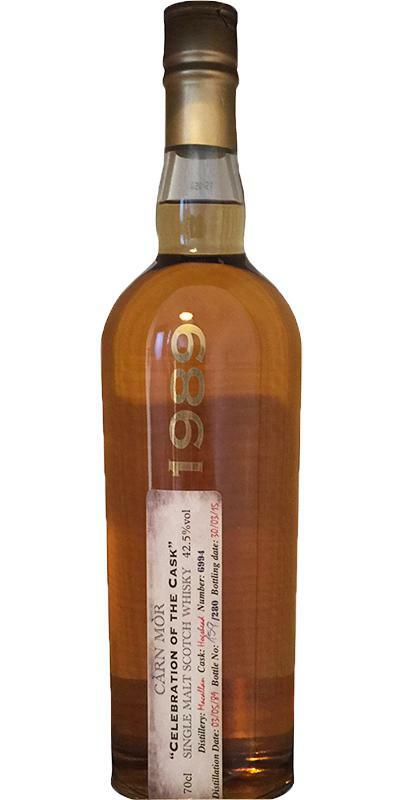 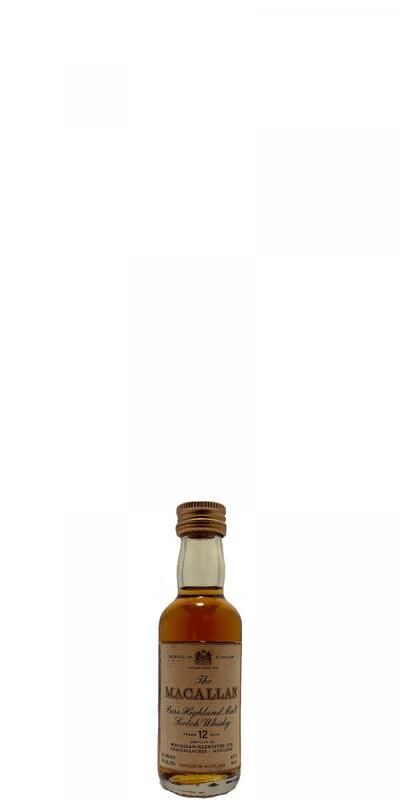 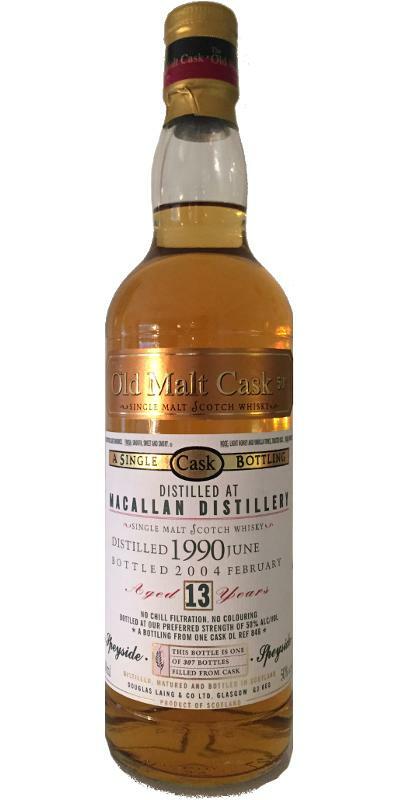 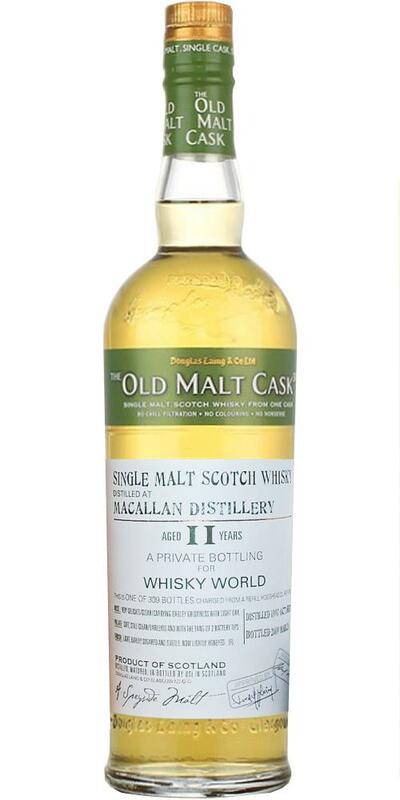 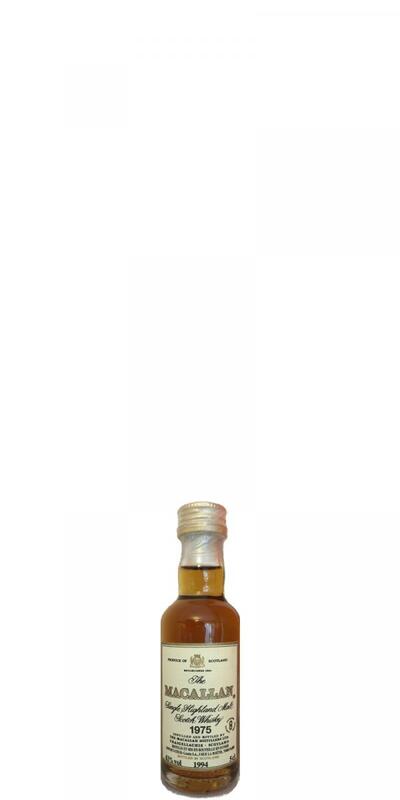 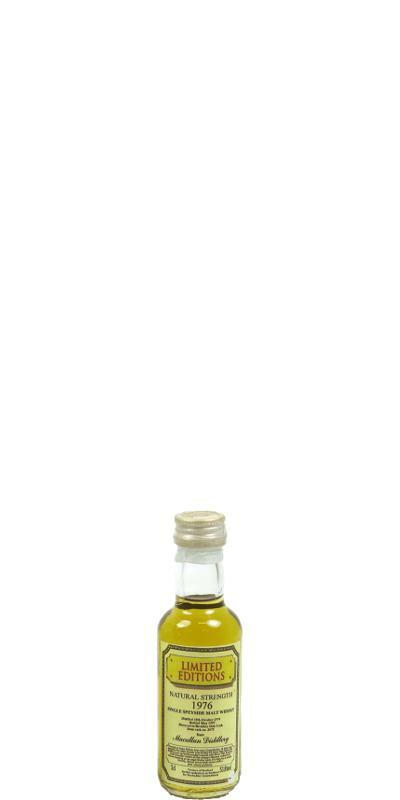 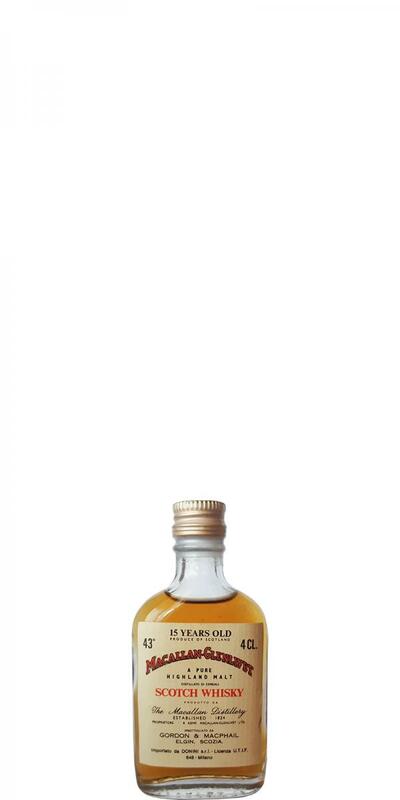 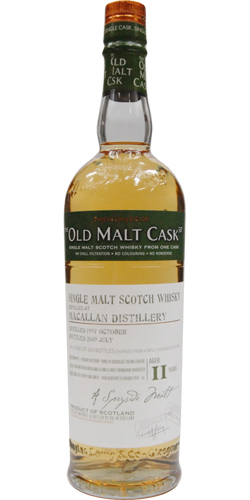 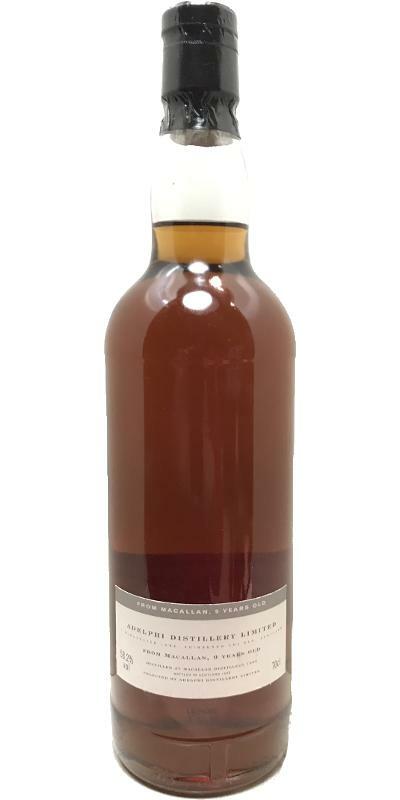 Macallan 13-year-old DL Old Malt Cask - Miniature 13 50.0 % Vol. 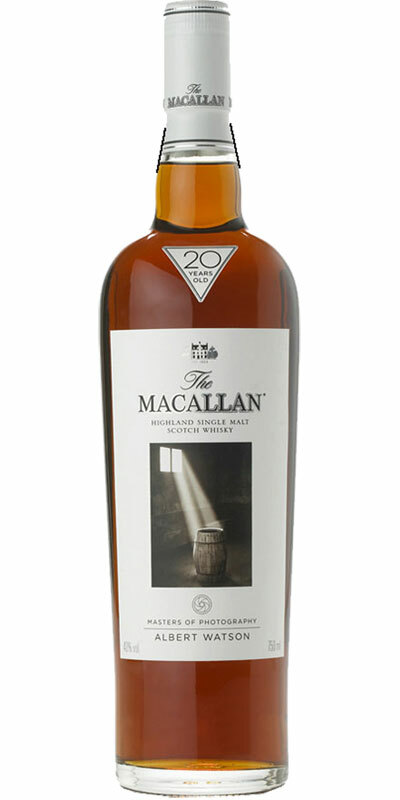 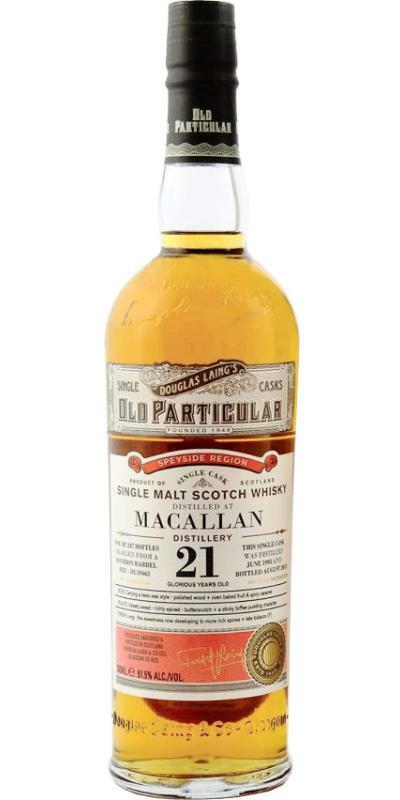 Macallan 21-year-old DL Premier Barrel Selection 21 46.0 % Vol.